Congratulations to Amber and Daniel on their fall wedding! 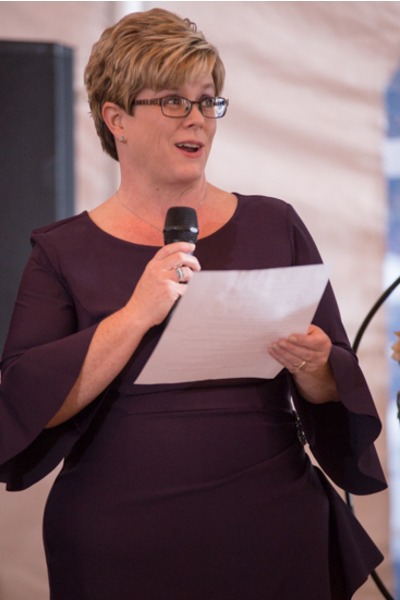 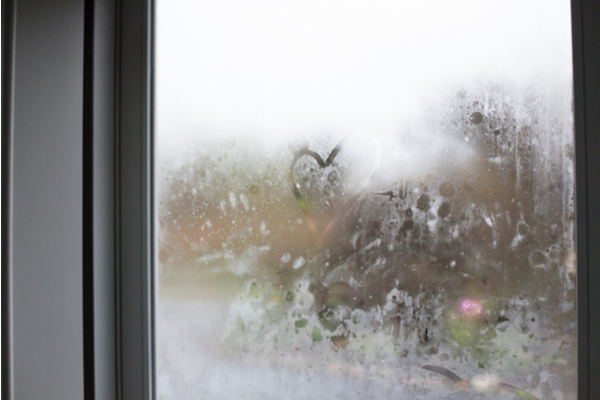 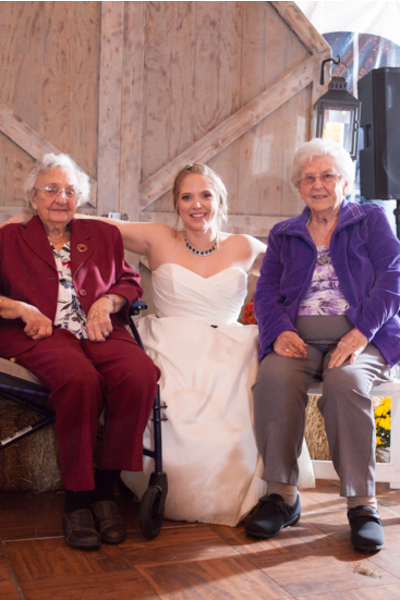 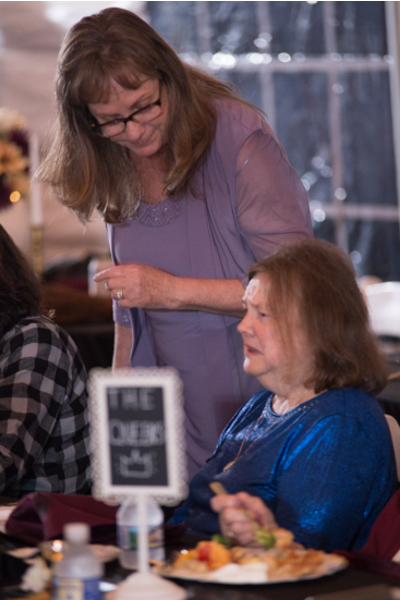 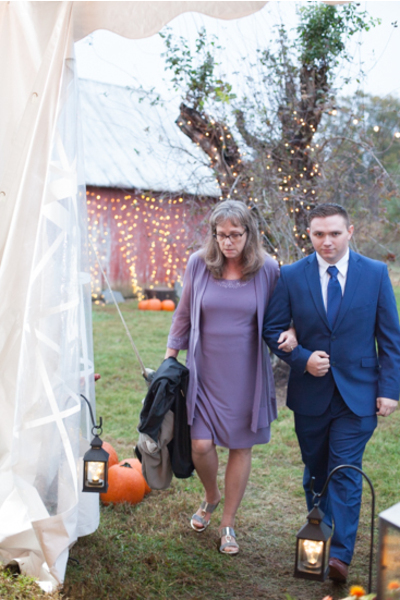 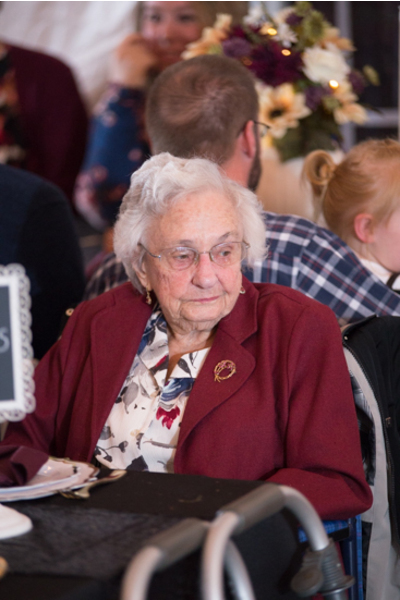 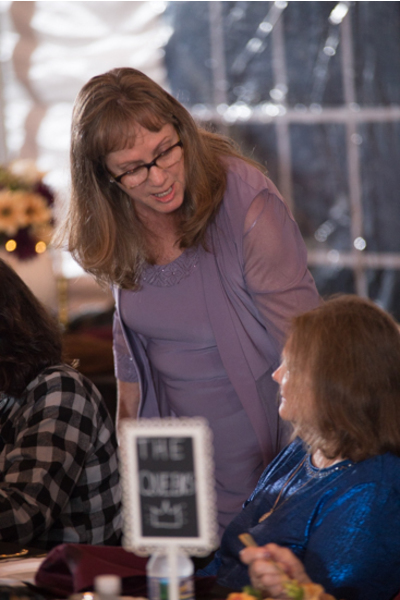 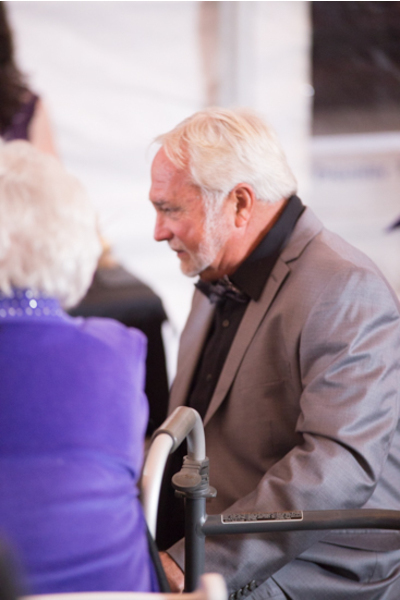 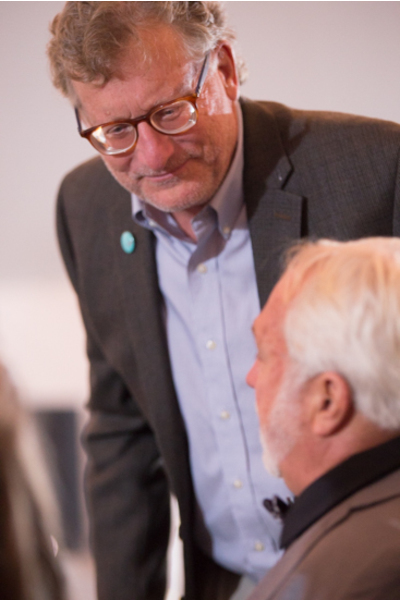 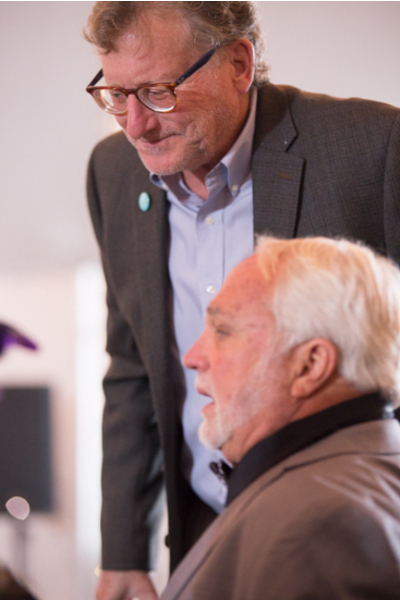 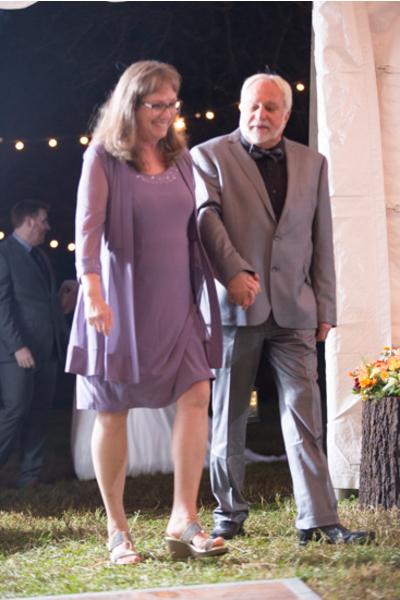 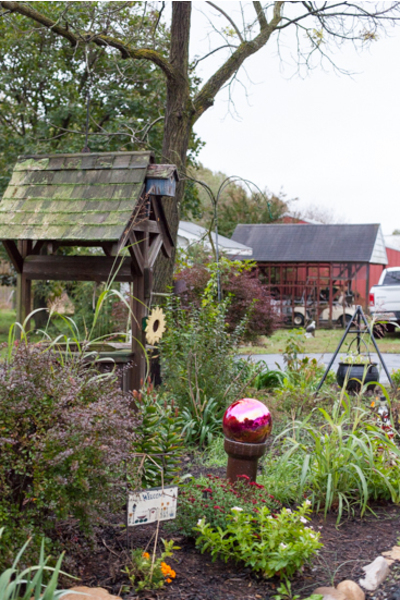 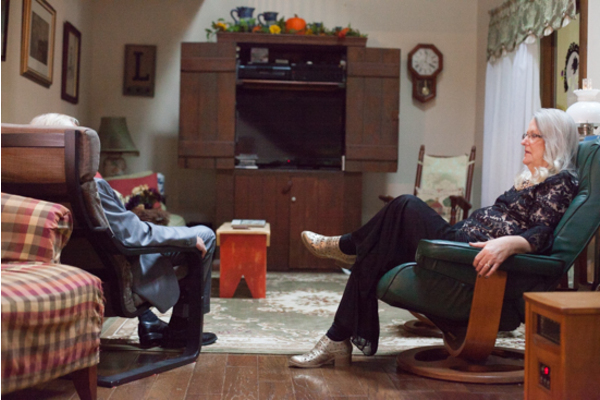 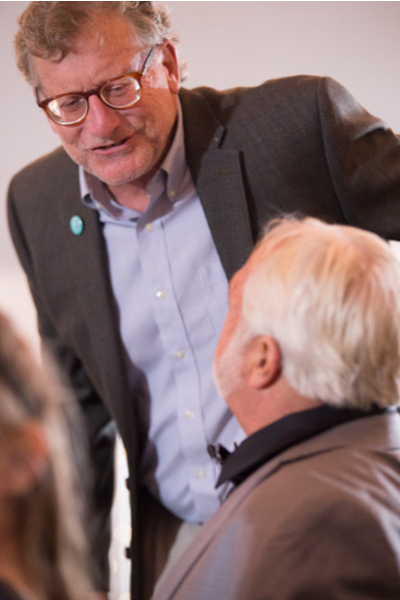 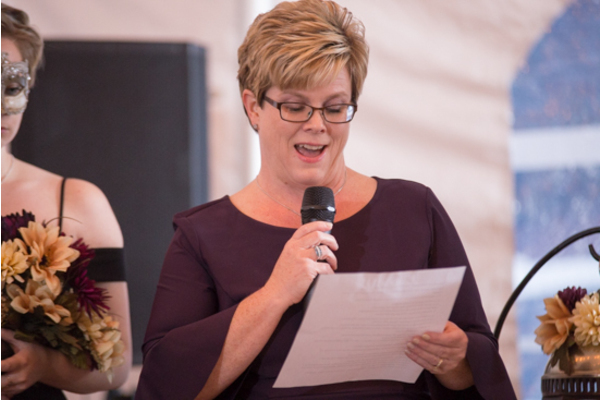 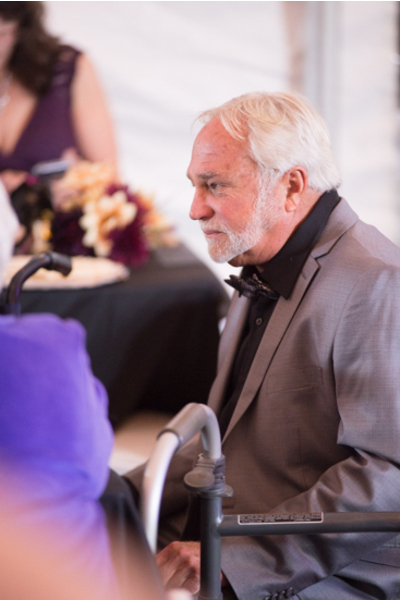 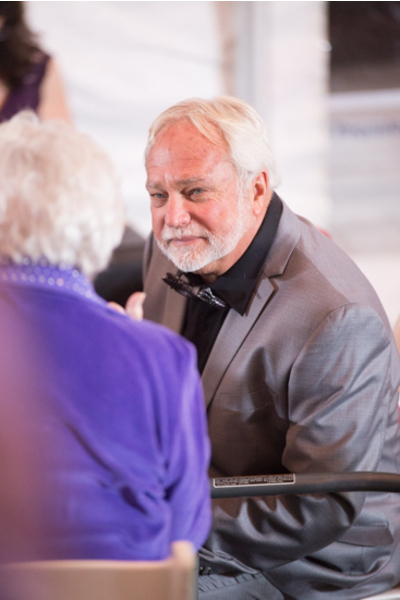 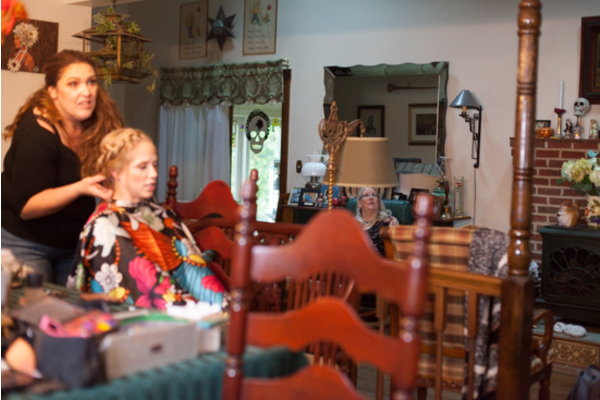 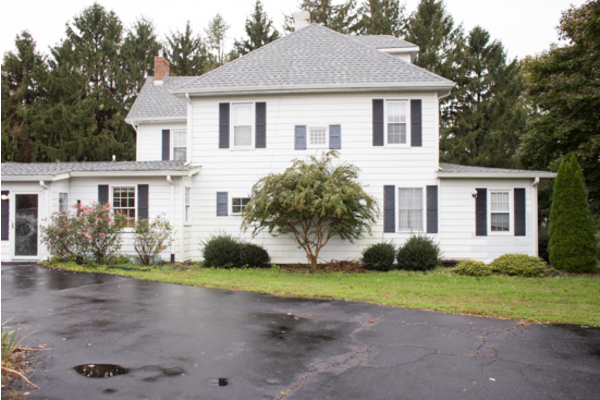 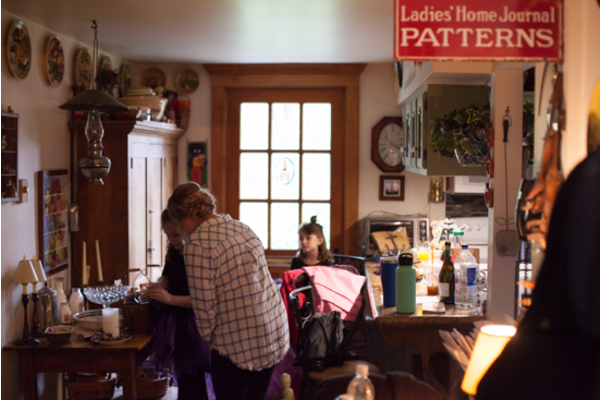 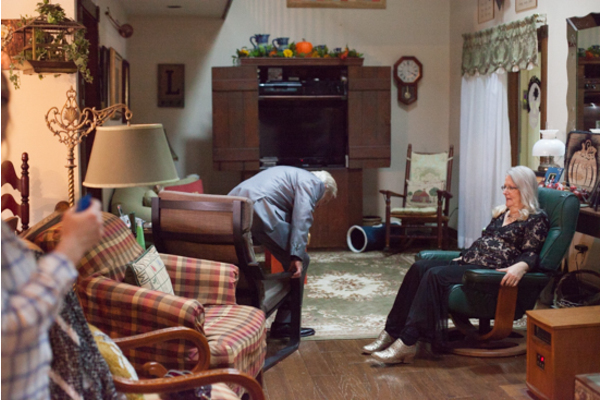 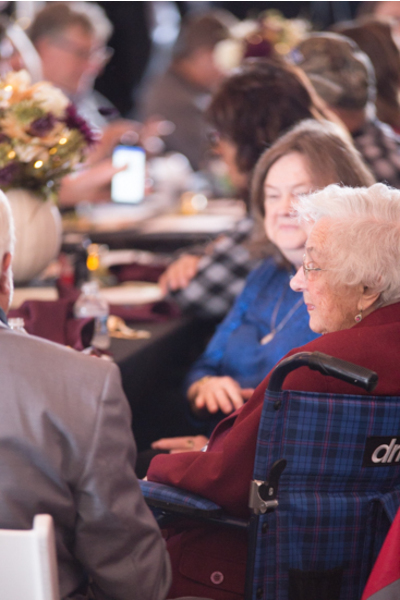 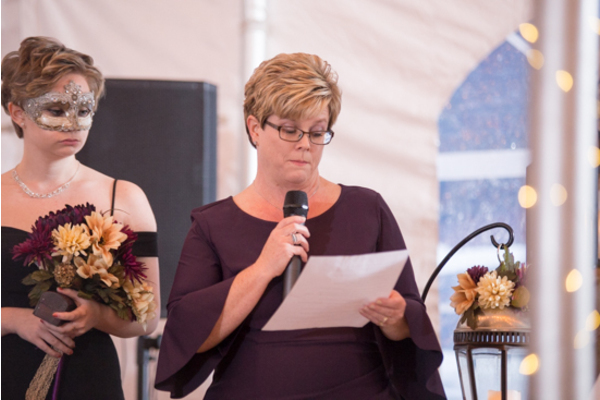 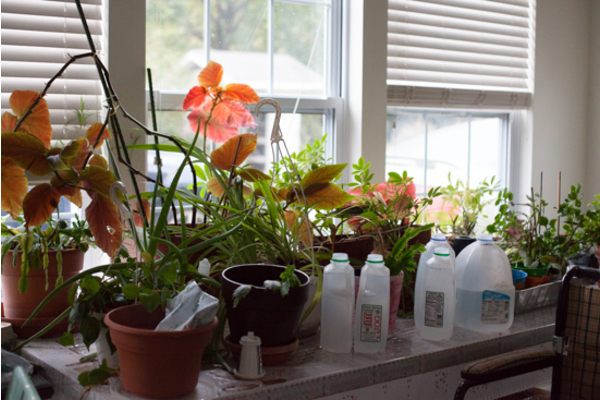 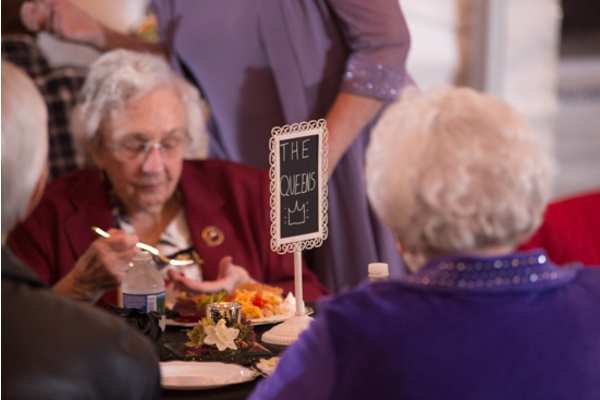 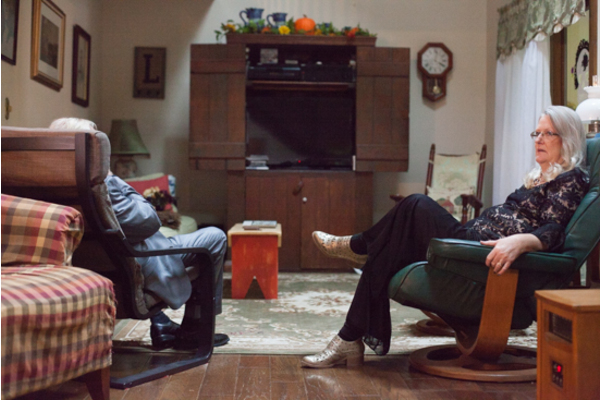 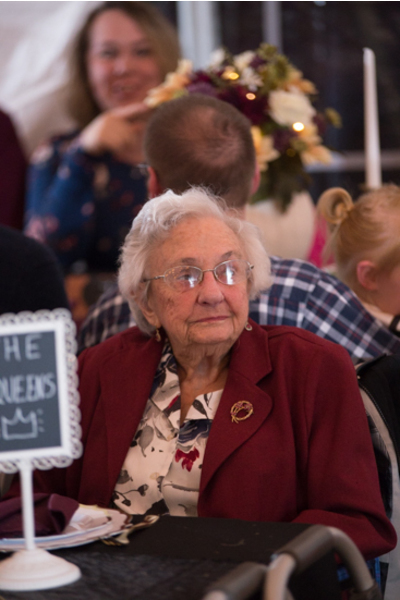 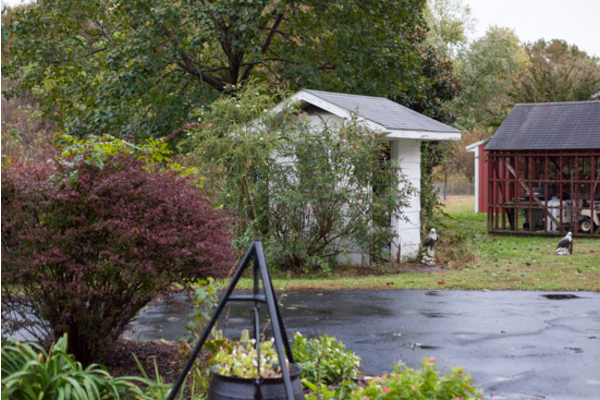 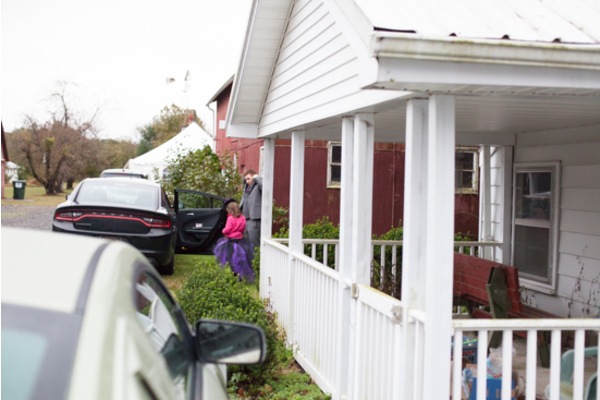 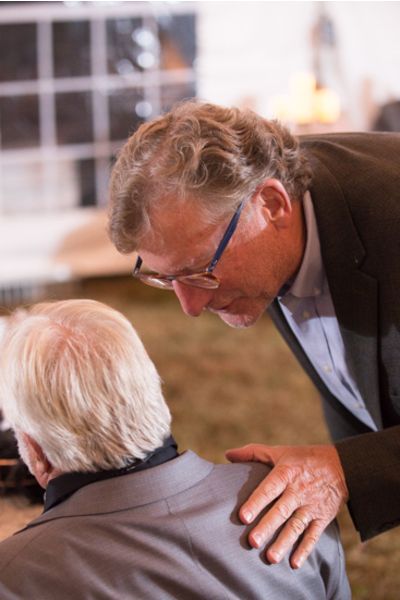 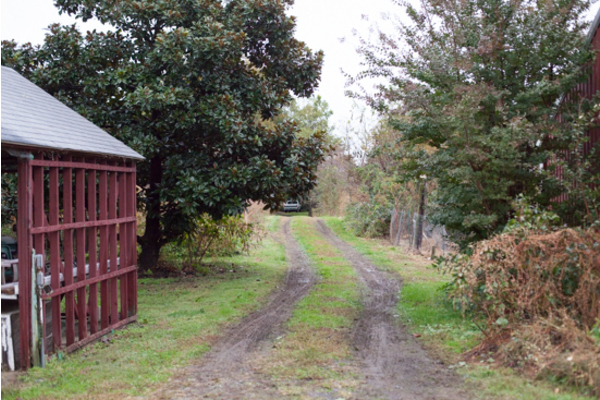 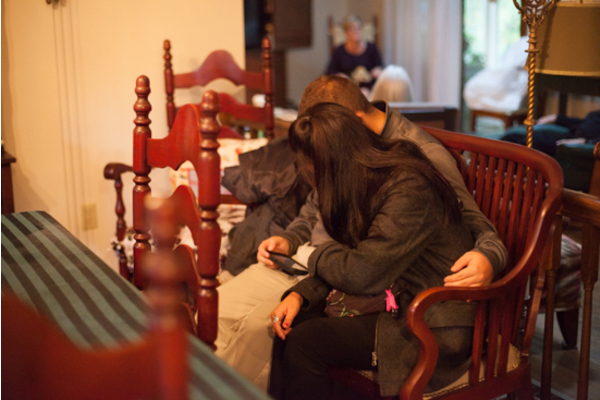 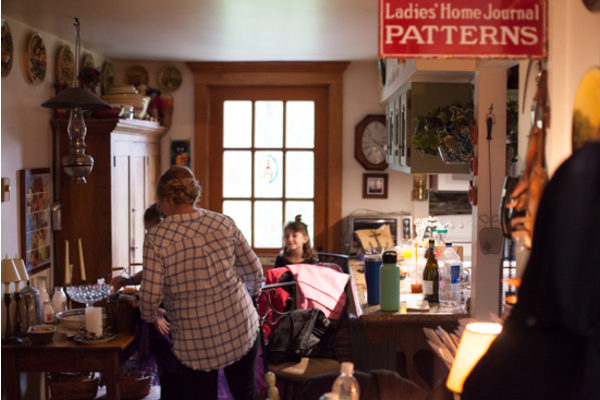 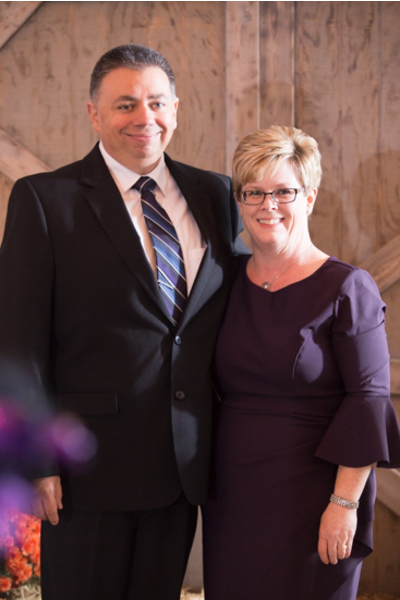 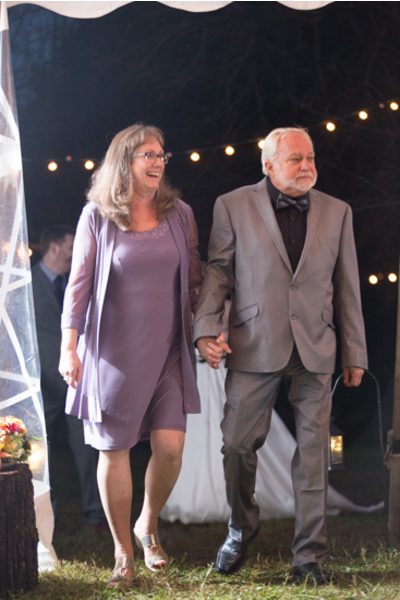 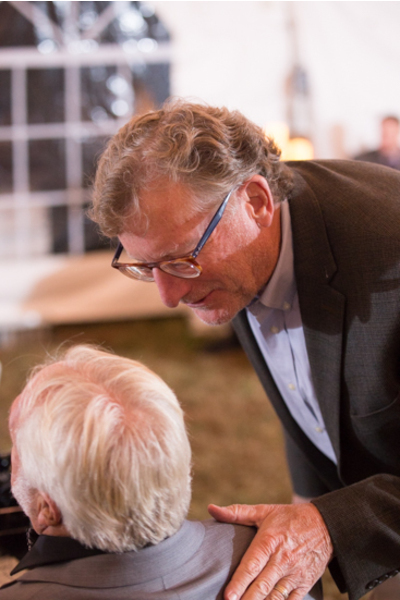 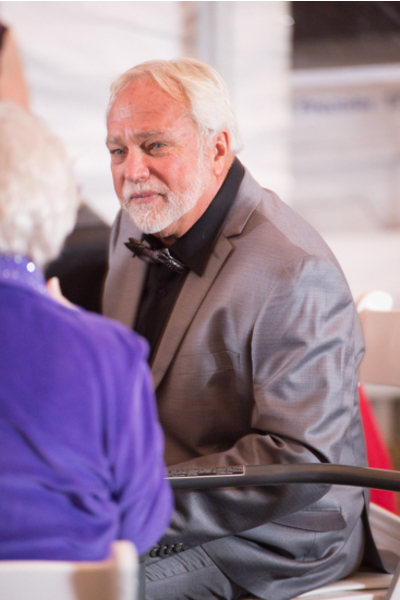 They happily wed on October 27th, 2018 at a private residence in Dover, DE. 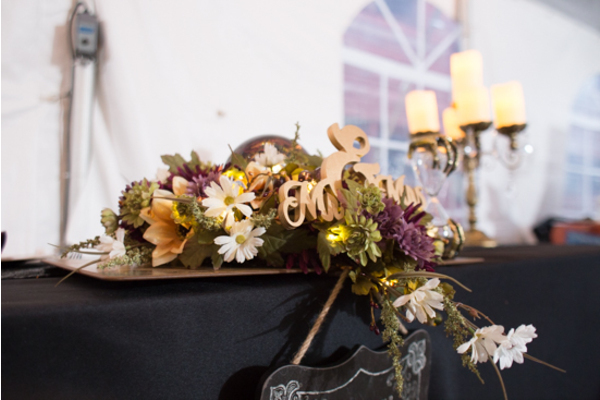 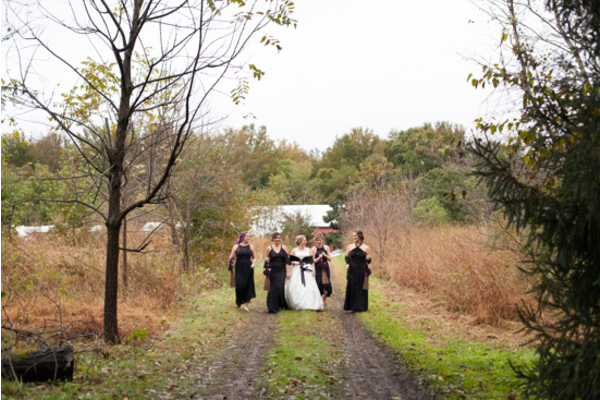 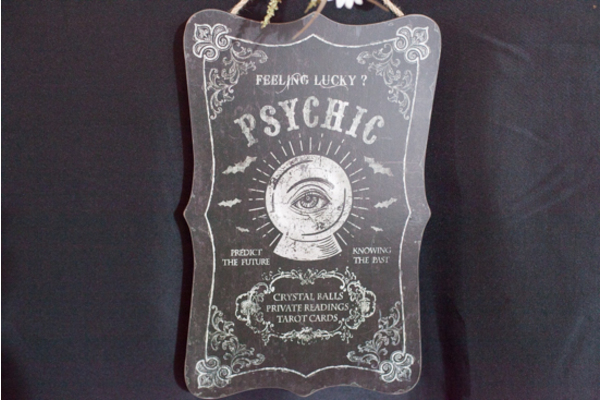 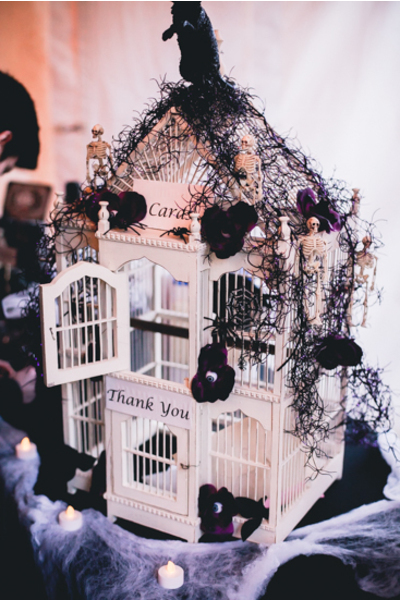 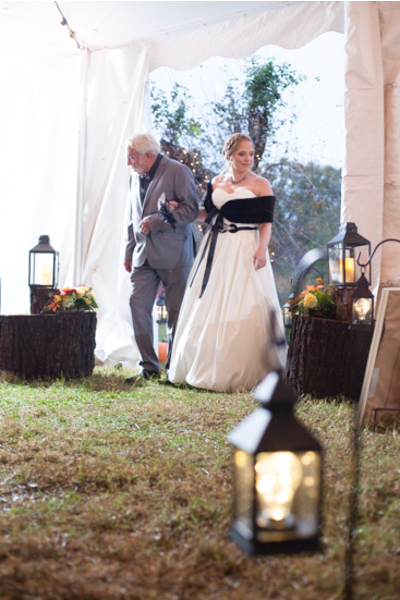 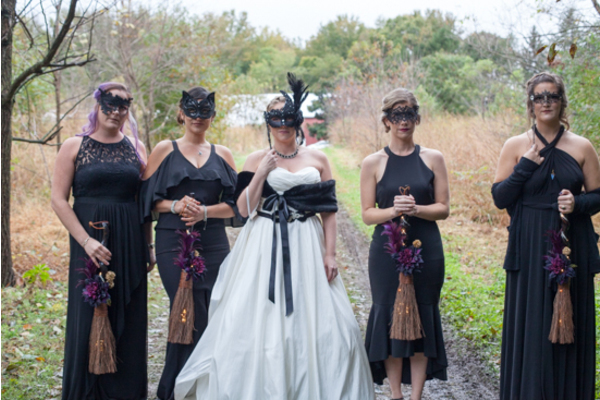 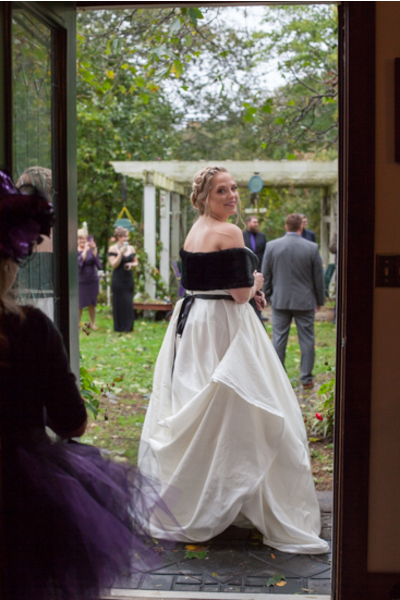 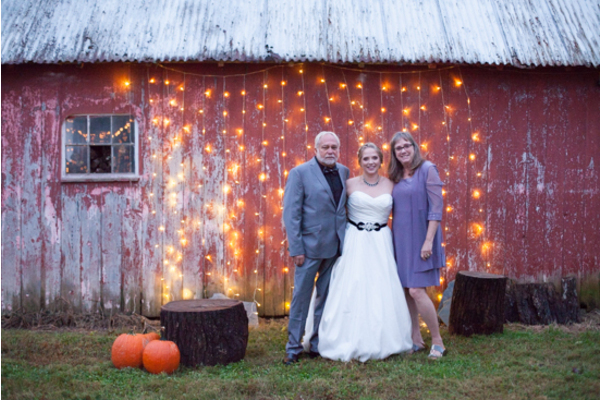 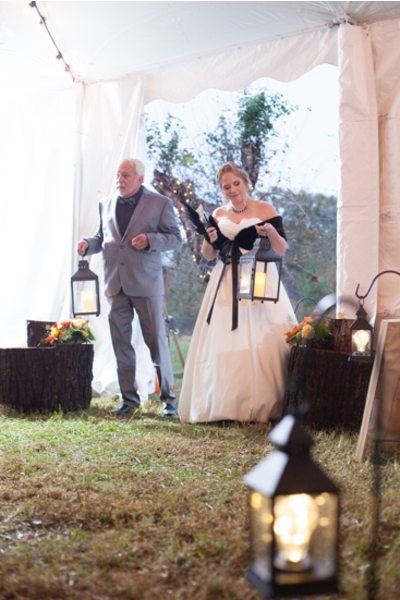 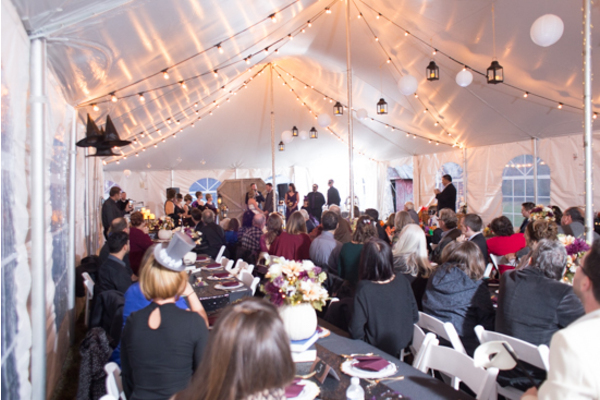 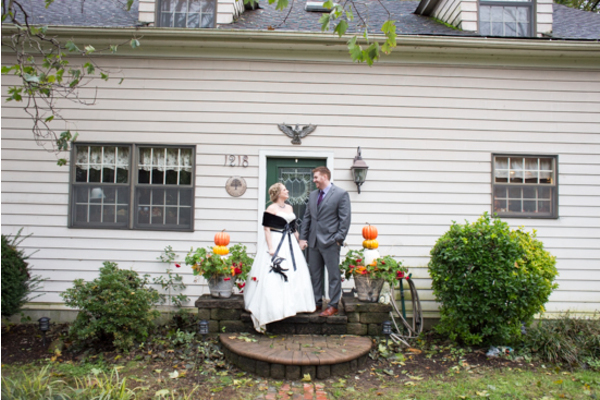 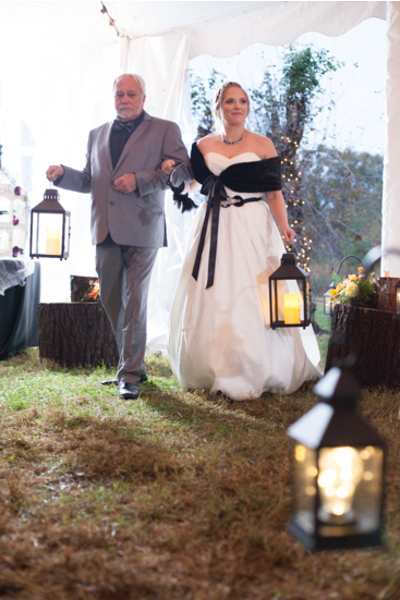 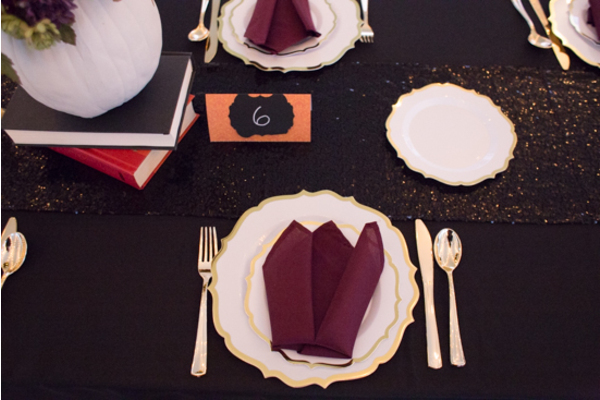 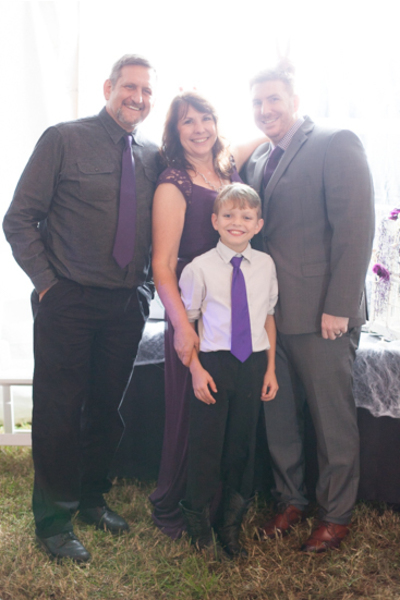 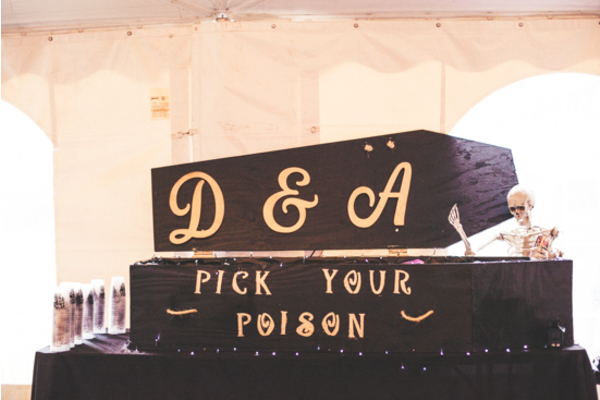 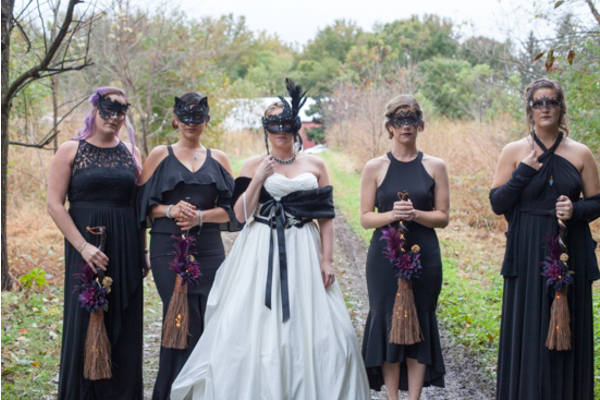 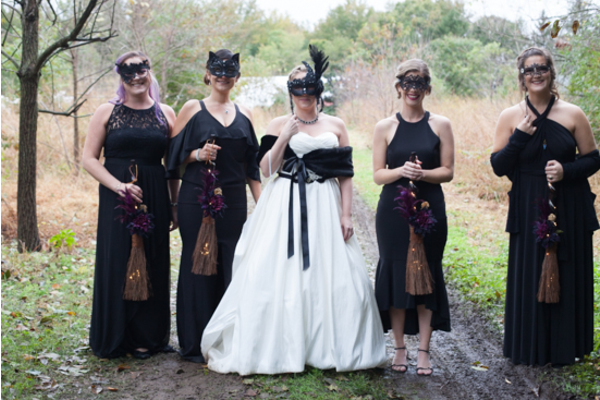 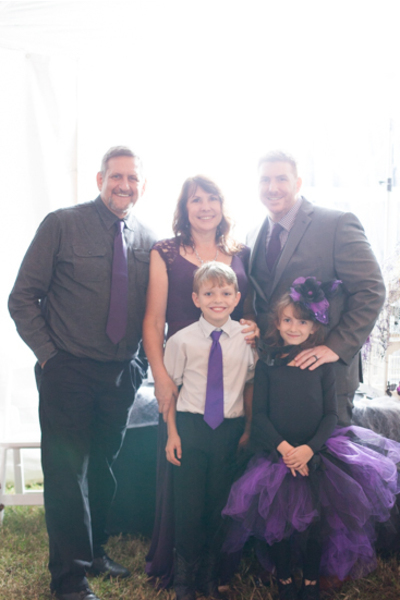 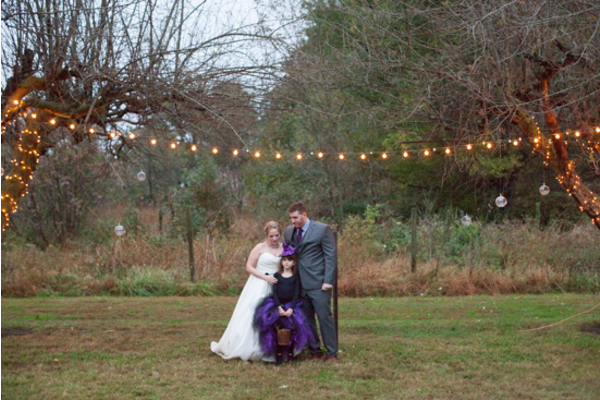 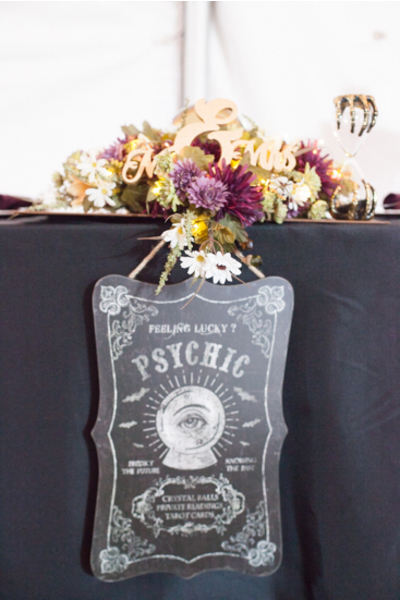 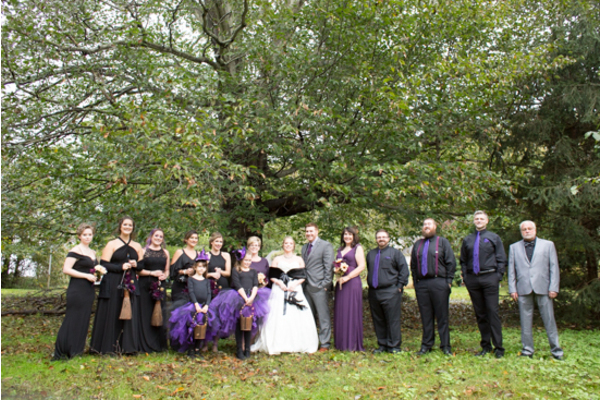 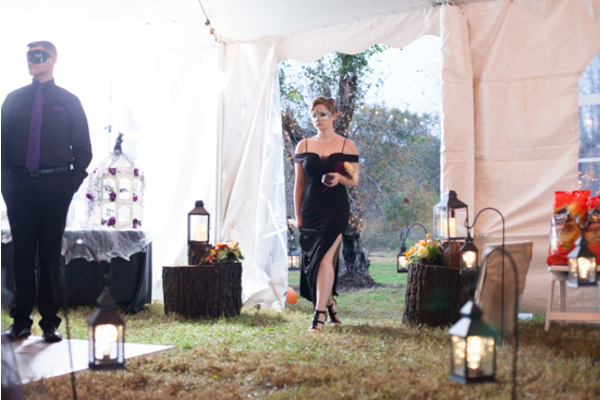 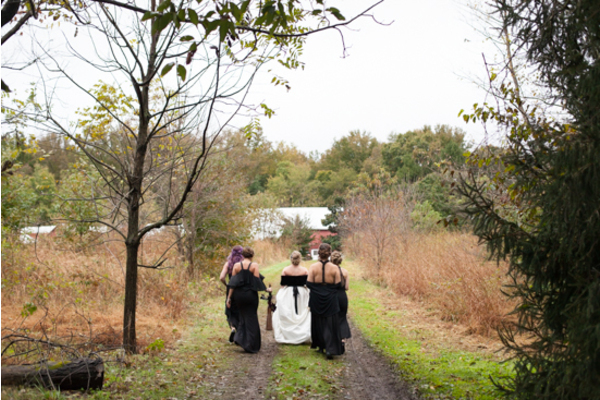 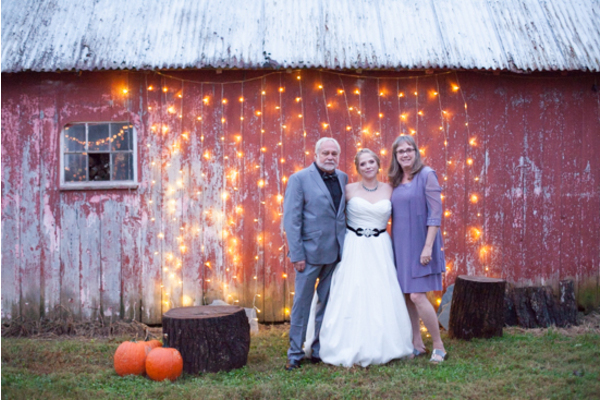 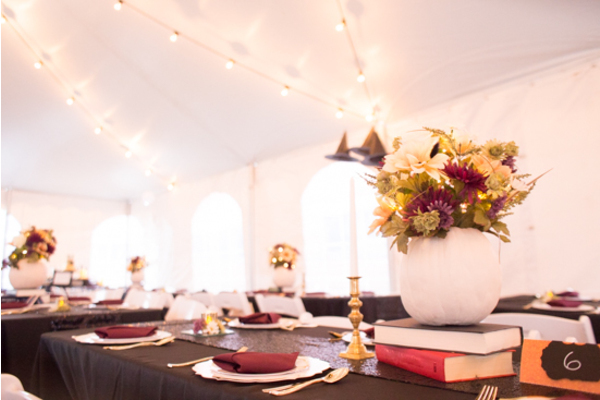 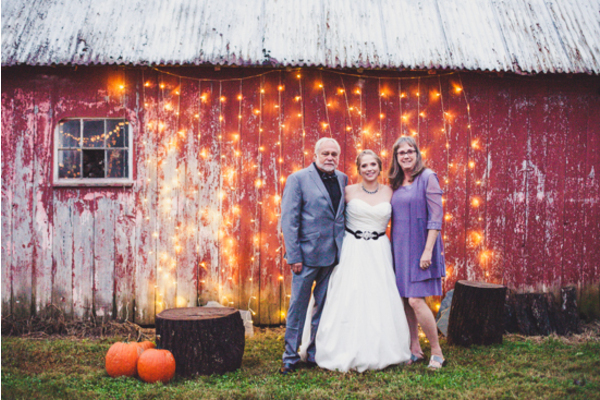 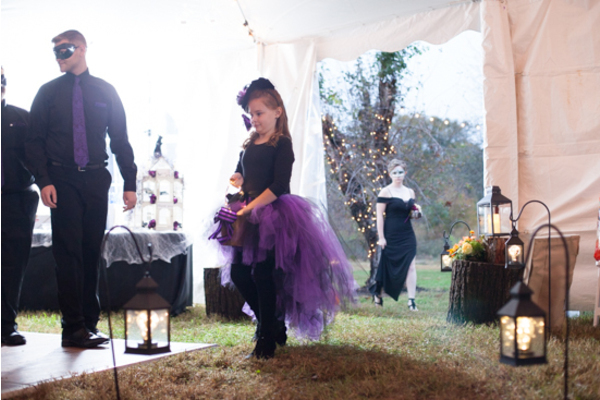 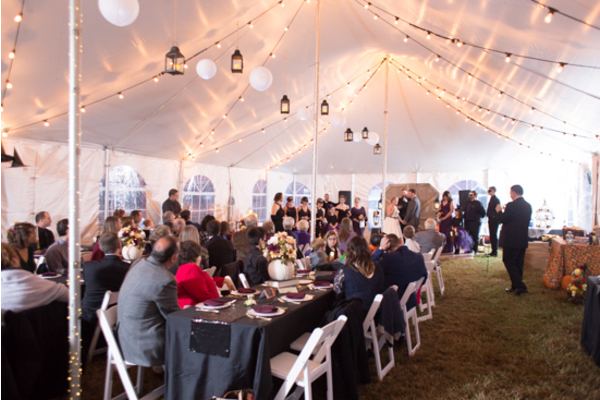 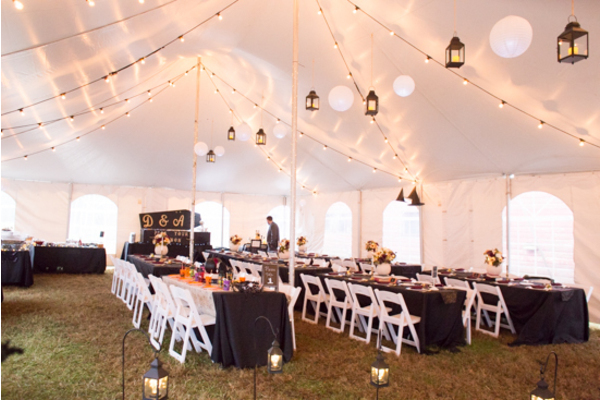 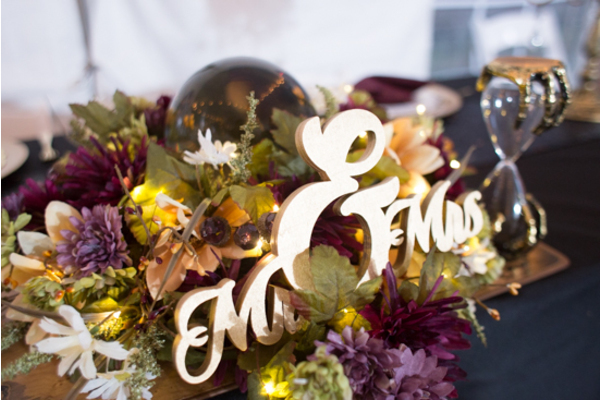 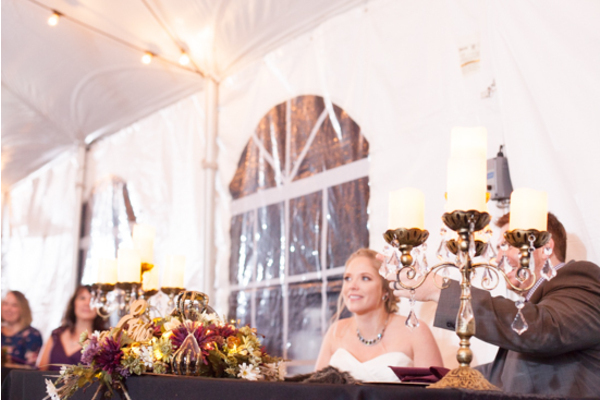 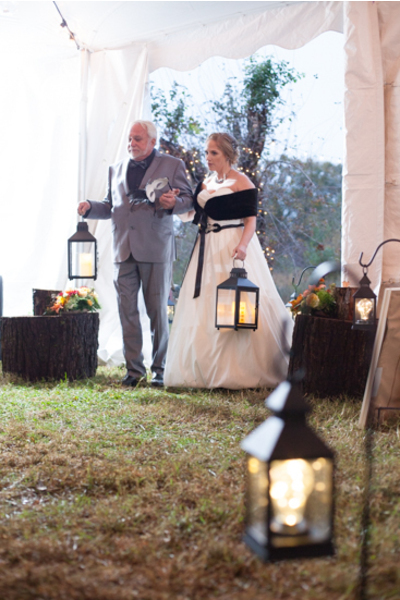 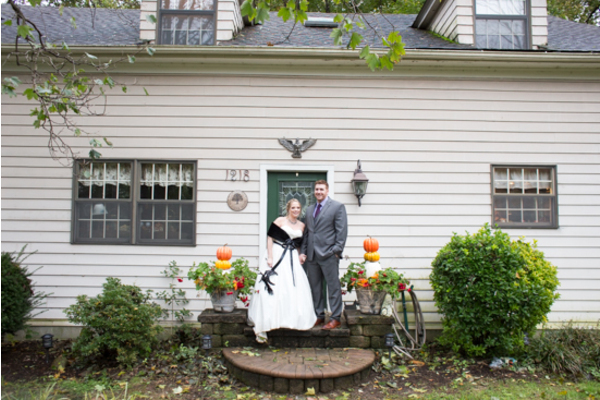 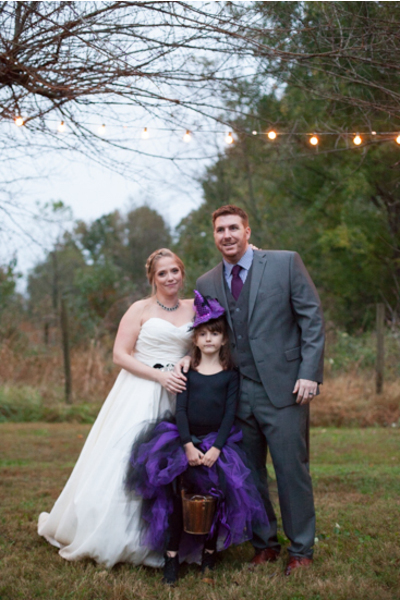 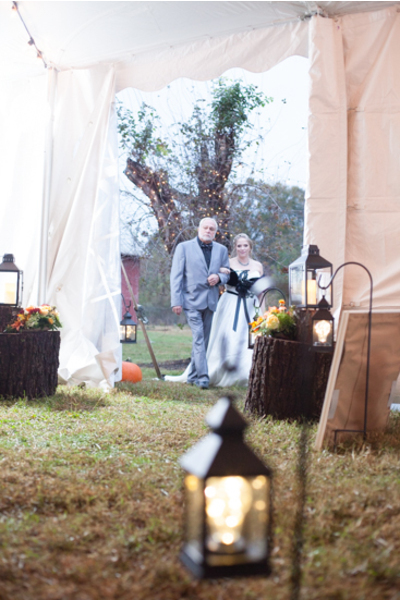 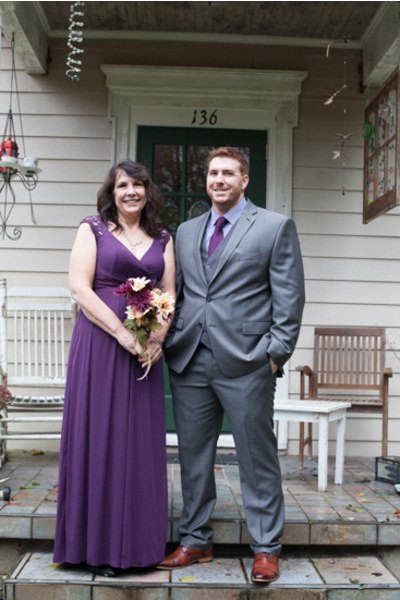 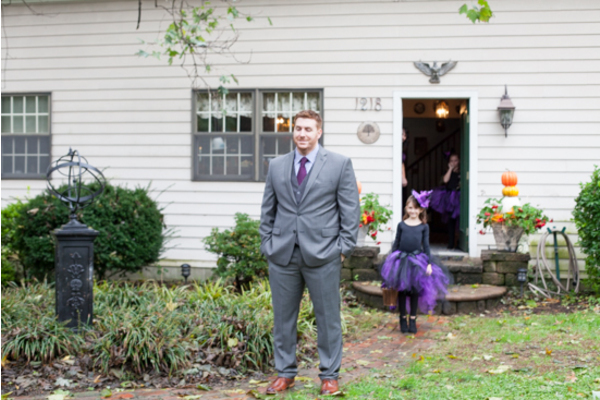 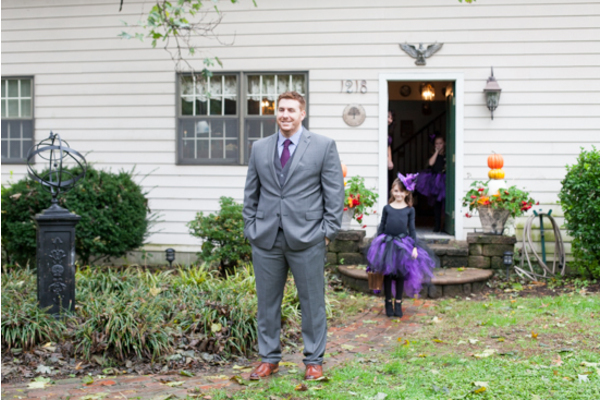 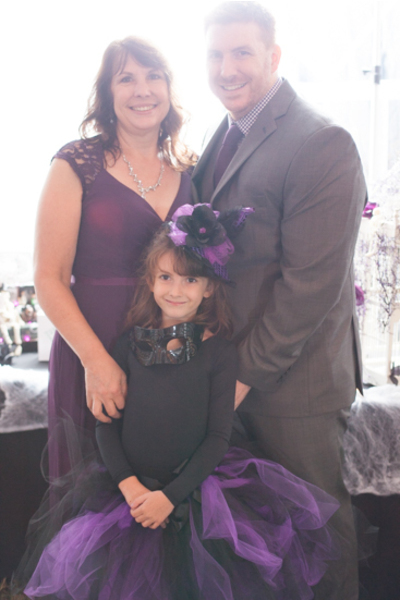 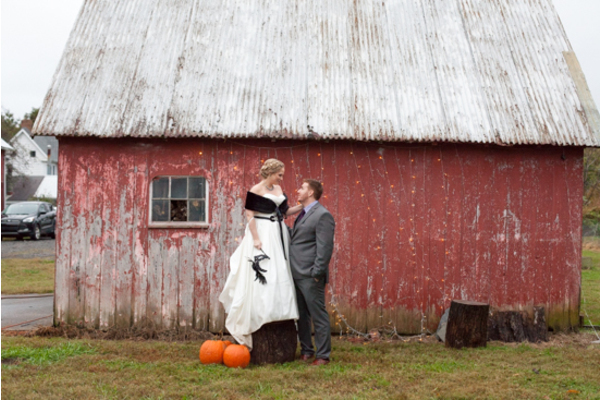 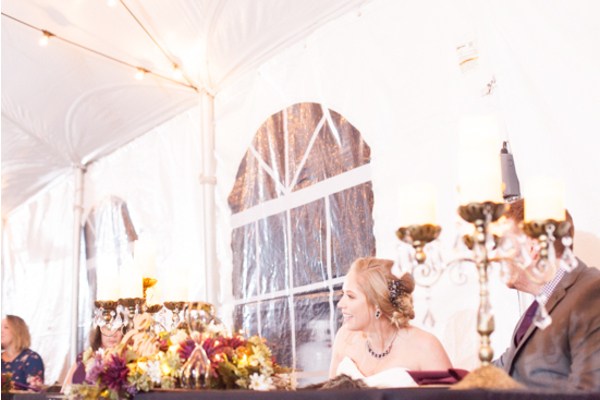 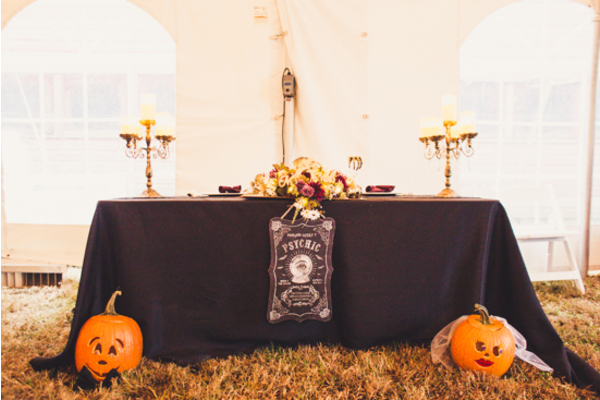 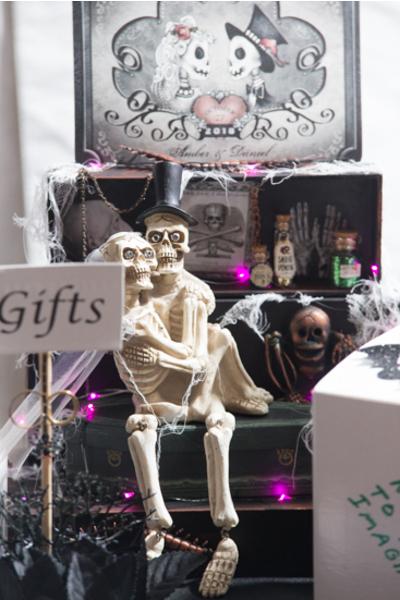 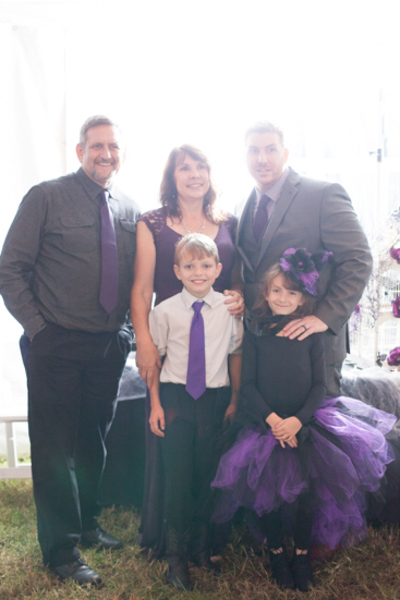 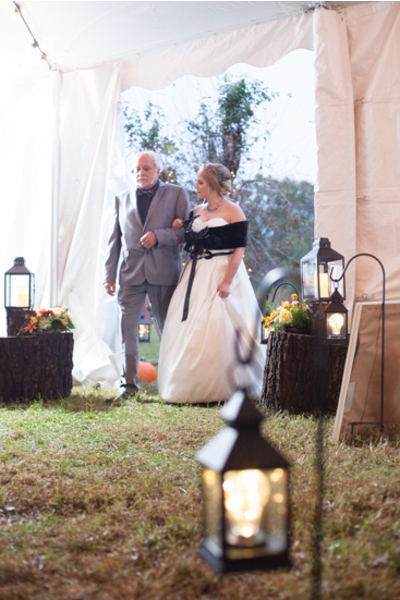 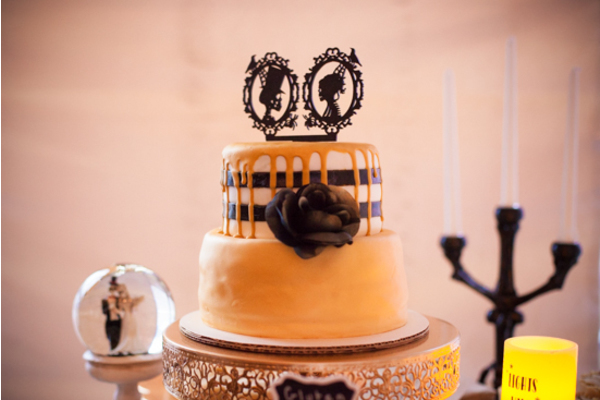 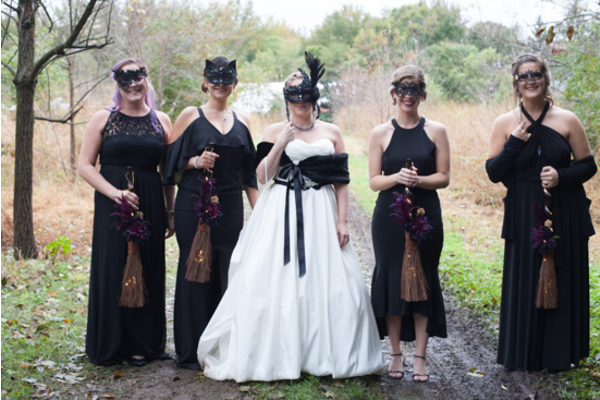 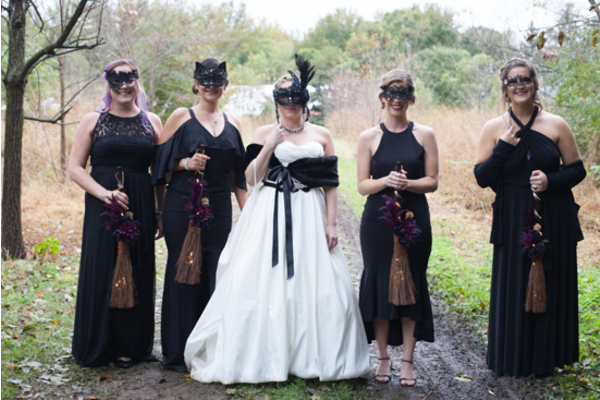 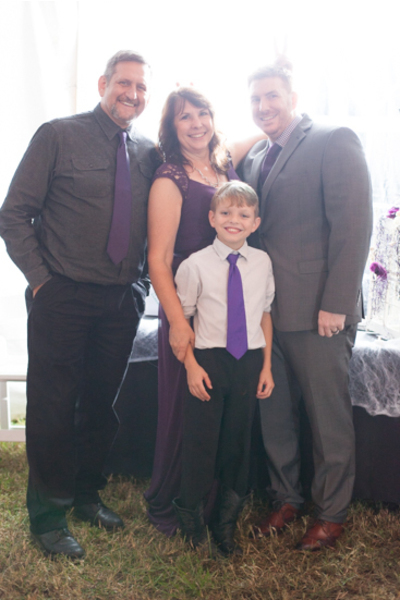 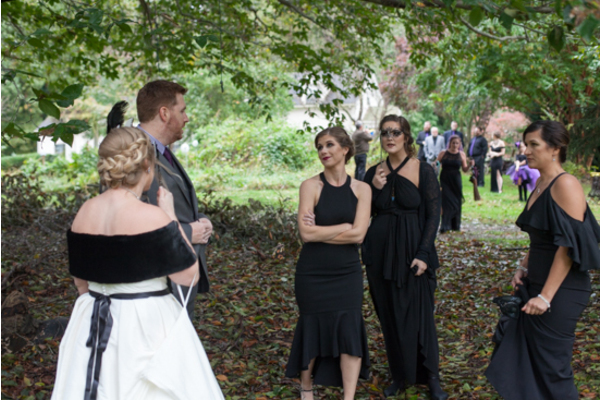 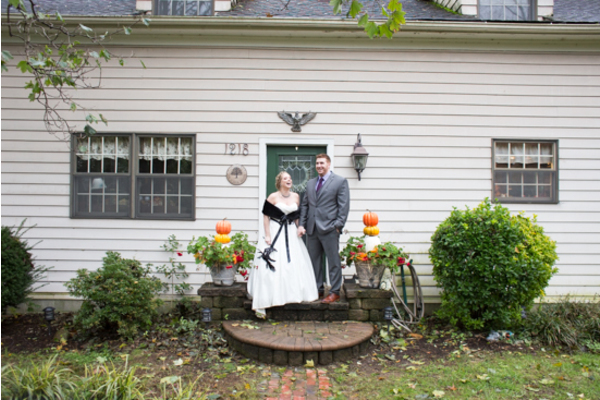 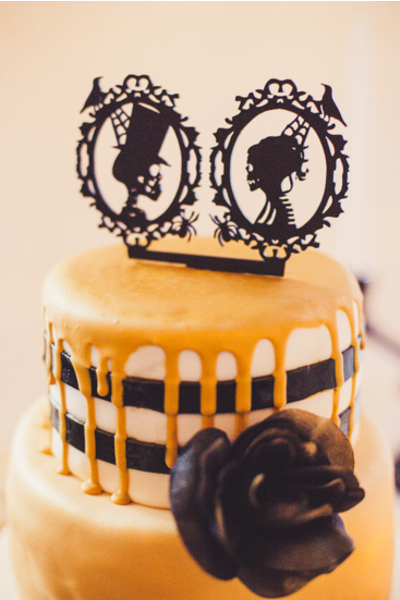 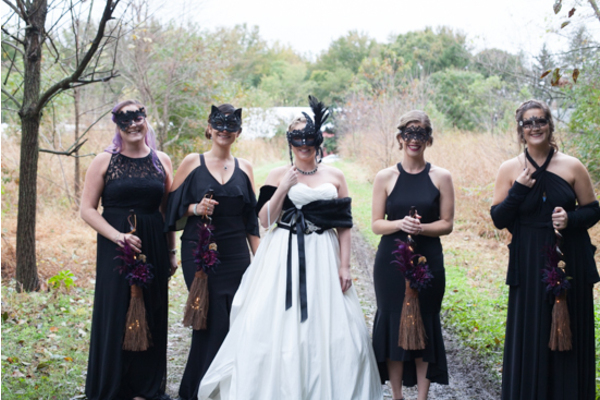 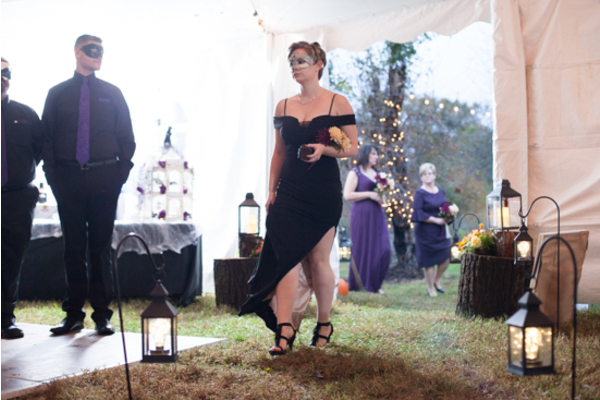 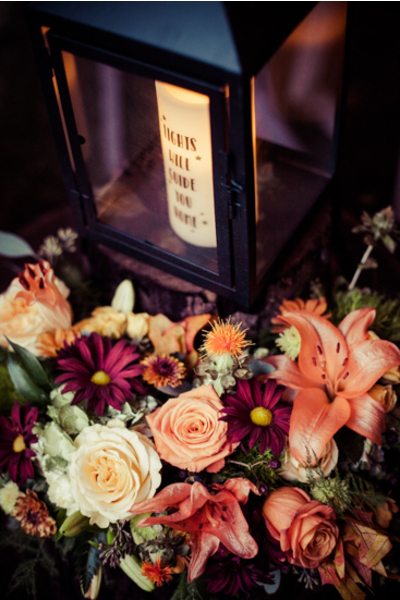 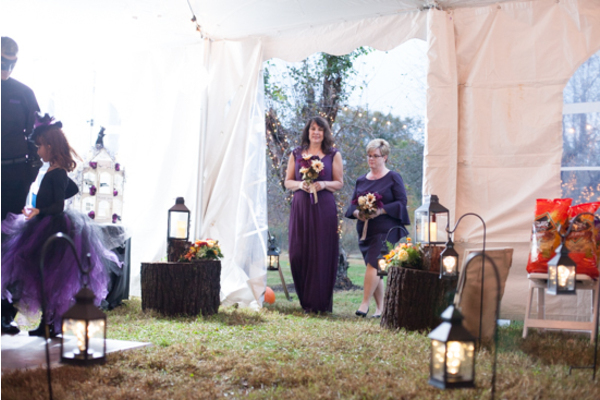 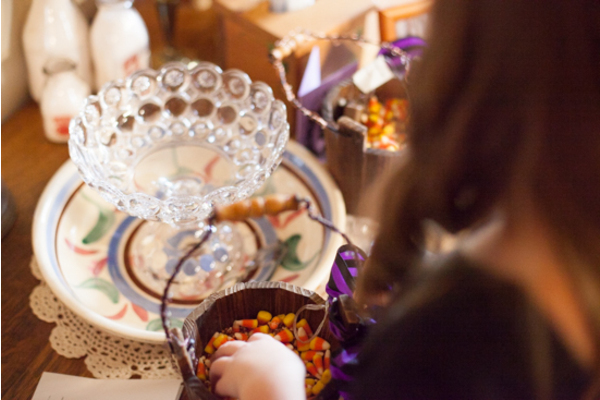 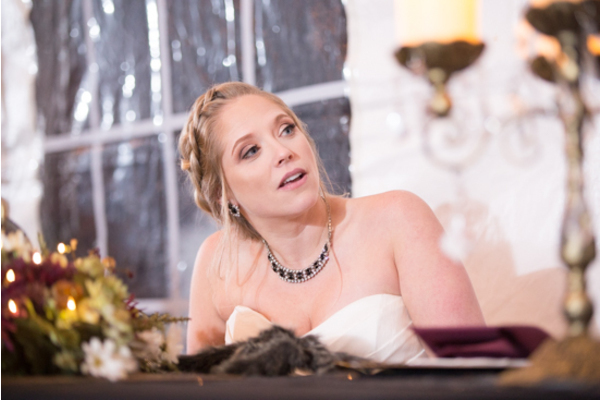 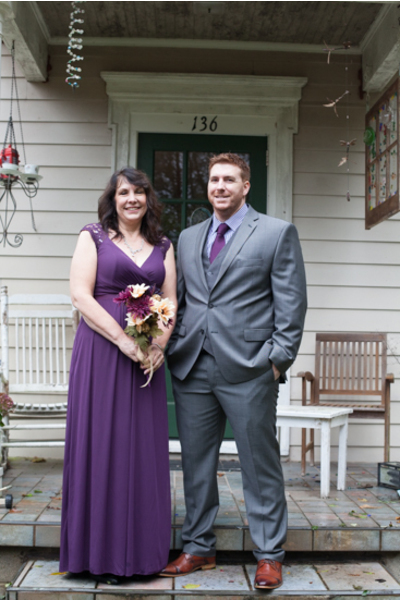 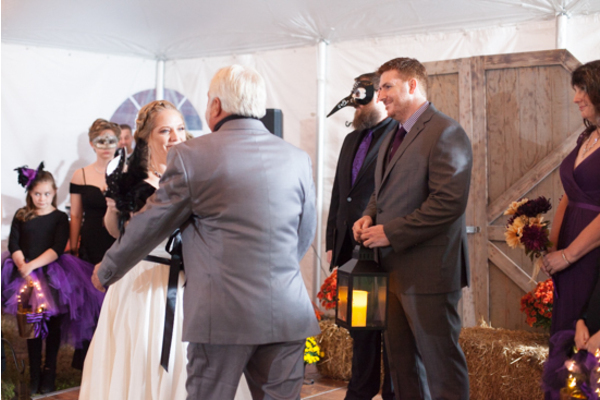 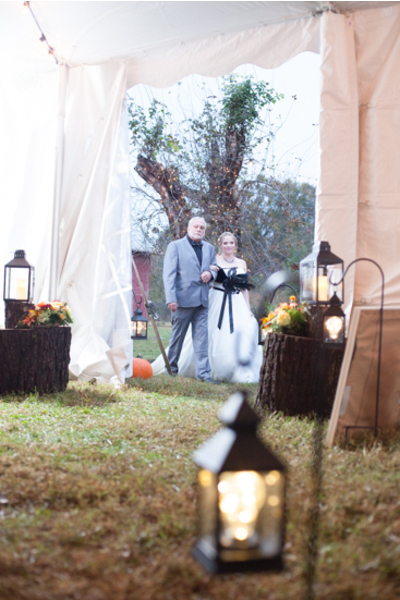 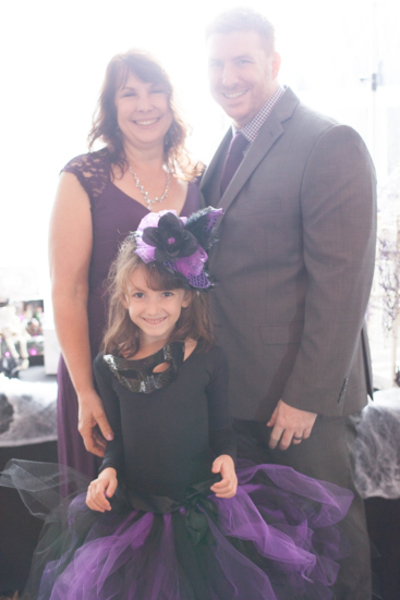 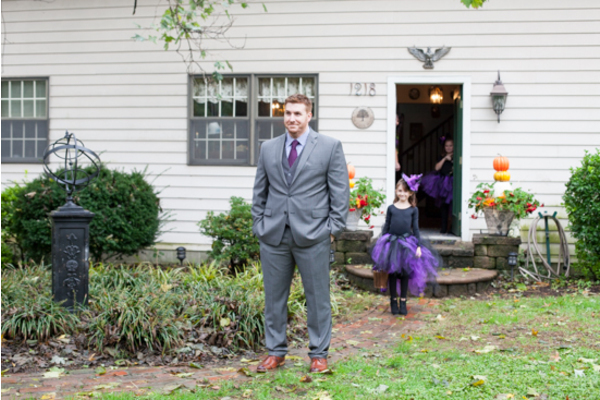 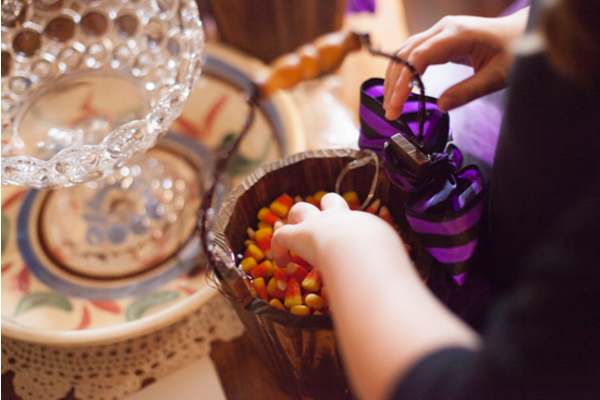 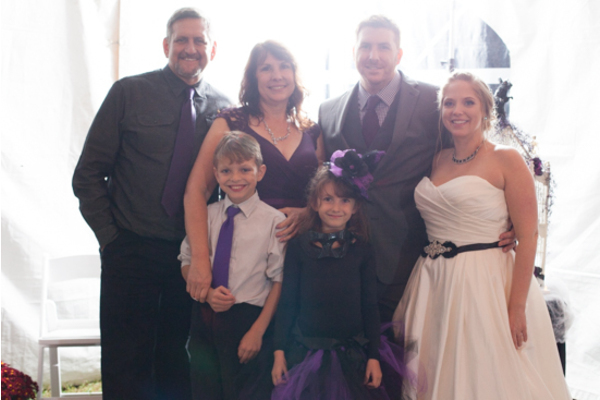 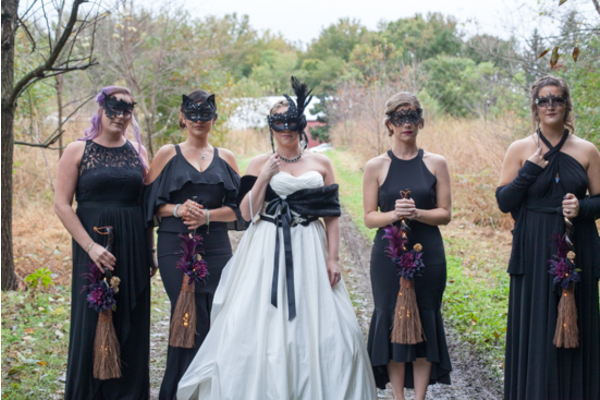 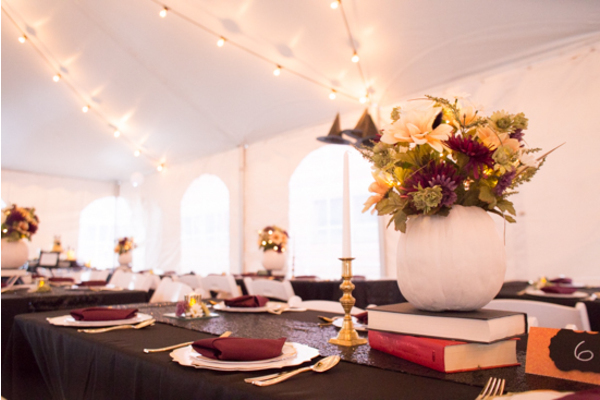 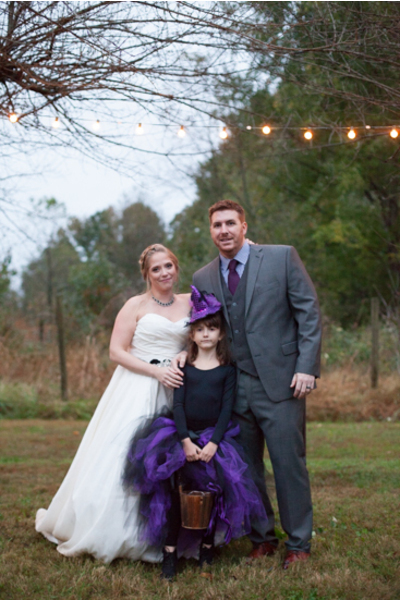 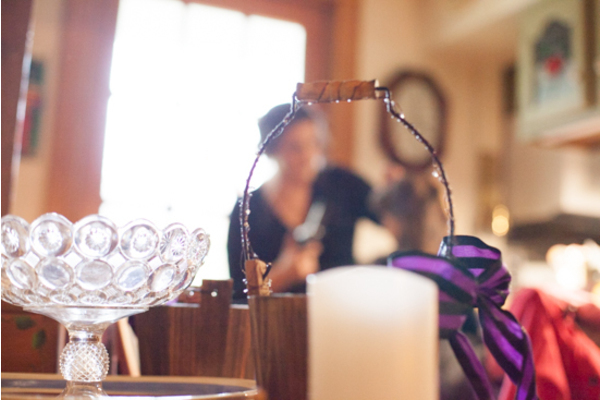 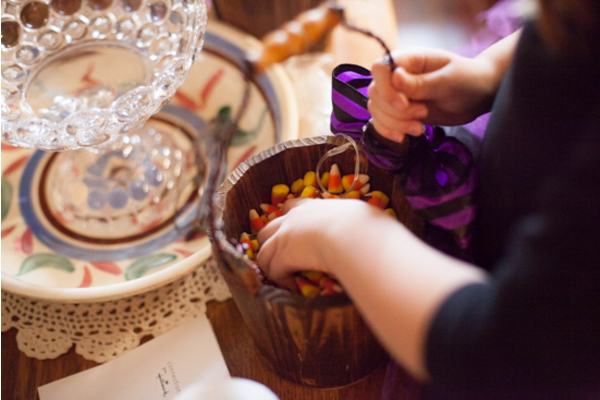 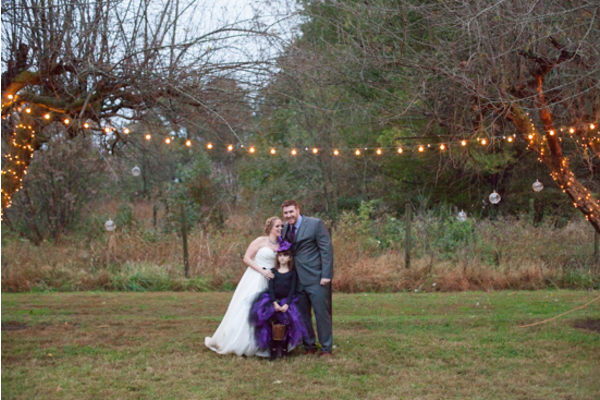 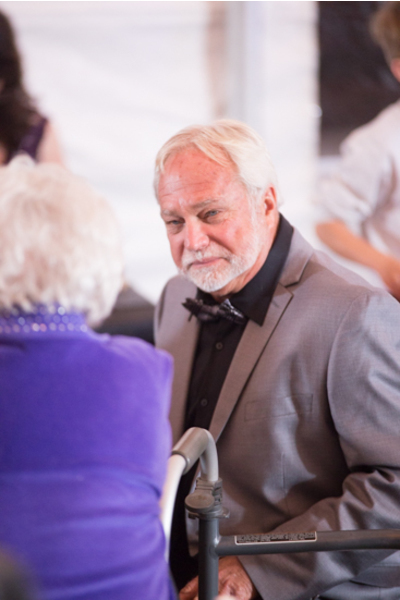 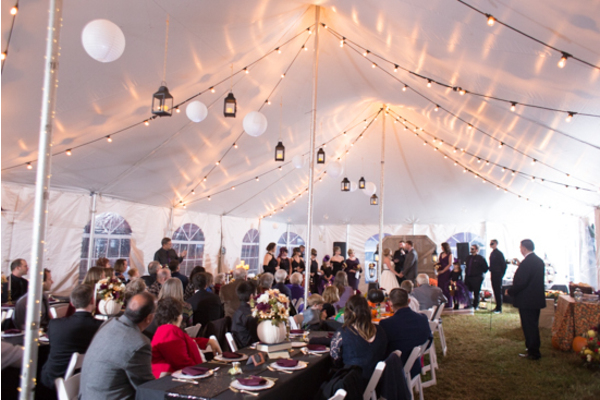 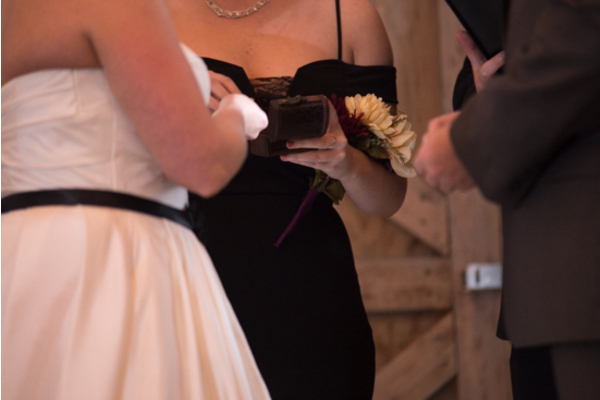 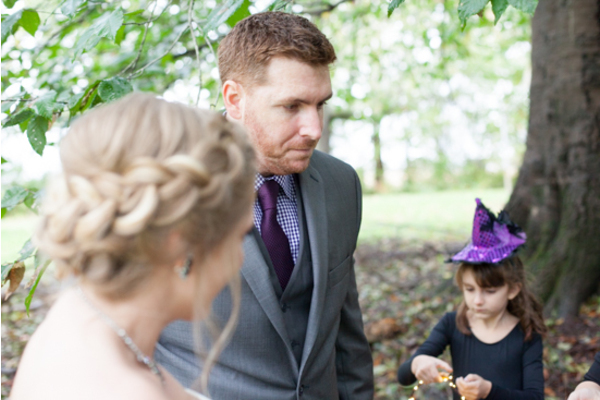 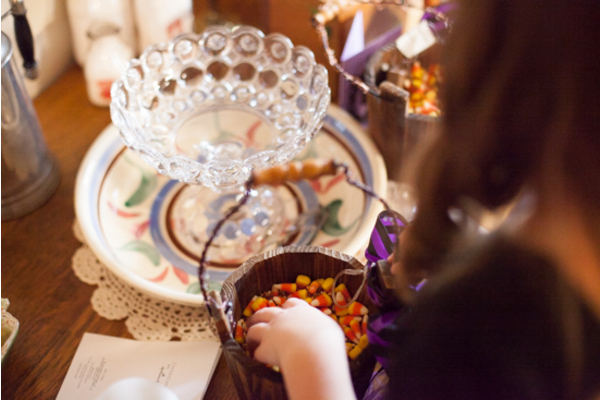 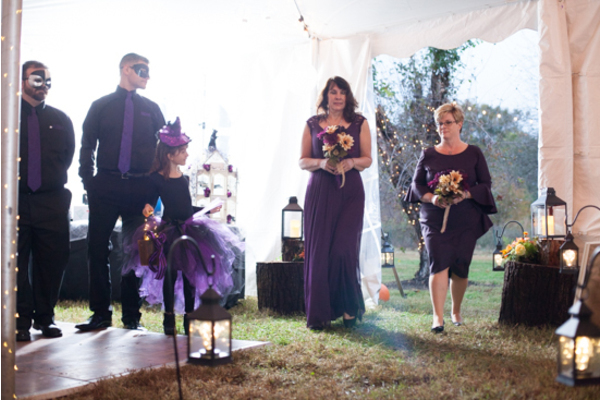 The Halloween-themed wedding was the perfect balance between spooky and chic! 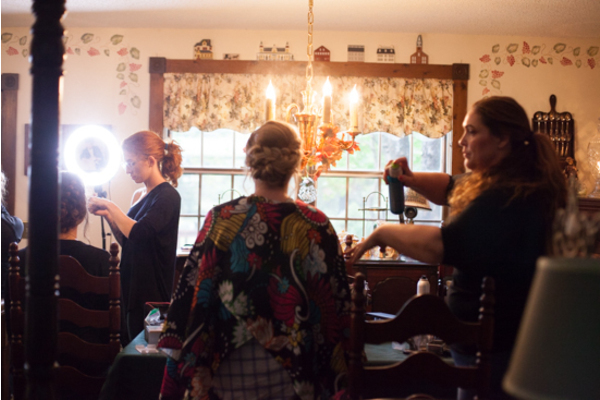 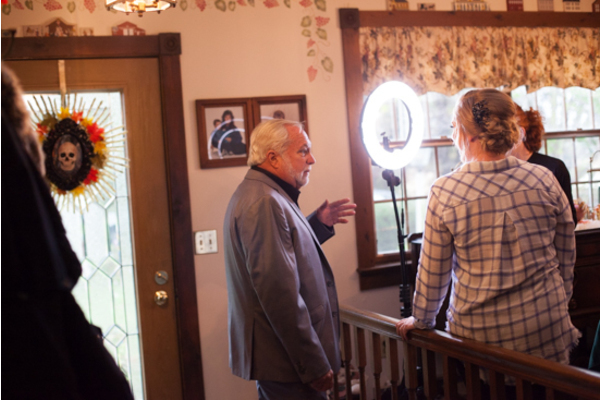 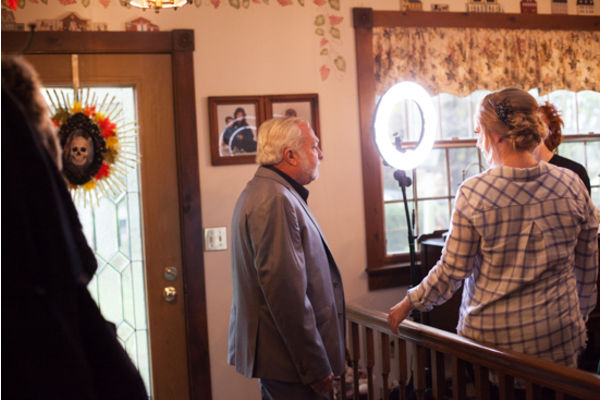 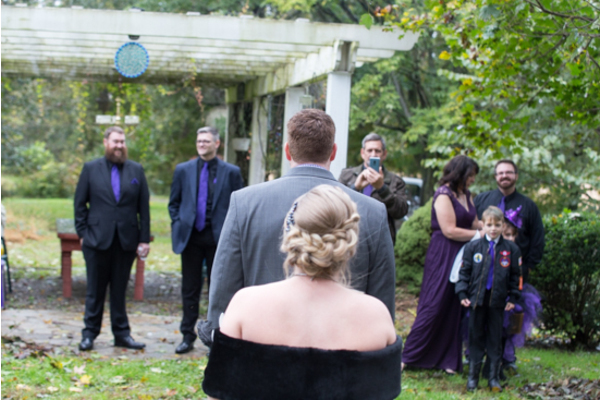 Throughout the day, our NJ Wedding photographer was there to take pictures of all the beautiful decor! 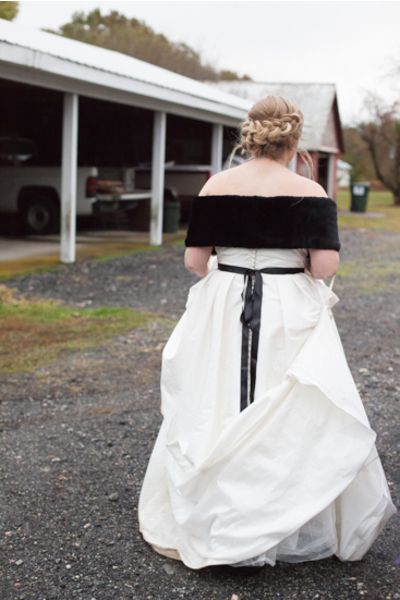 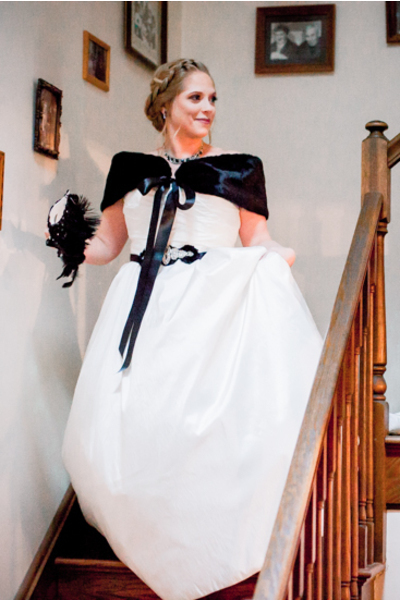 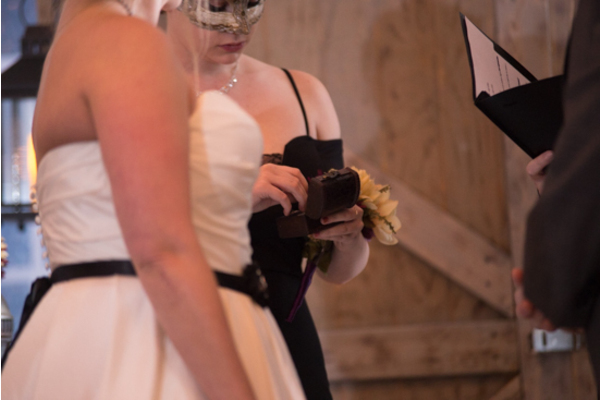 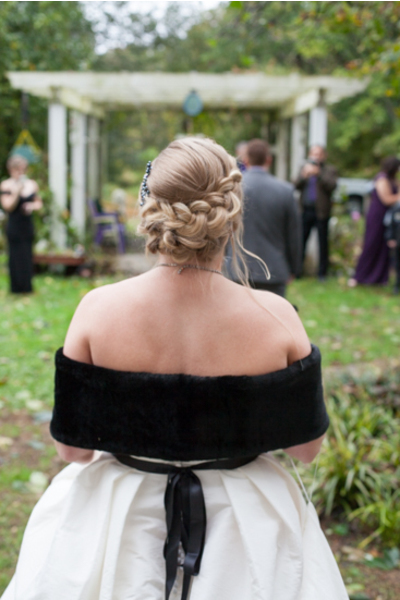 The bride was dressed in a gorgeous white gown accompanied by a black fur shawl and masquerade mask. 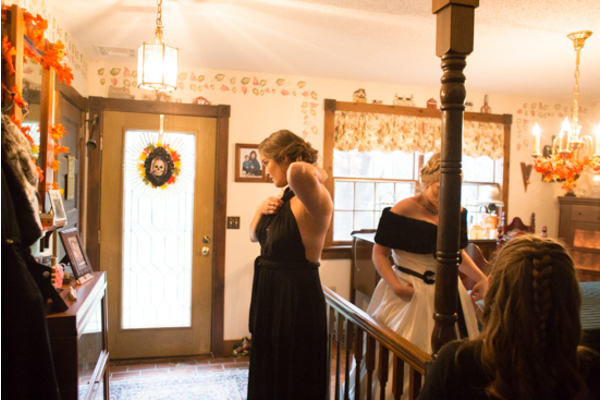 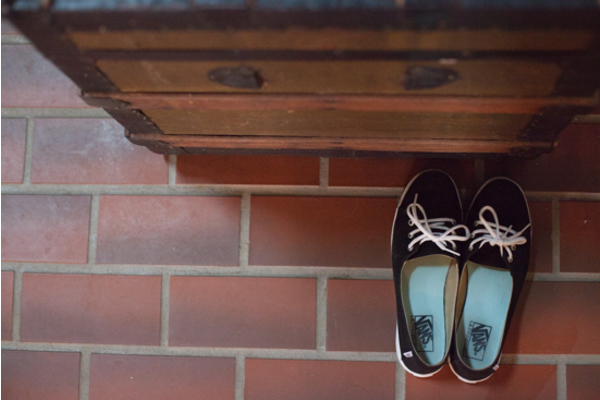 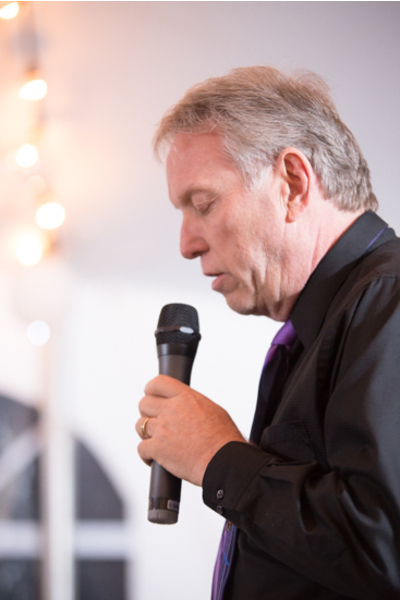 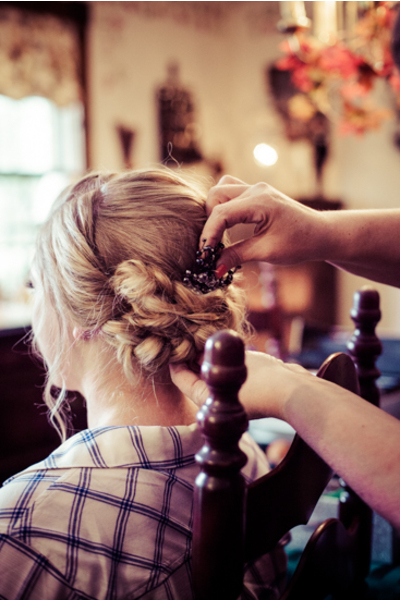 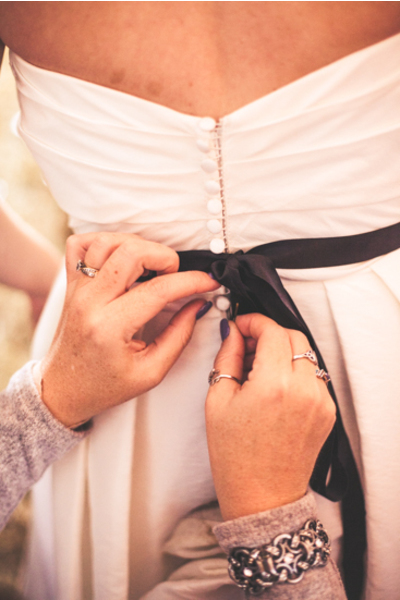 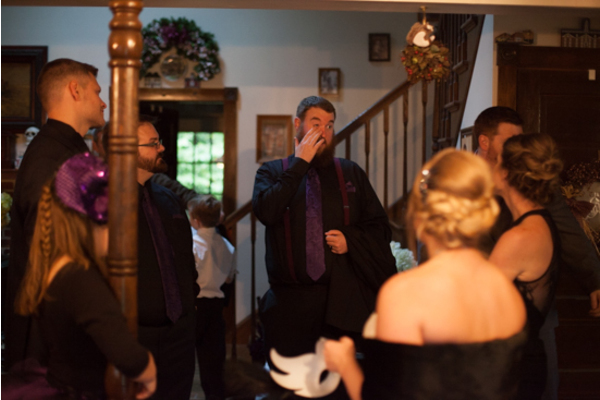 After both the bride and groom were finished getting ready, it was getting closer to the big ceremony! 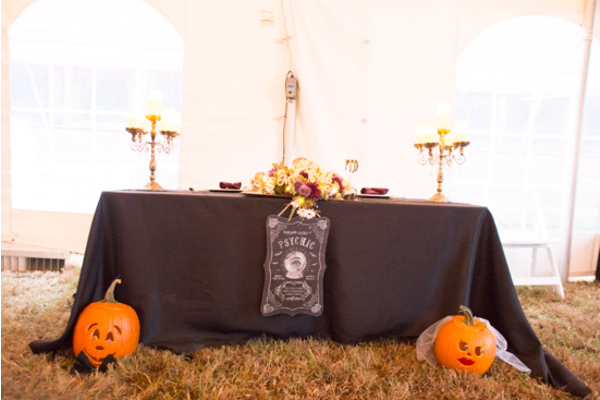 The ceremony was decorated beautifully for Halloween! 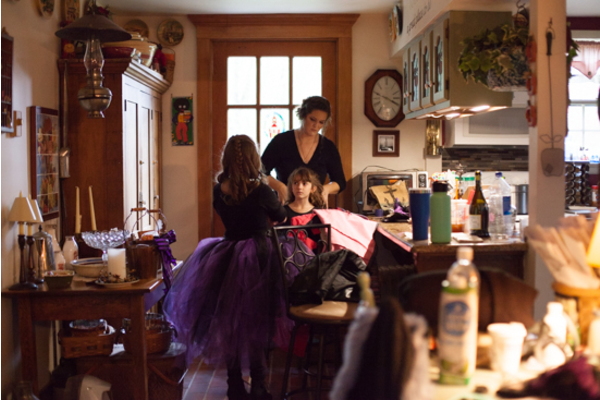 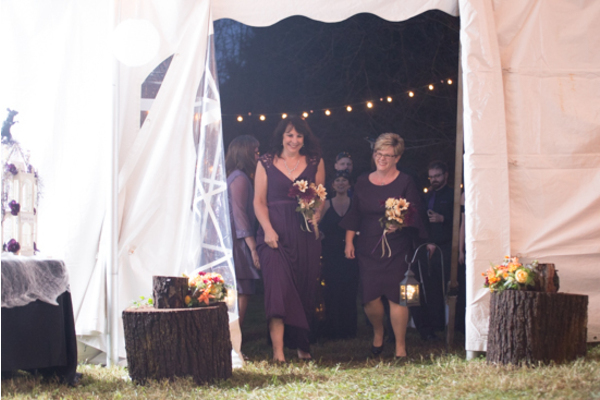 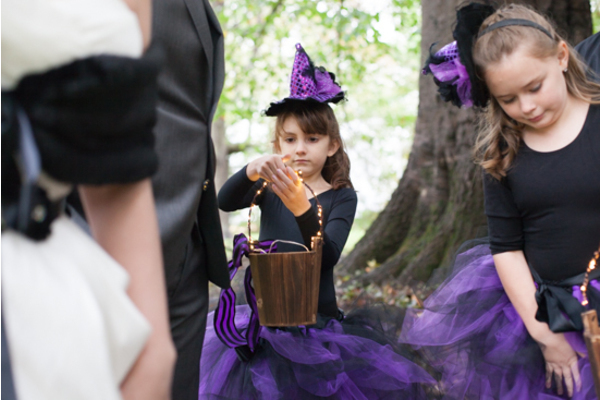 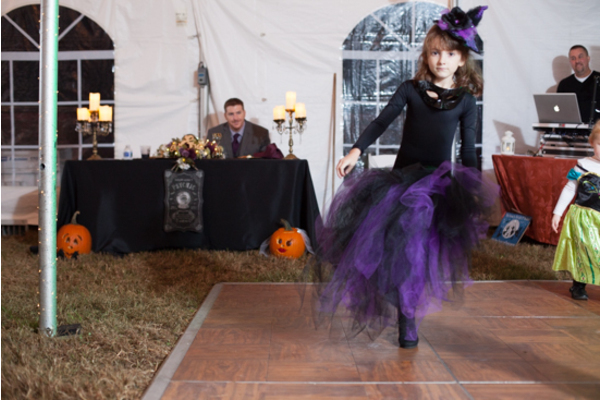 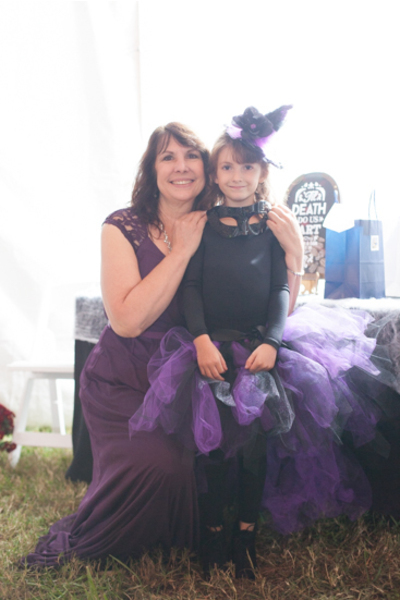 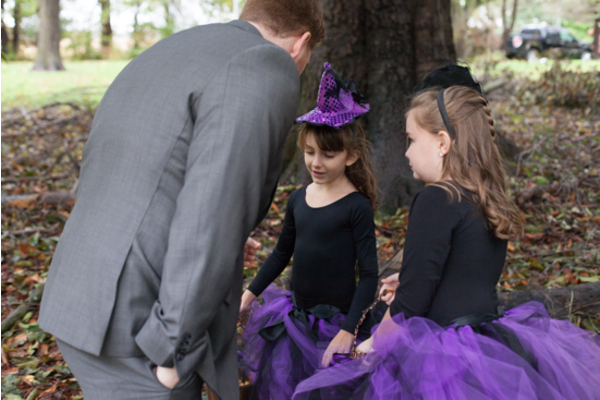 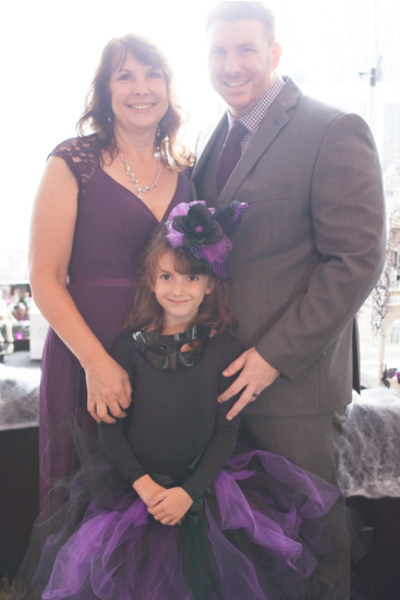 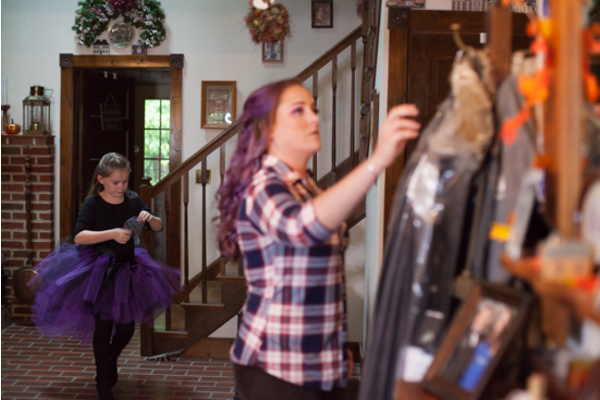 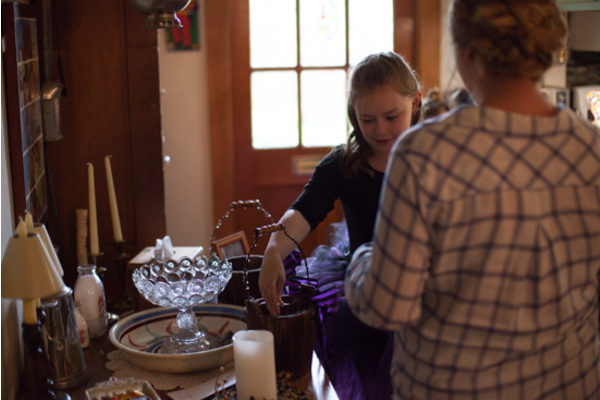 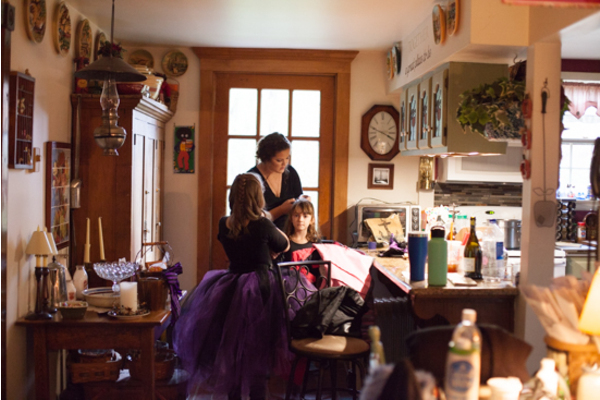 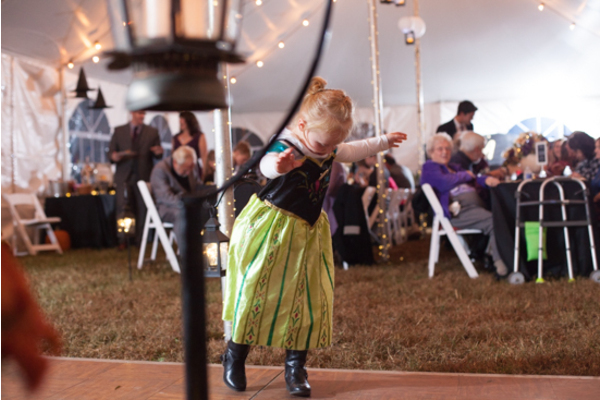 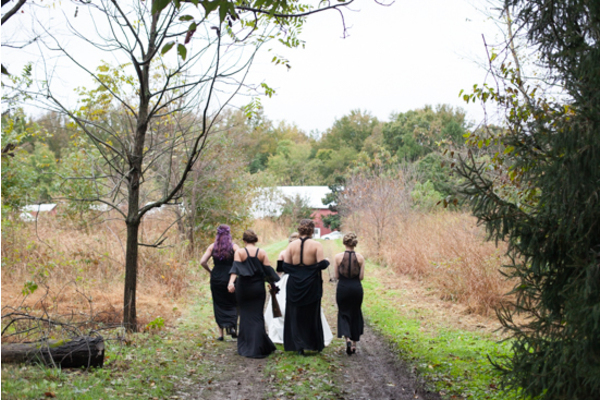 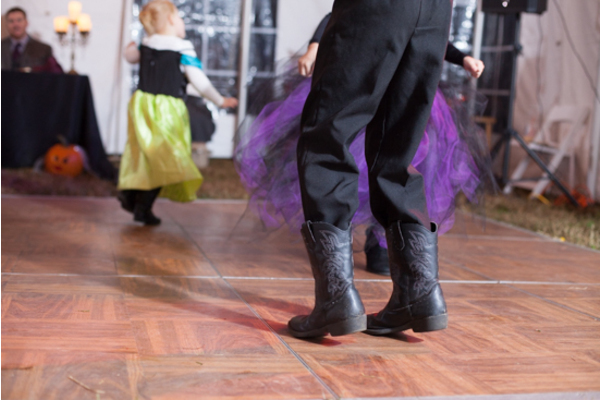 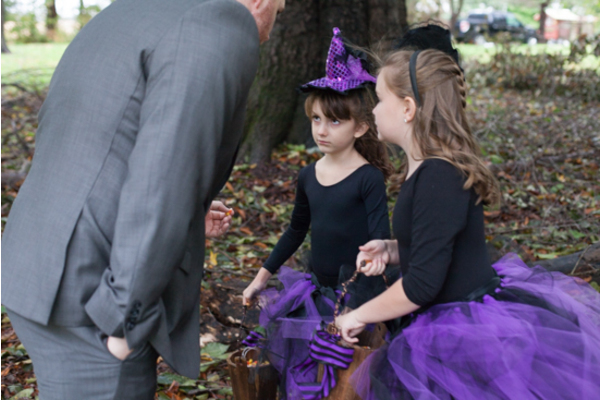 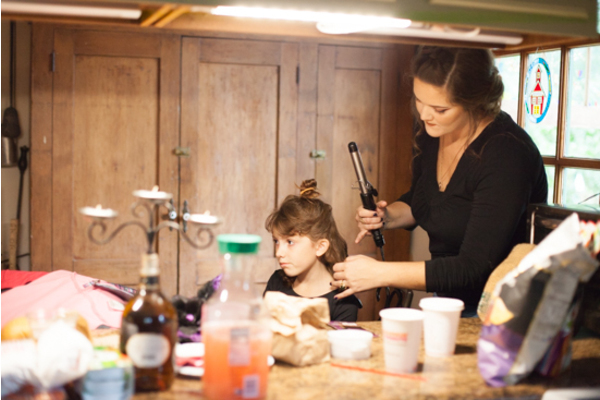 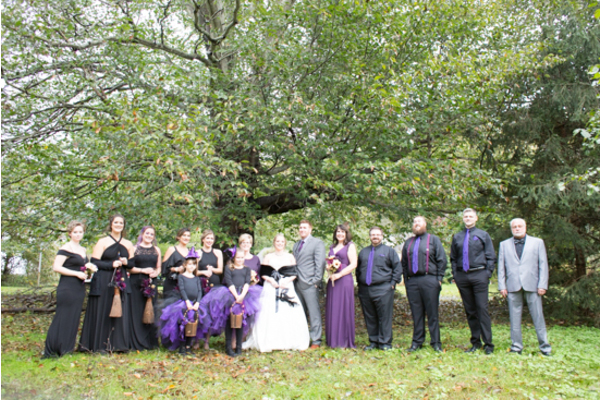 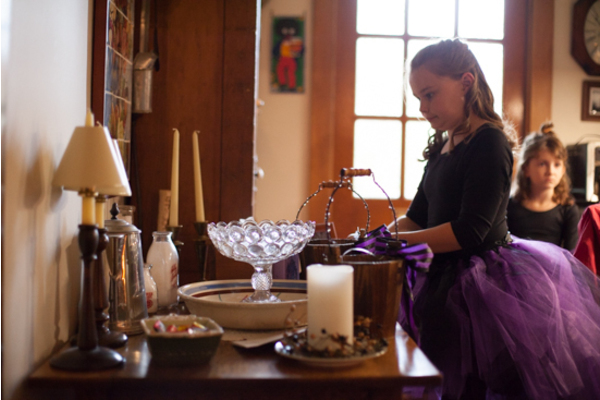 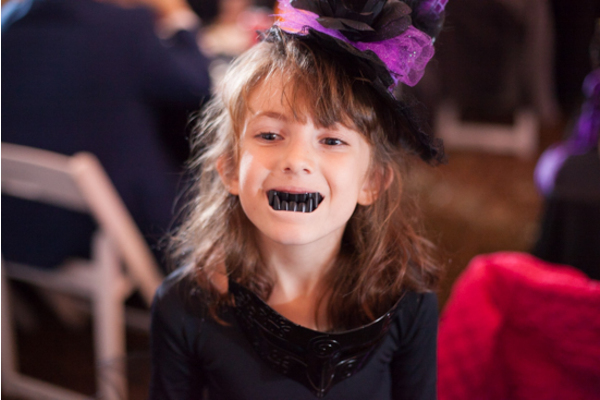 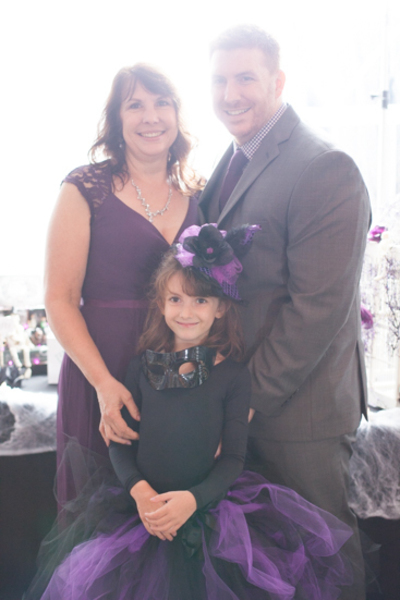 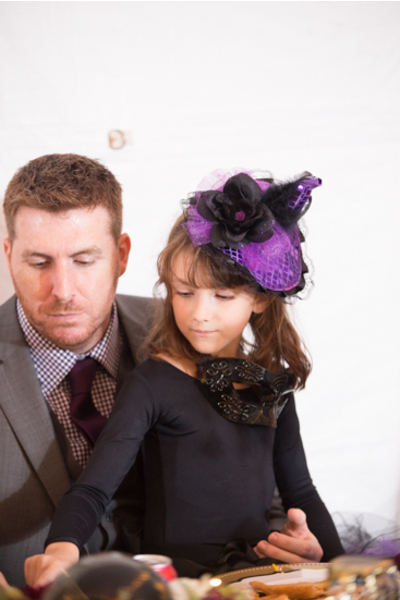 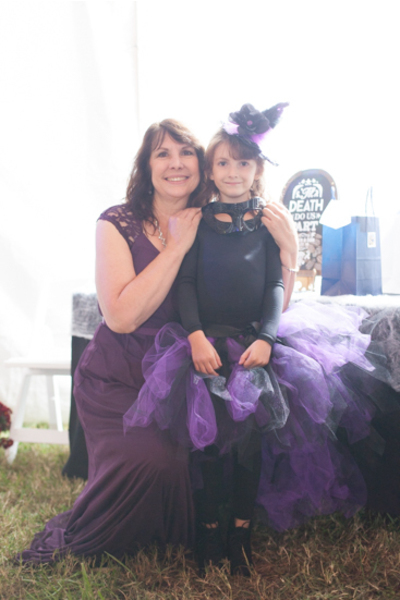 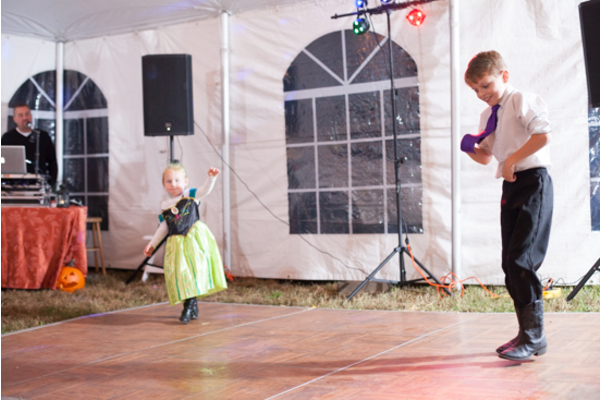 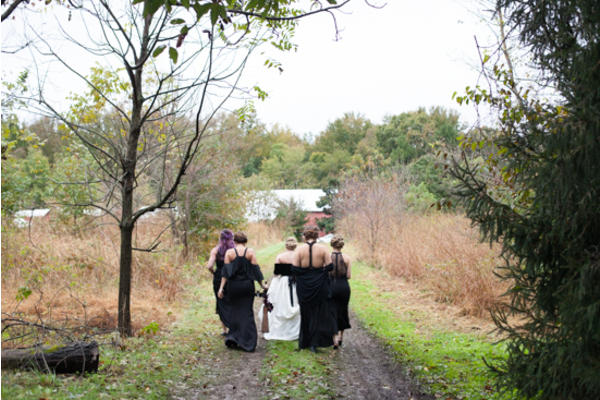 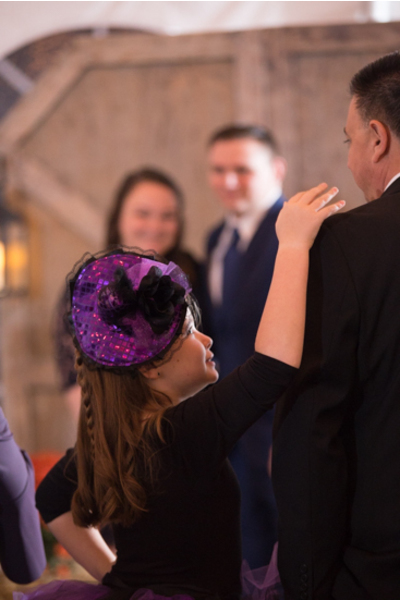 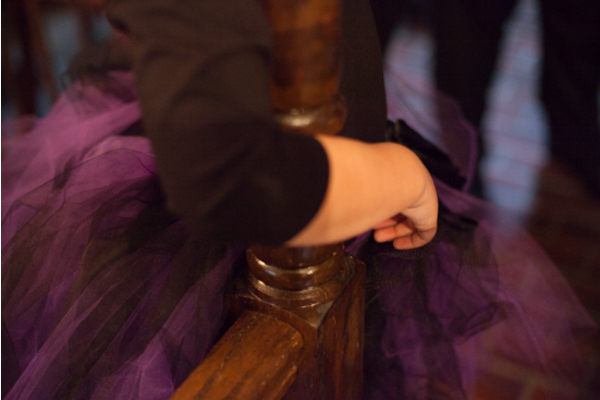 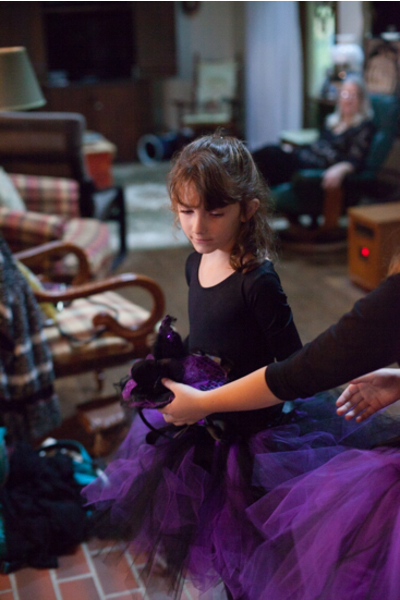 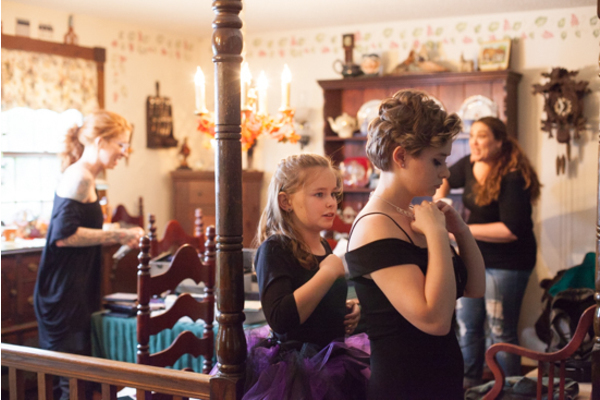 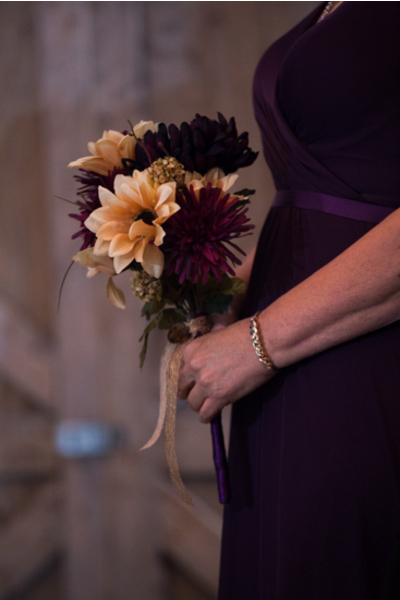 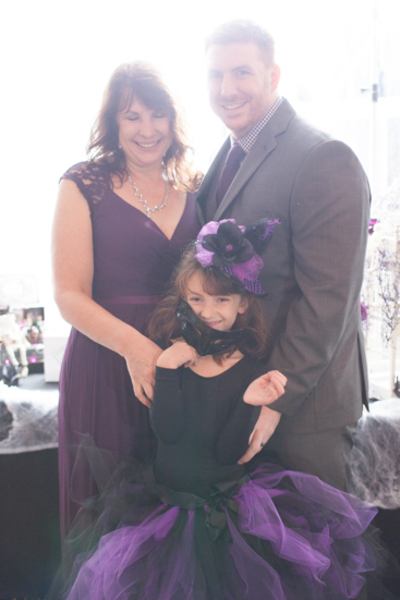 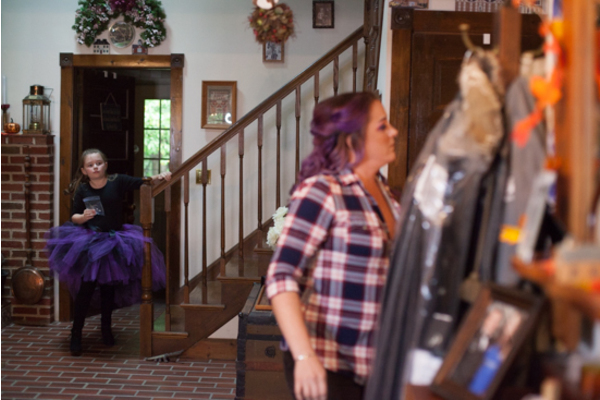 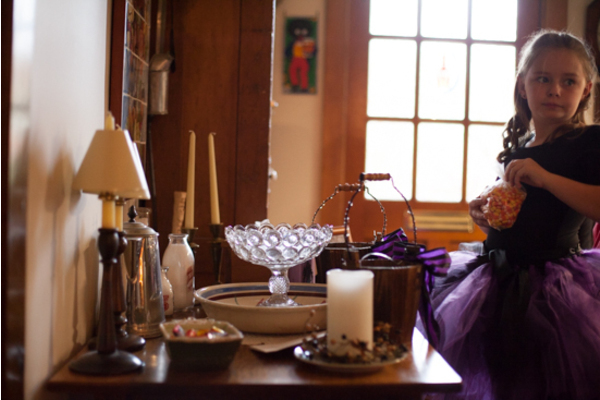 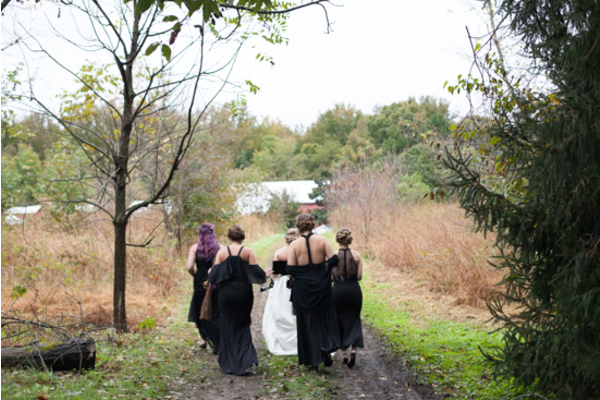 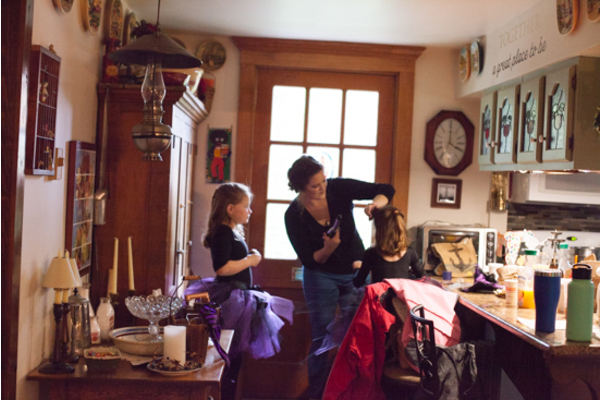 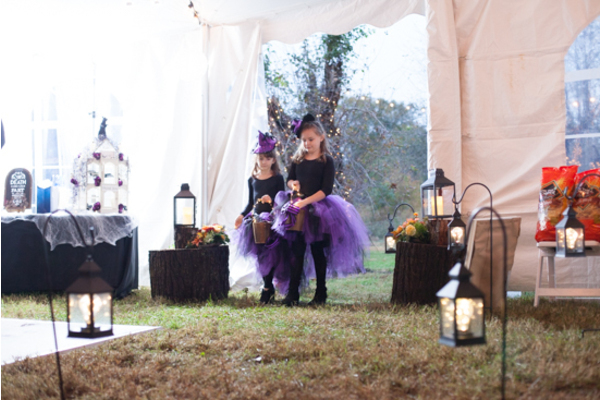 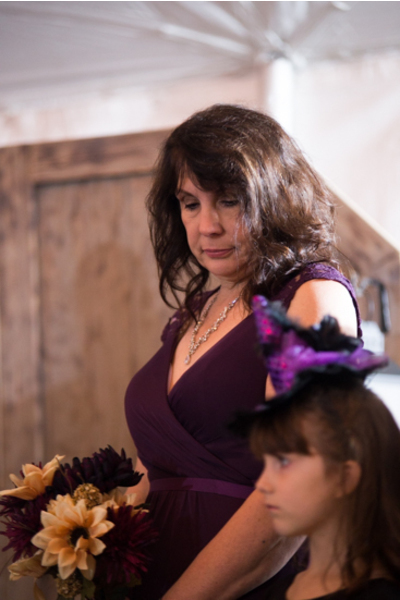 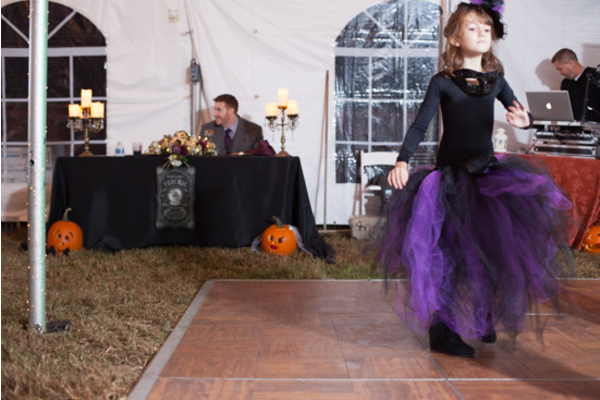 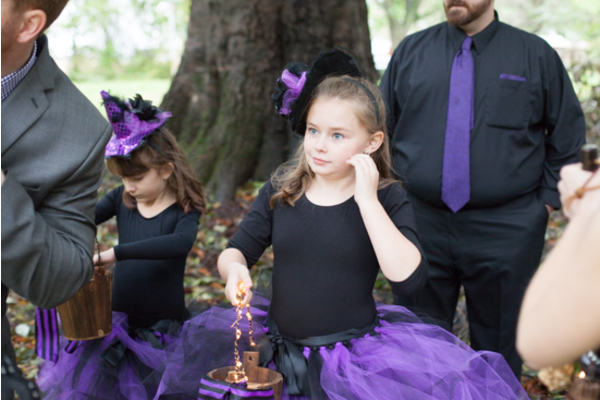 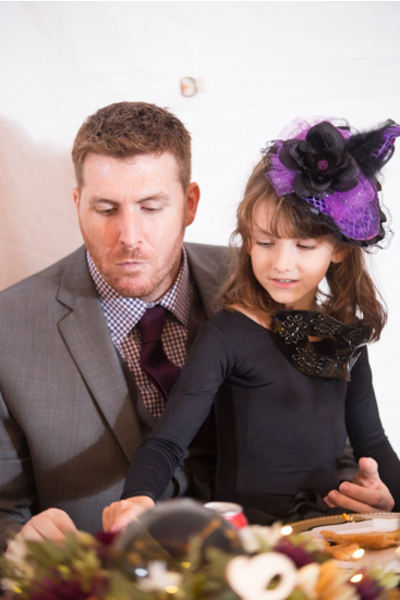 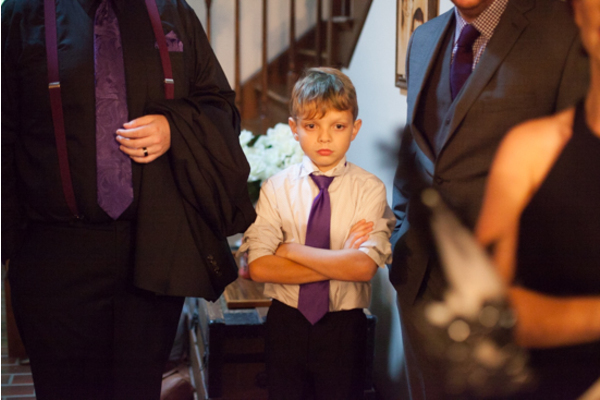 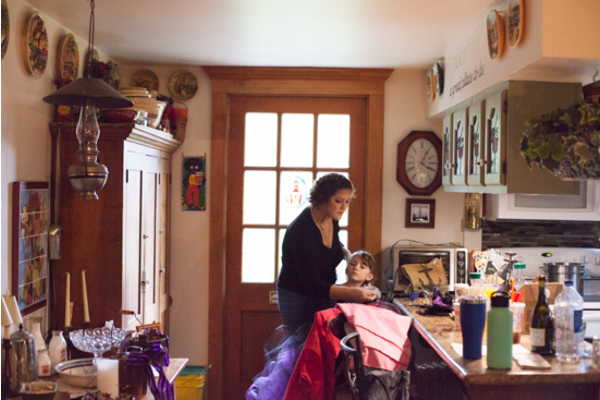 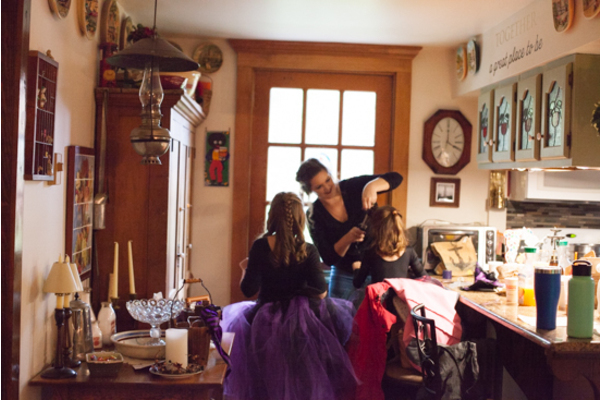 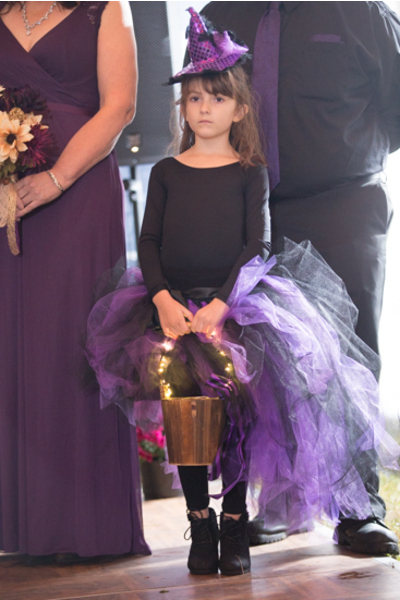 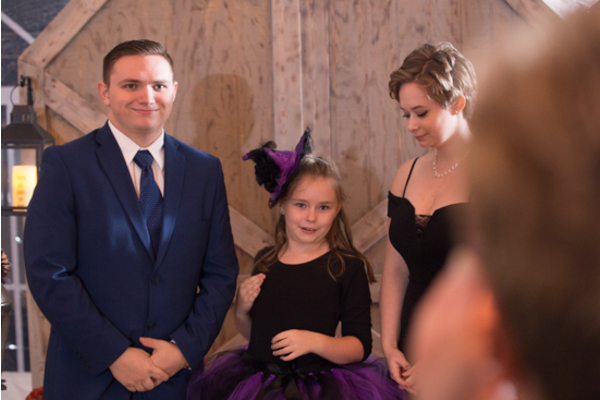 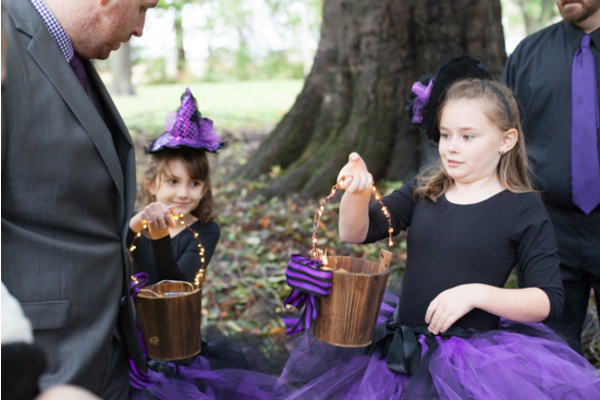 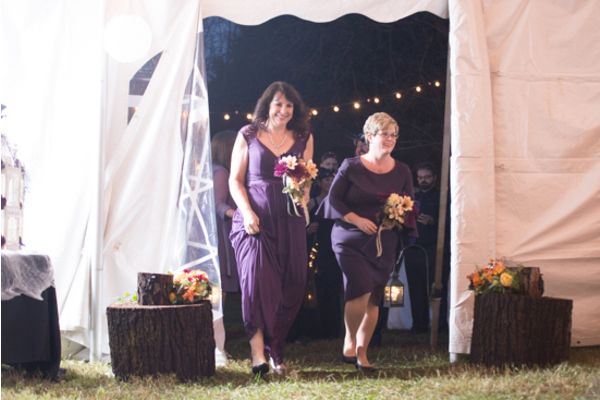 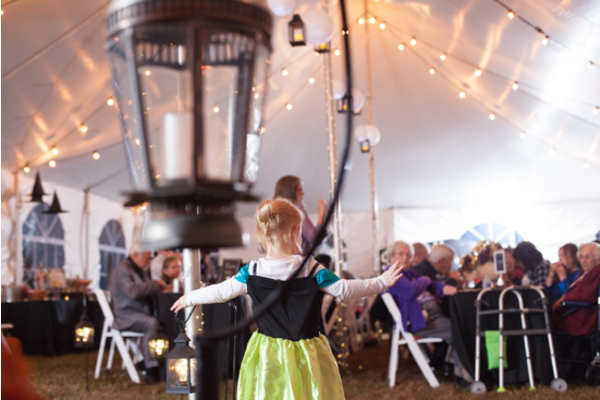 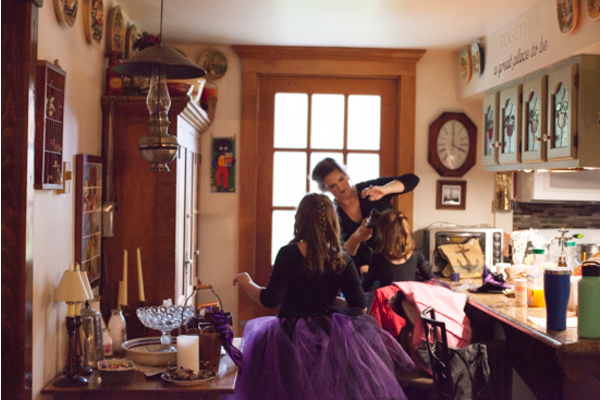 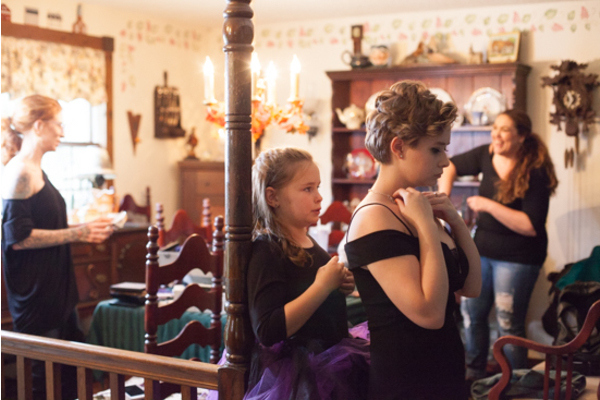 The bridesmaids wore deep purple gowns, and the kids were dressed as adorable little witches. 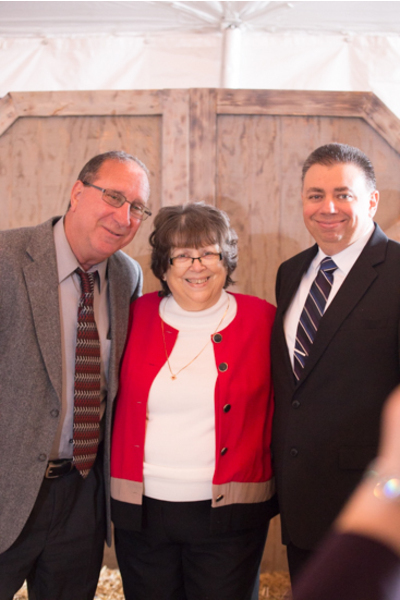 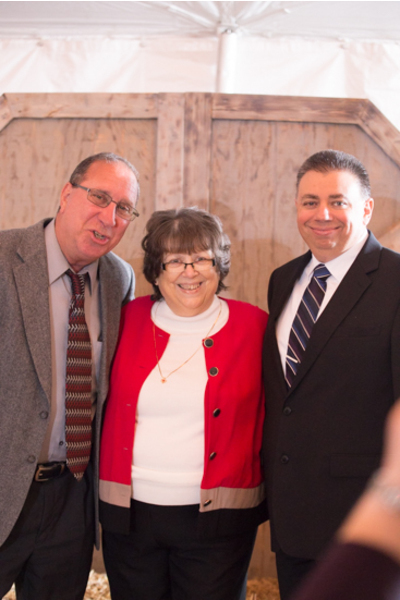 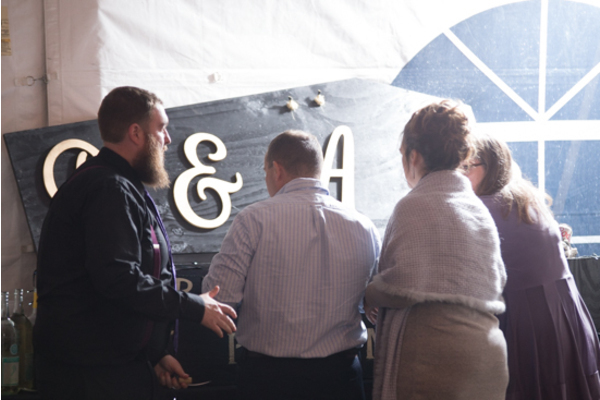 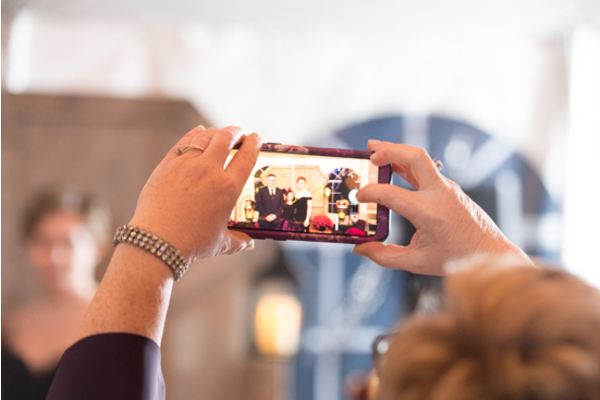 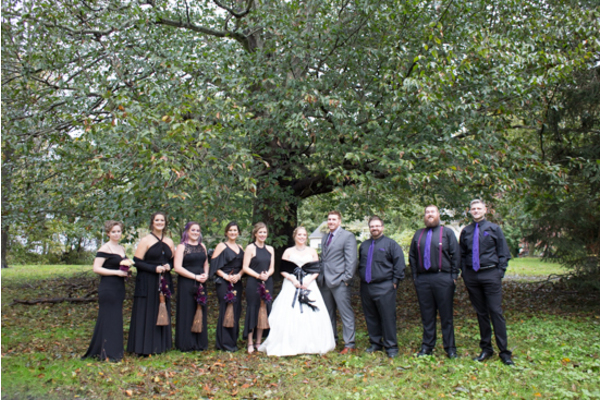 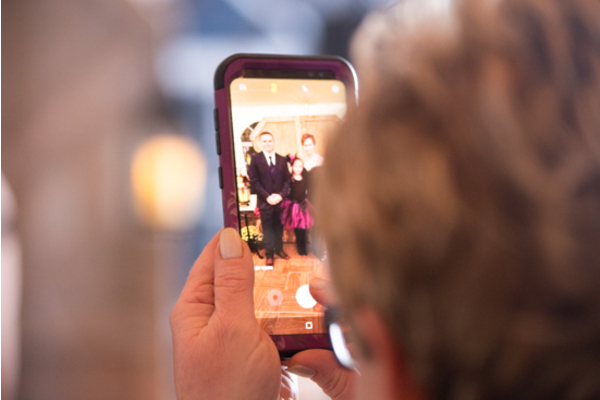 Meanwhile, our NJ Wedding Photographer was there to snap shots of the lovely wedding party at all angles. 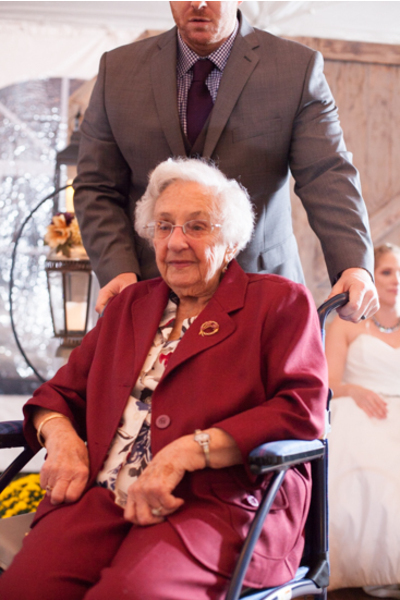 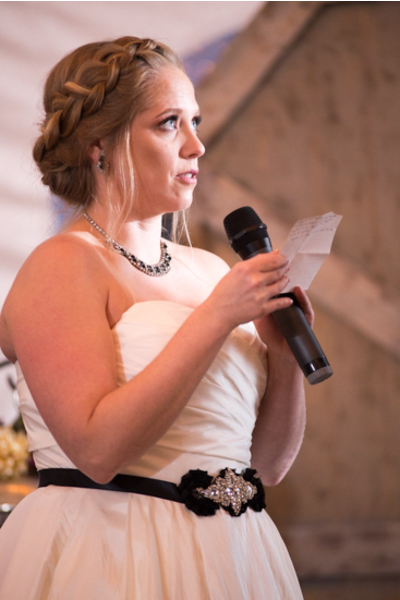 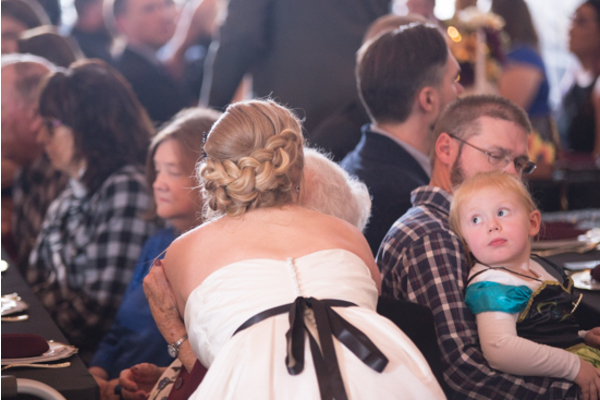 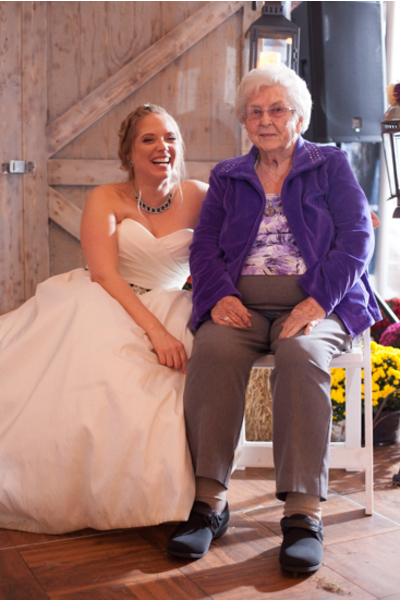 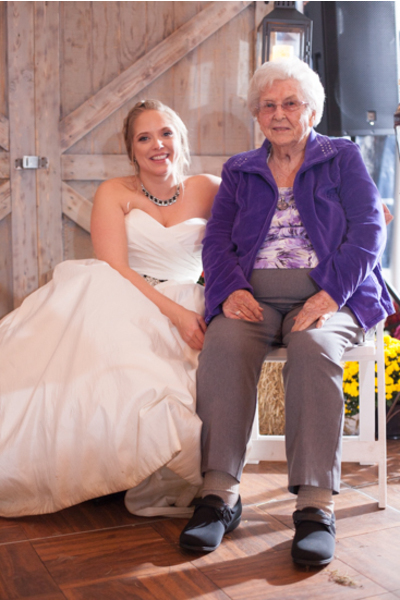 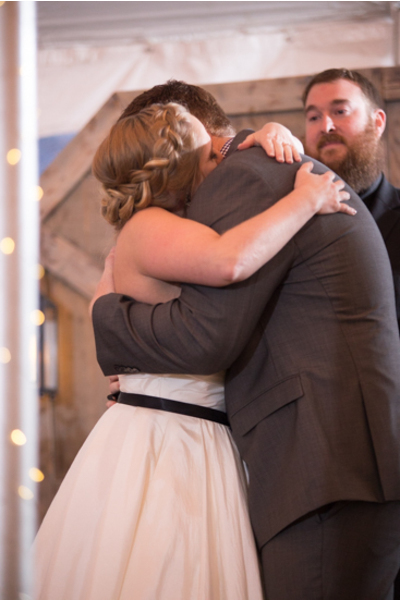 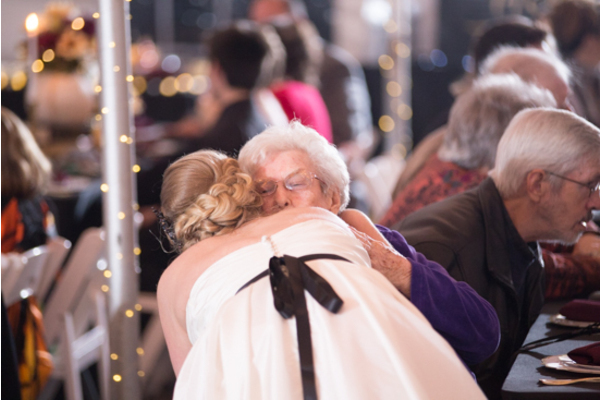 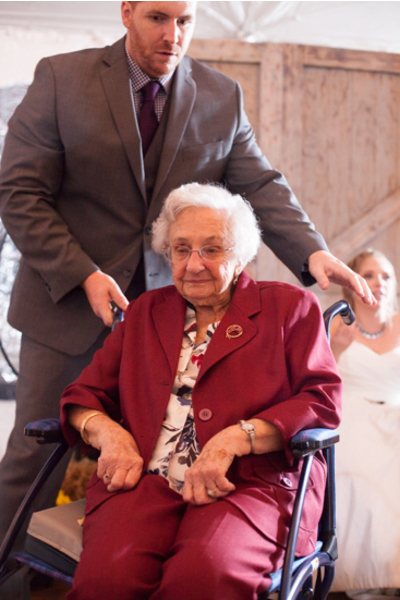 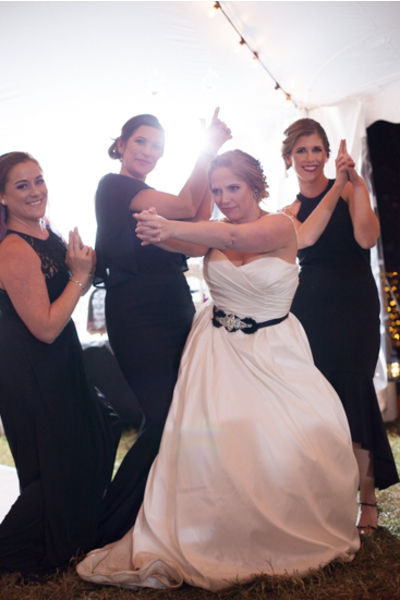 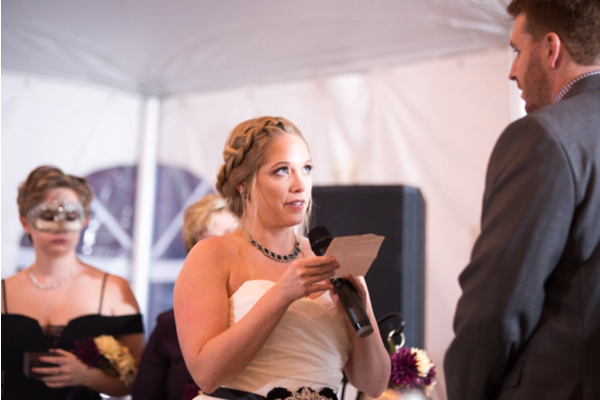 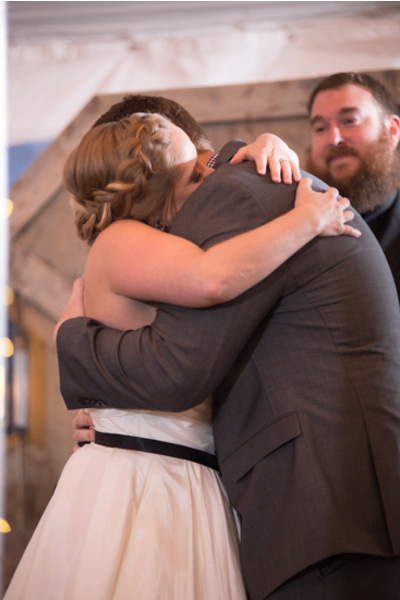 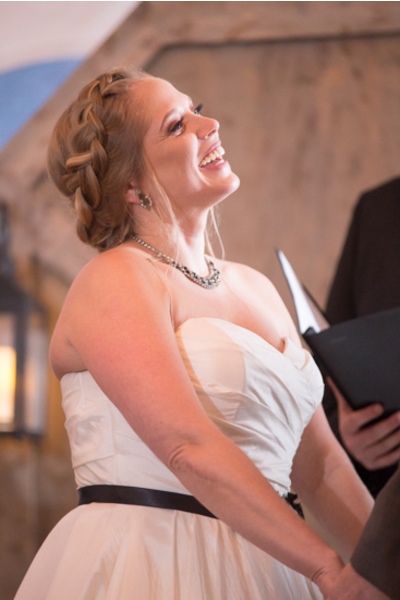 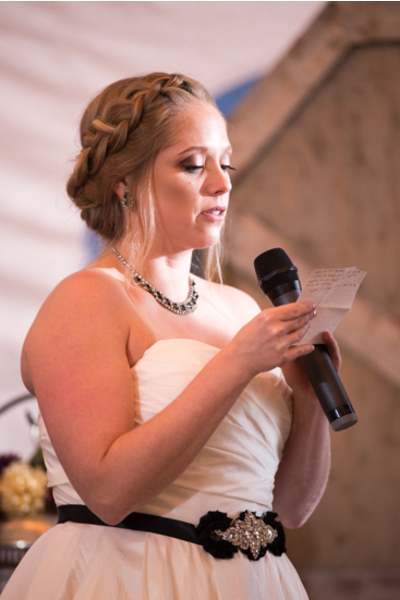 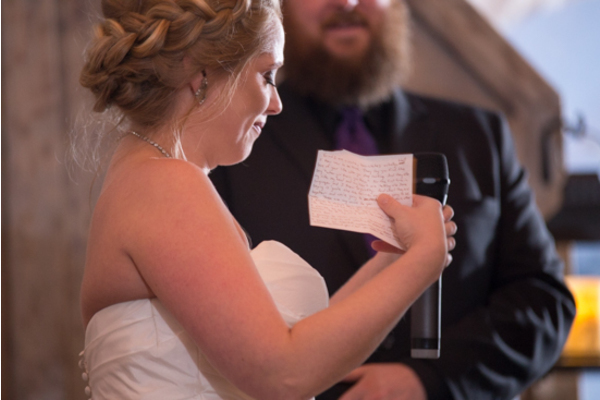 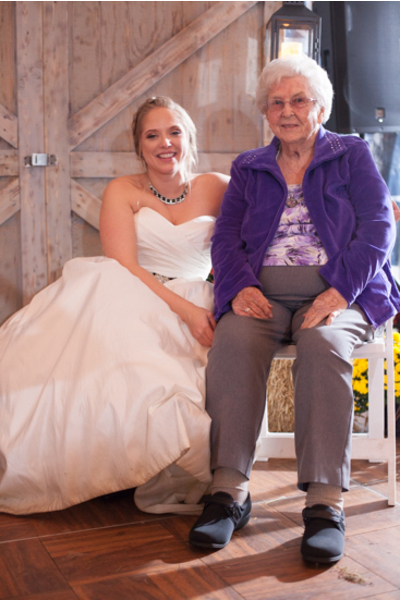 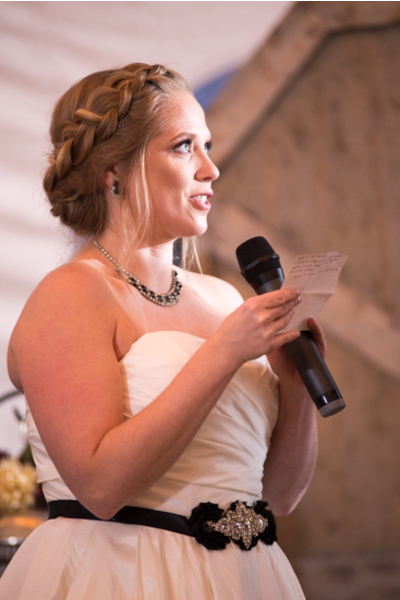 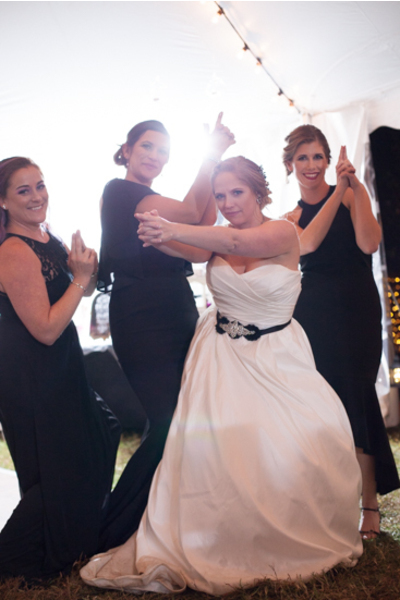 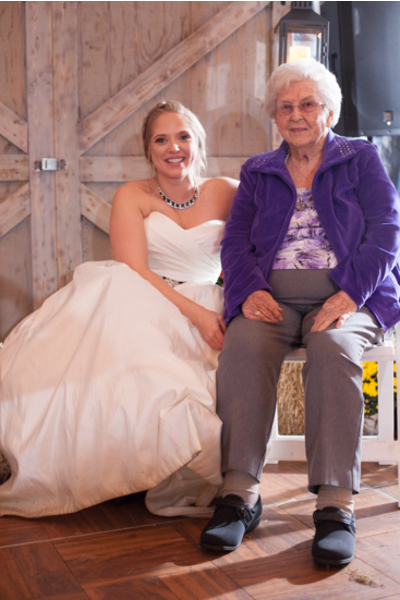 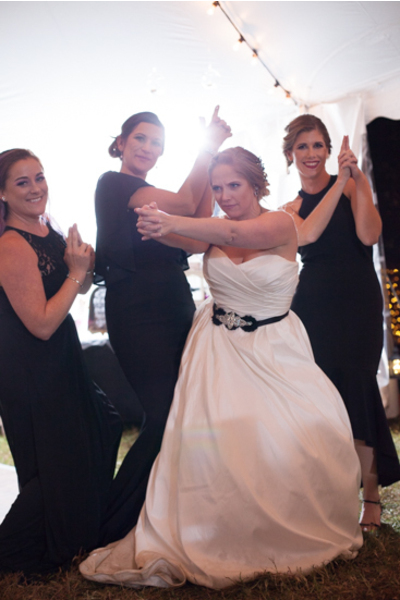 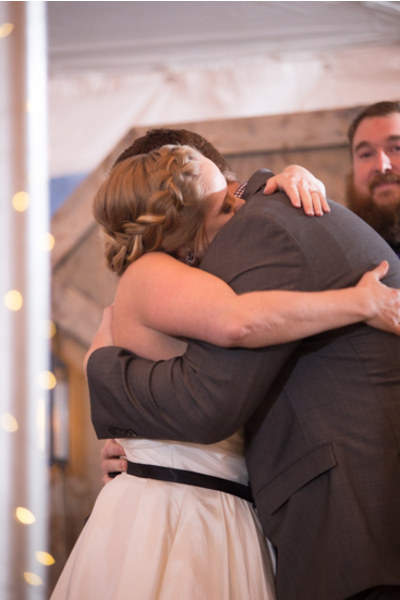 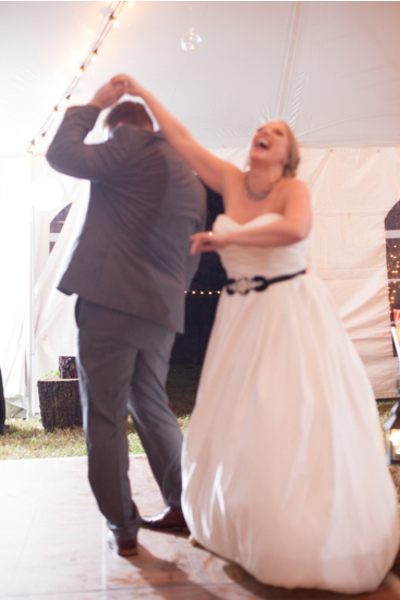 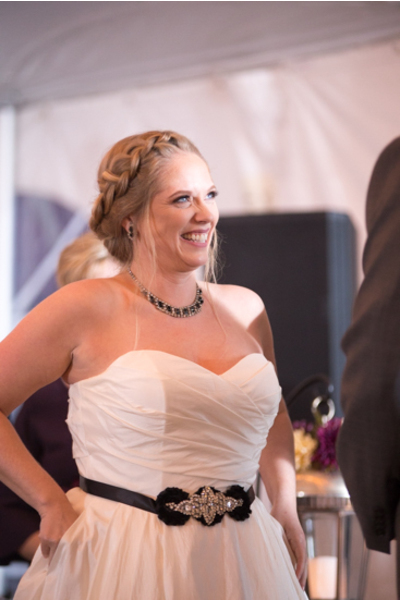 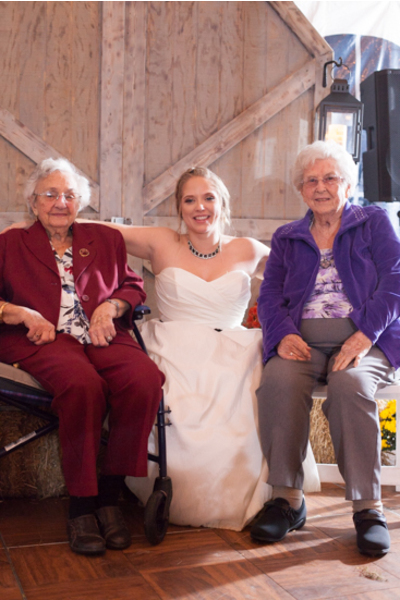 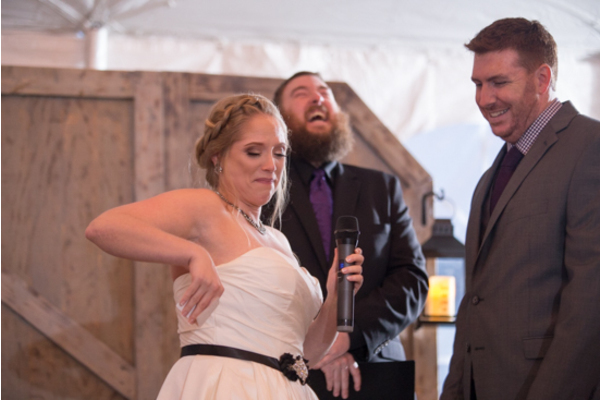 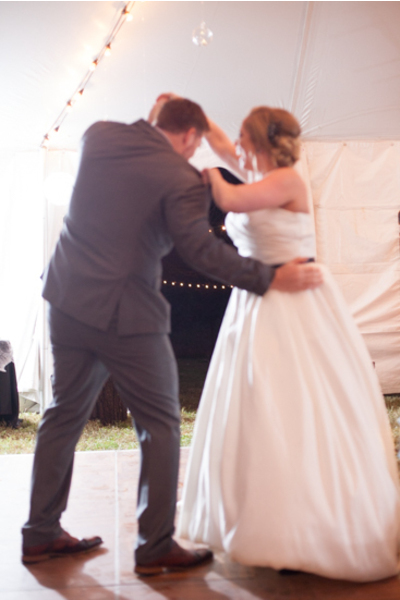 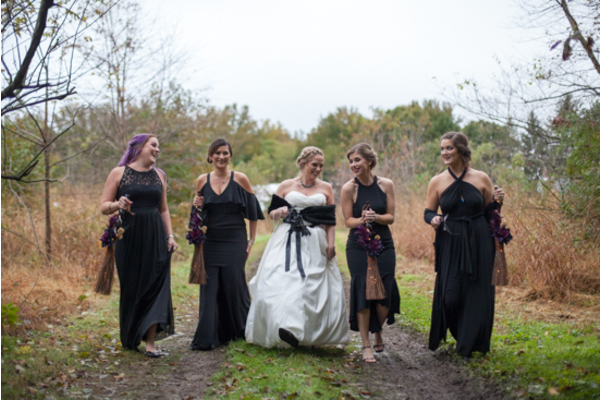 After everyone took their seats, it was time for the bride to rock the aisle! 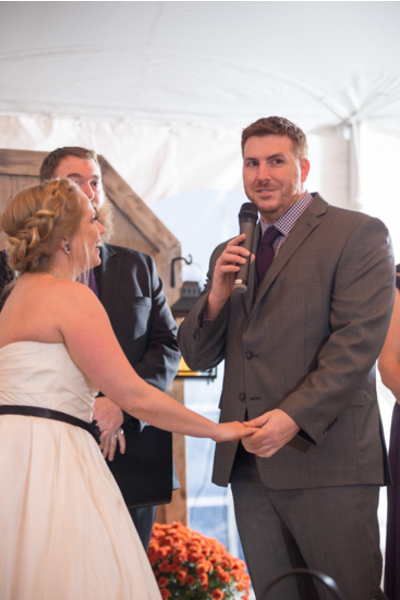 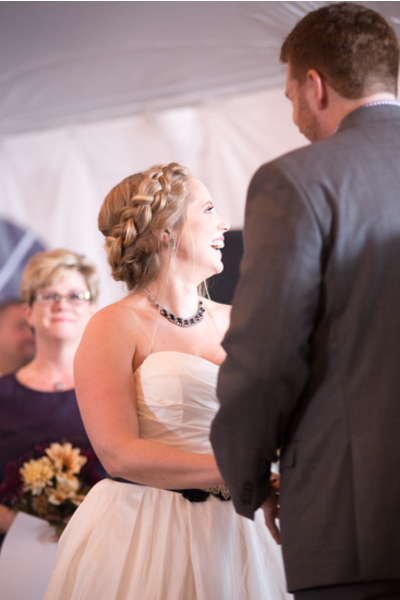 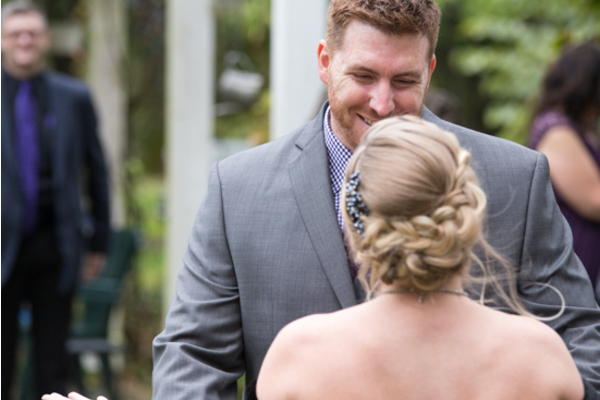 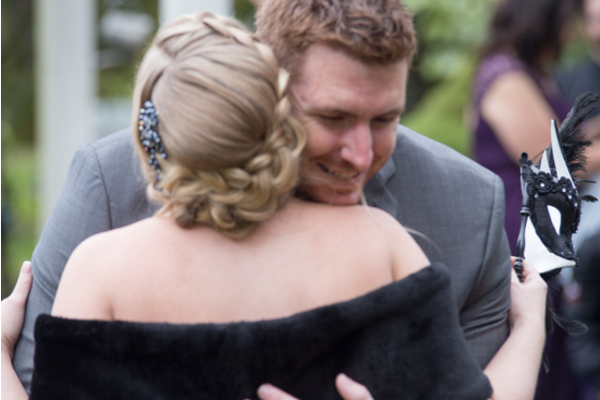 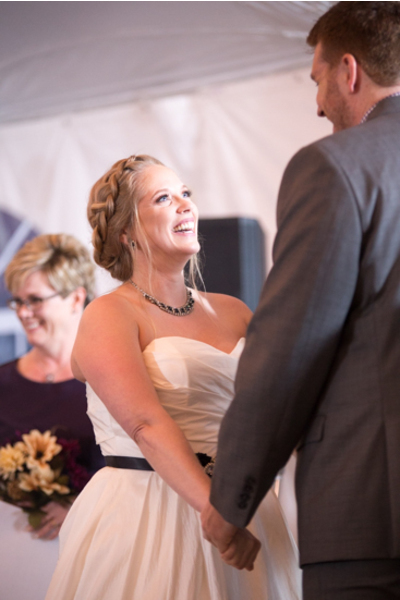 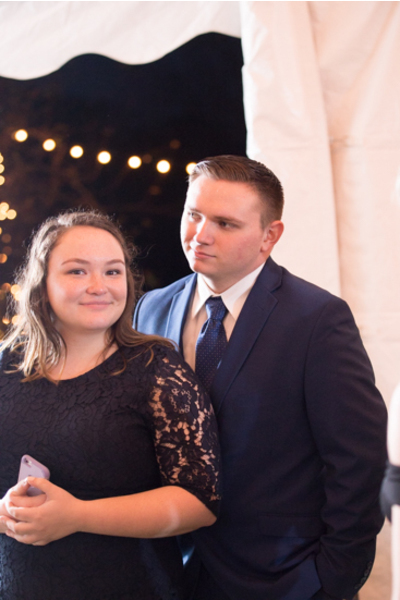 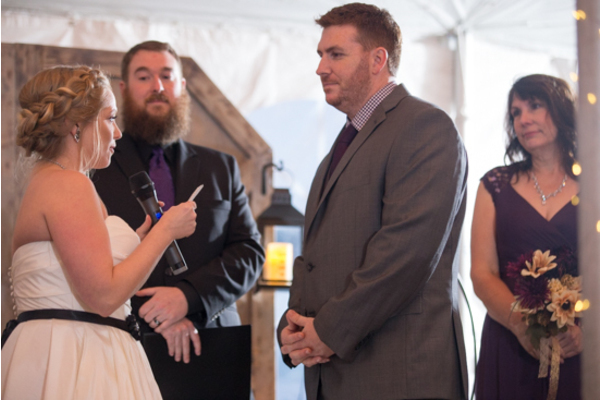 Amber and Daniel locked eyes and were all smiles the entire time up at the alter! 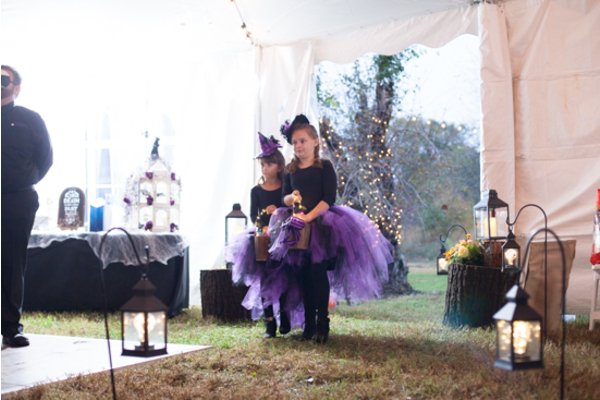 Now, it was time to head to the reception for some more Halloween surprises. 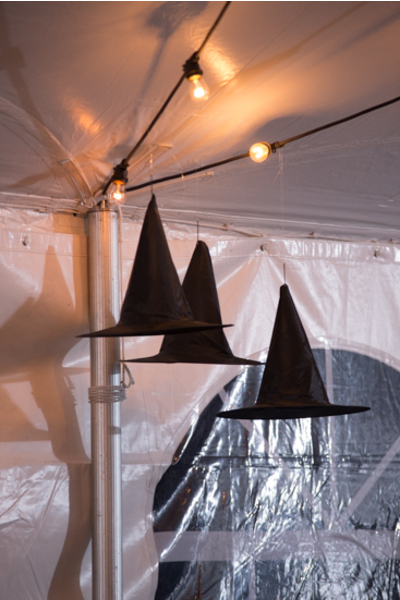 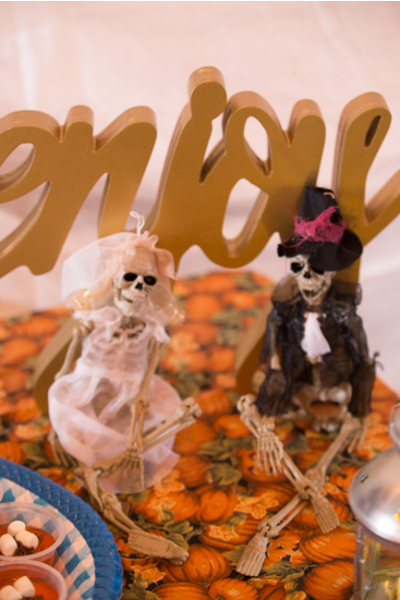 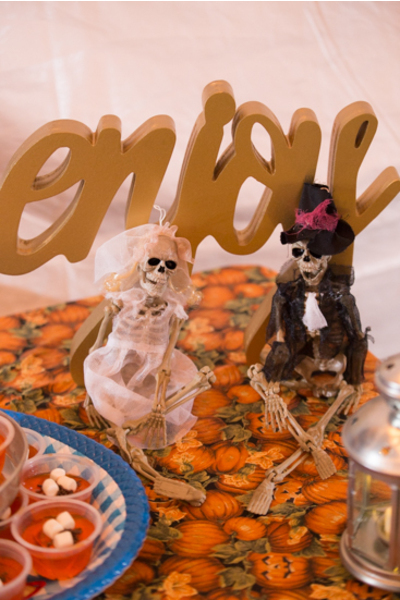 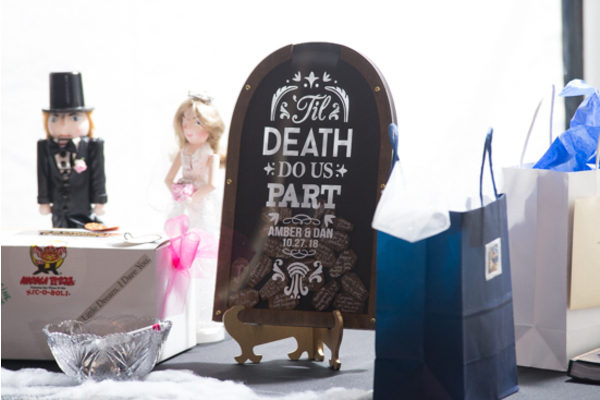 The “Till Death Due Us Party”reception was amazingly unique and decorated with witch hats, skeletons and pumpkins. 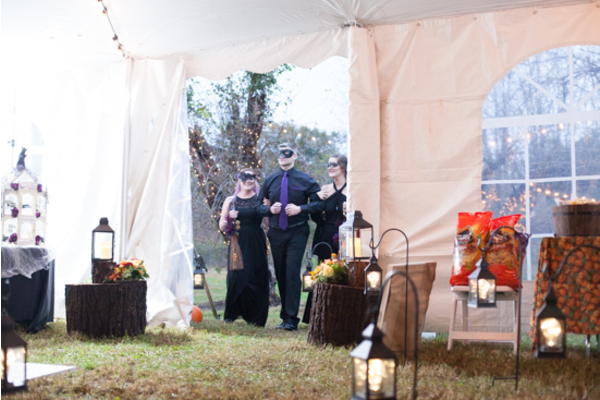 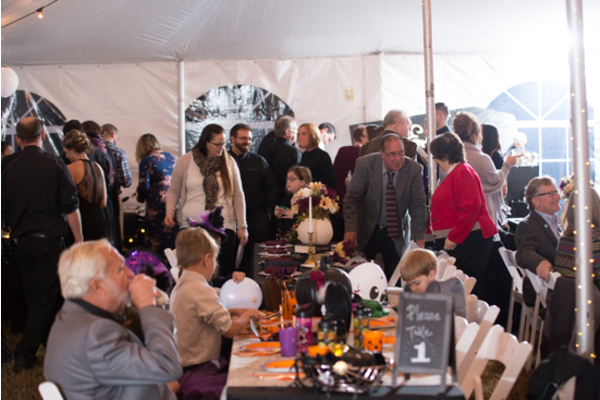 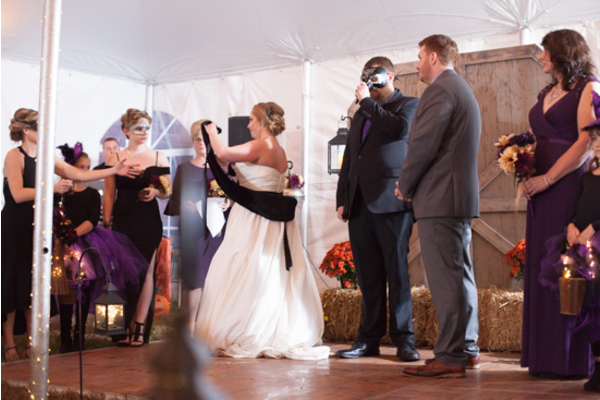 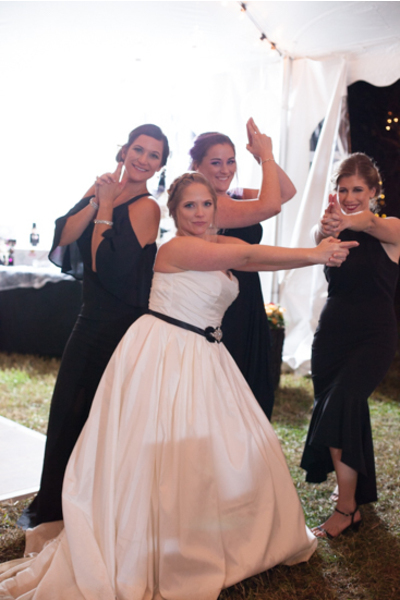 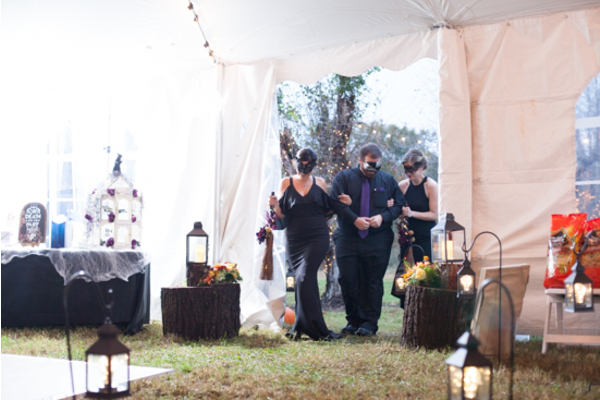 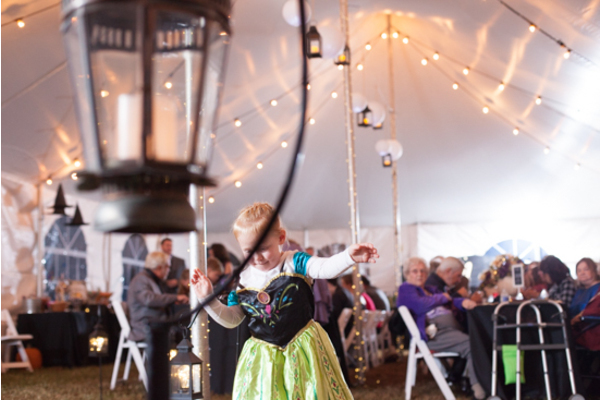 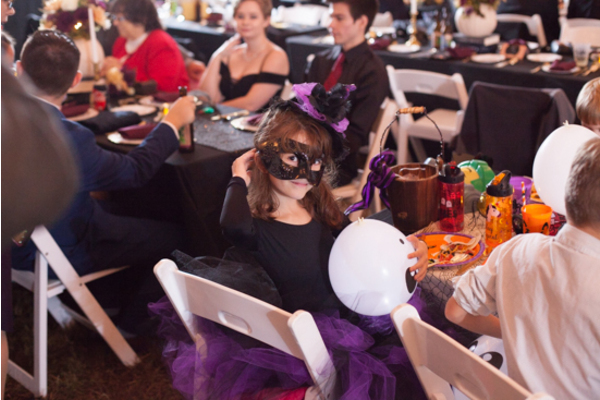 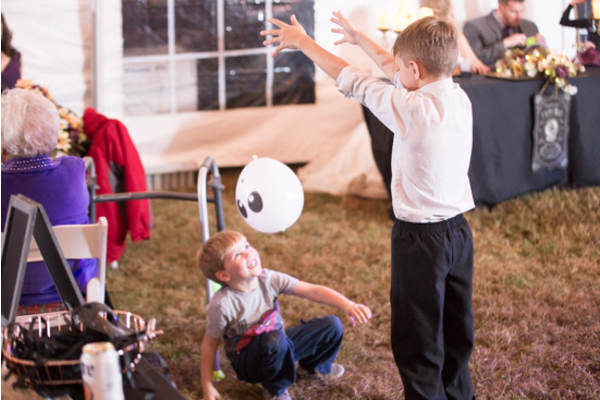 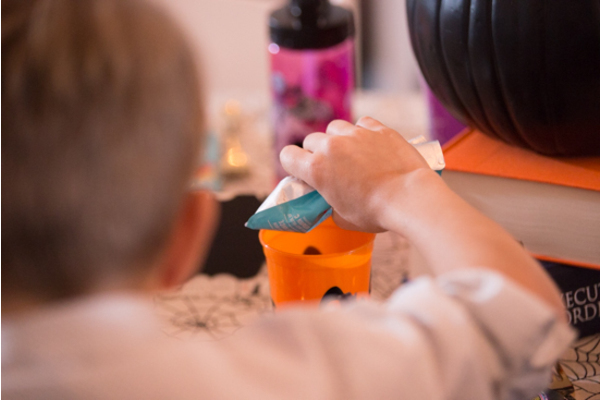 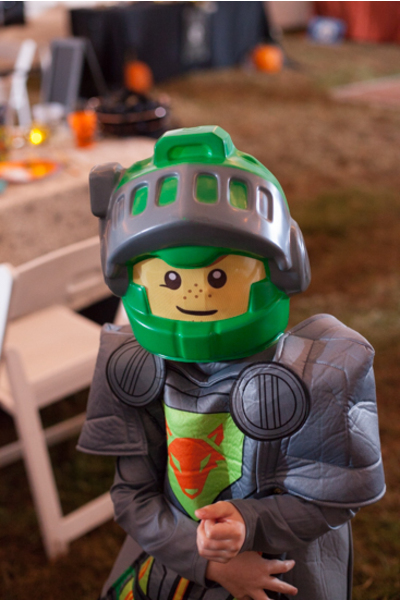 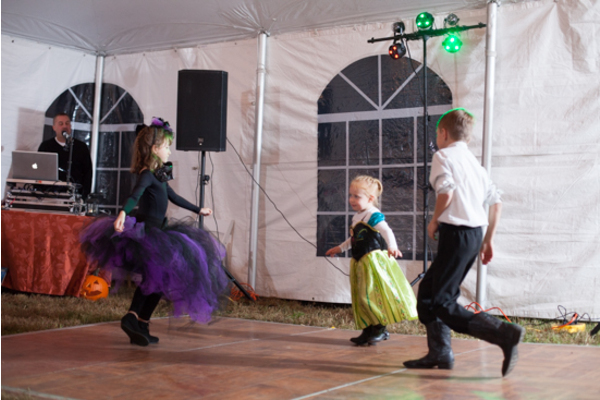 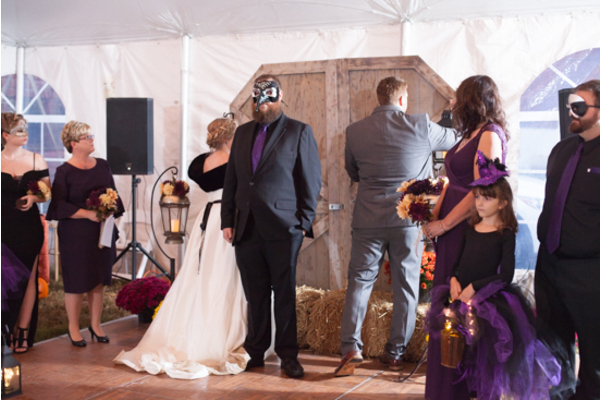 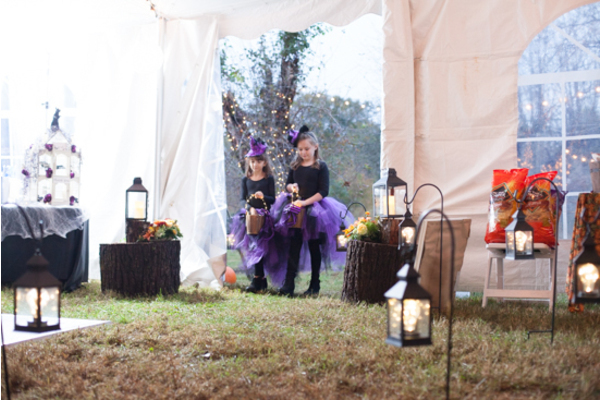 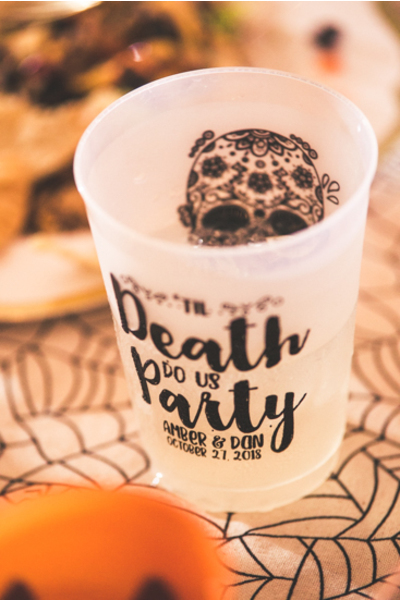 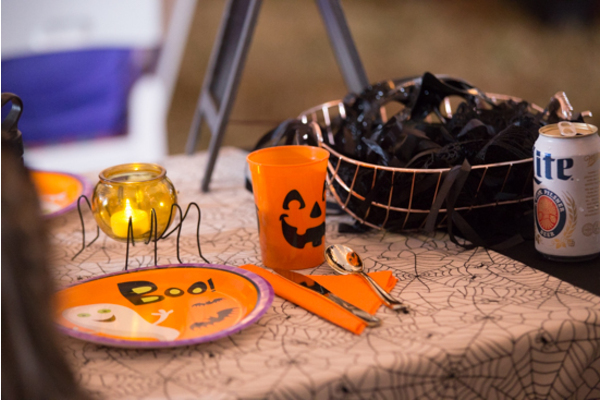 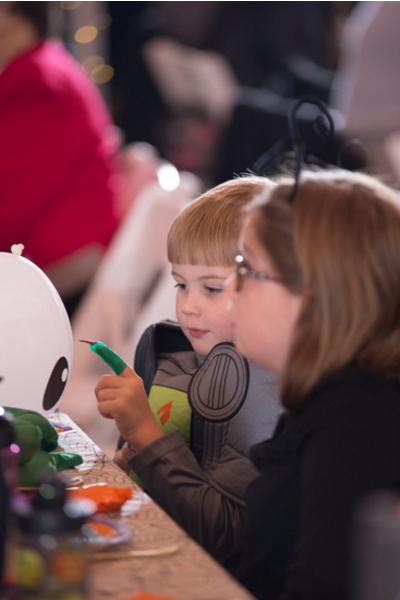 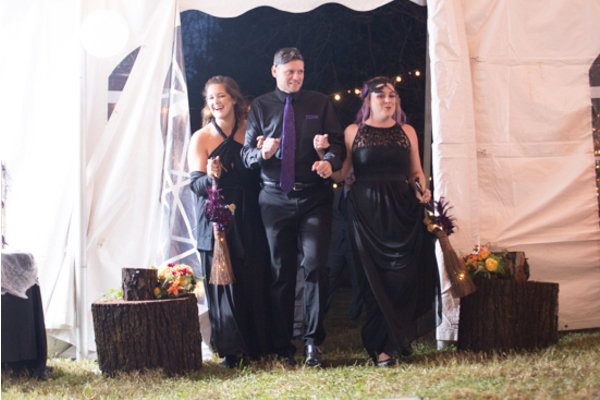 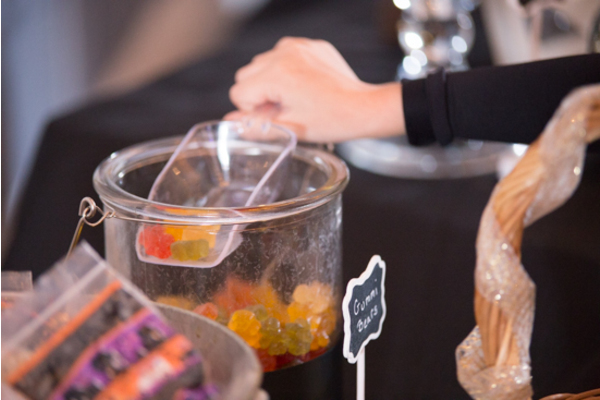 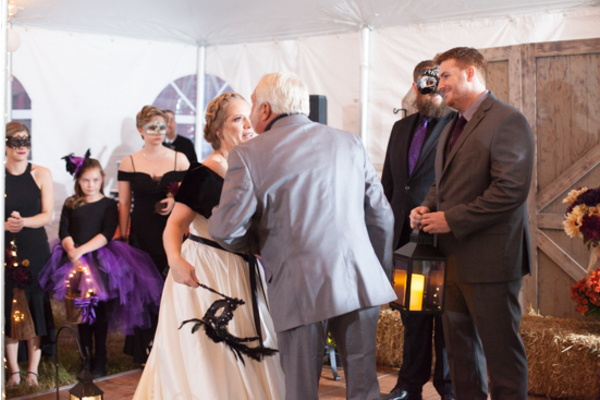 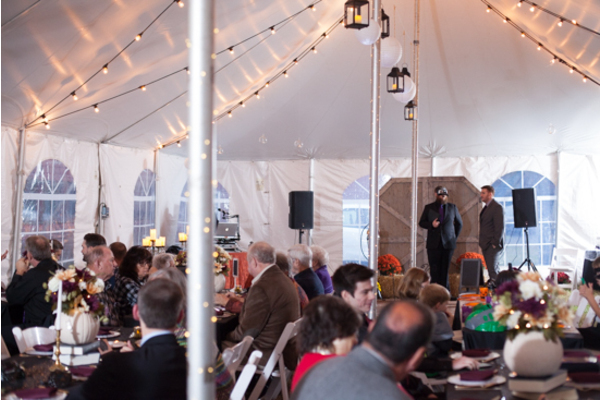 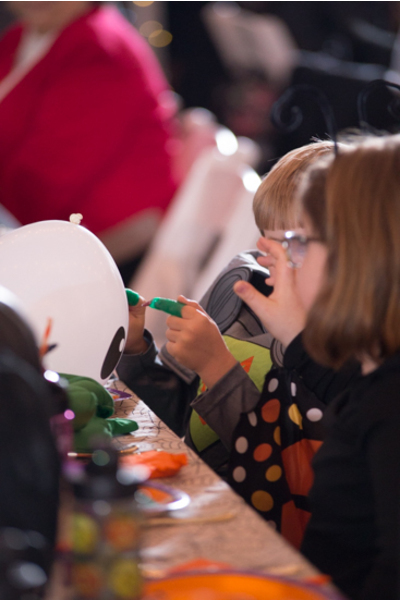 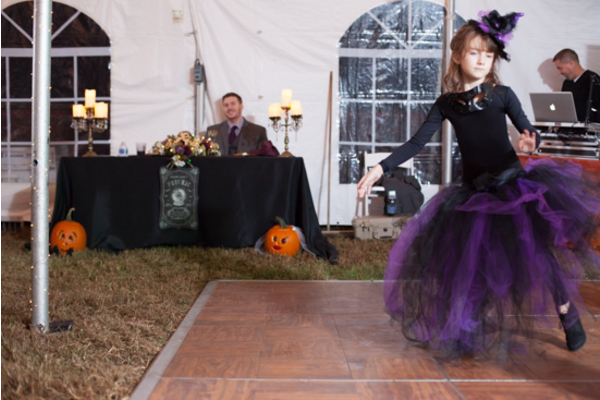 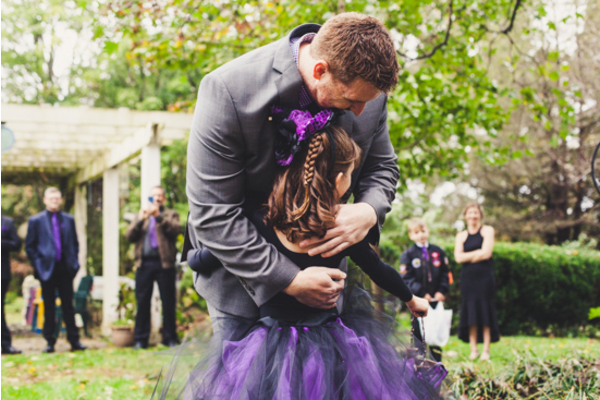 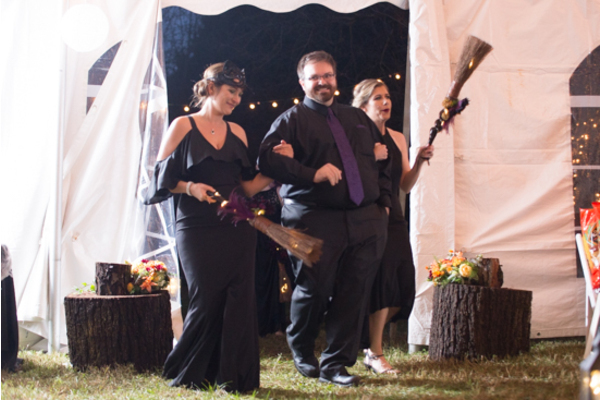 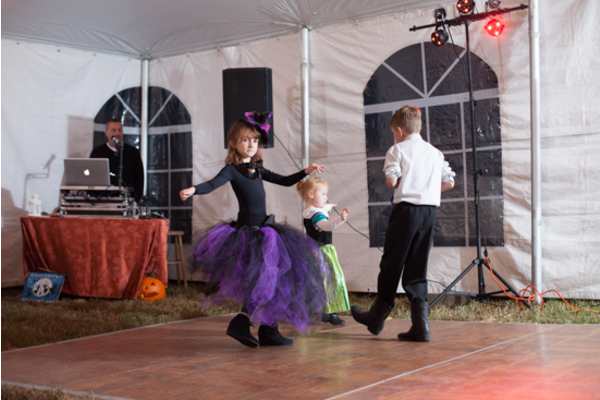 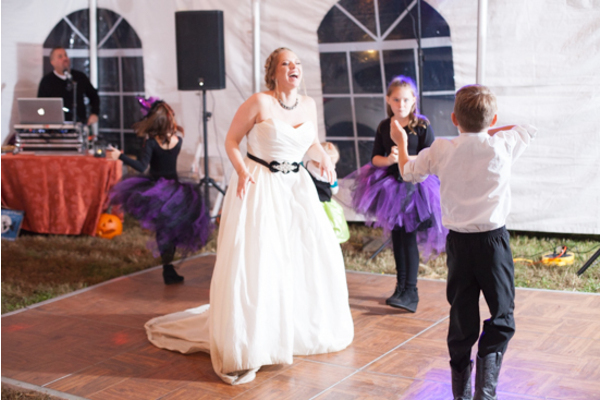 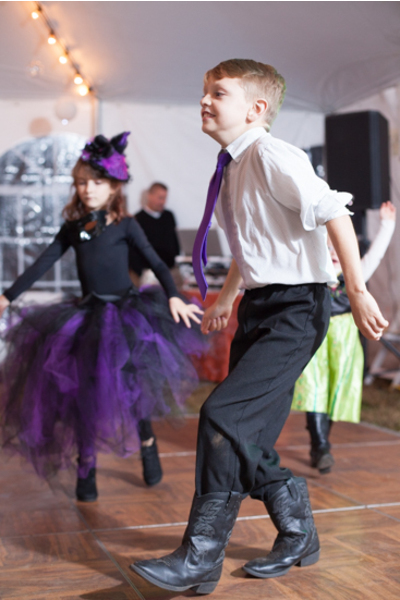 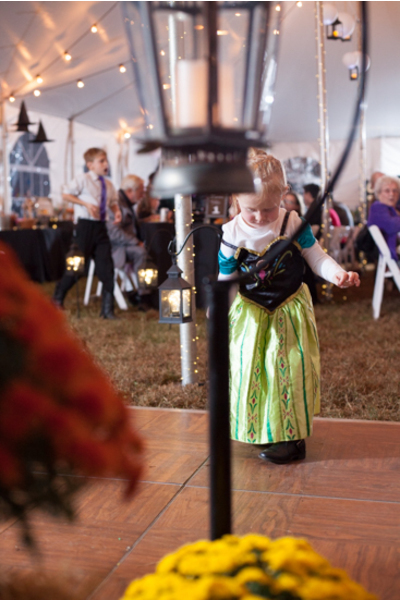 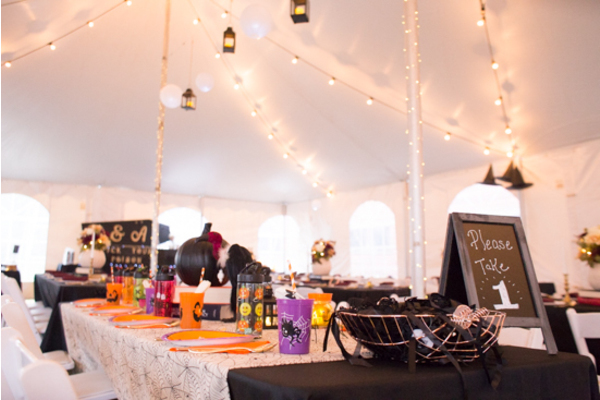 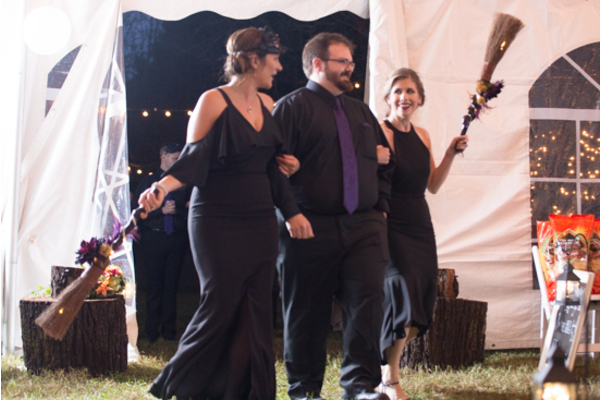 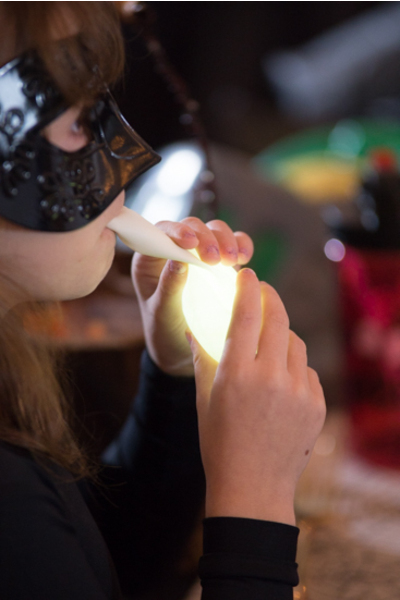 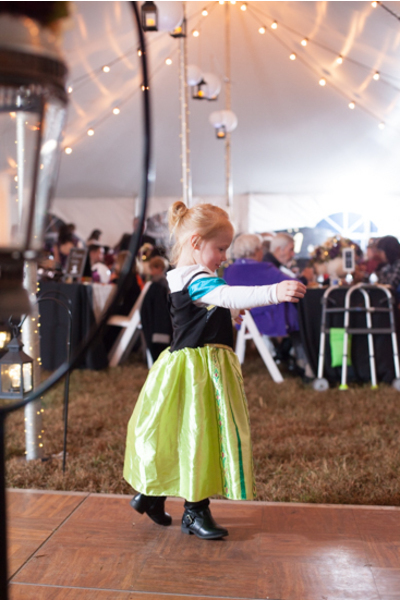 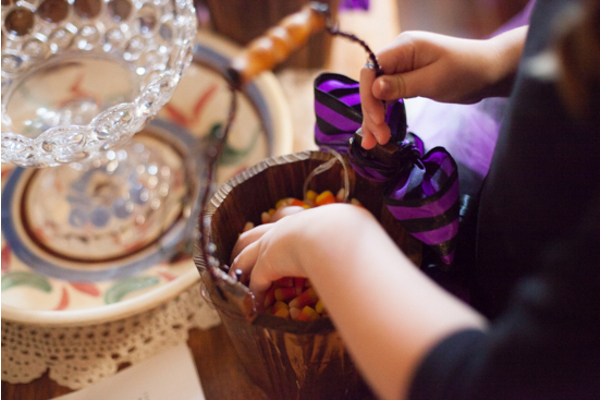 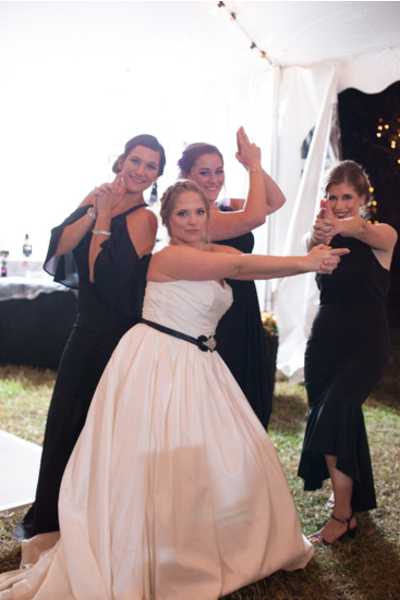 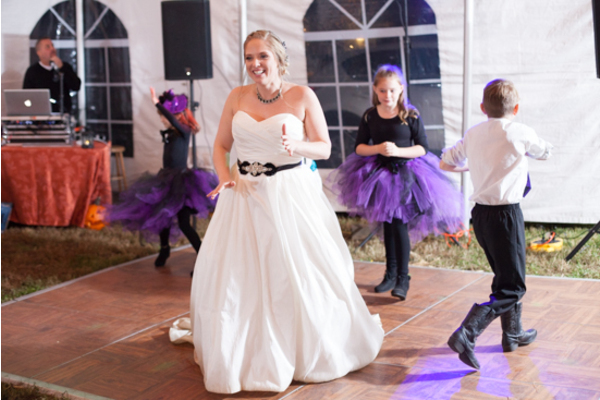 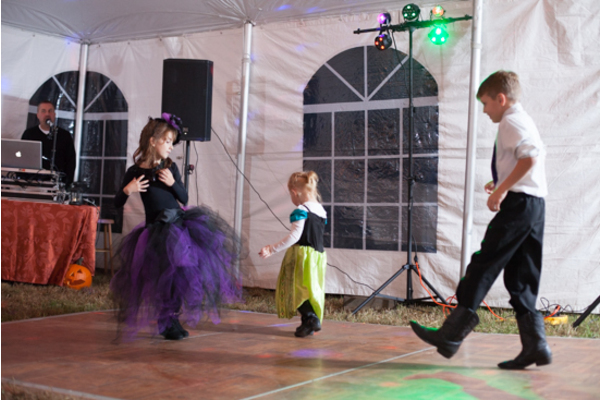 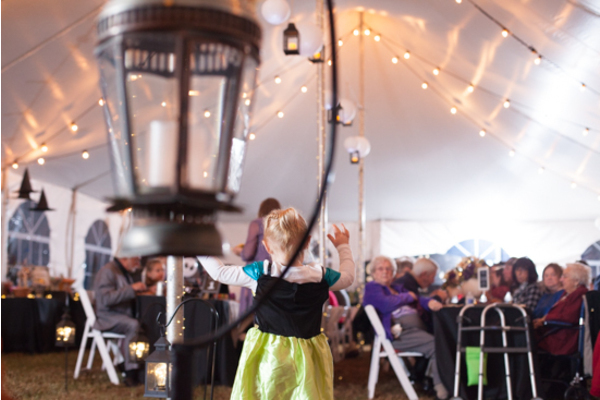 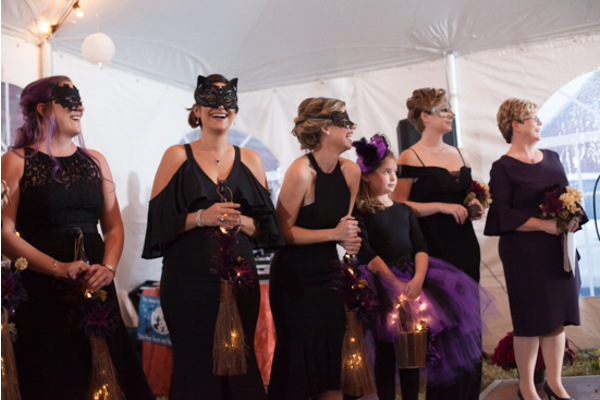 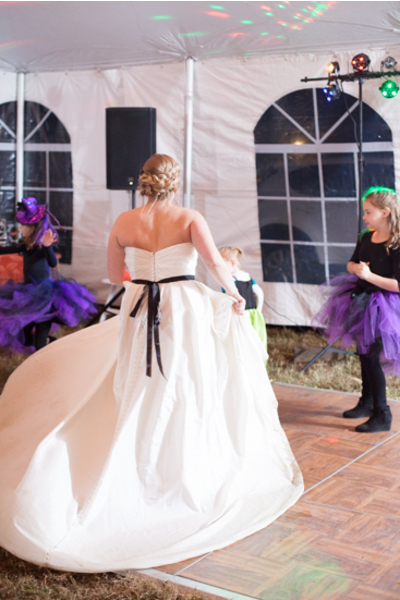 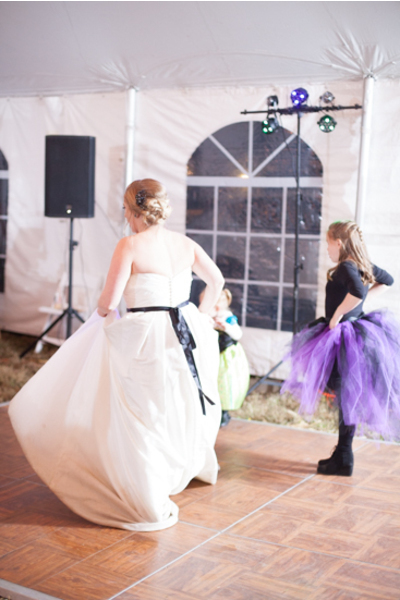 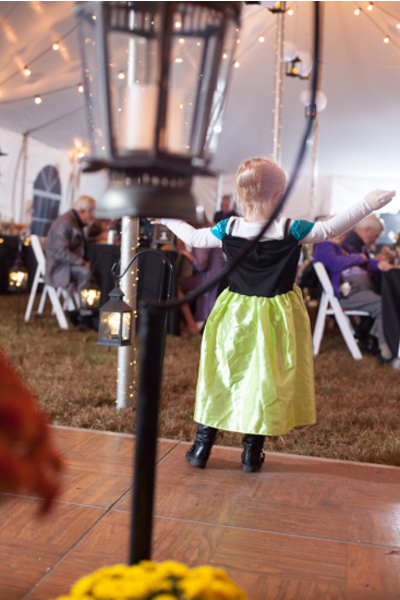 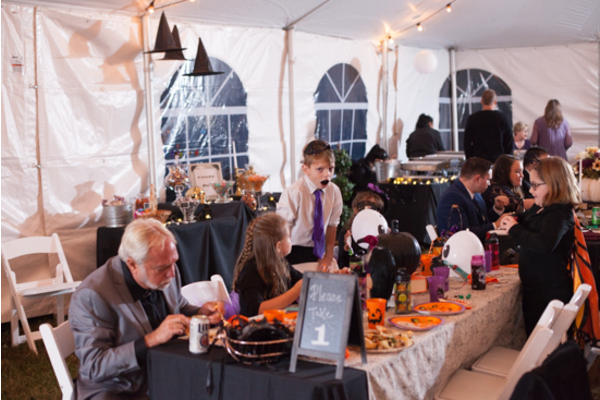 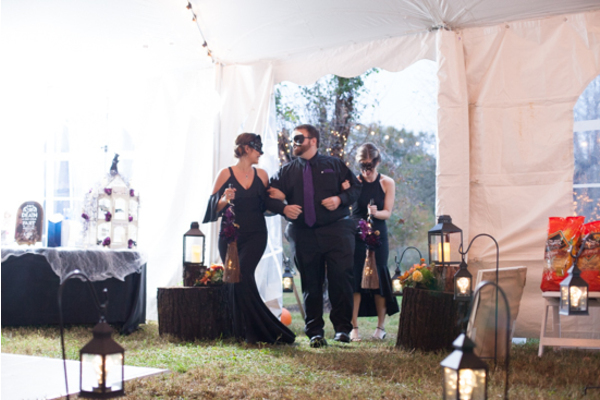 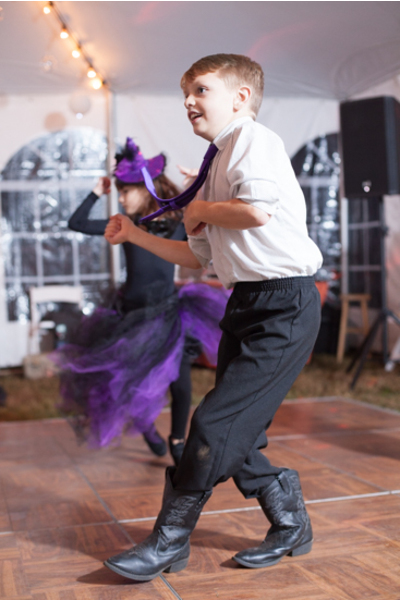 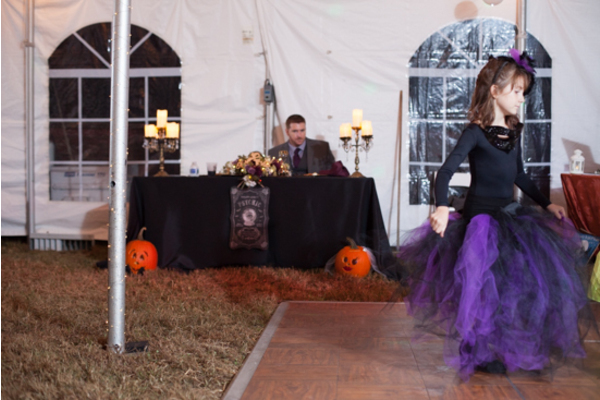 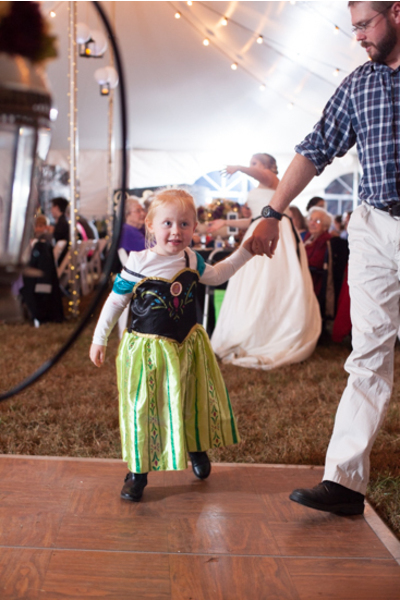 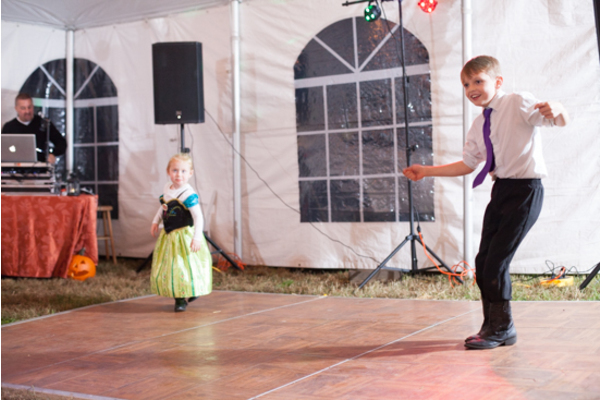 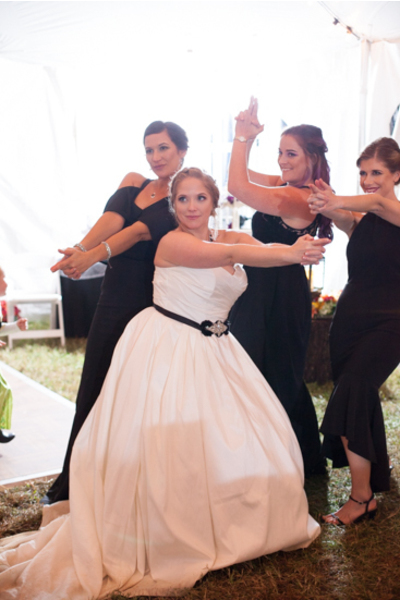 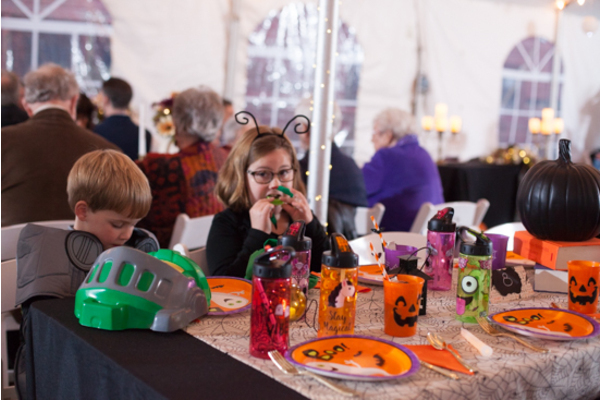 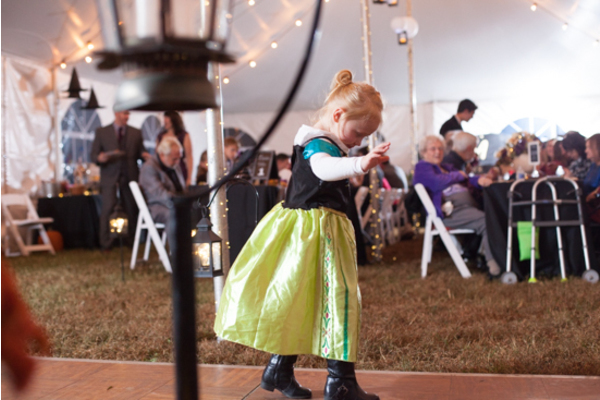 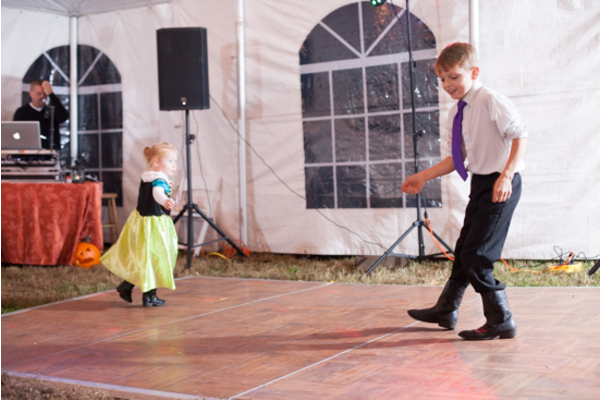 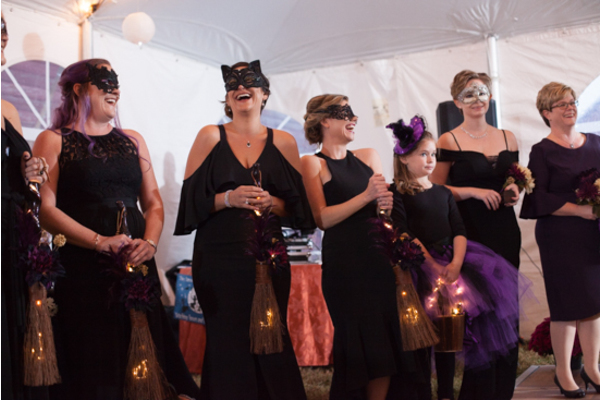 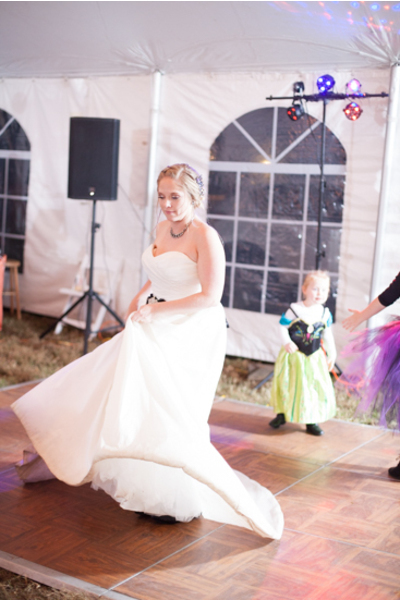 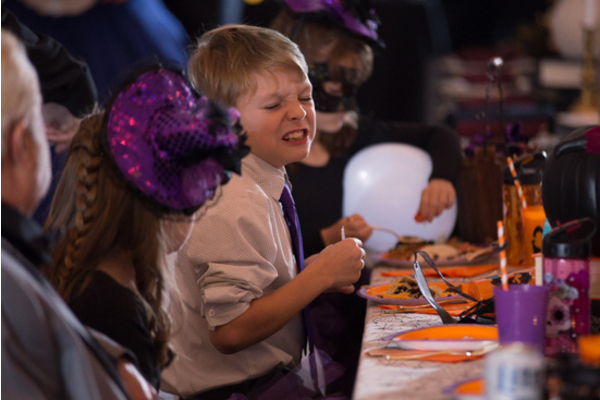 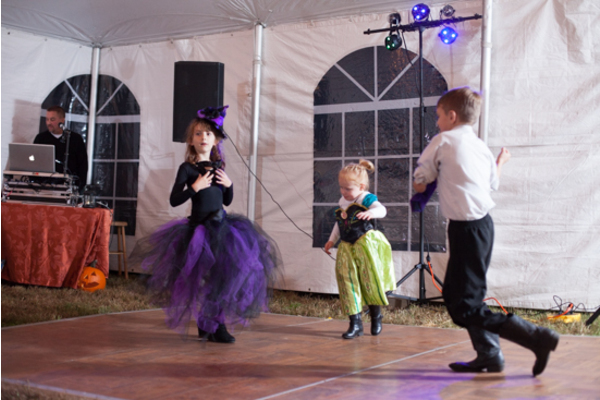 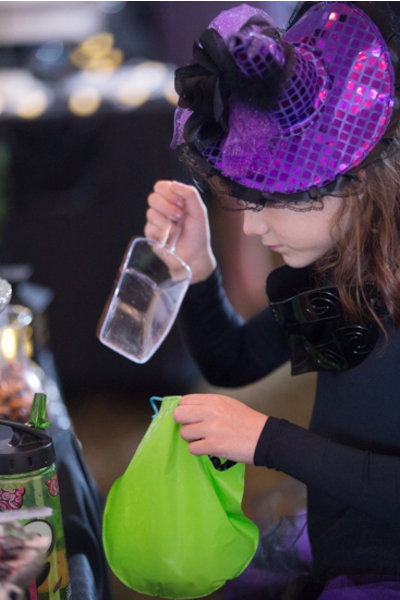 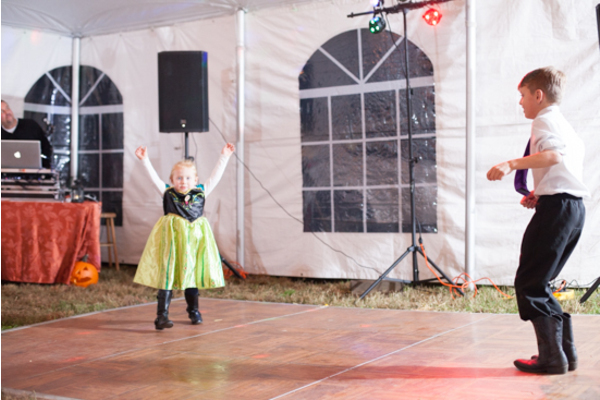 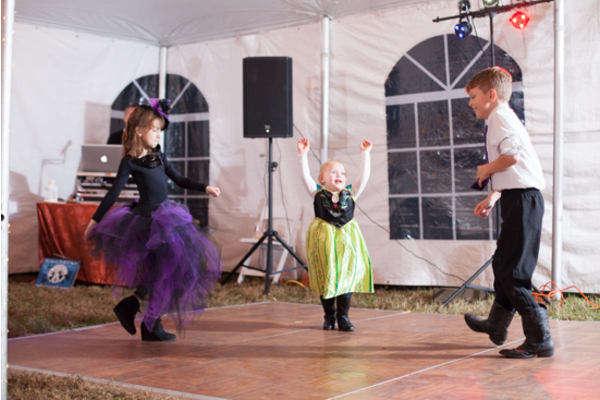 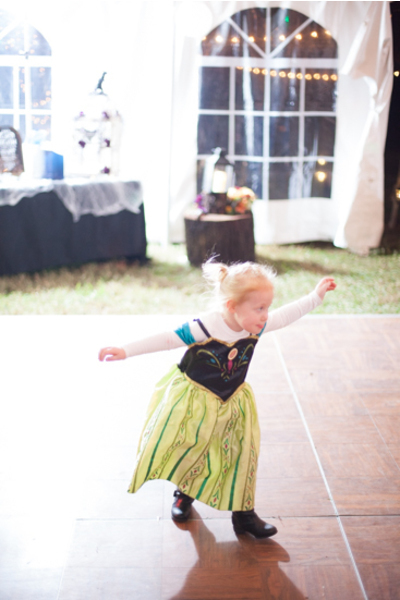 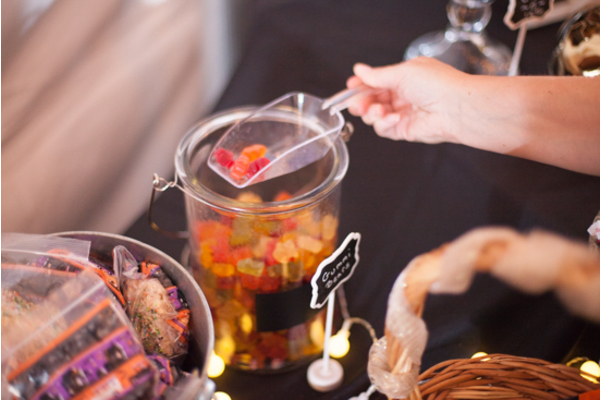 They truly captured everything about Halloween into one fun wedding celebration! 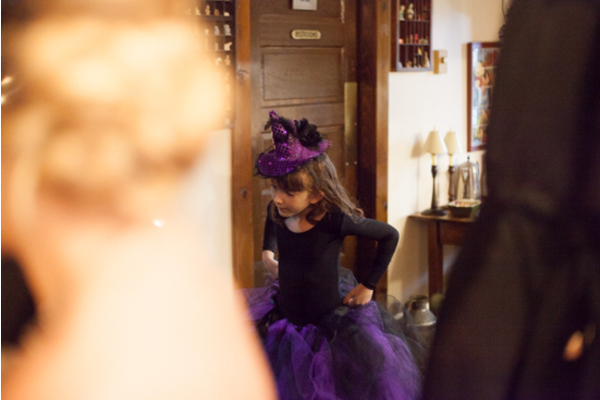 Additionally, all the little ones dressed up in cute costumes. 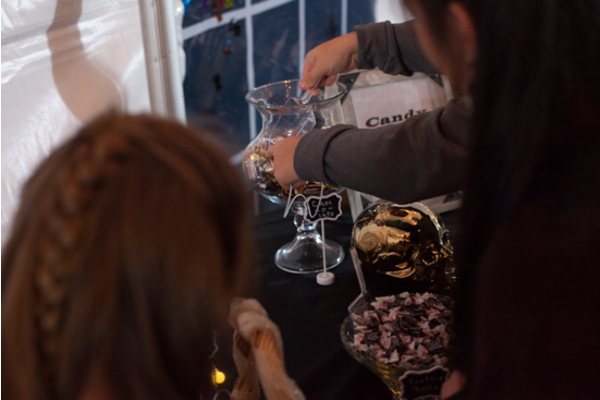 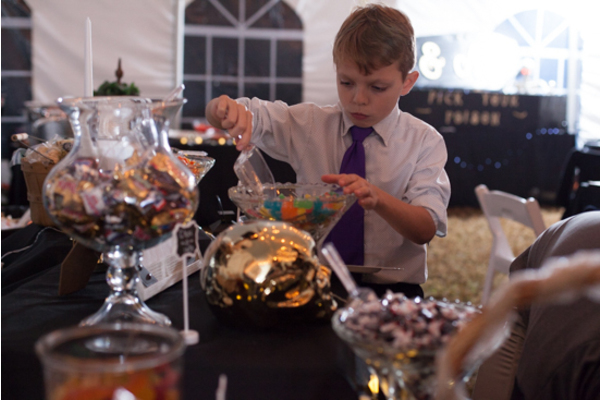 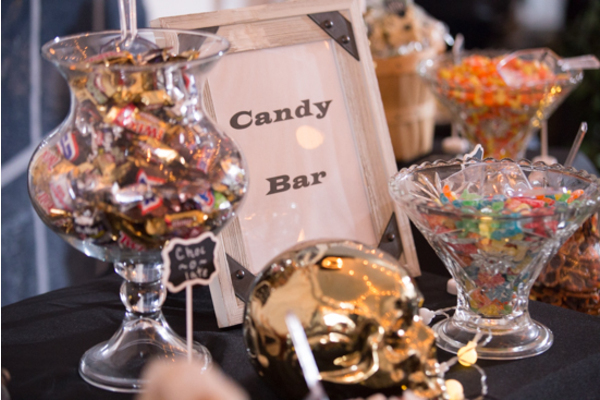 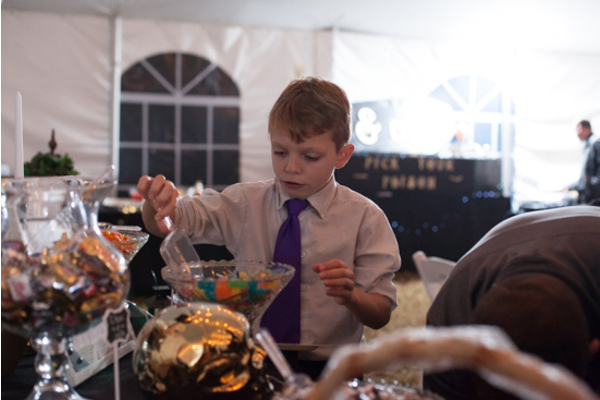 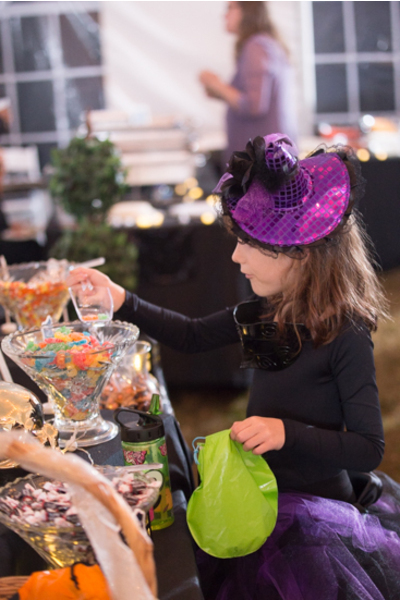 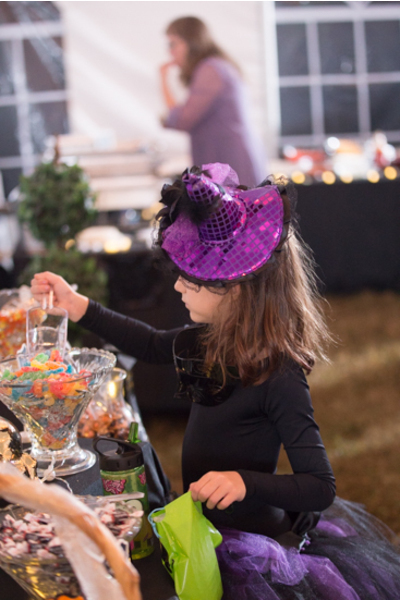 There was also a candy bar for the kids to indulge in as well! 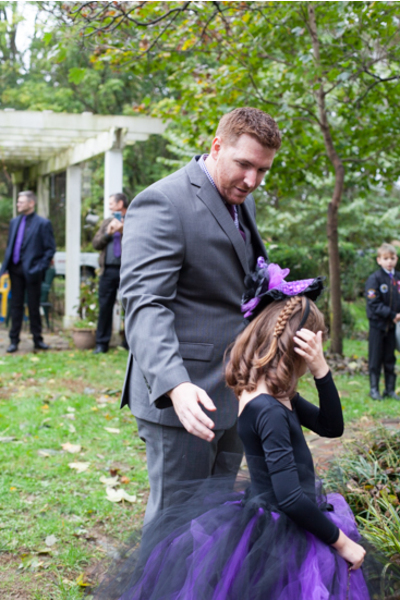 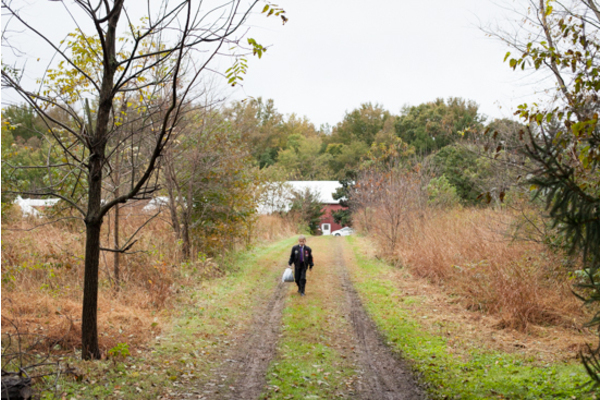 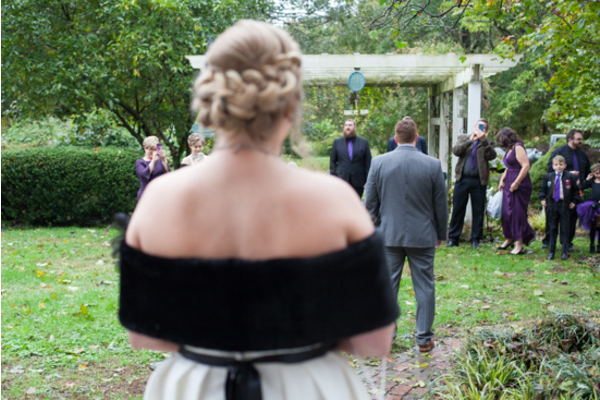 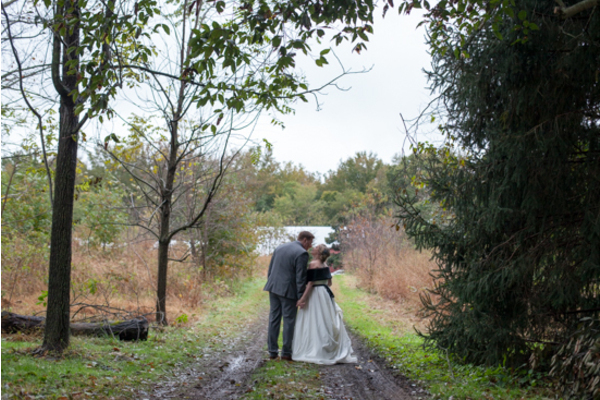 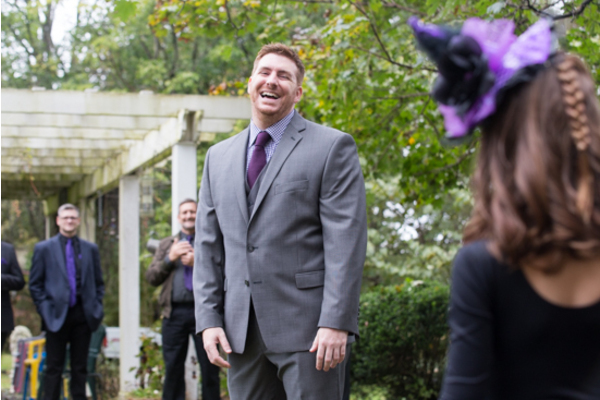 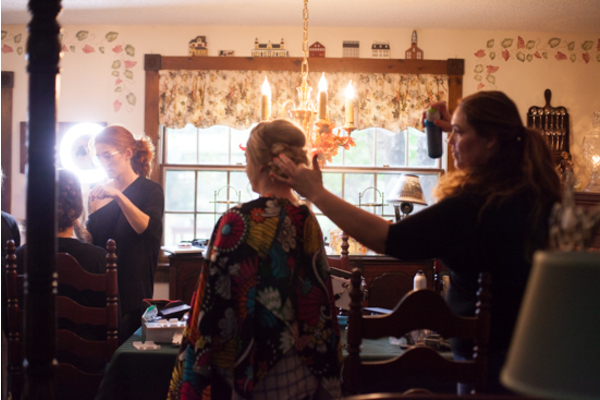 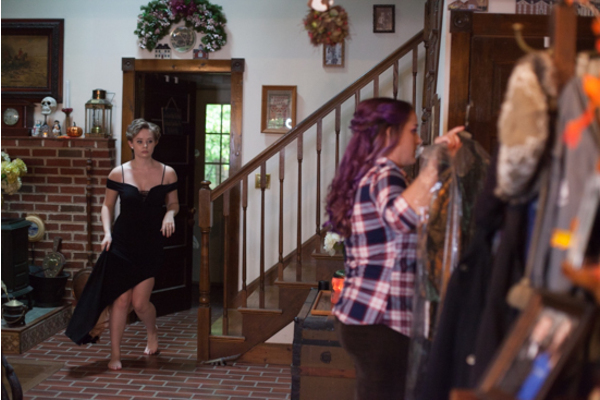 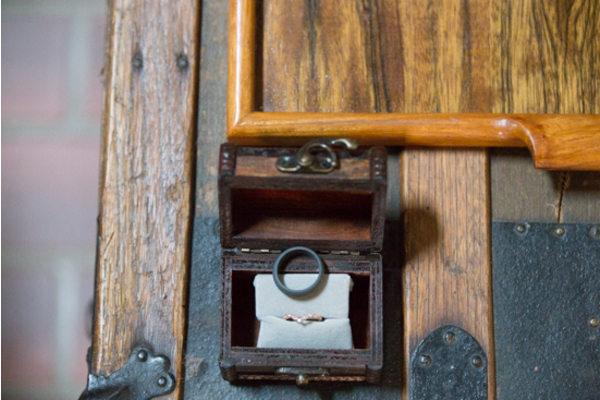 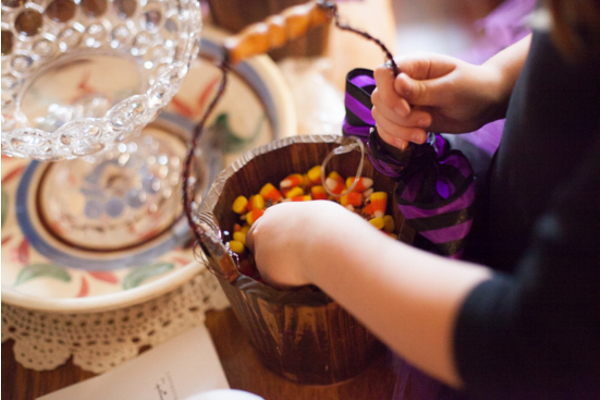 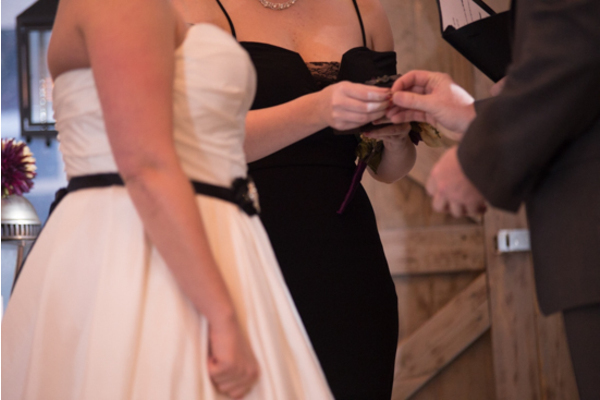 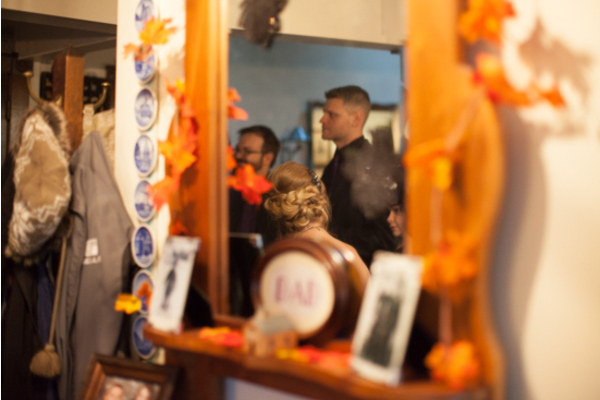 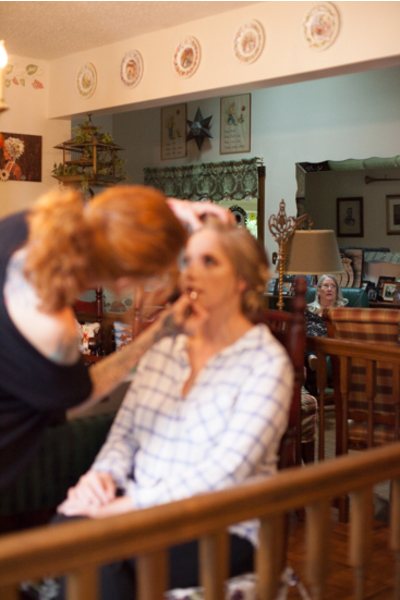 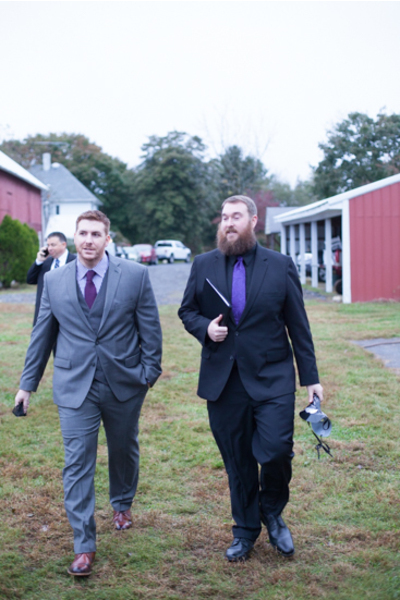 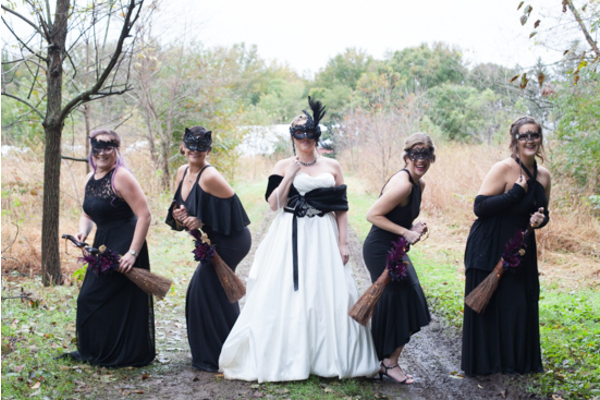 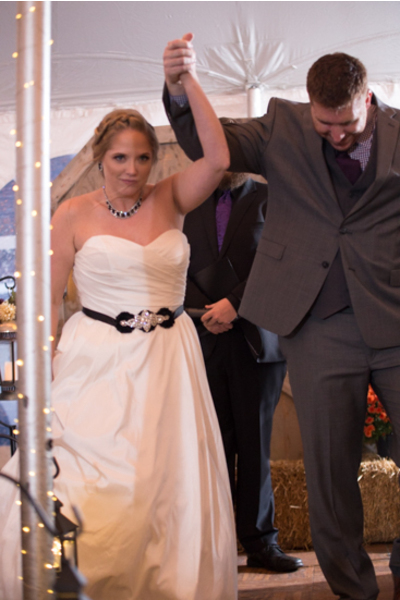 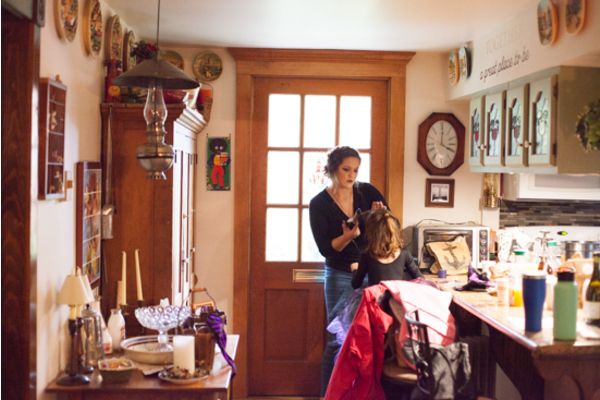 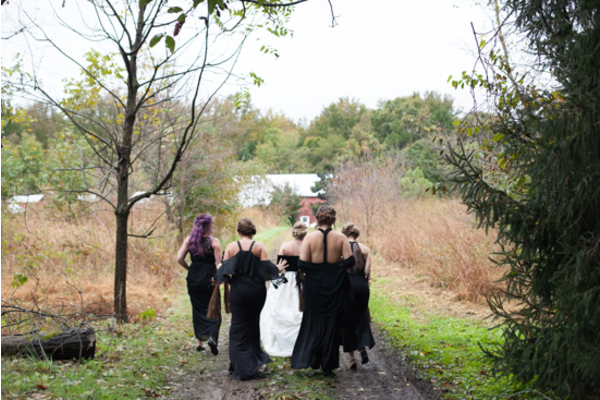 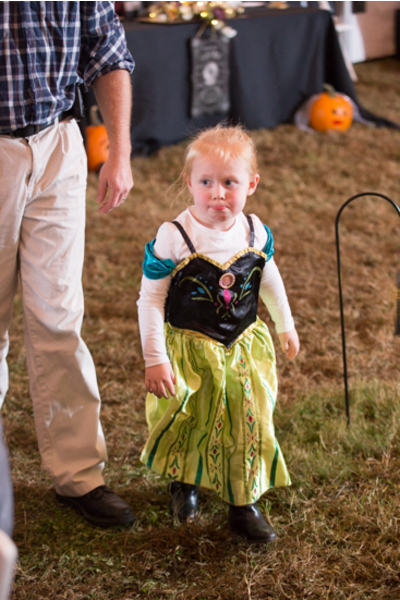 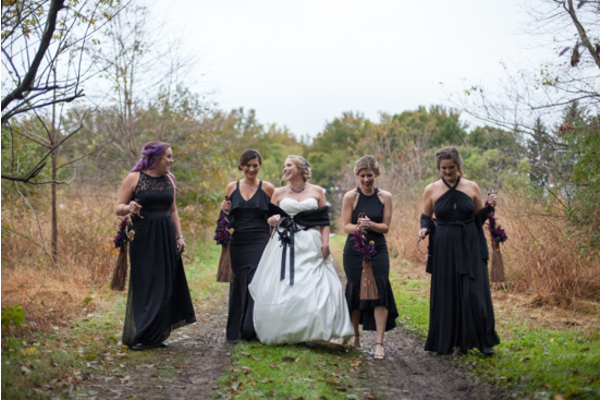 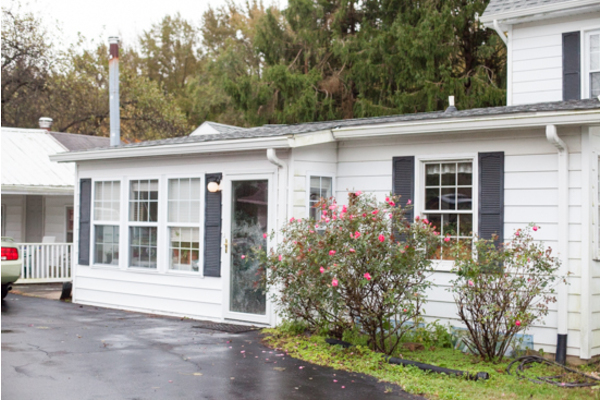 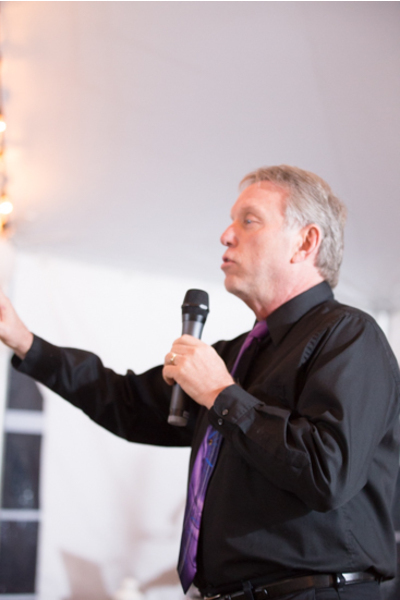 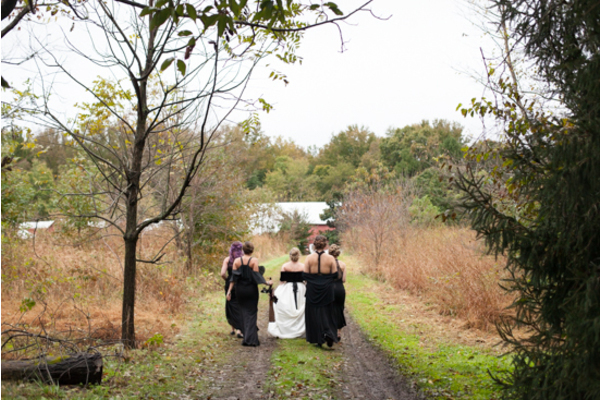 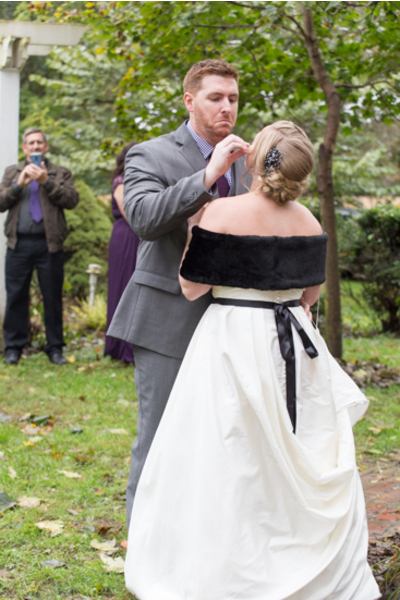 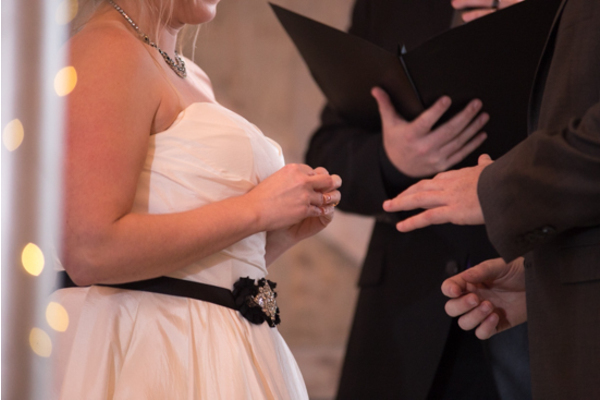 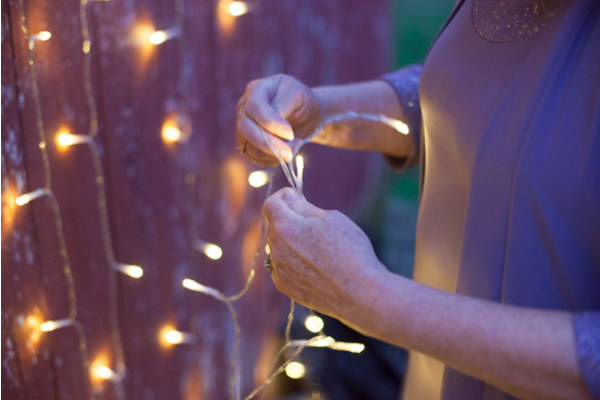 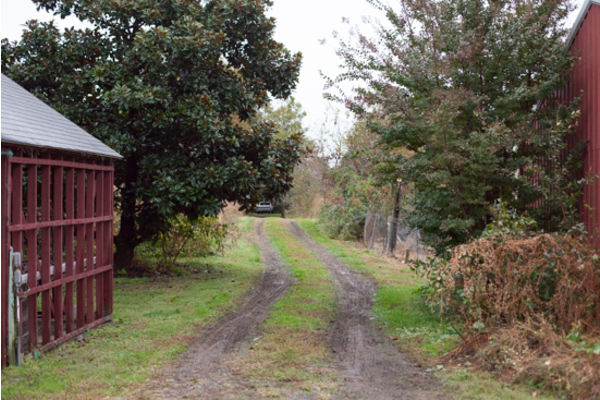 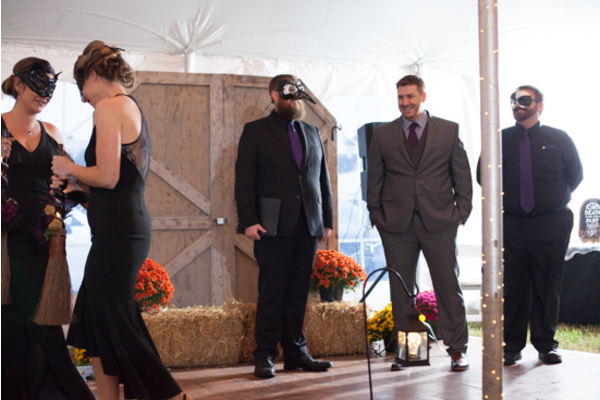 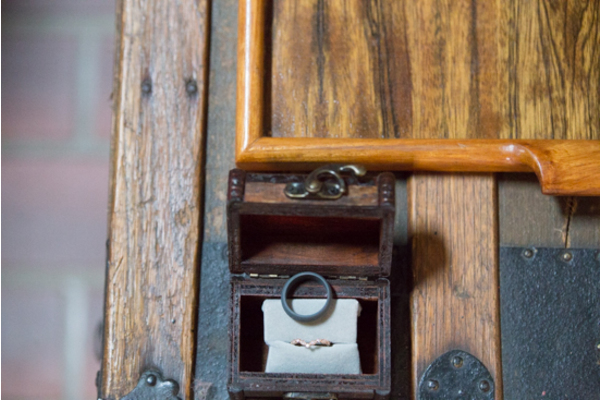 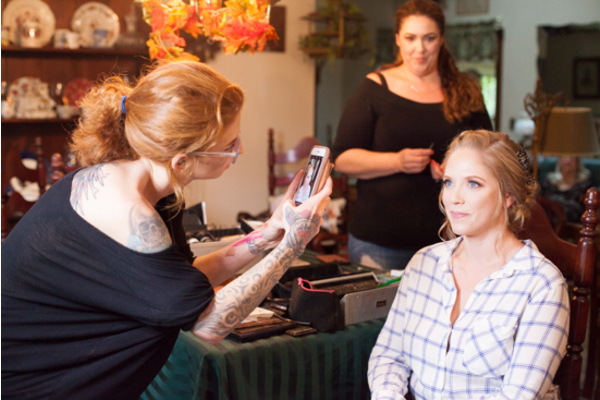 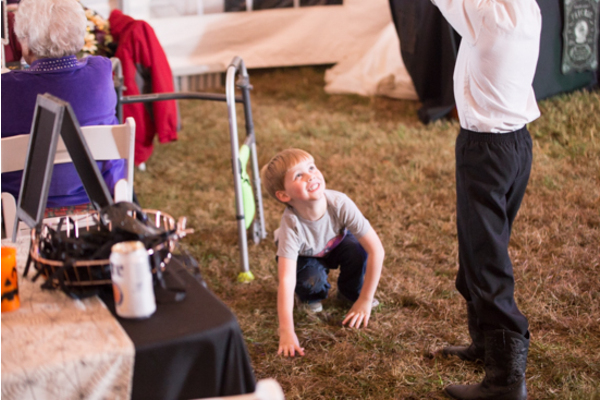 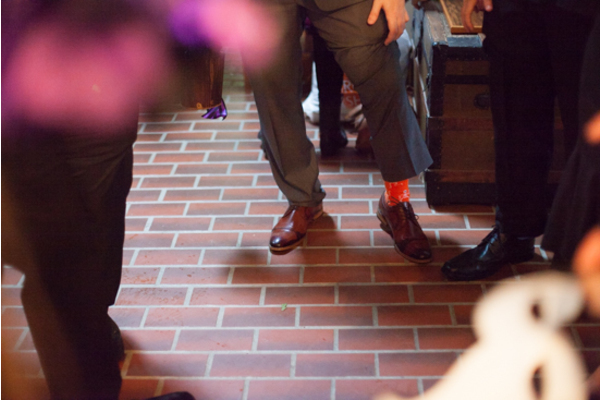 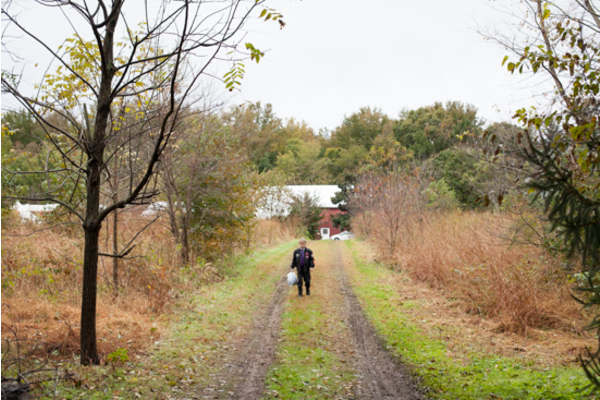 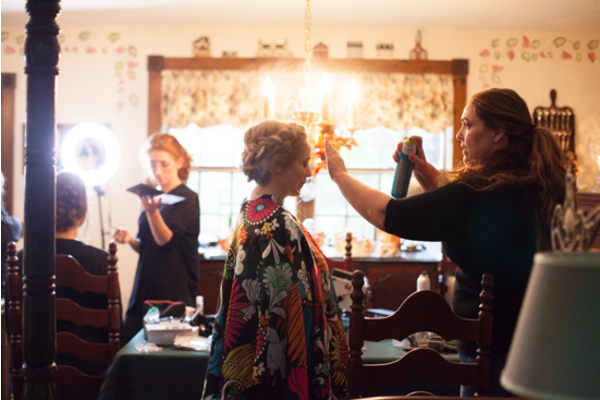 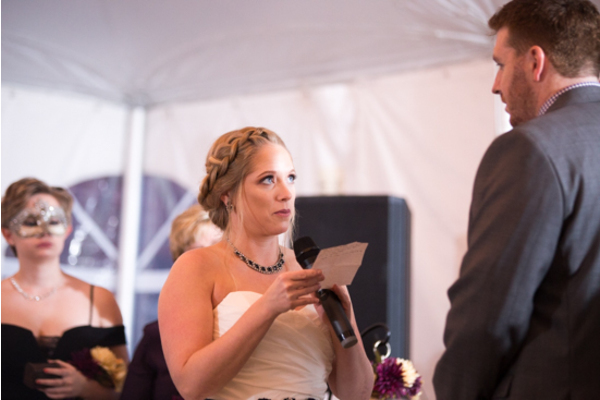 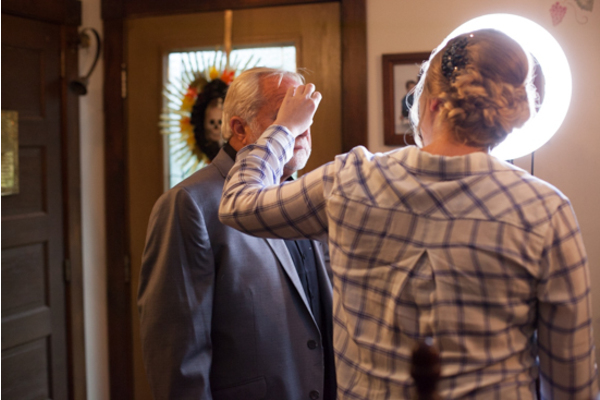 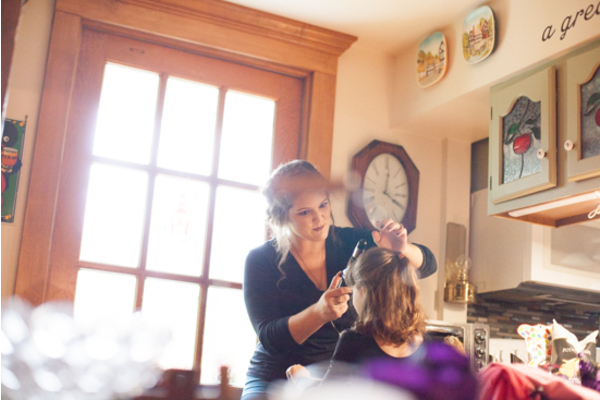 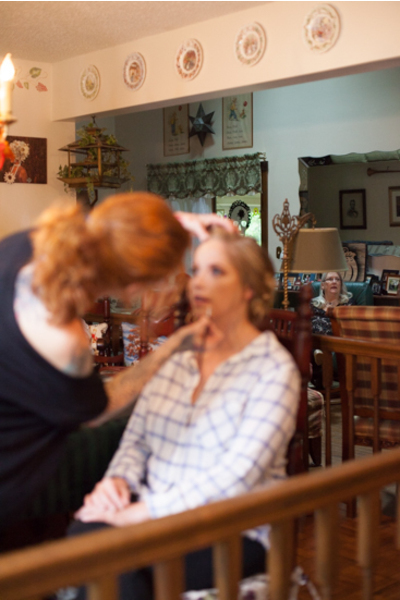 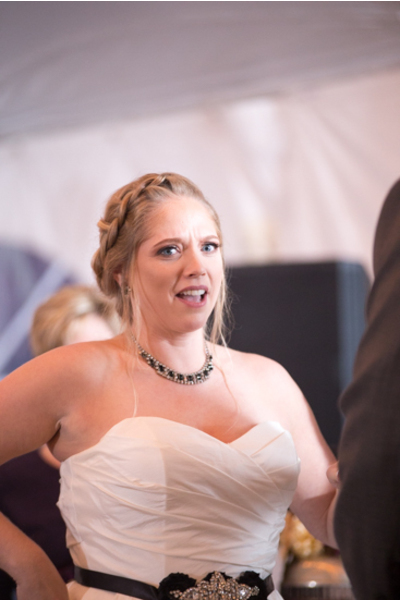 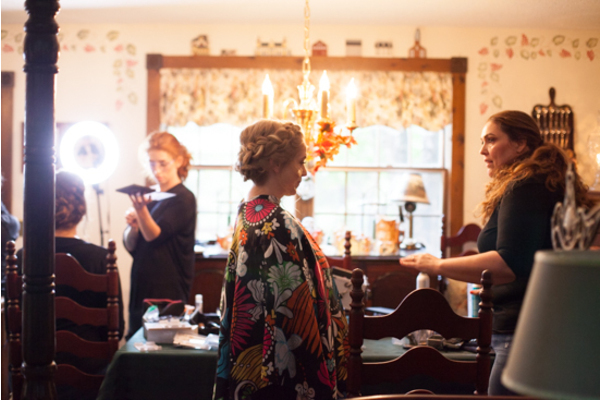 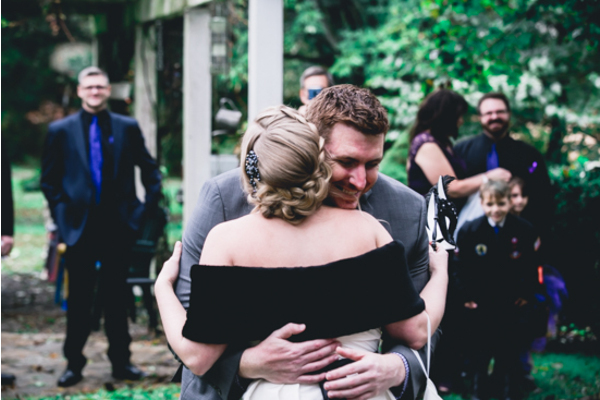 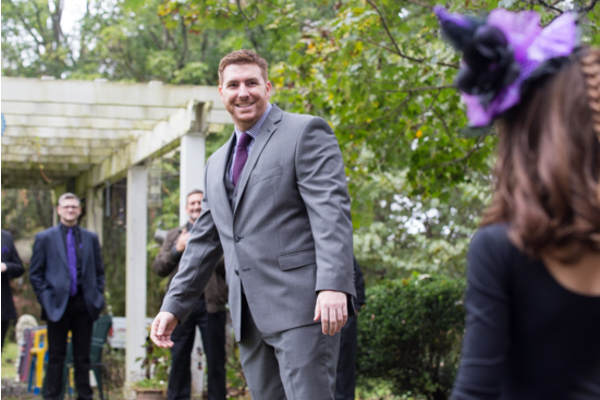 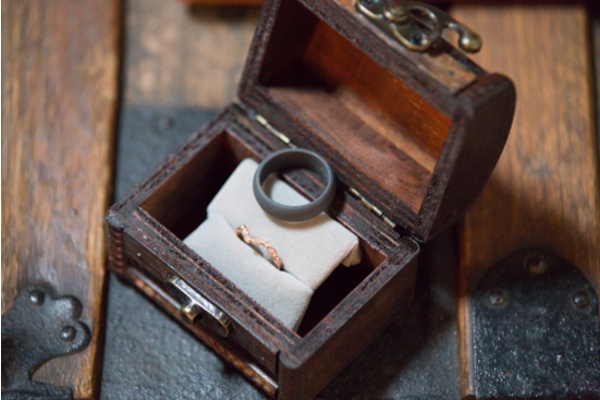 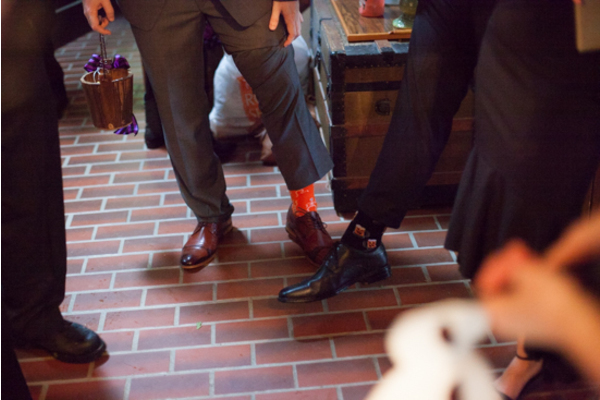 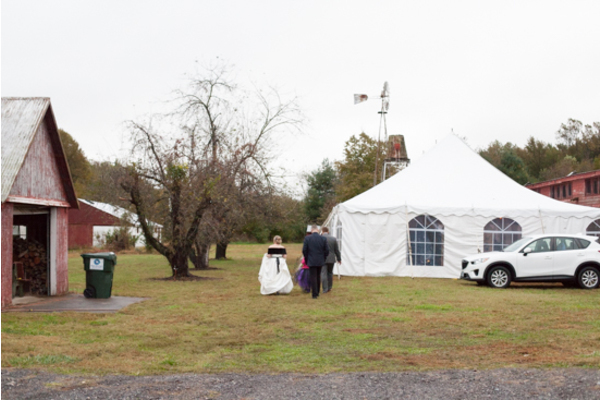 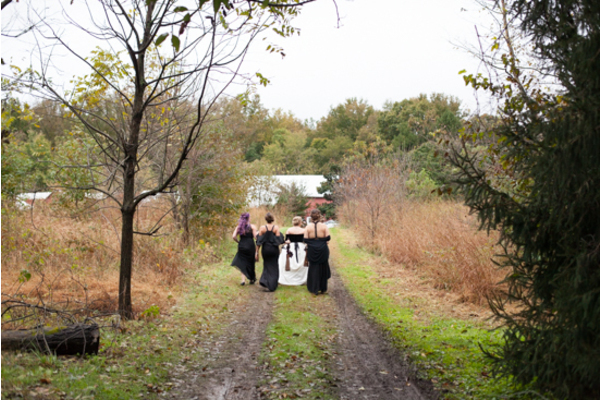 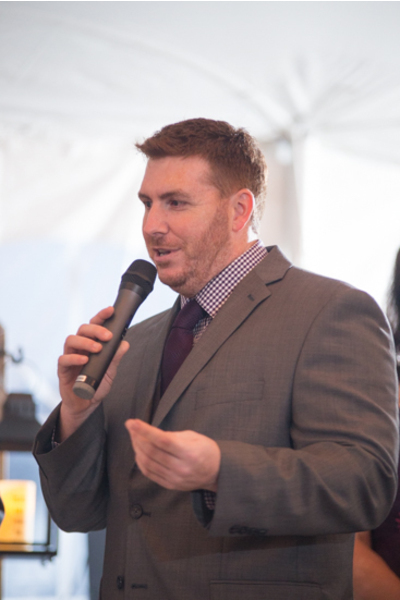 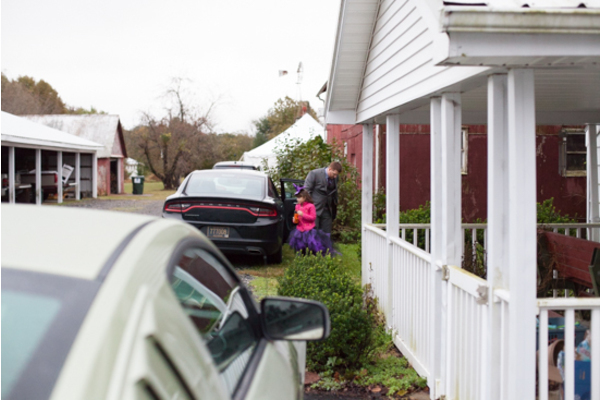 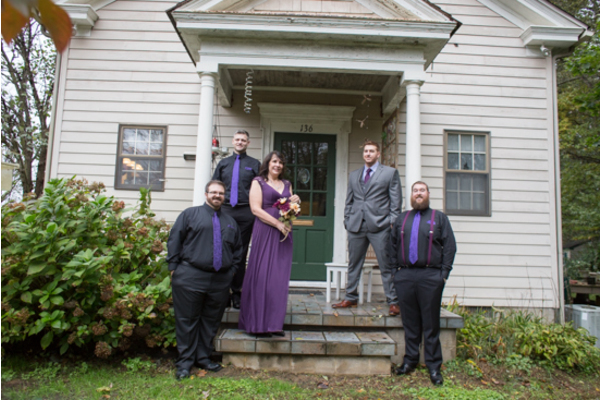 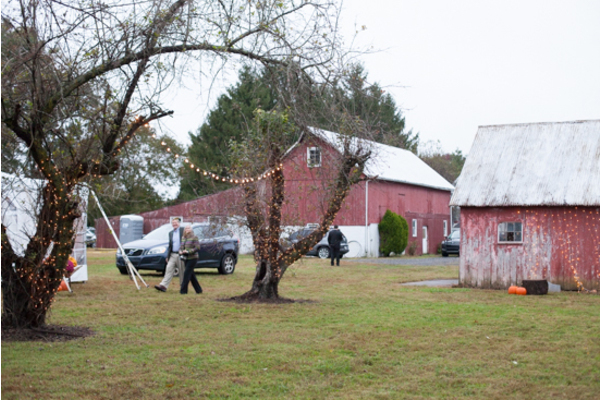 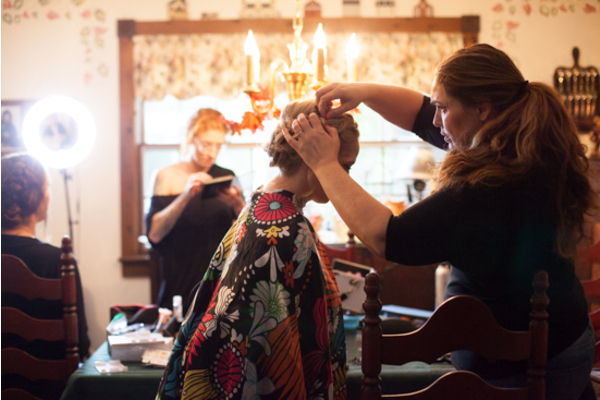 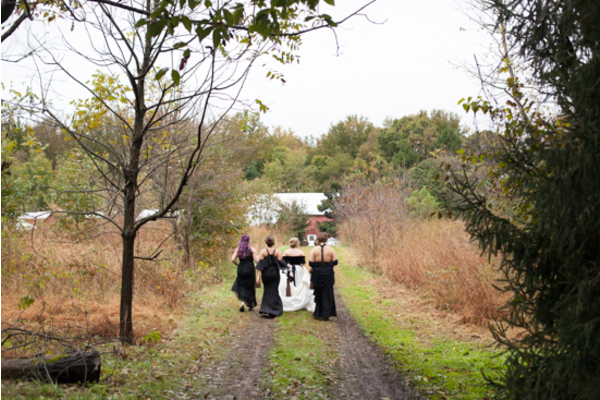 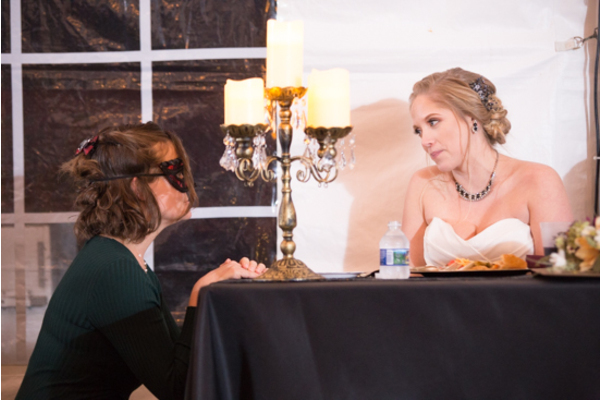 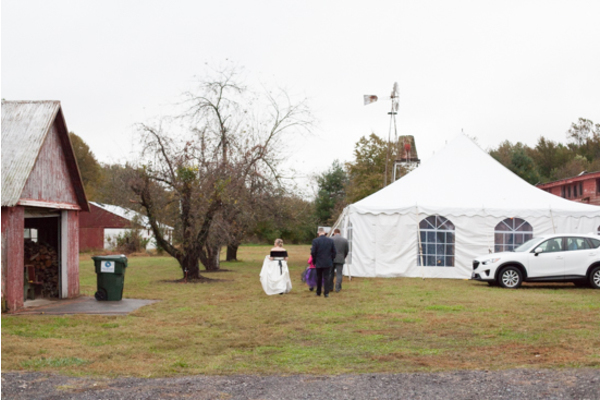 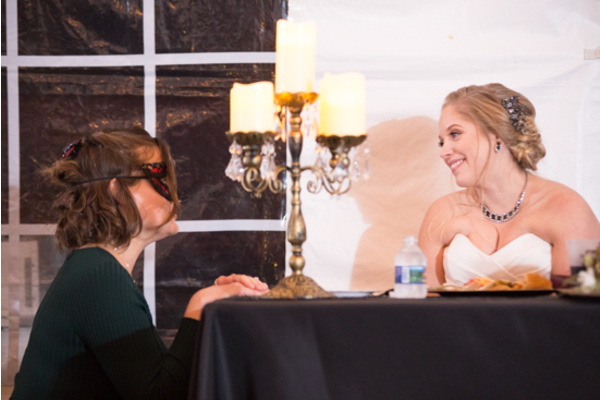 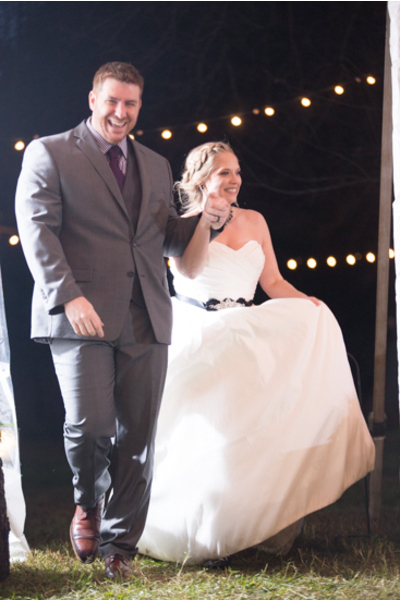 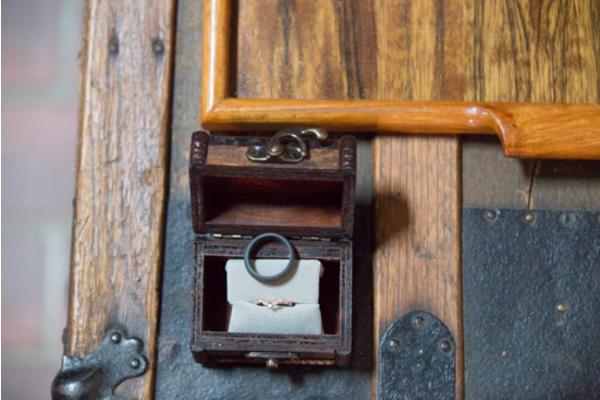 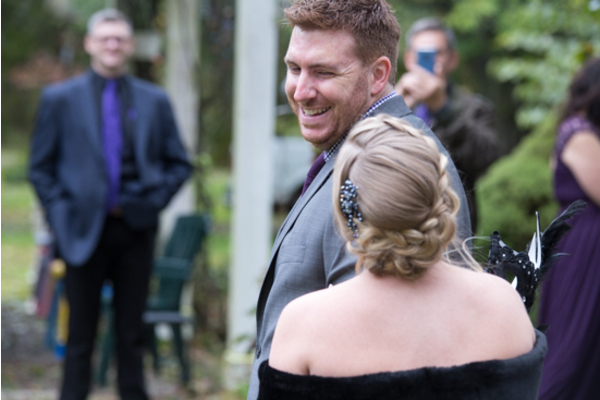 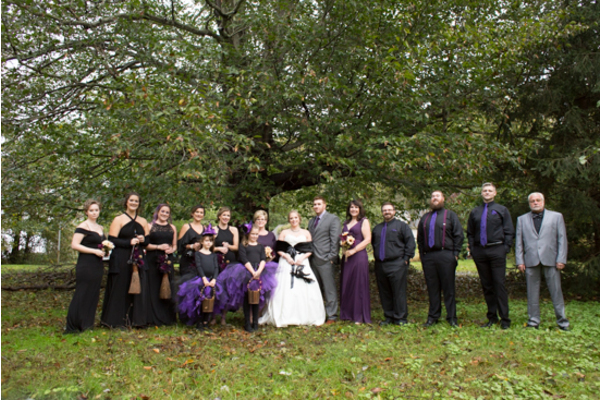 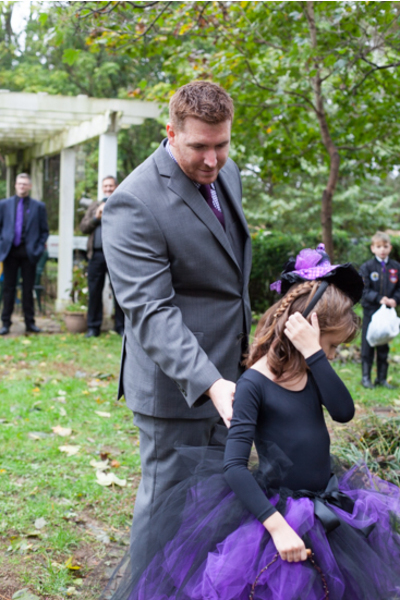 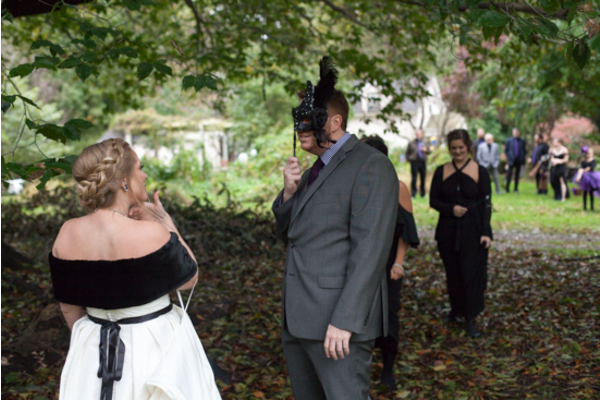 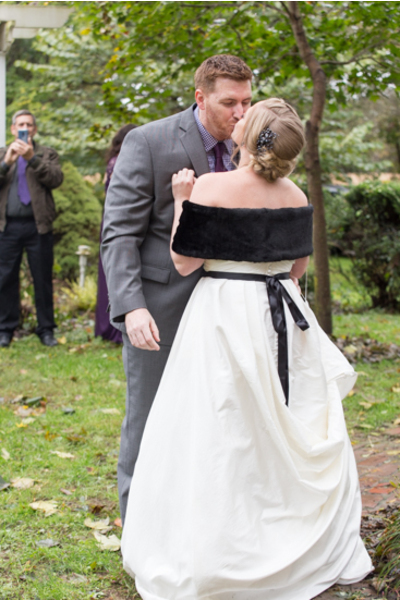 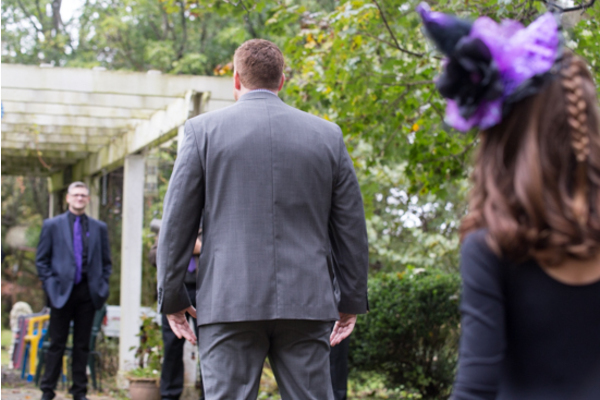 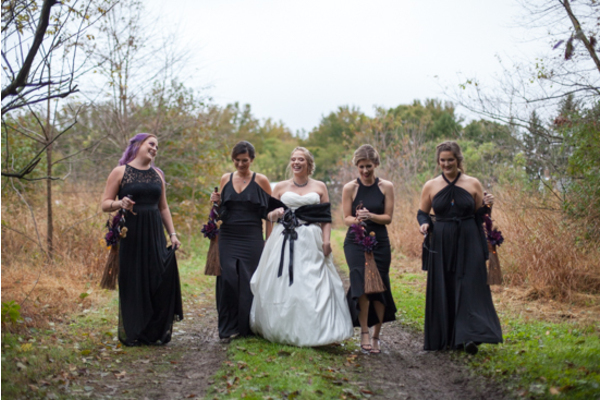 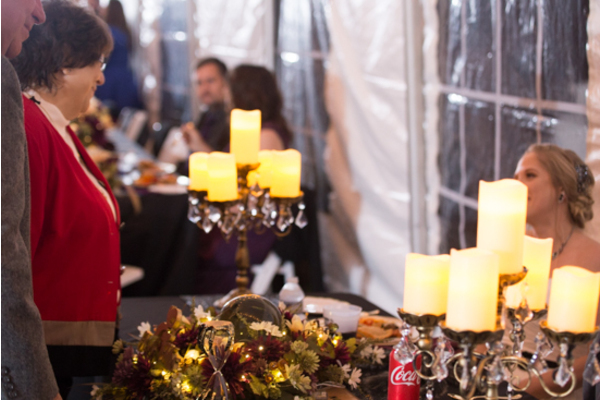 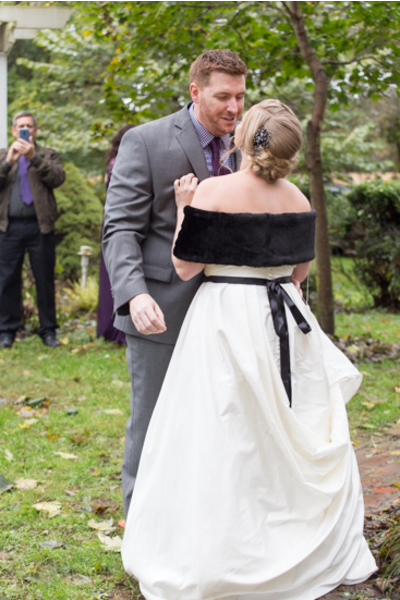 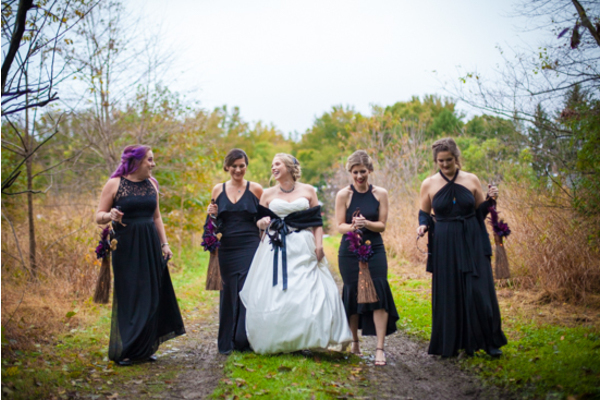 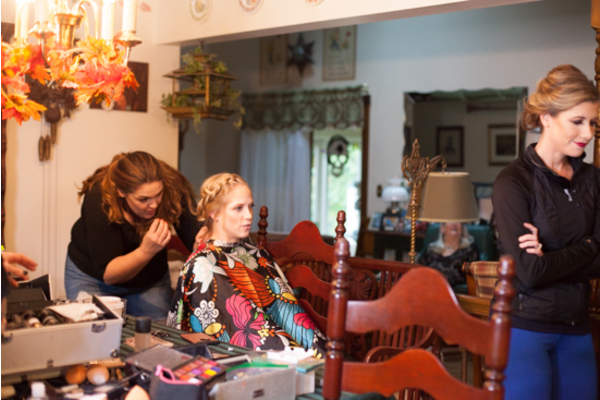 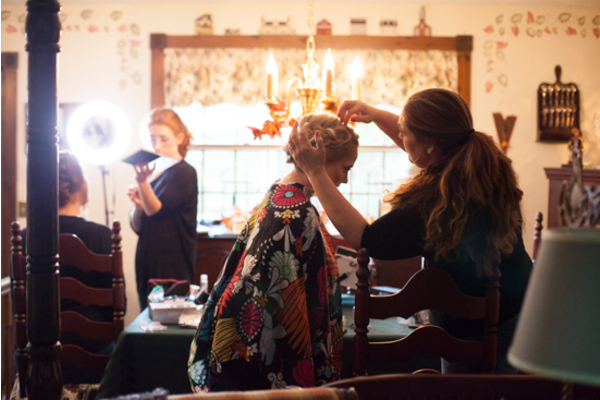 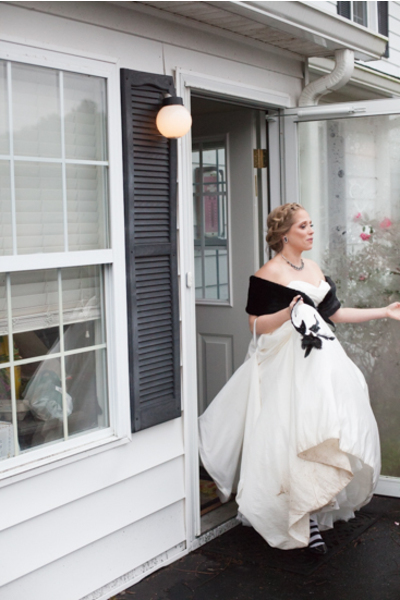 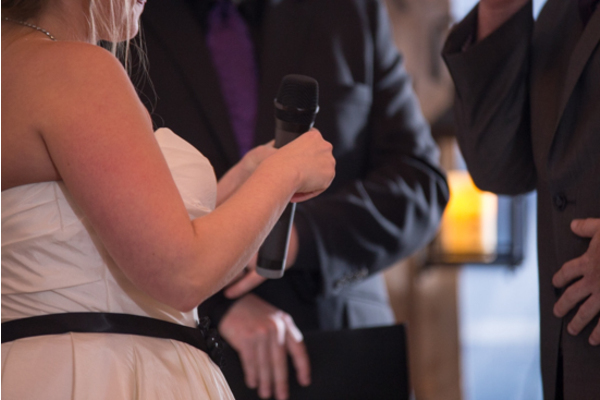 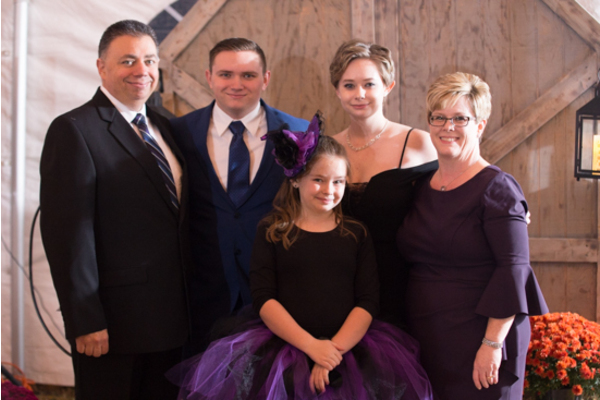 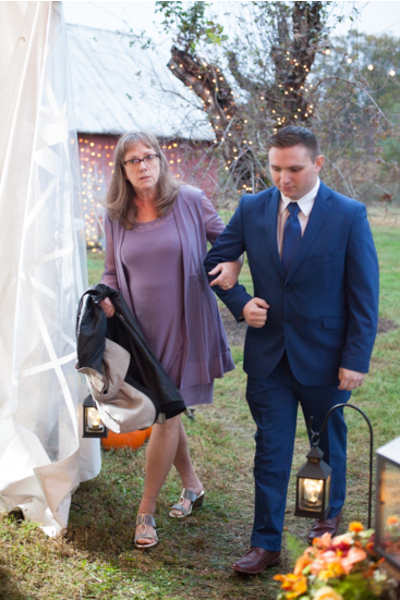 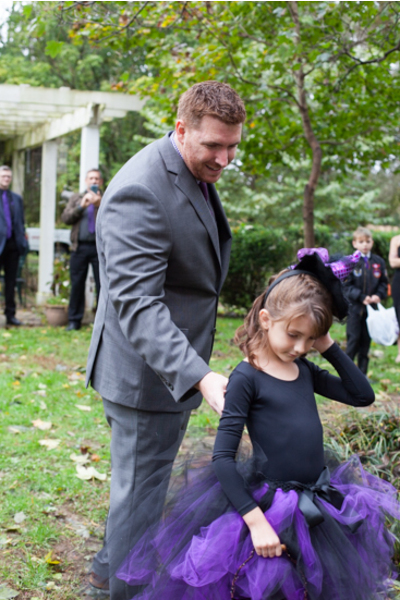 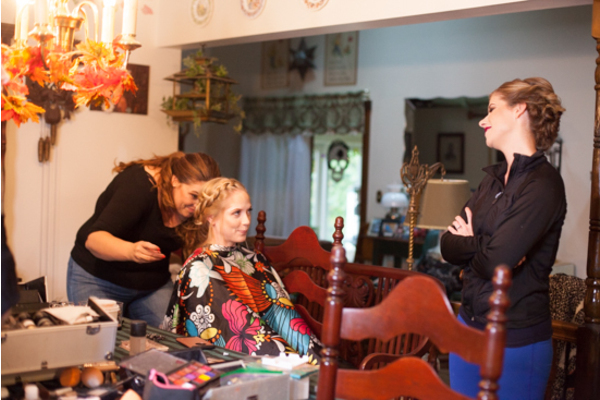 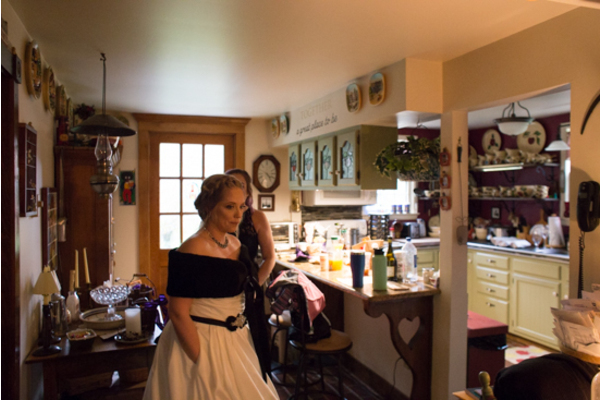 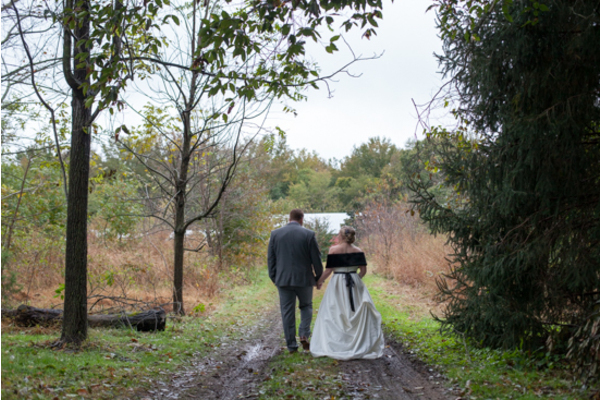 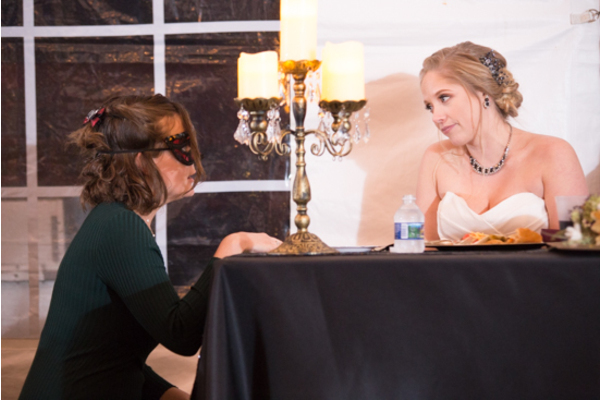 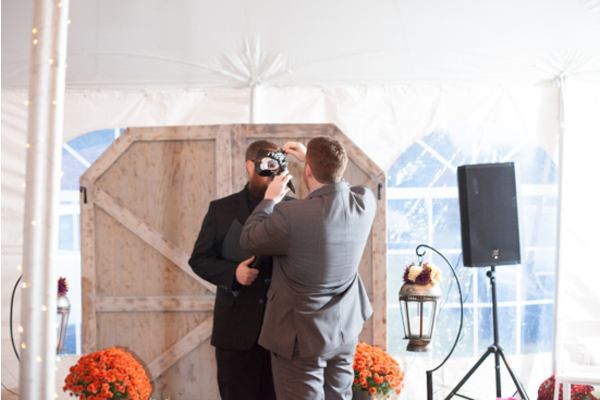 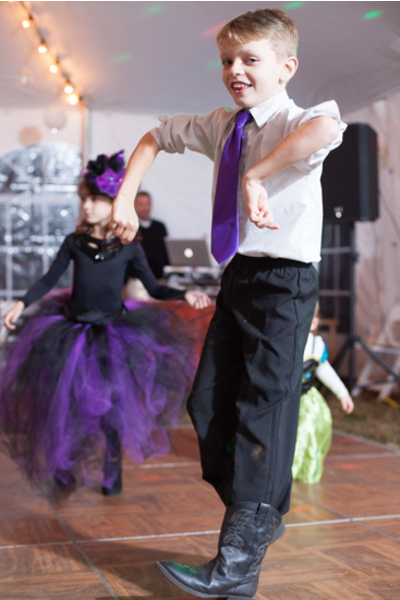 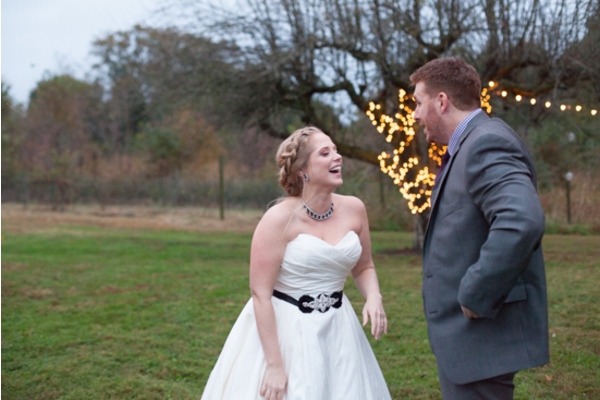 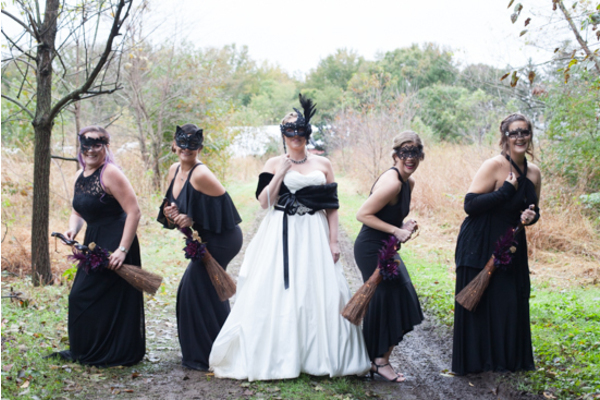 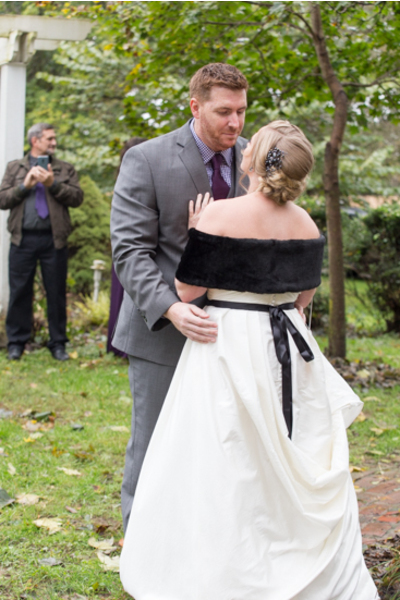 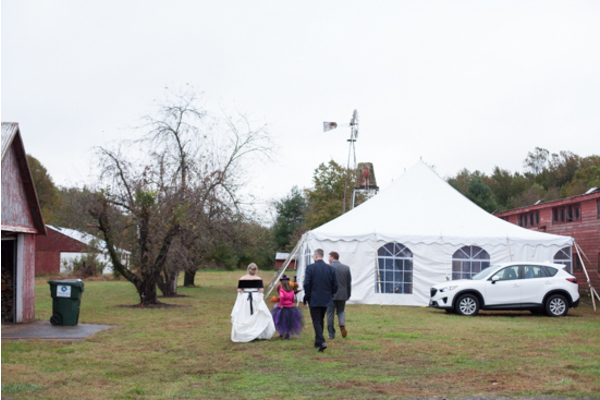 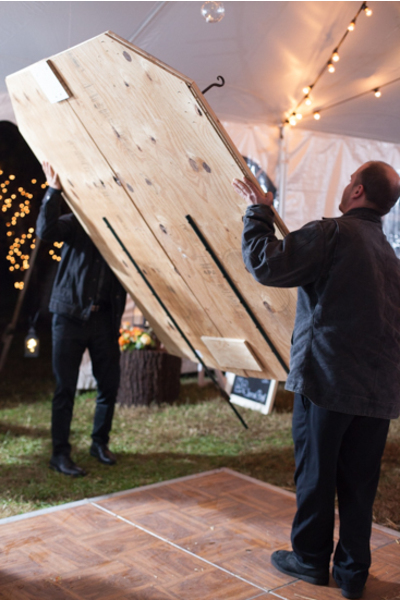 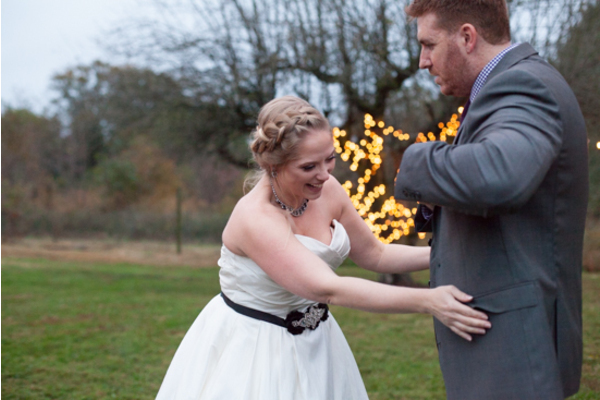 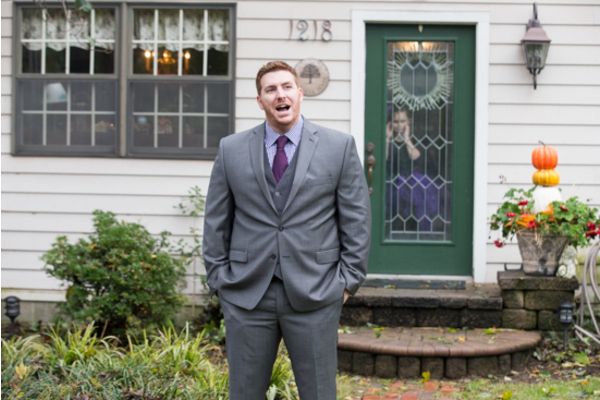 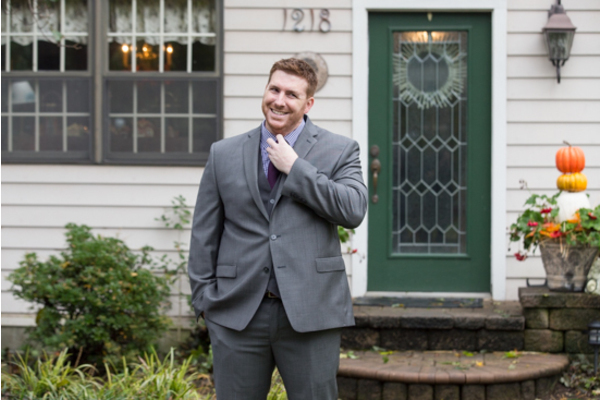 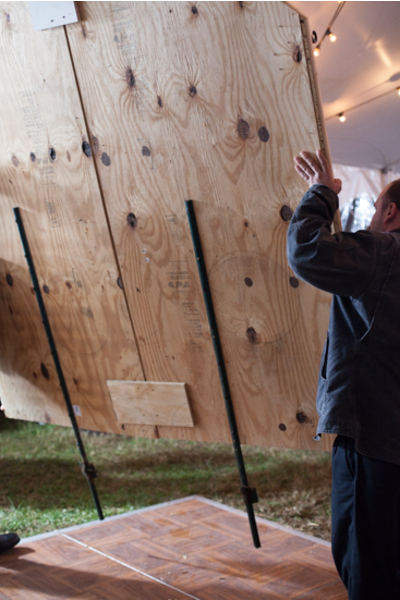 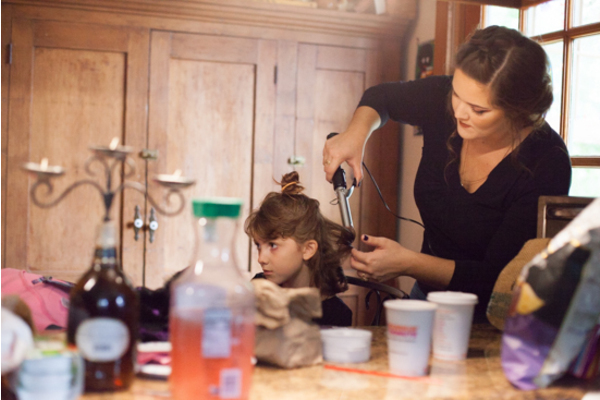 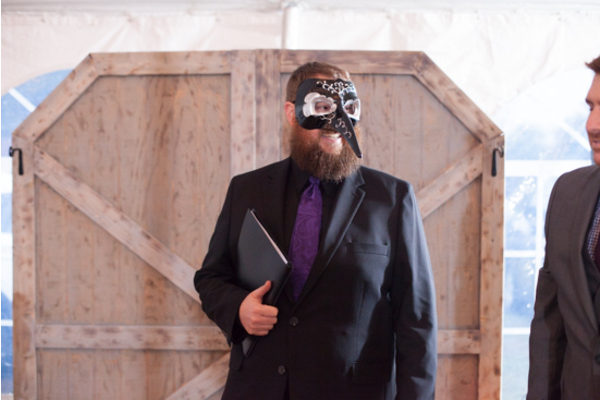 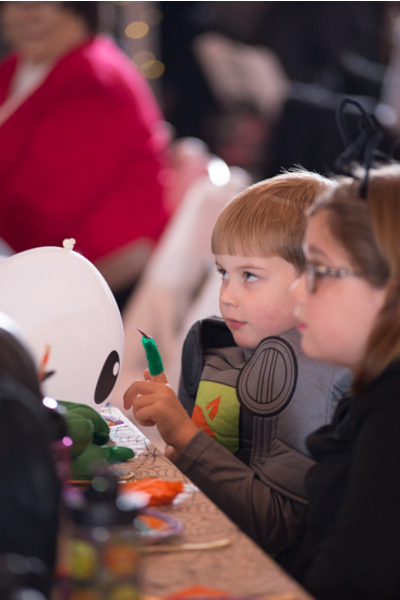 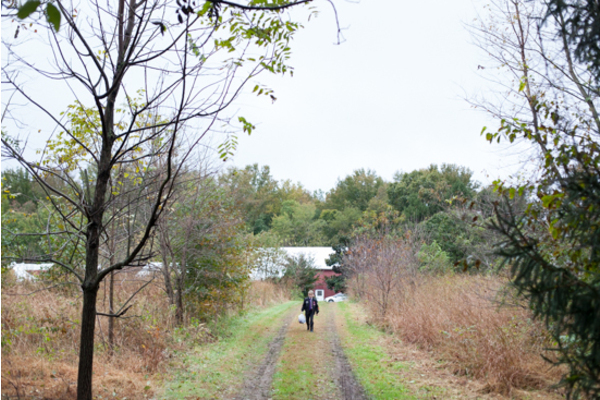 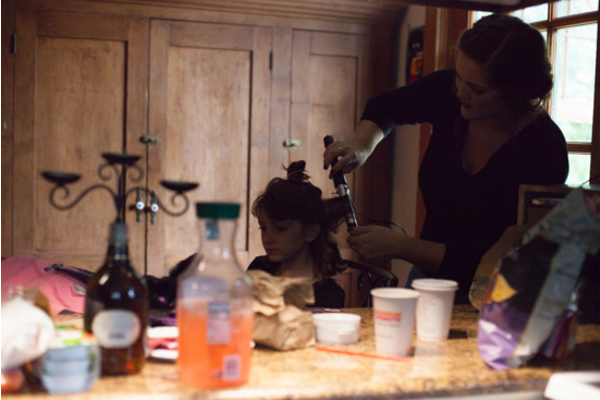 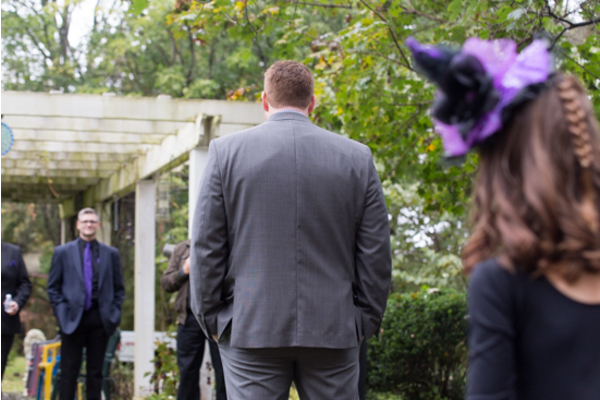 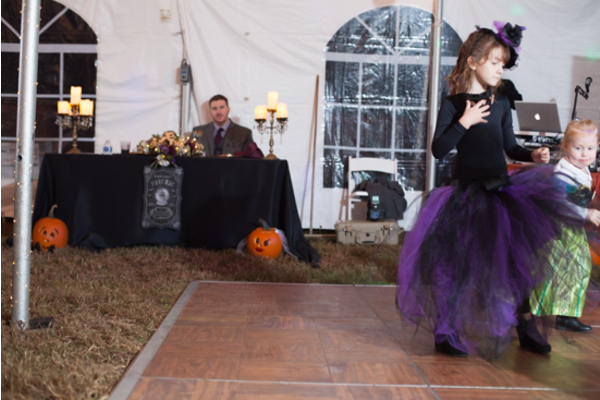 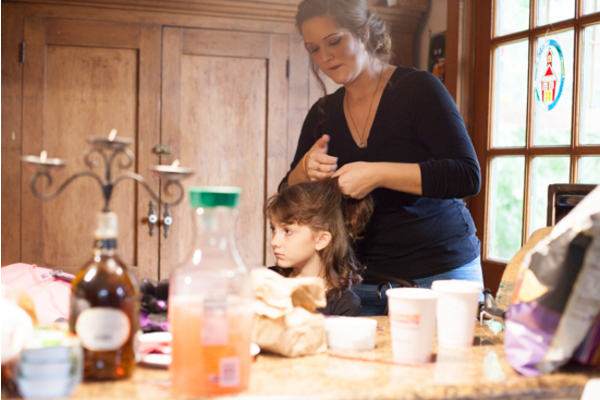 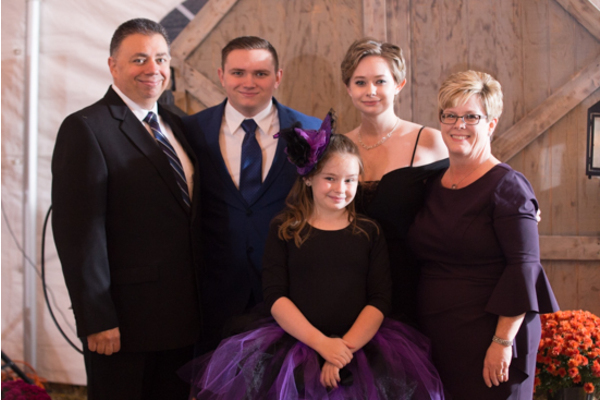 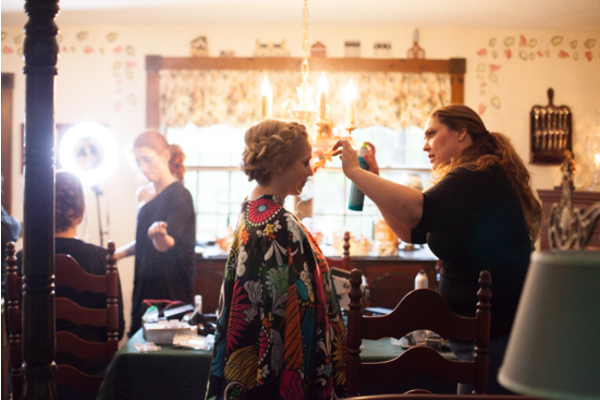 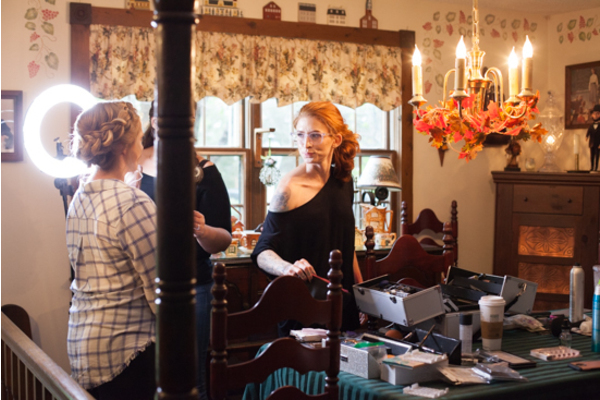 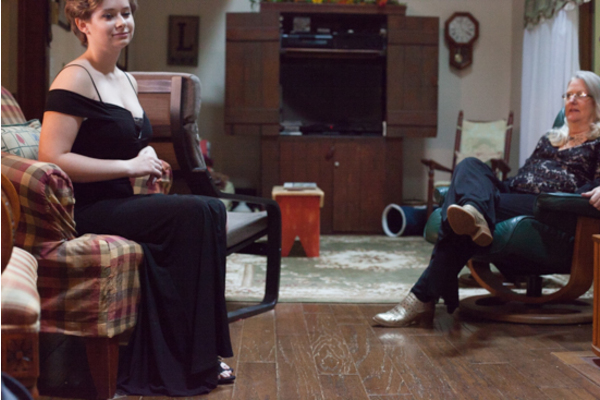 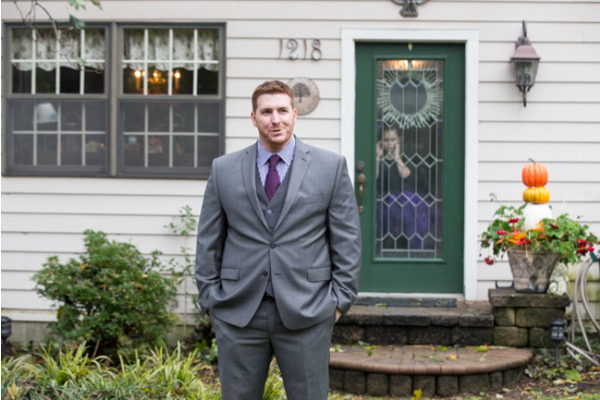 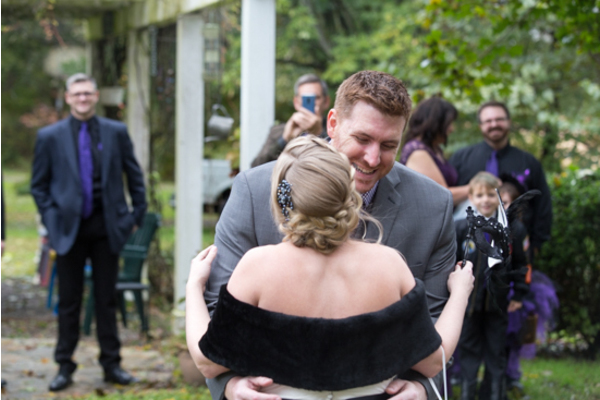 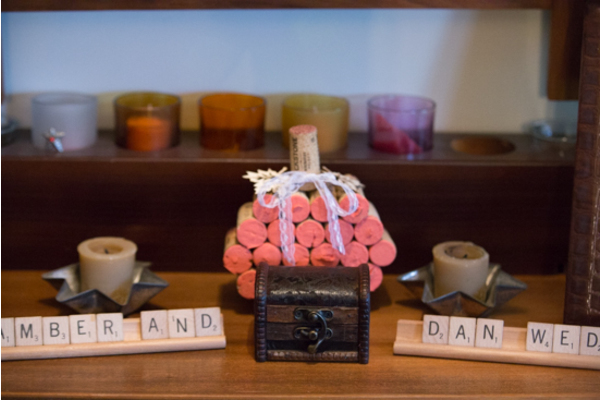 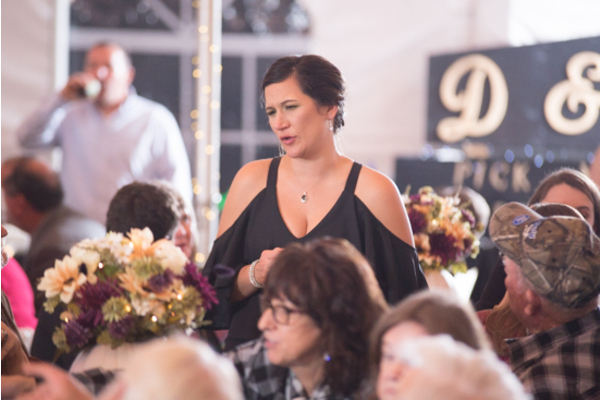 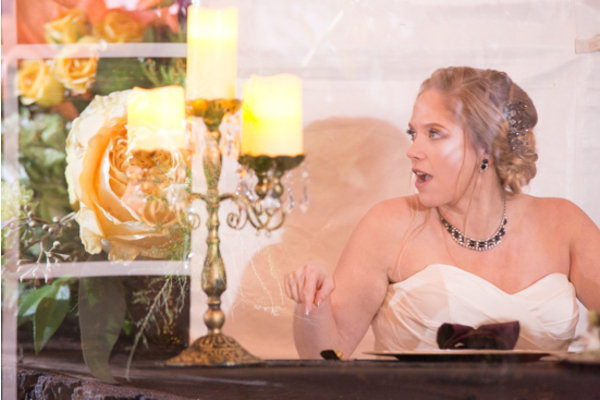 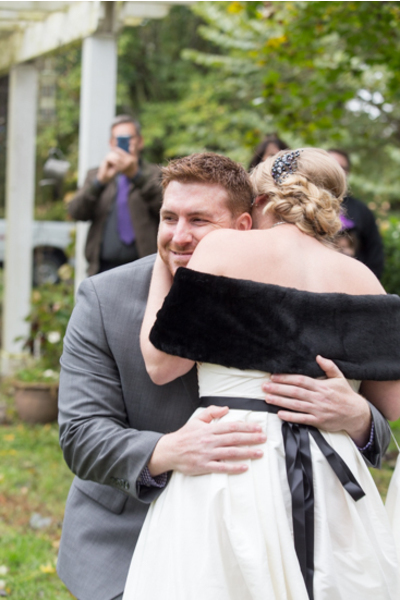 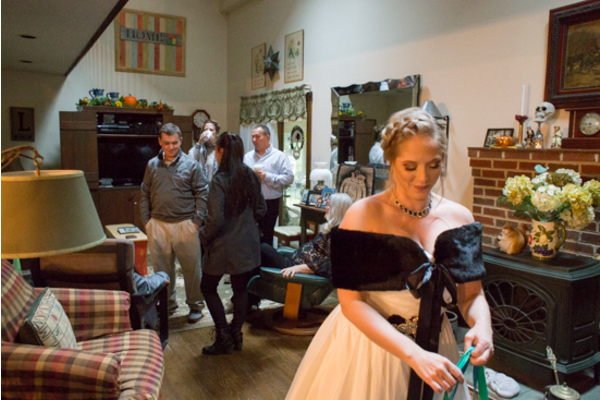 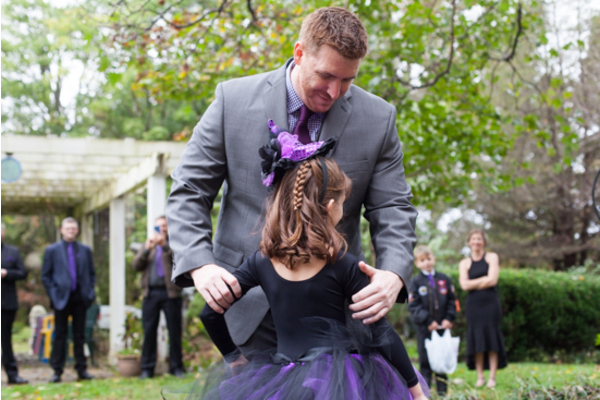 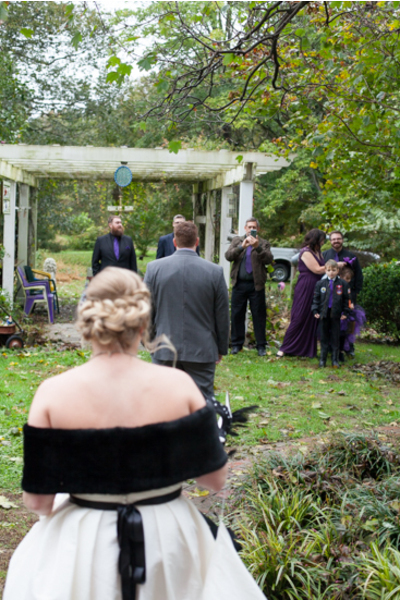 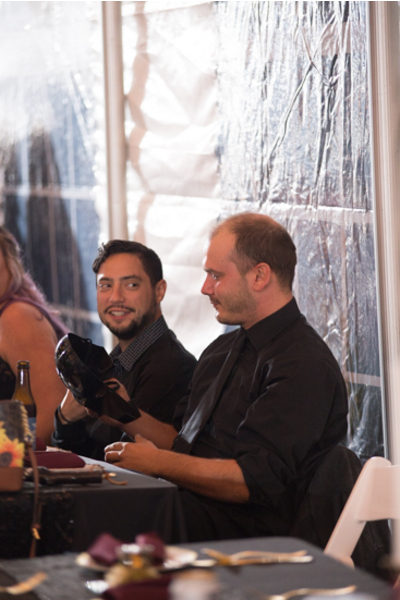 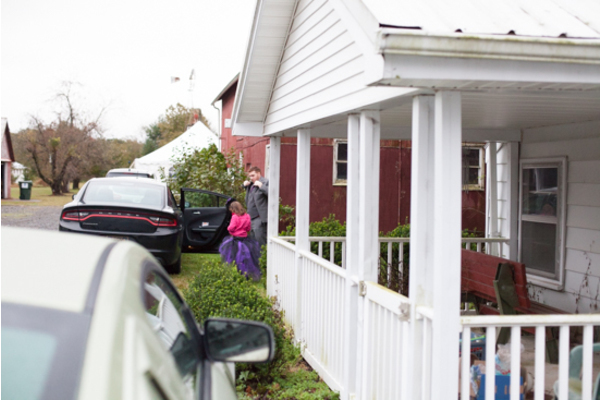 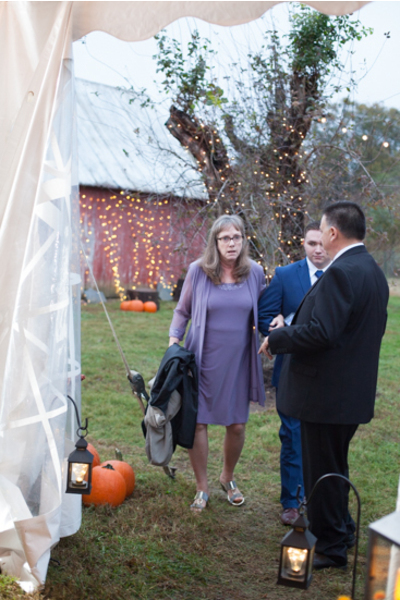 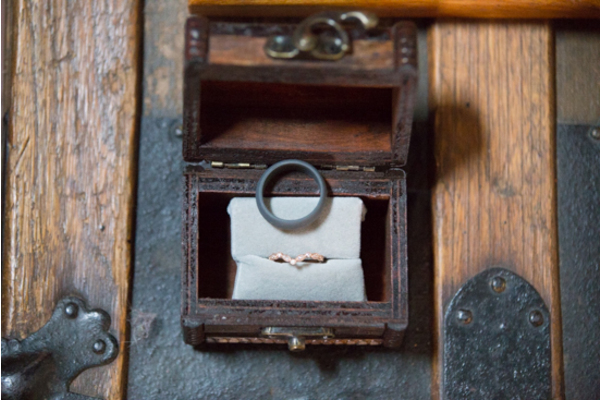 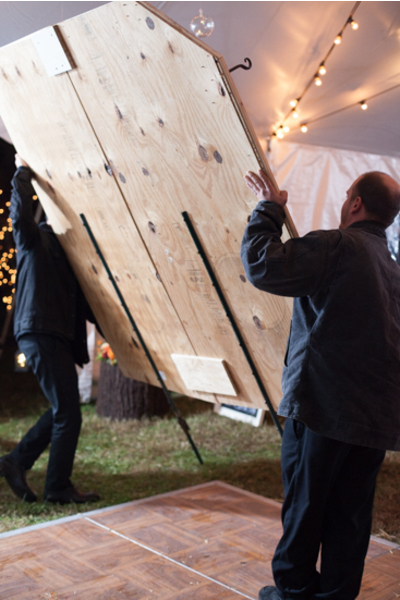 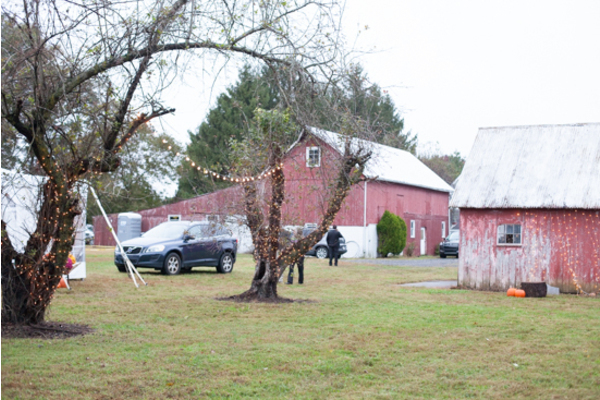 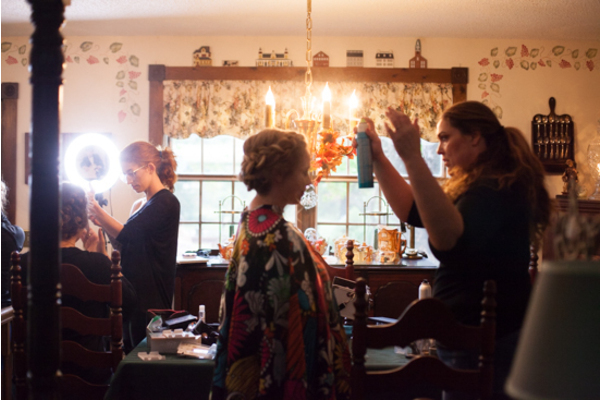 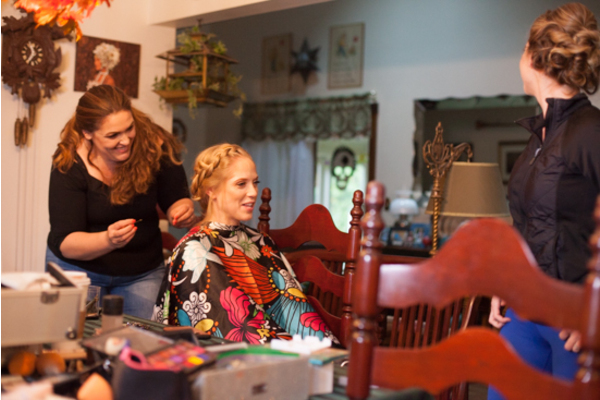 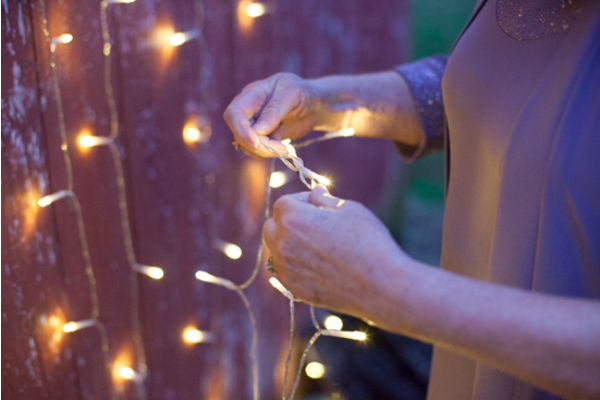 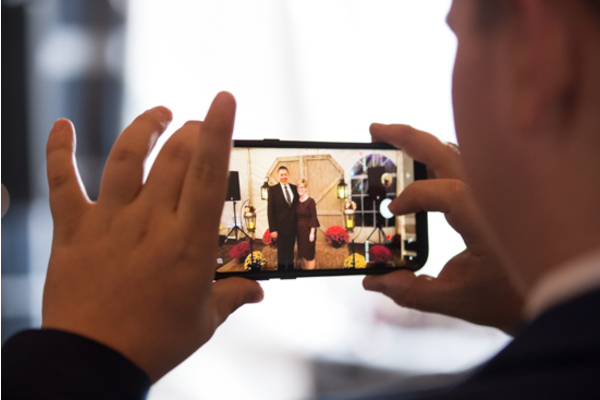 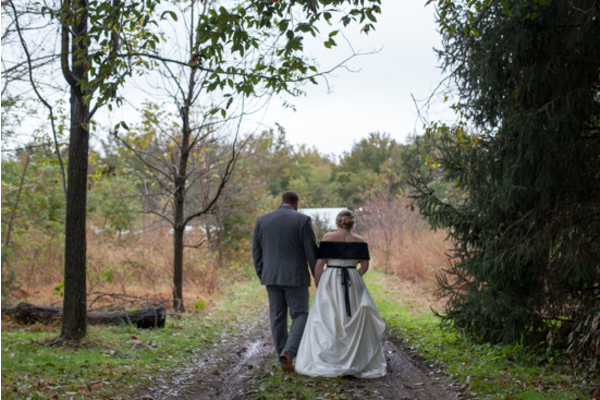 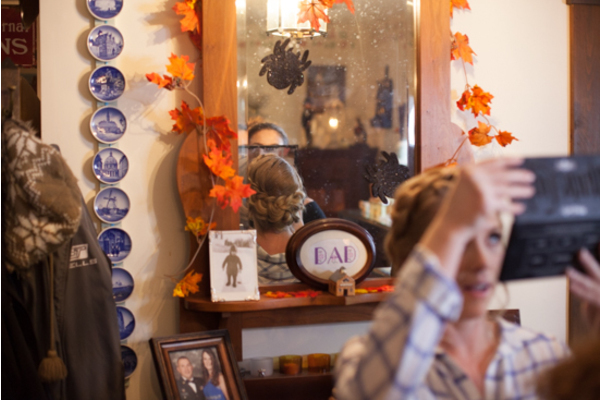 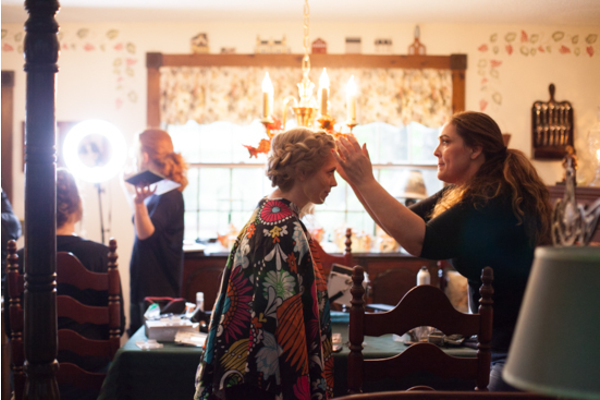 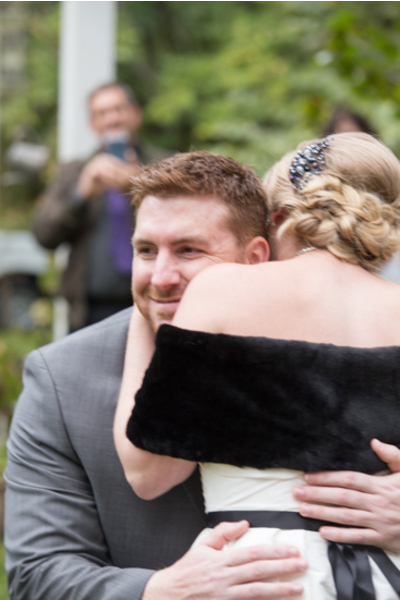 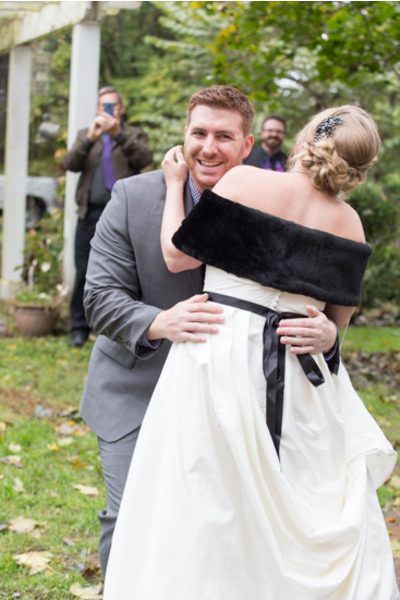 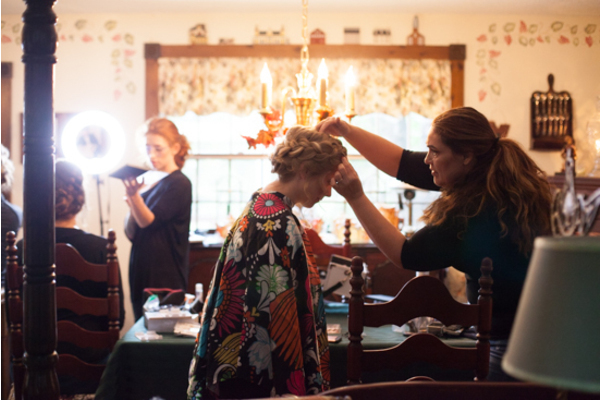 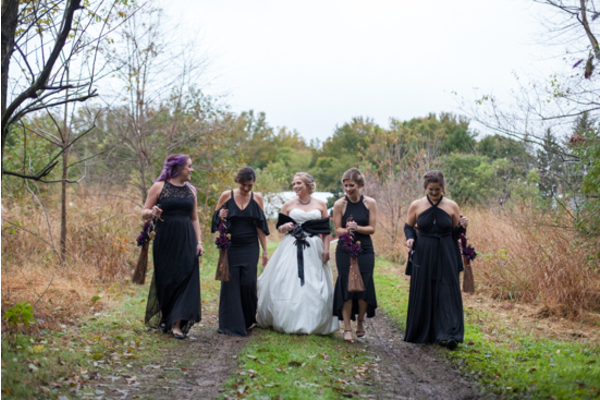 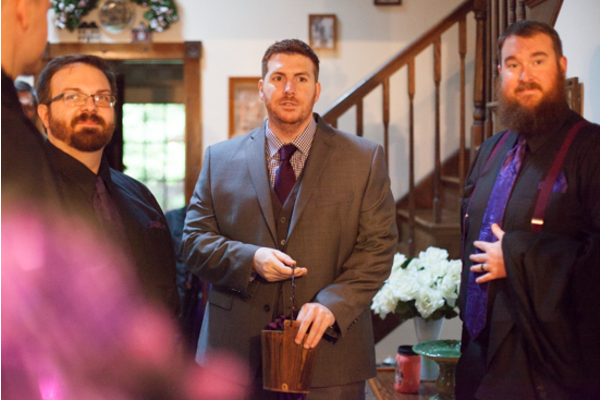 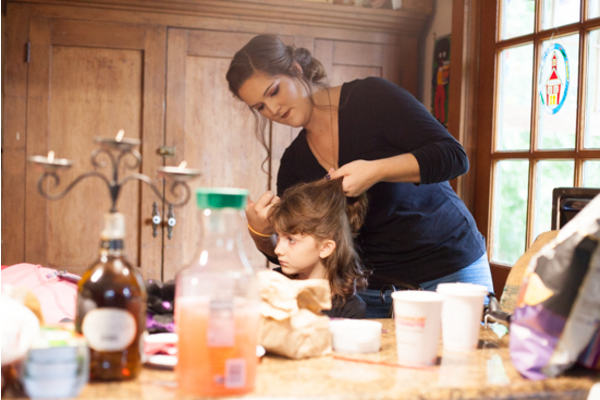 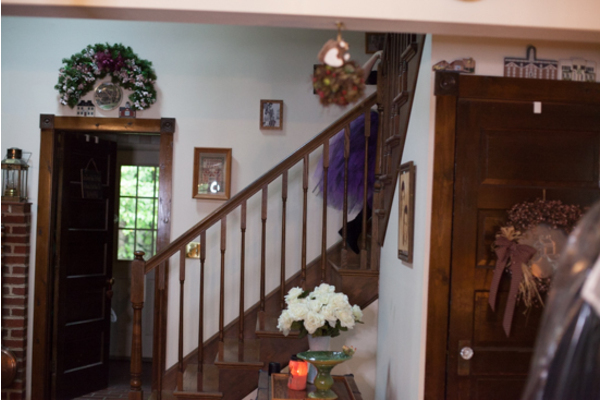 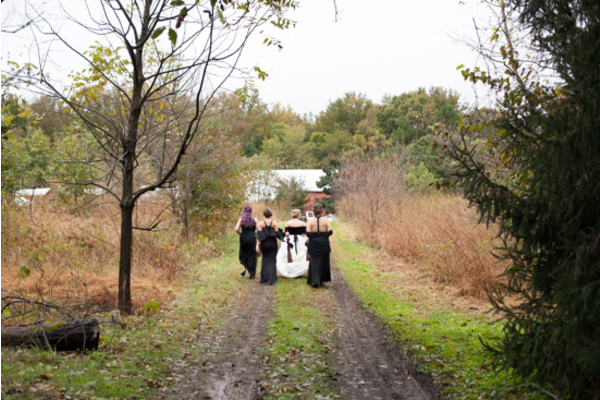 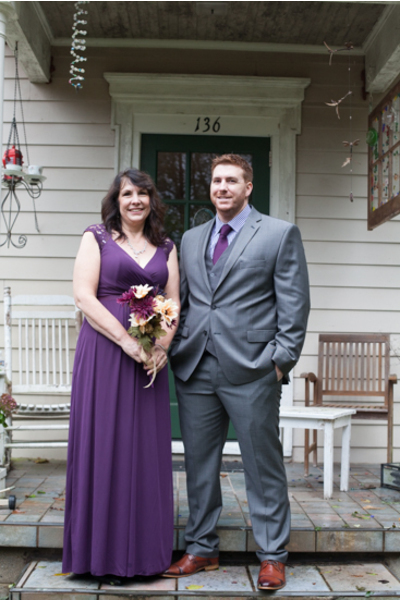 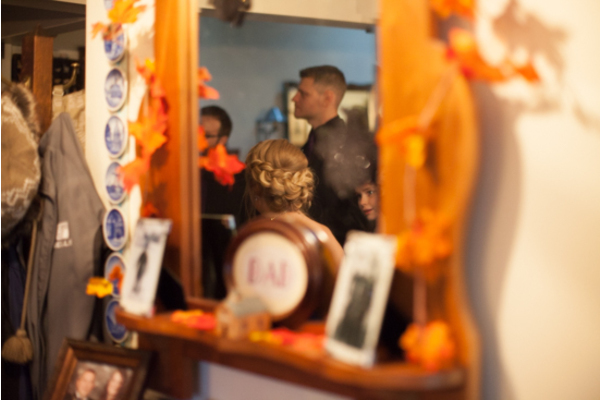 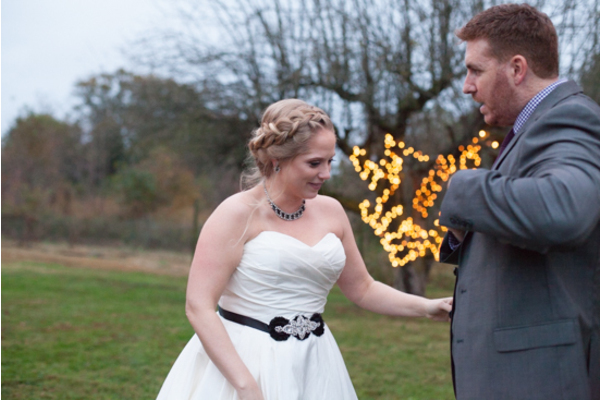 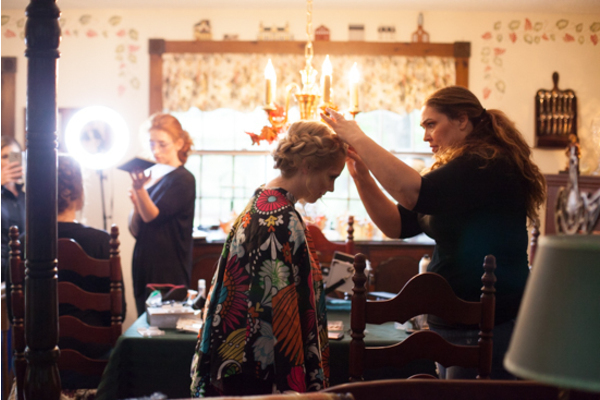 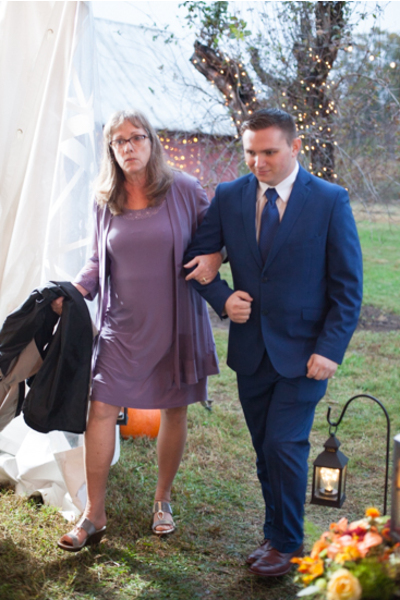 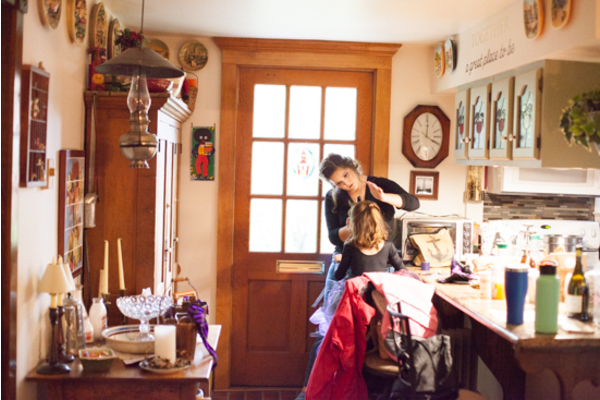 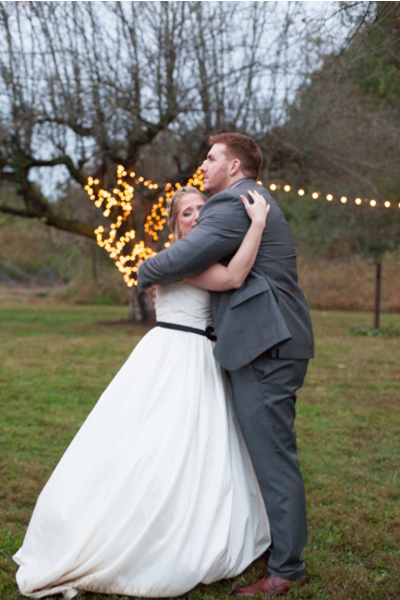 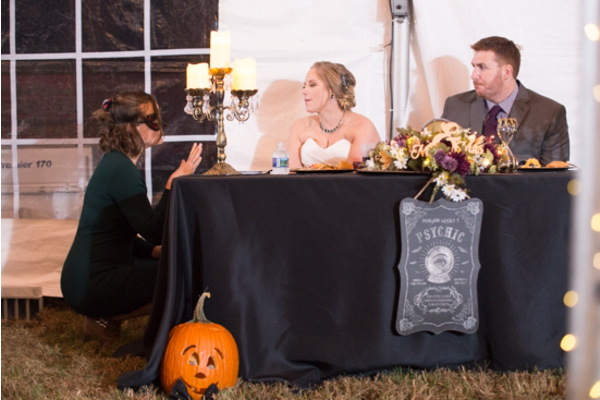 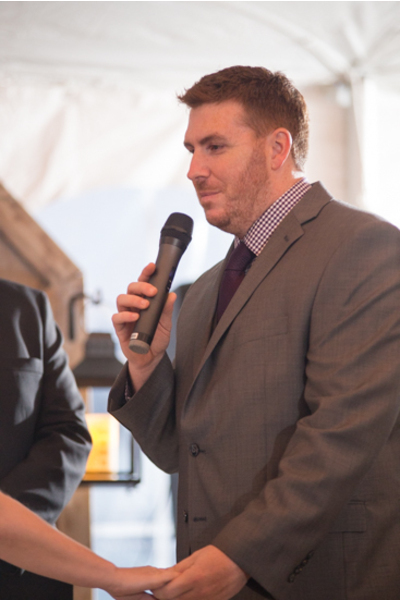 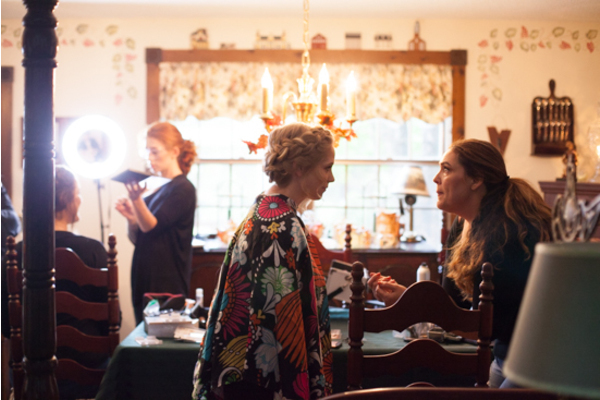 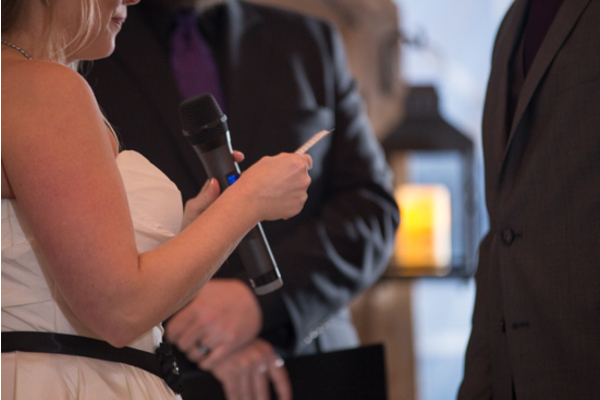 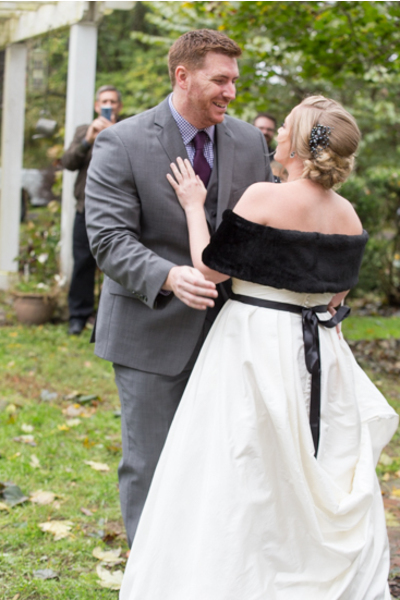 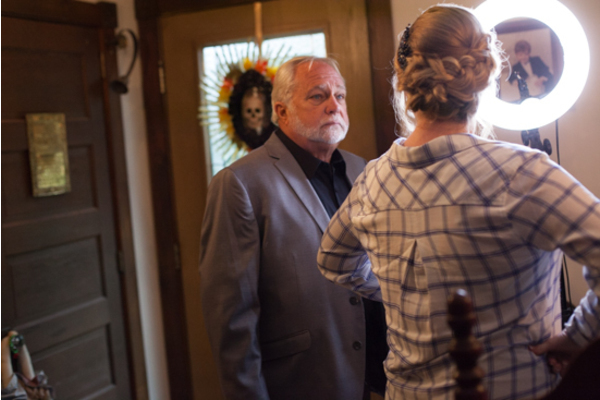 Of course, our NJ Wedding Photographer was happy to capture the Halloween wedding magic. 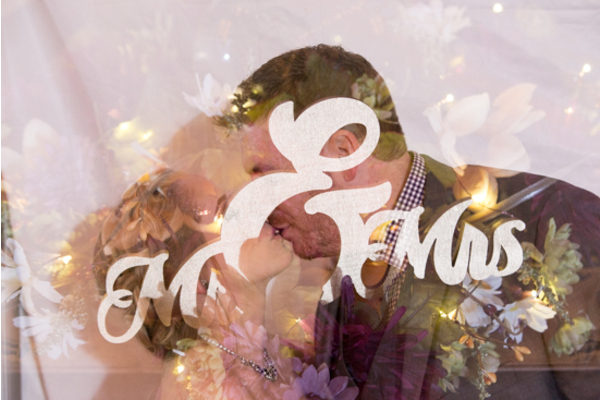 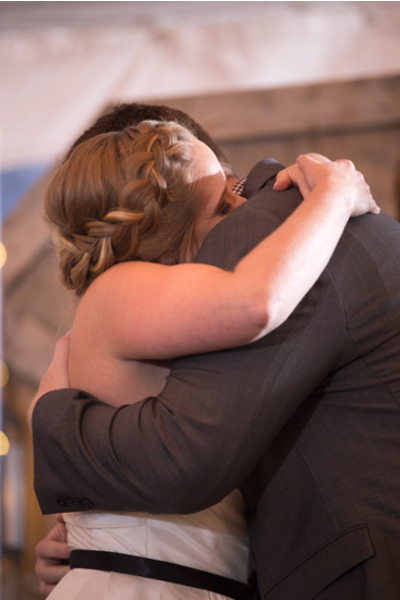 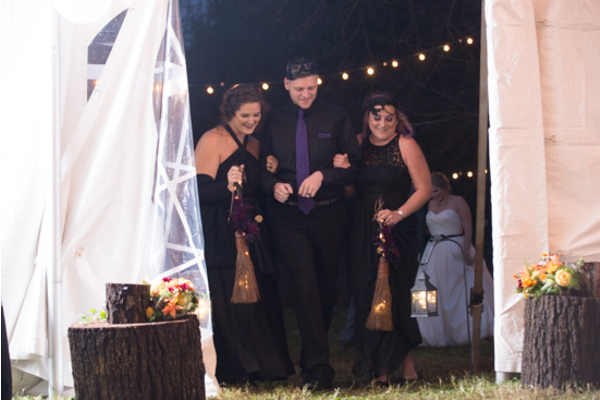 Congratulations, again, to Amber and Daniel! 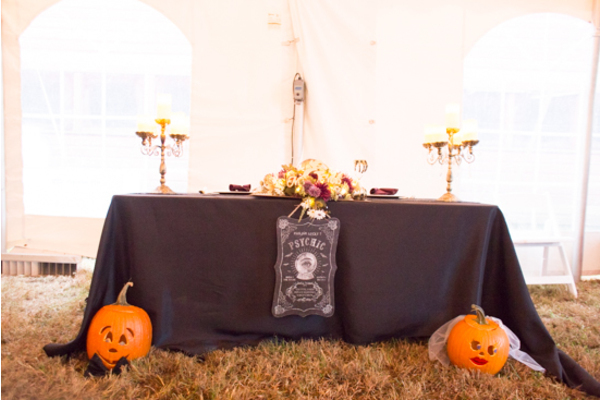 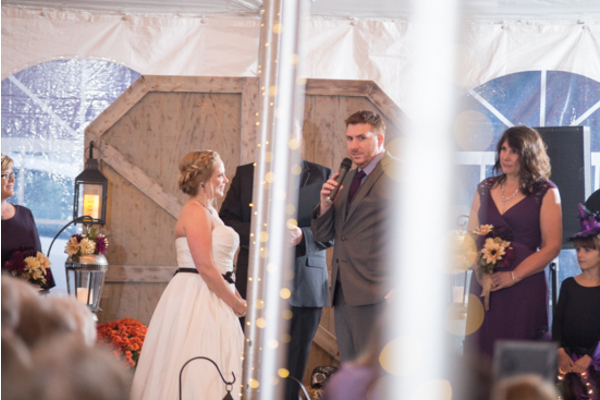 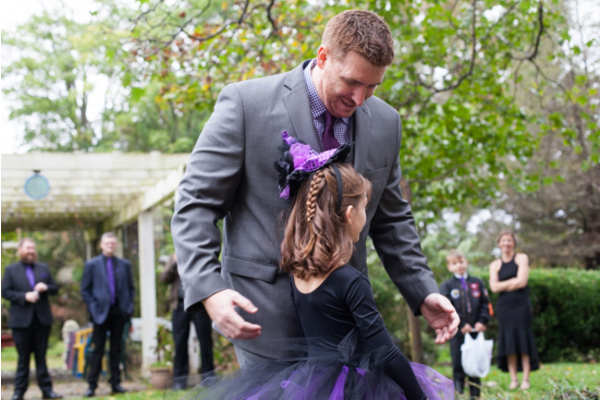 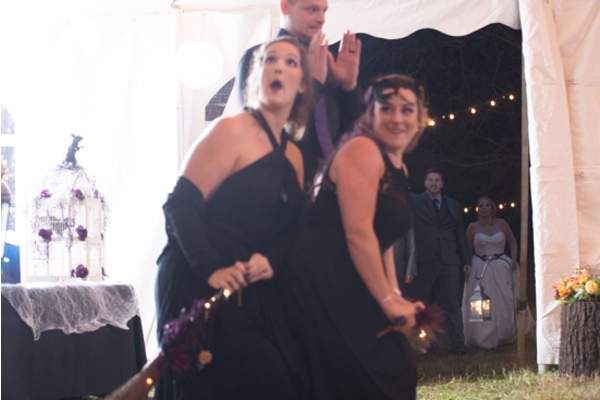 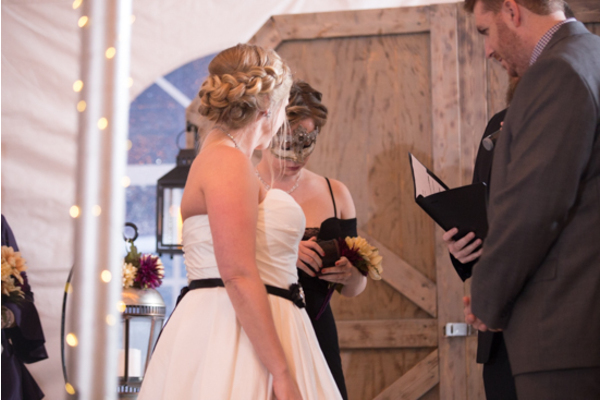 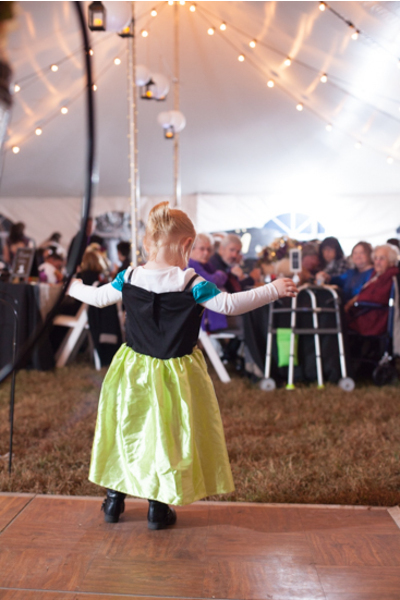 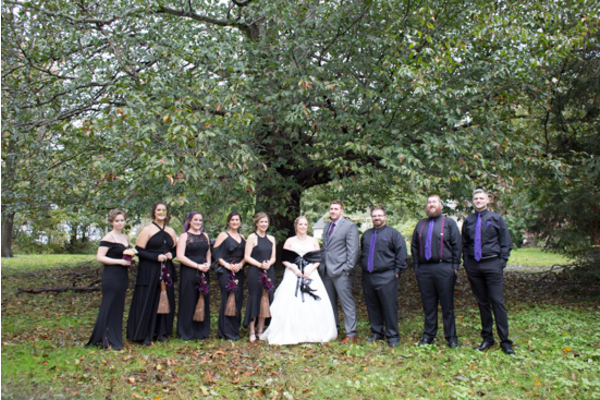 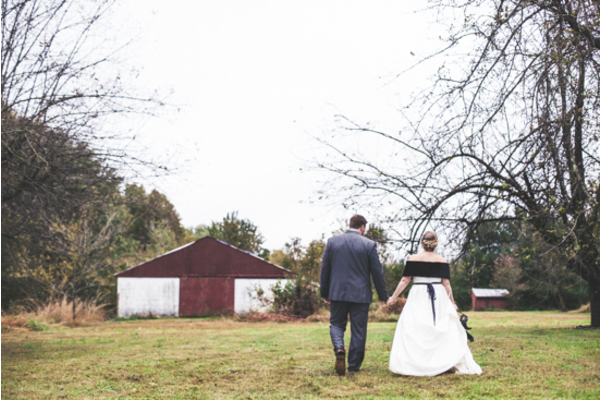 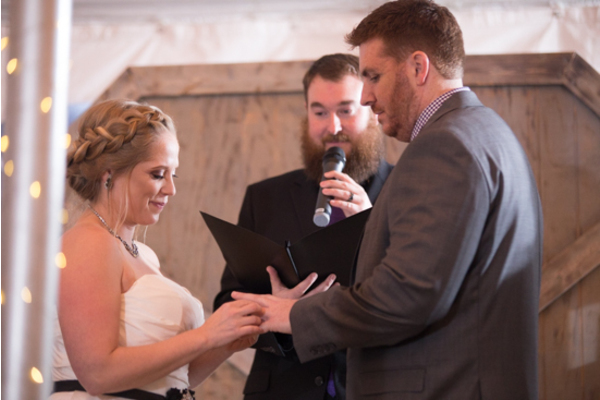 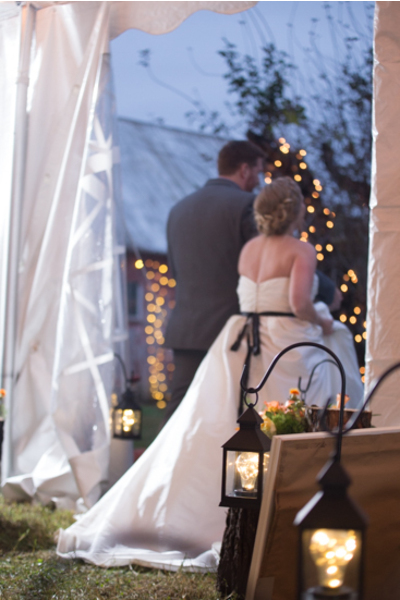 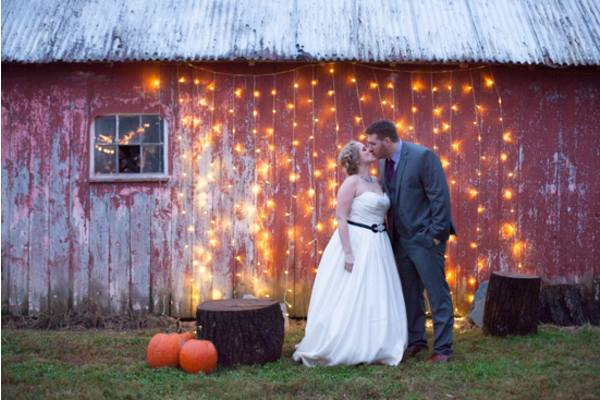 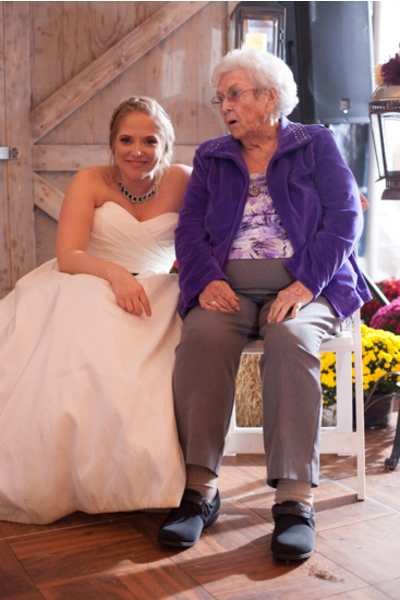 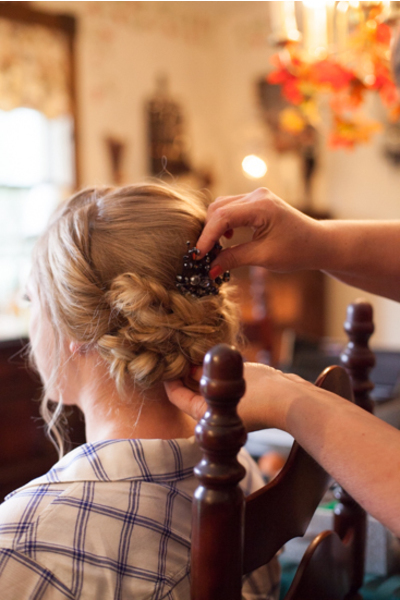 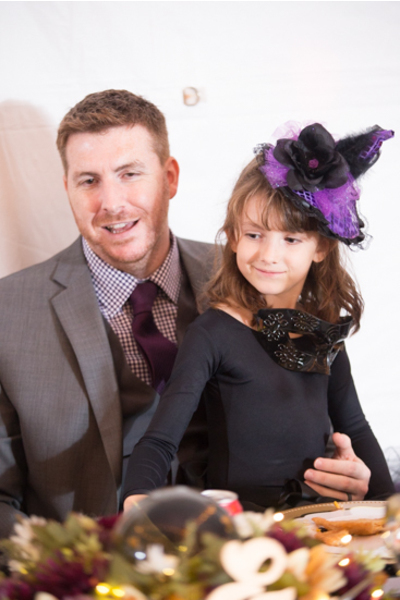 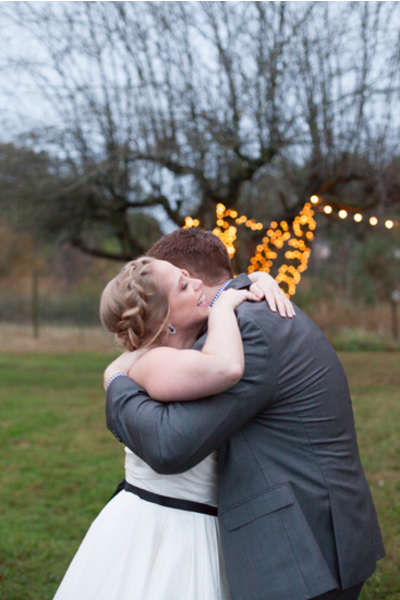 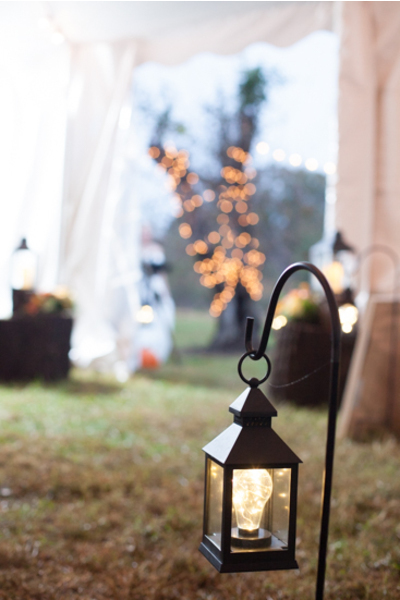 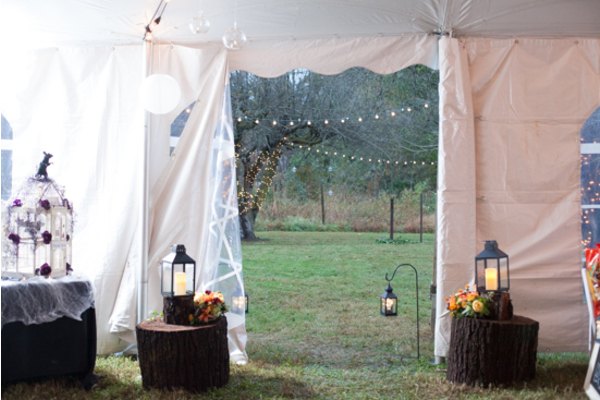 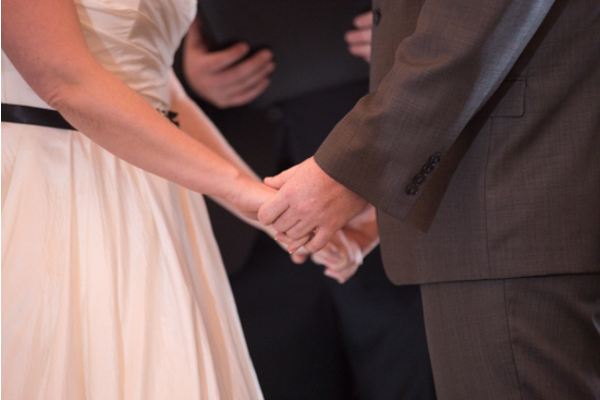 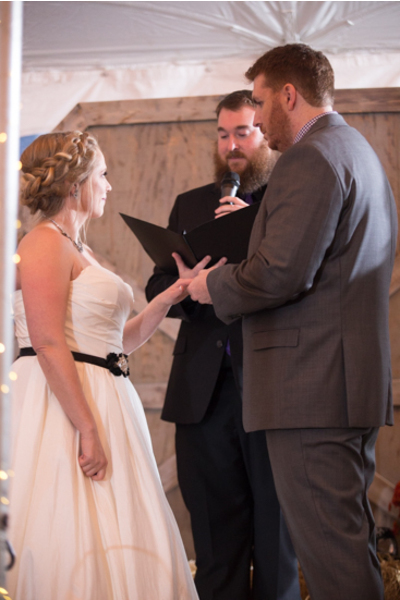 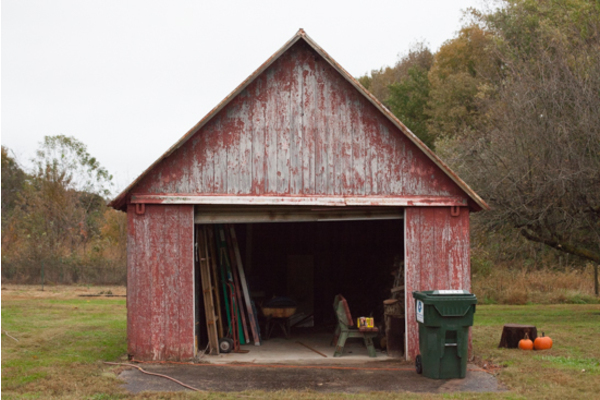 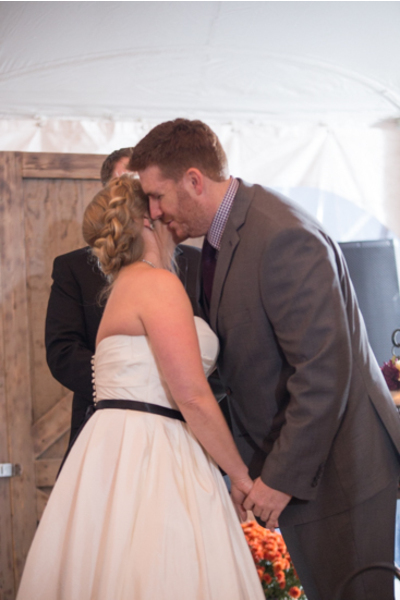 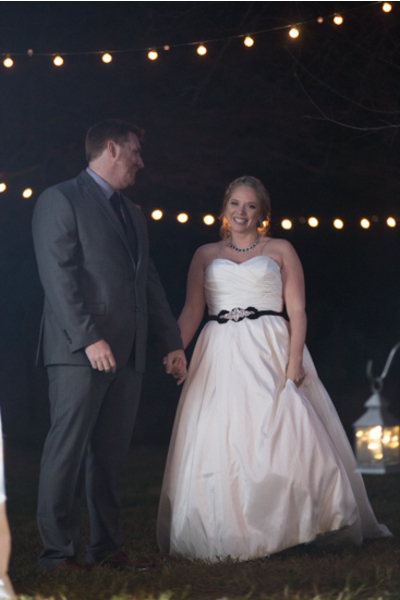 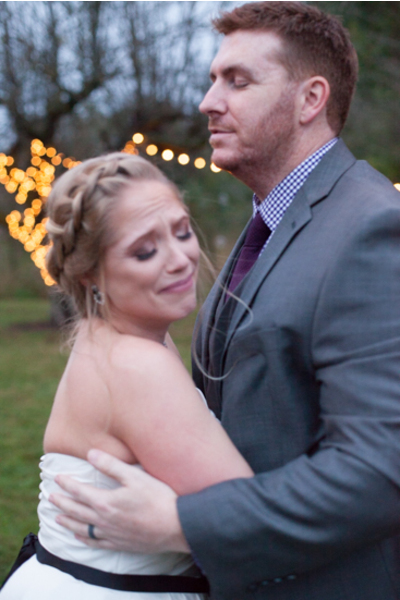 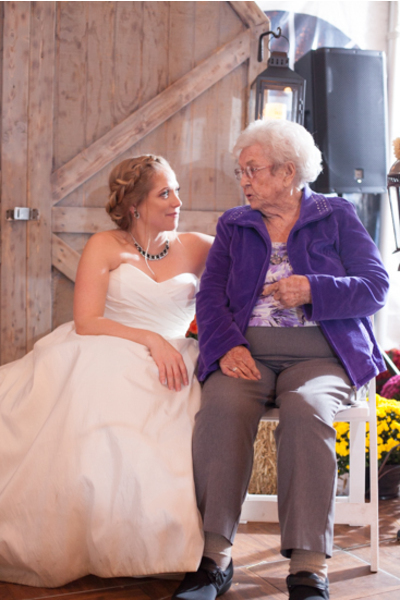 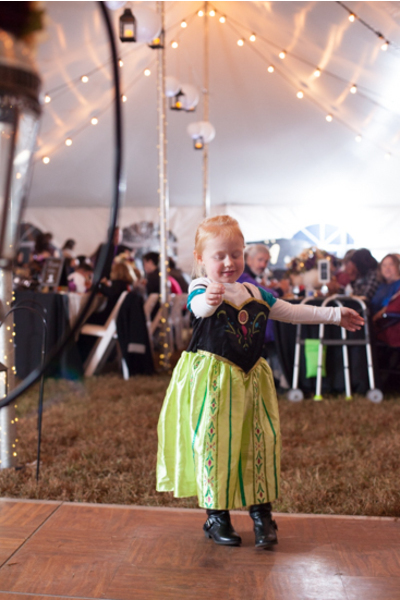 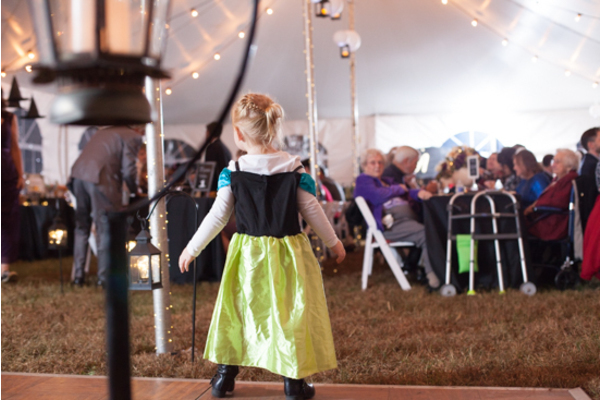 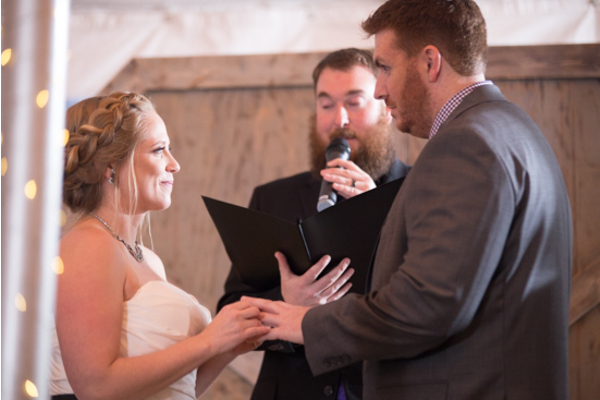 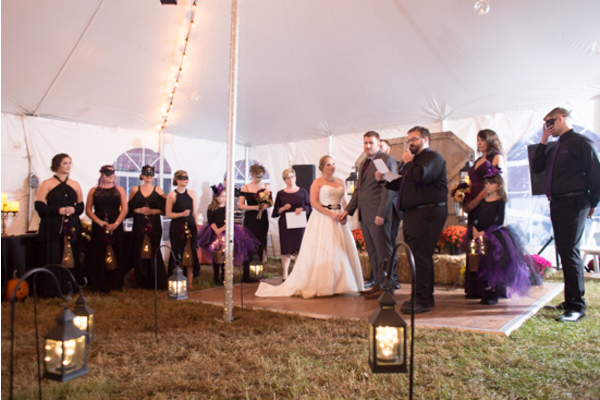 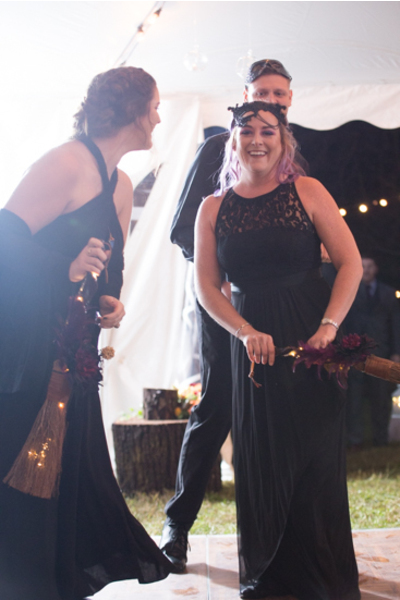 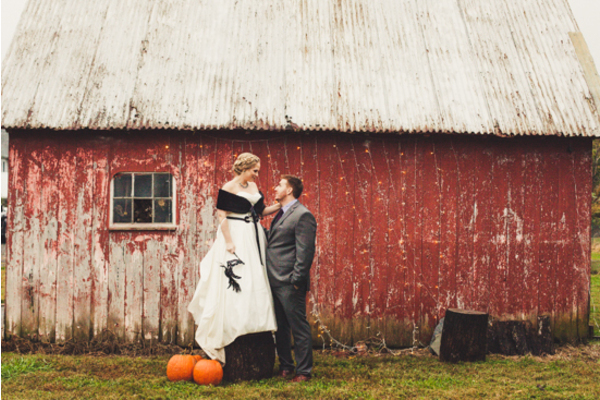 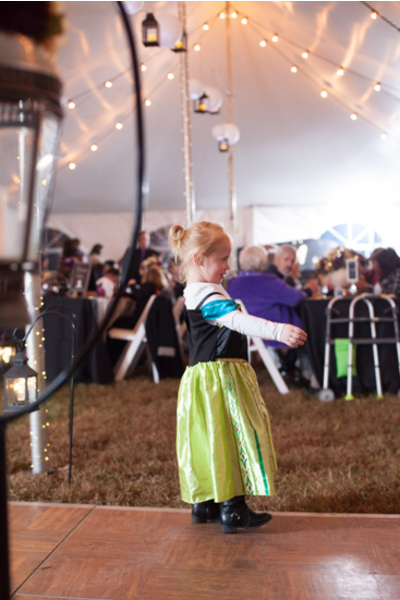 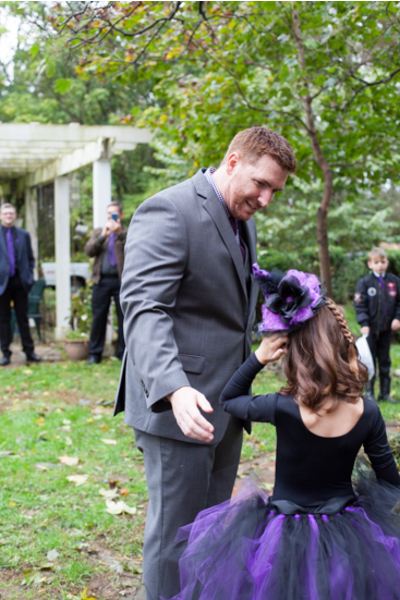 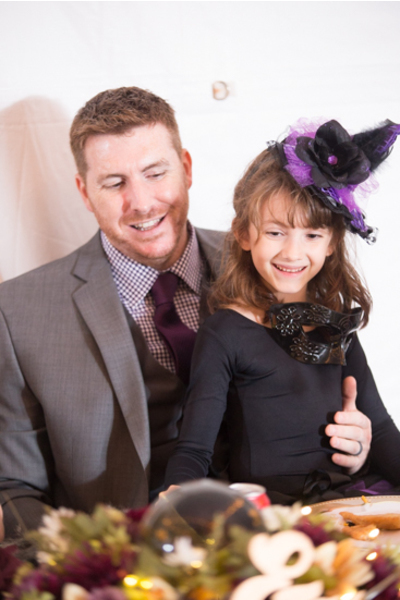 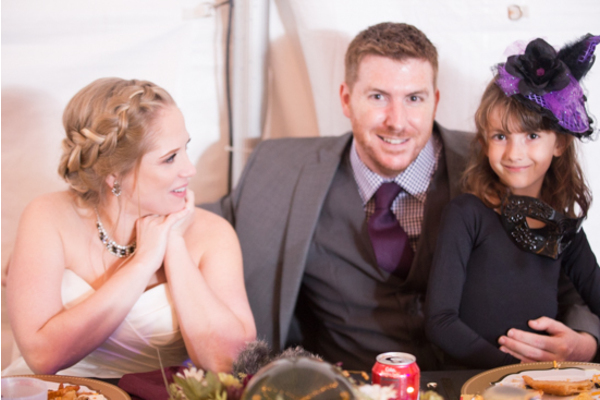 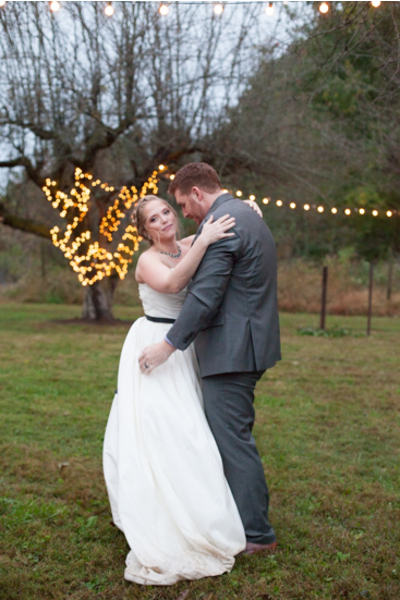 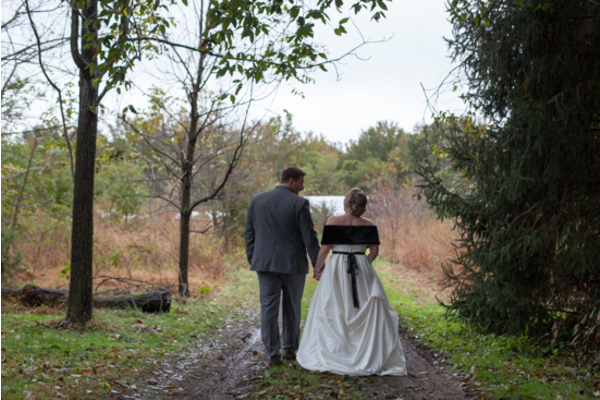 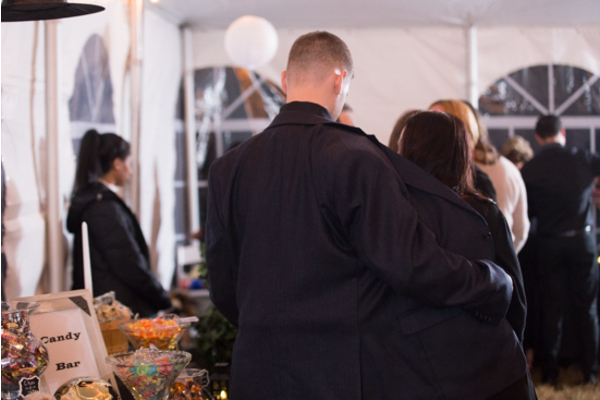 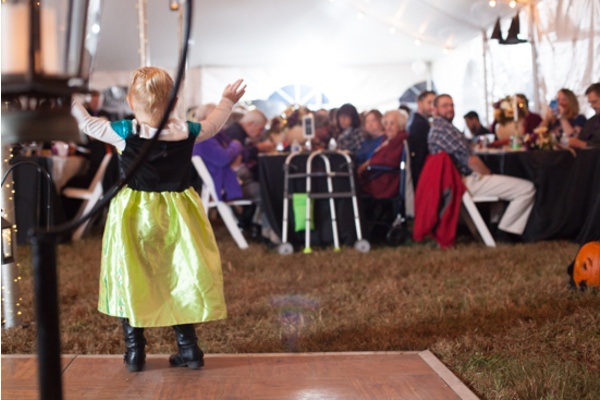 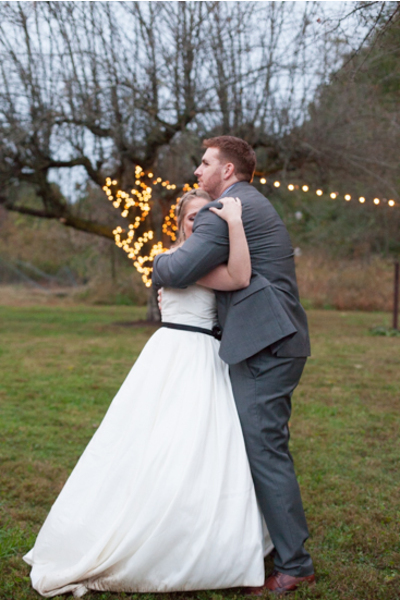 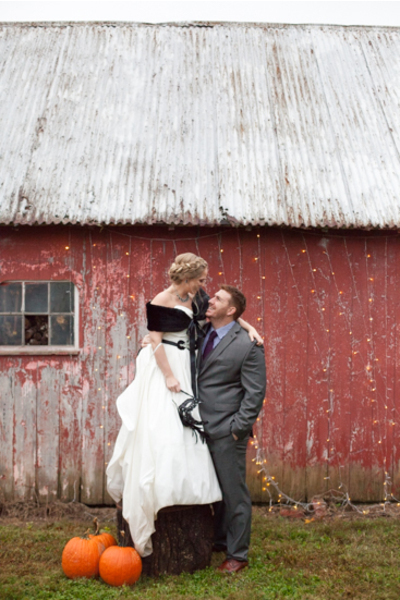 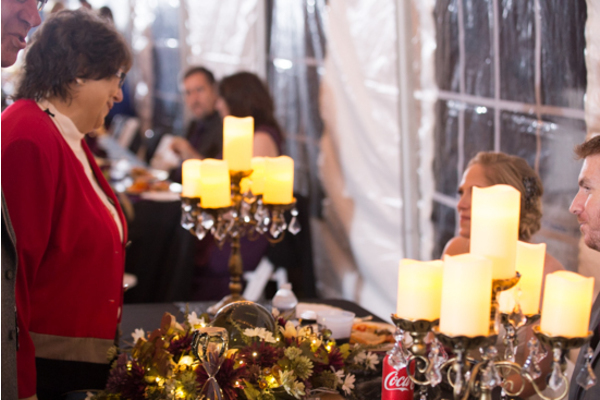 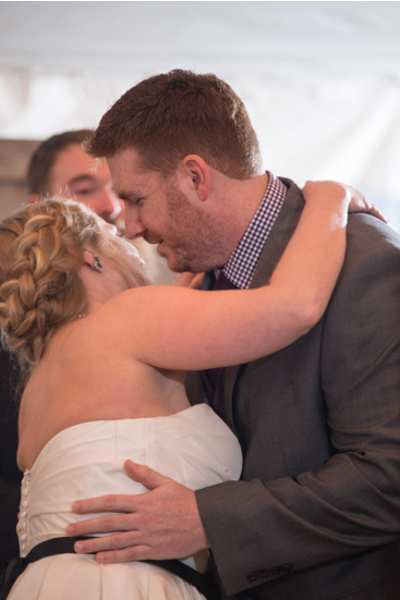 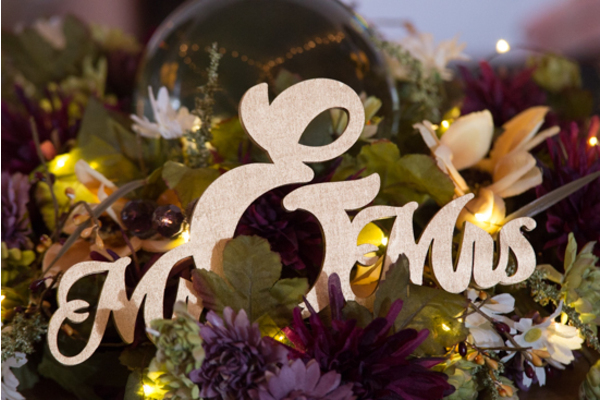 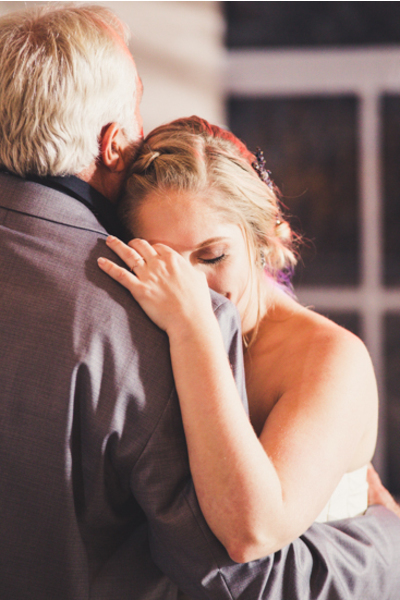 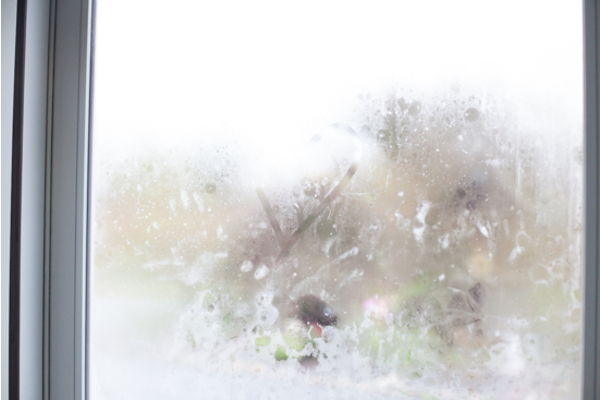 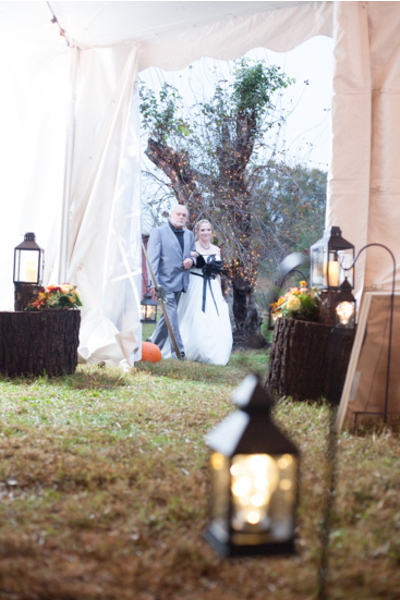 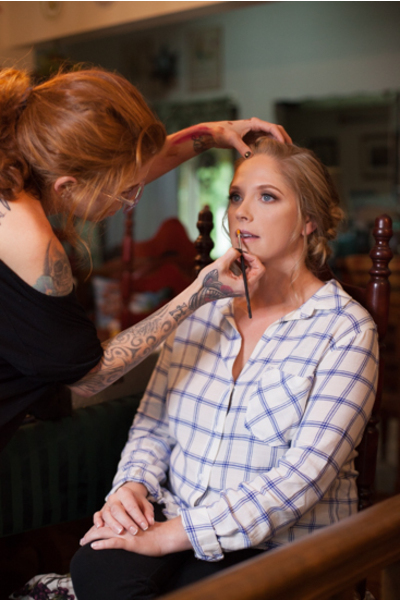 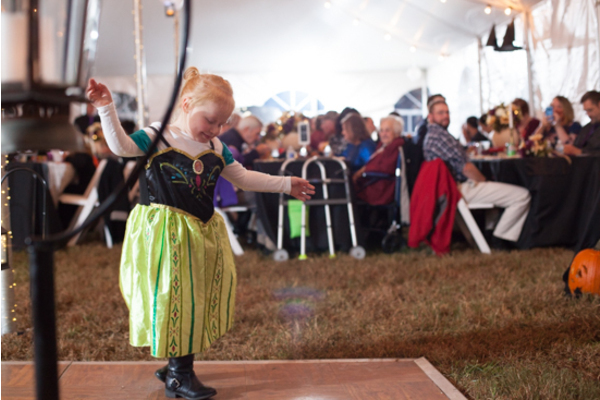 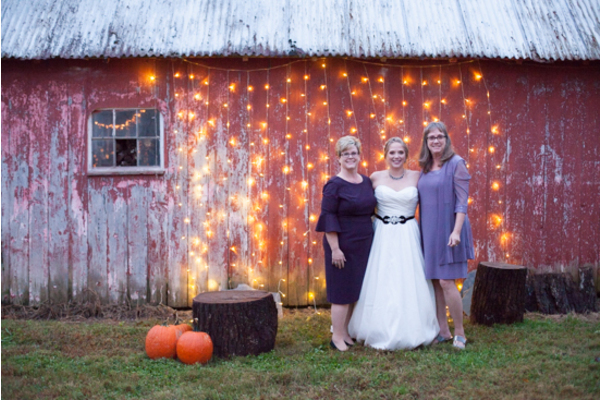 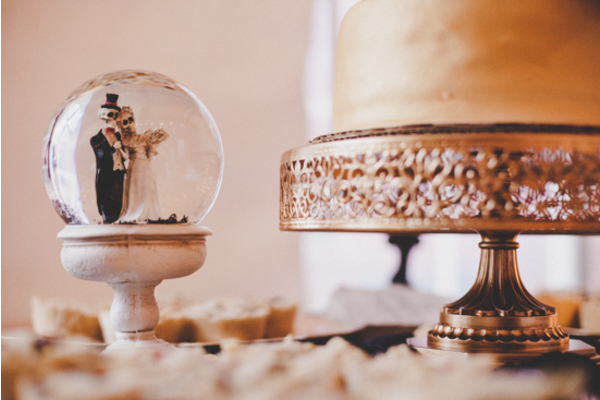 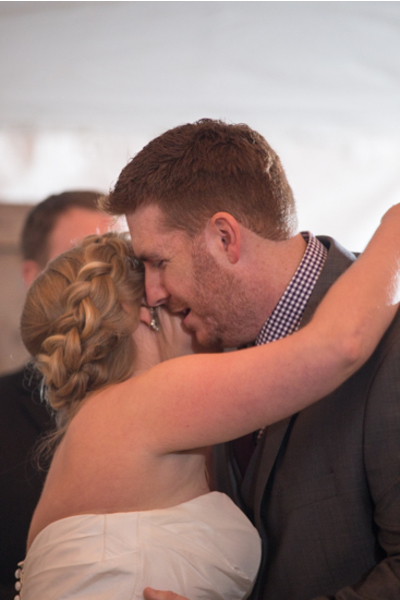 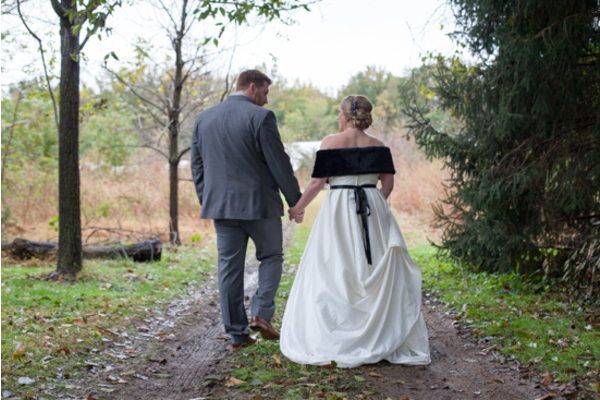 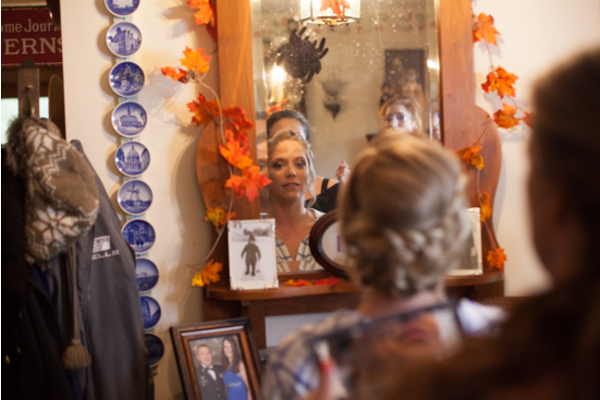 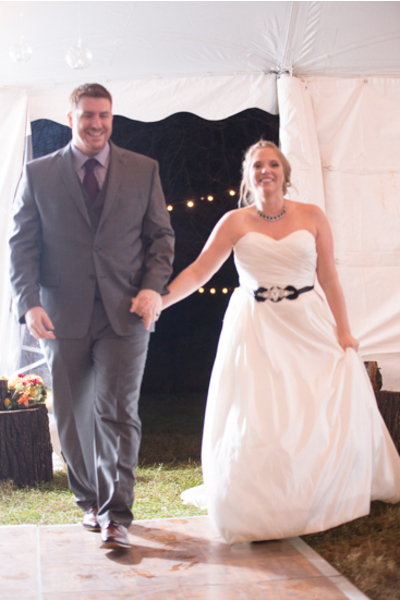 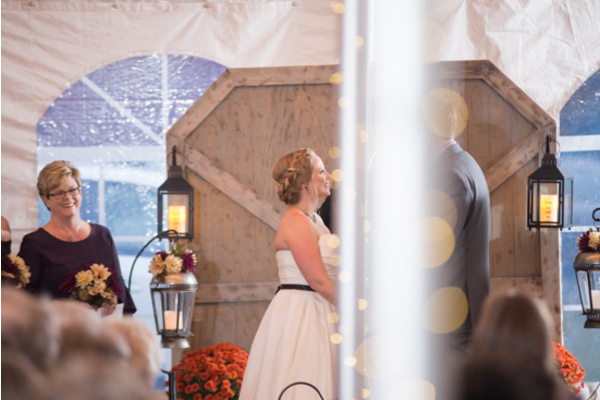 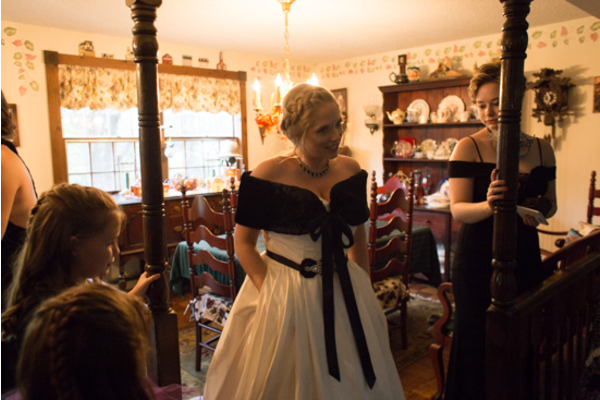 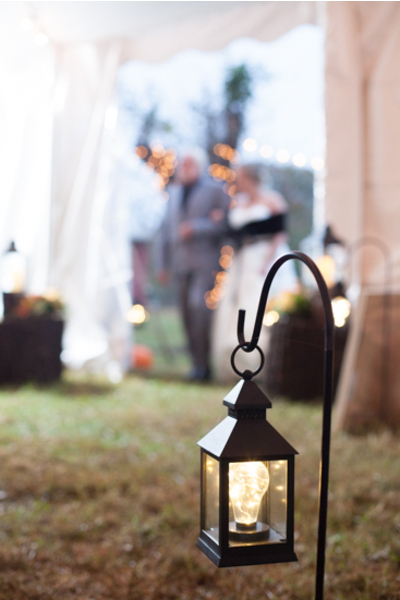 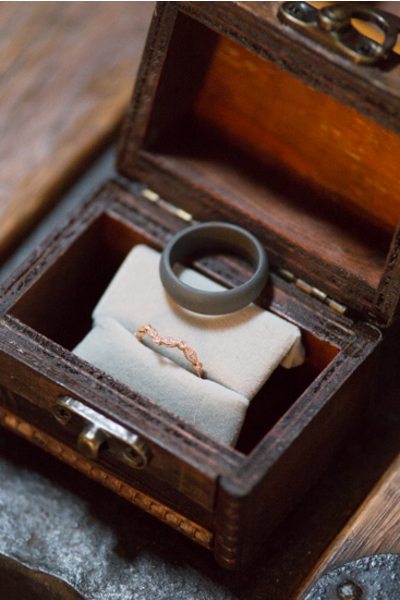 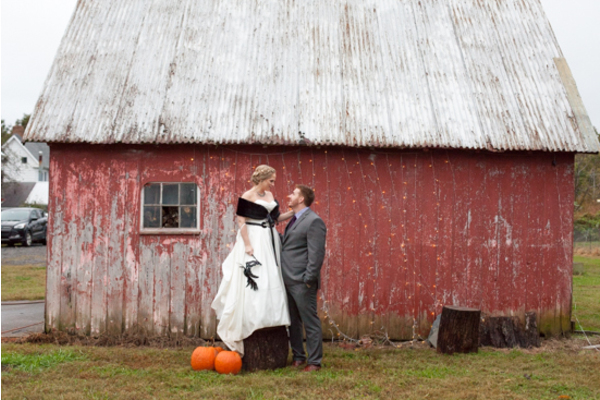 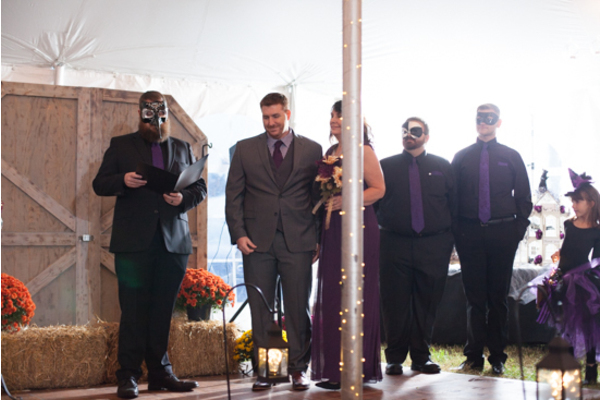 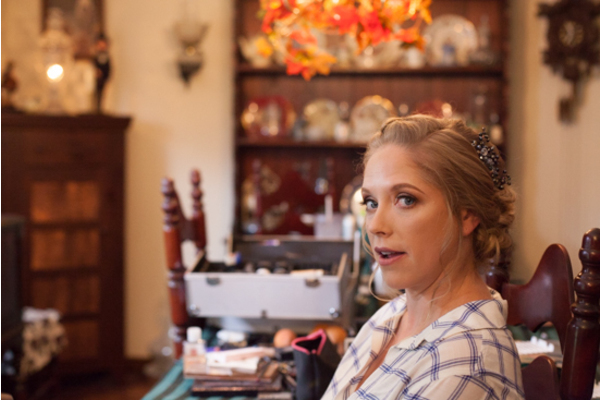 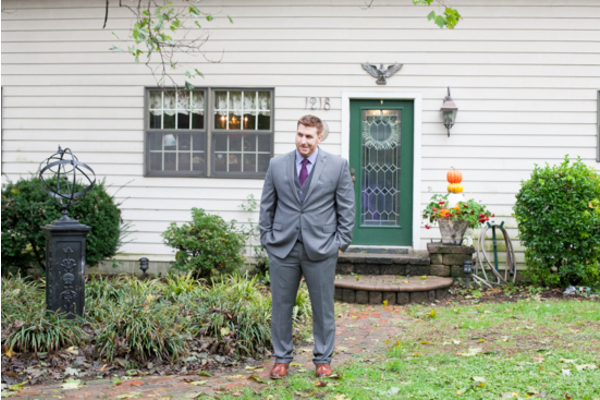 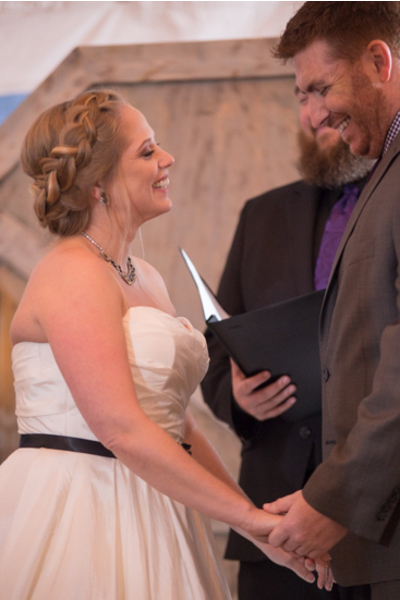 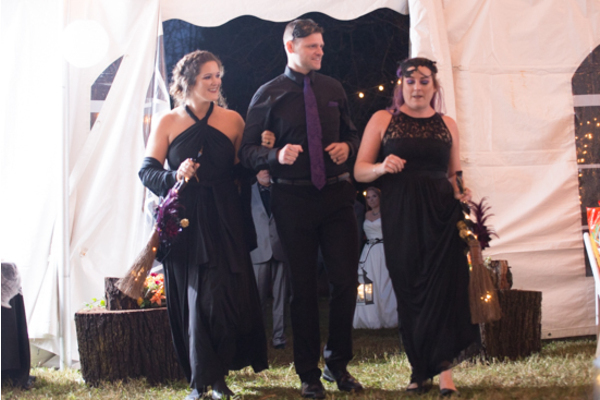 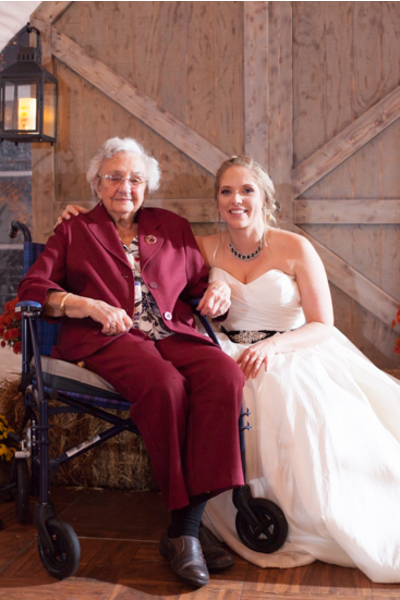 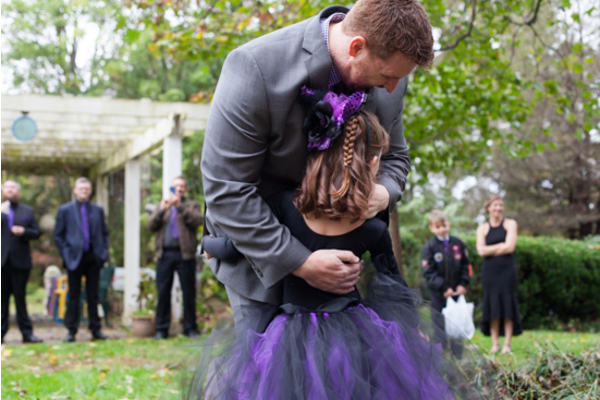 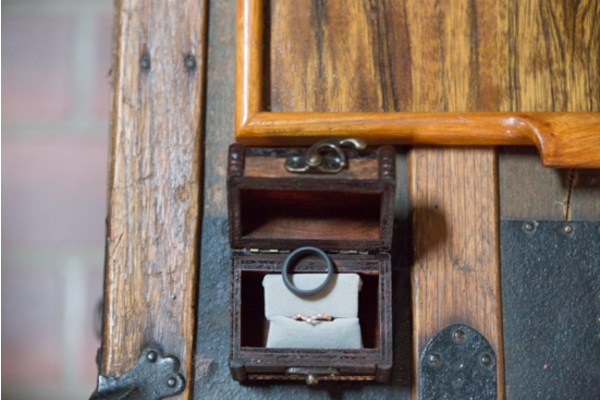 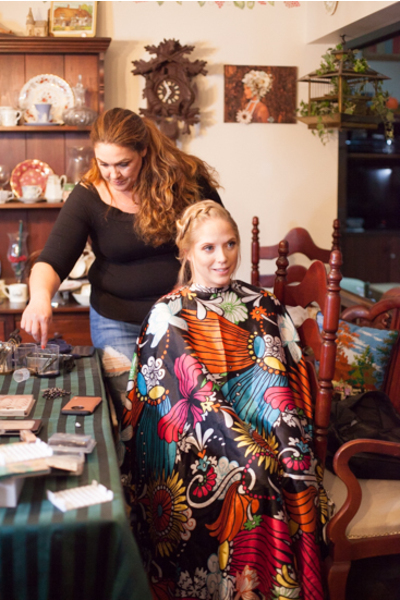 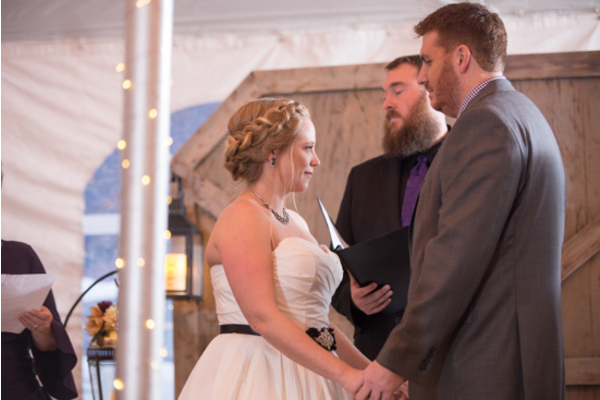 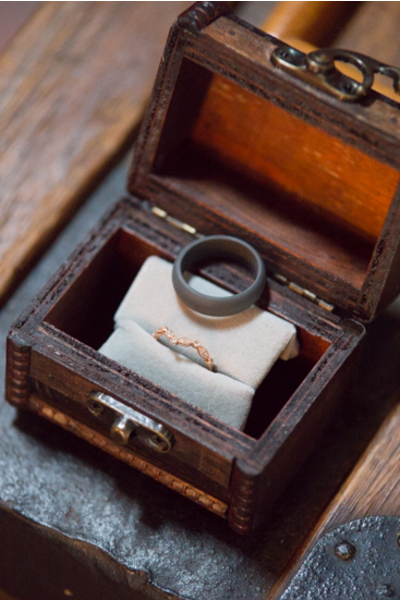 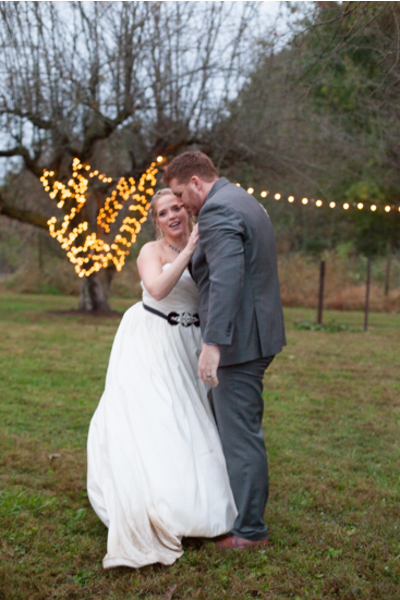 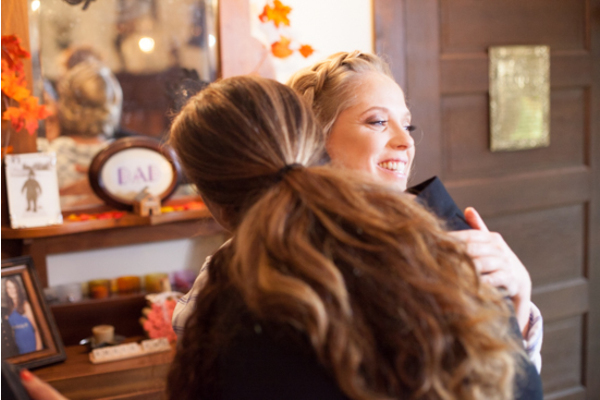 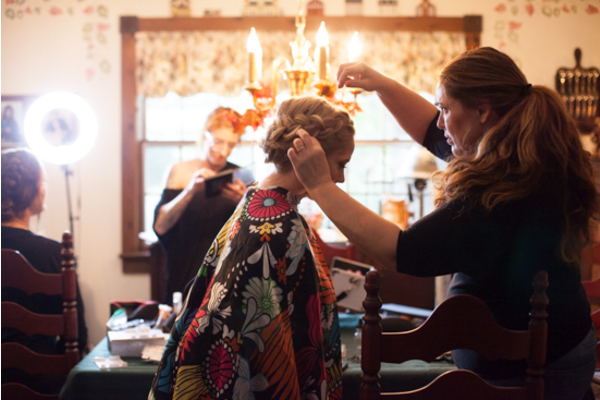 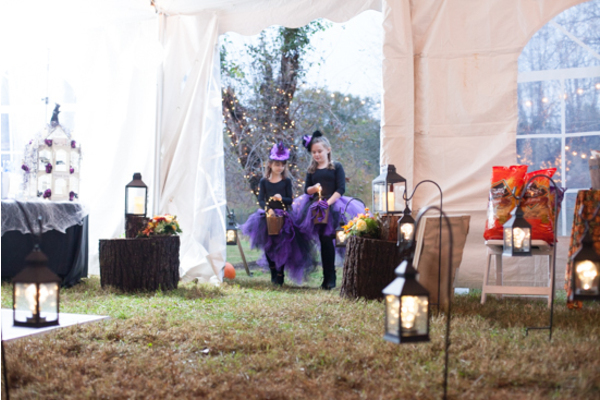 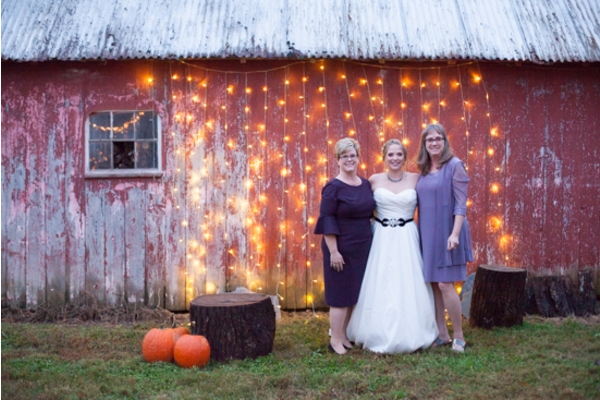 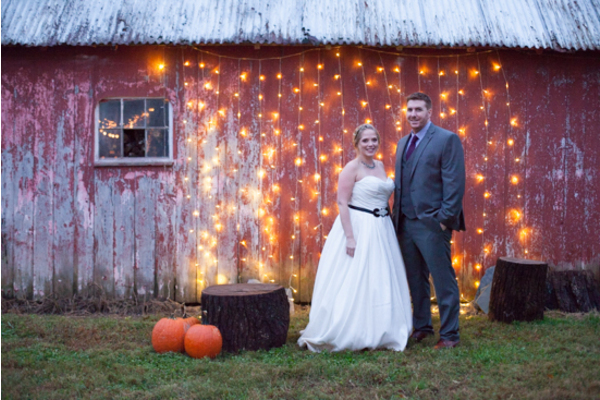 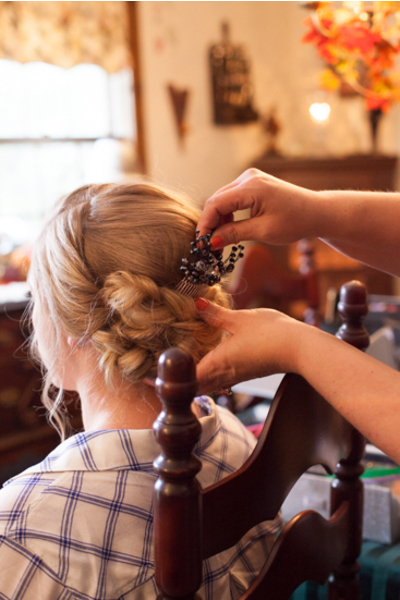 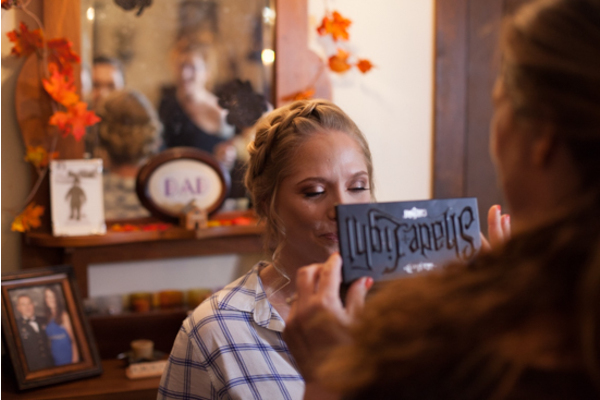 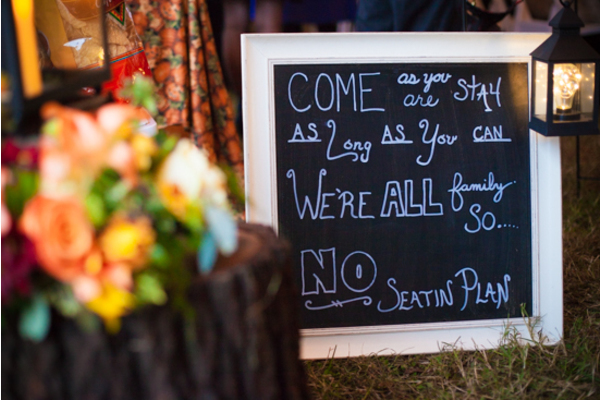 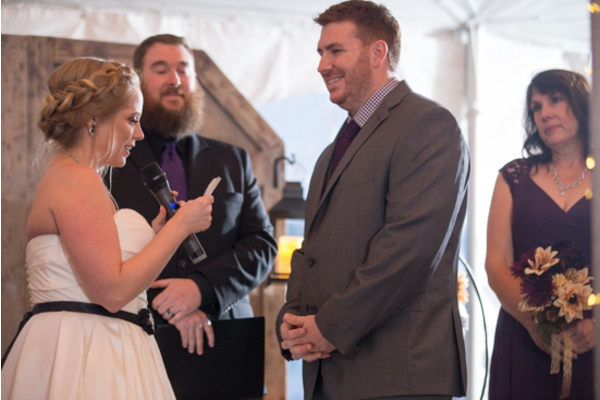 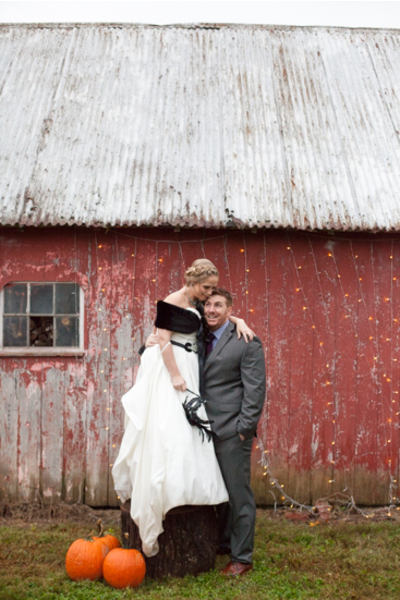 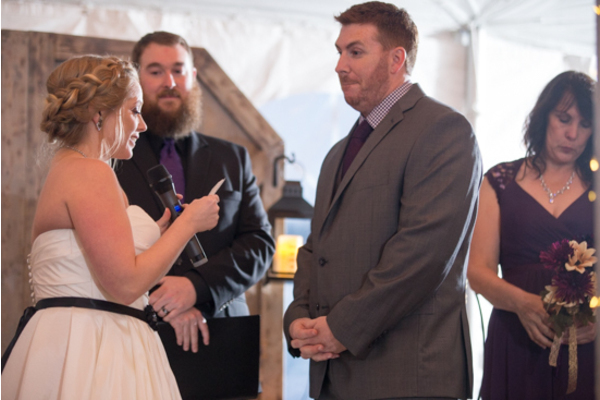 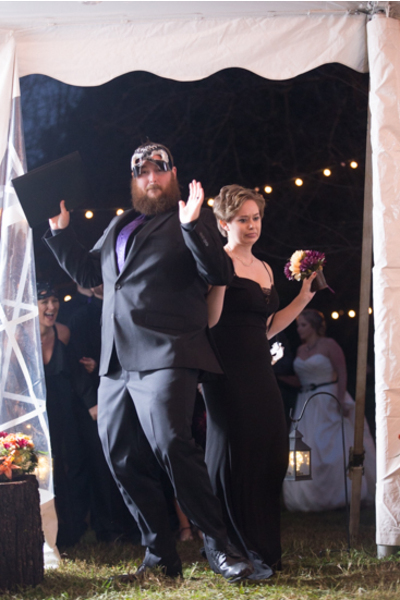 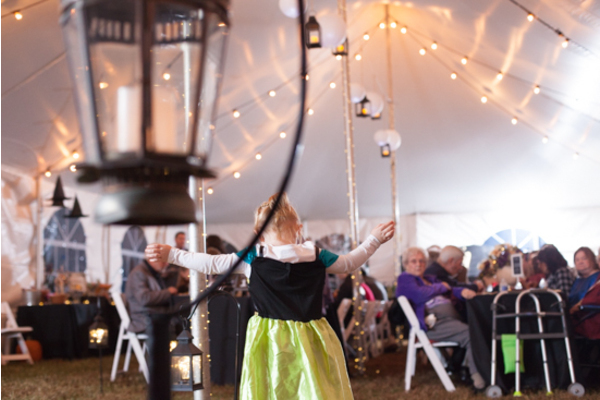 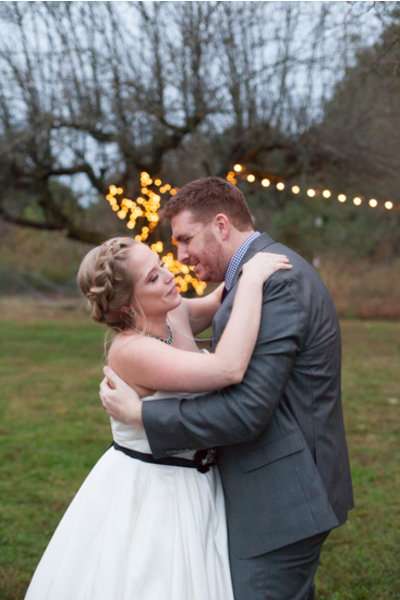 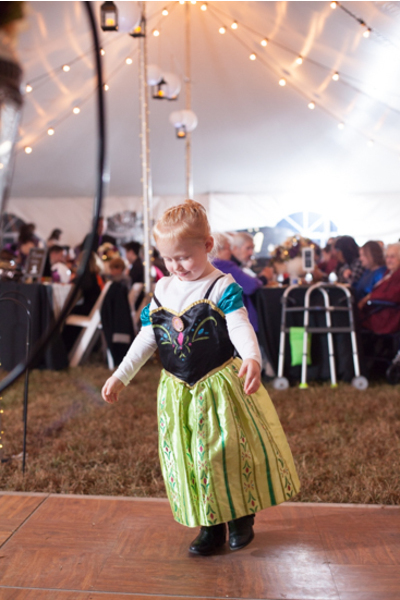 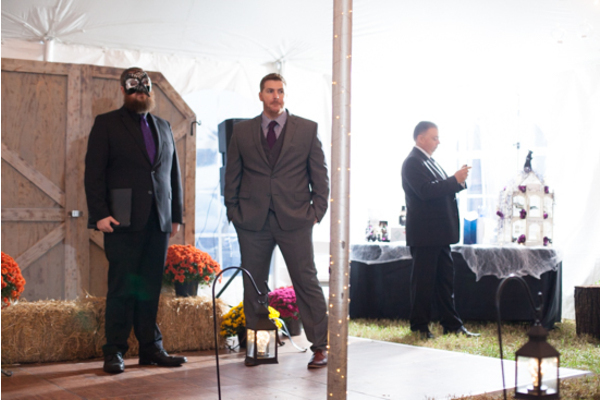 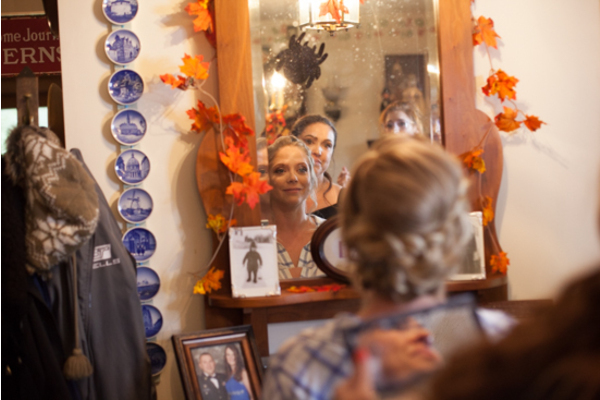 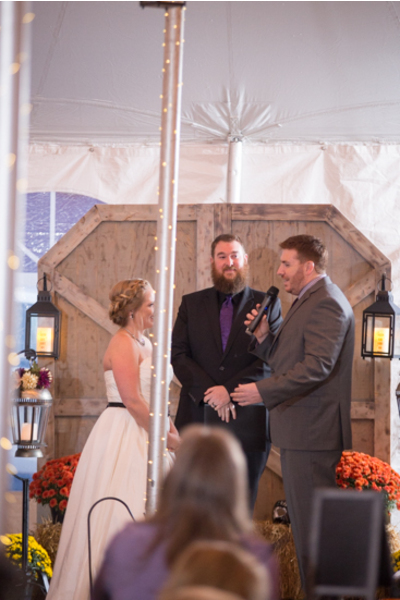 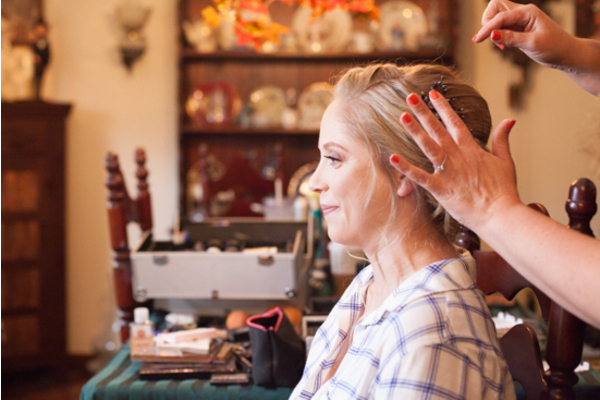 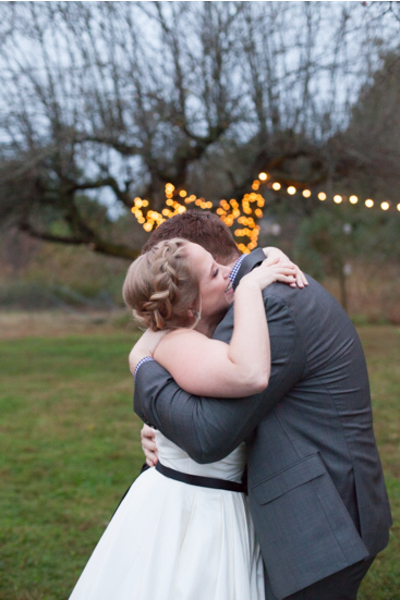 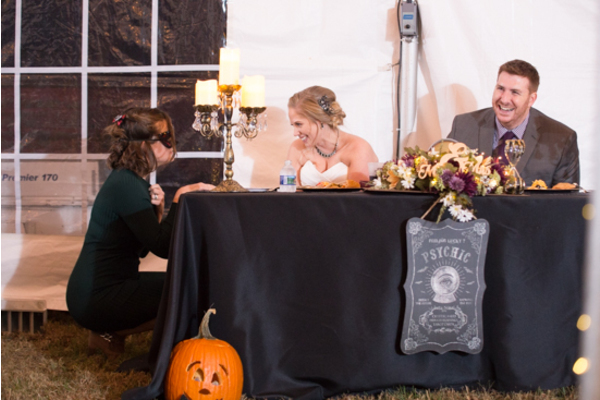 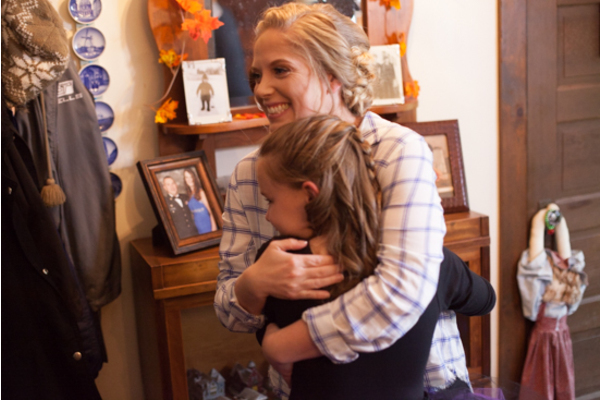 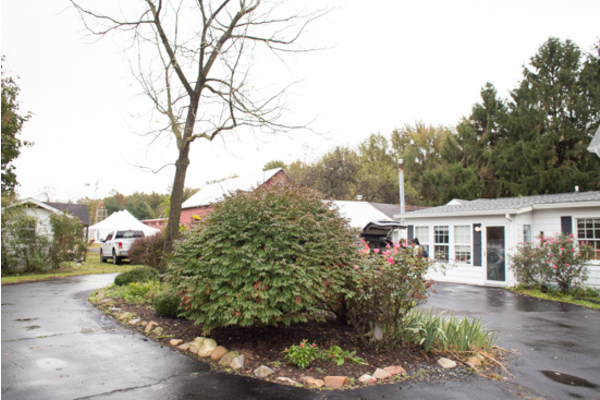 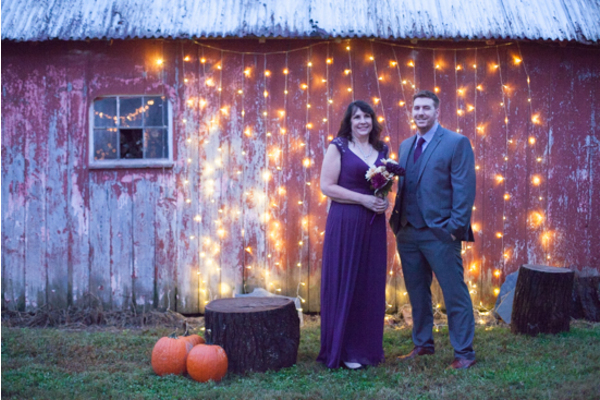 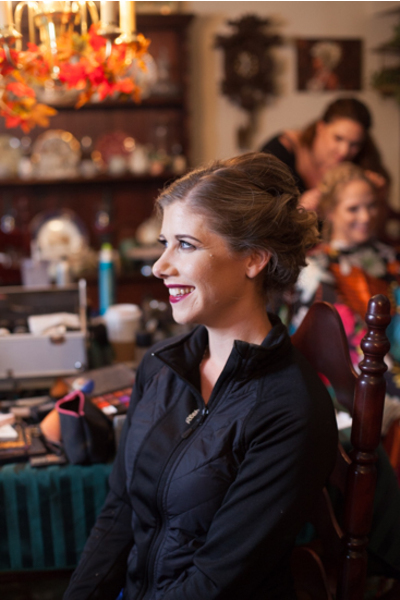 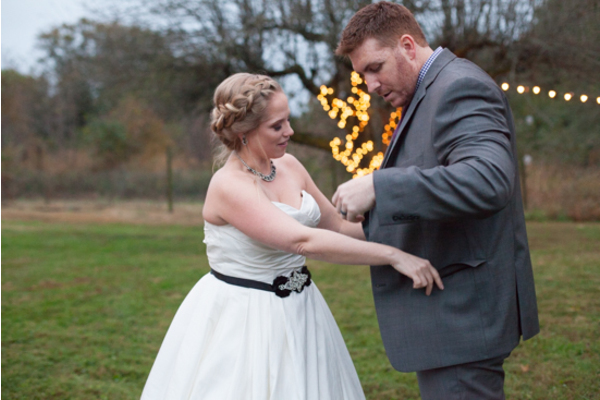 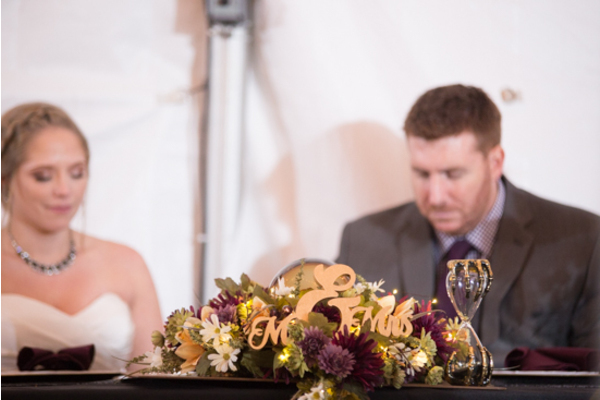 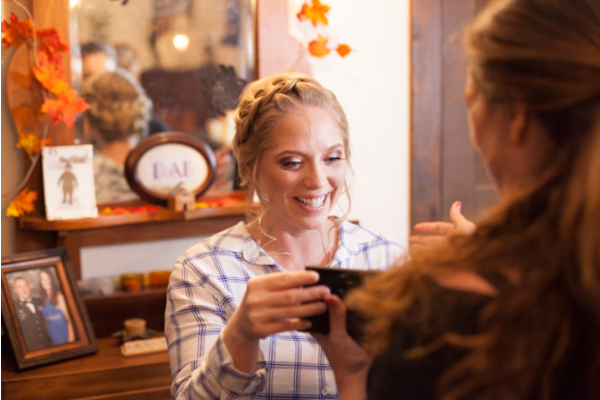 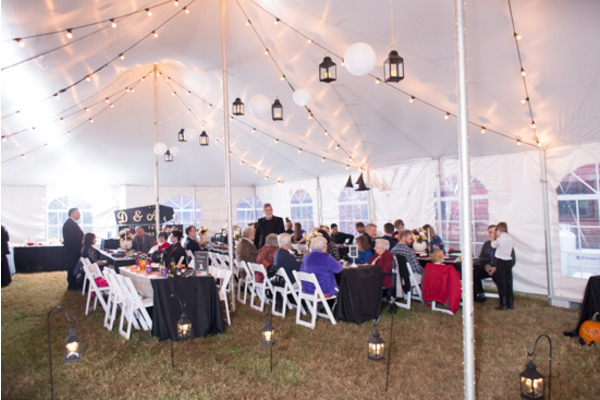 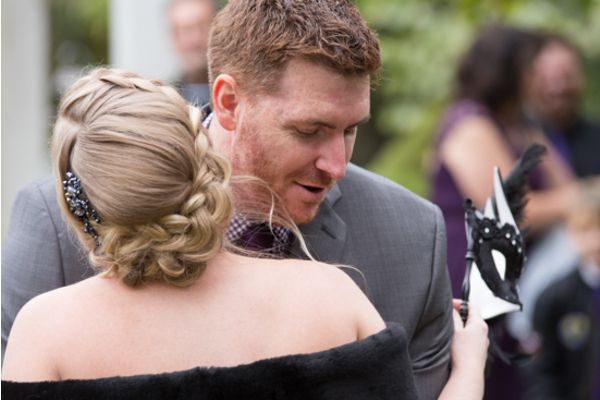 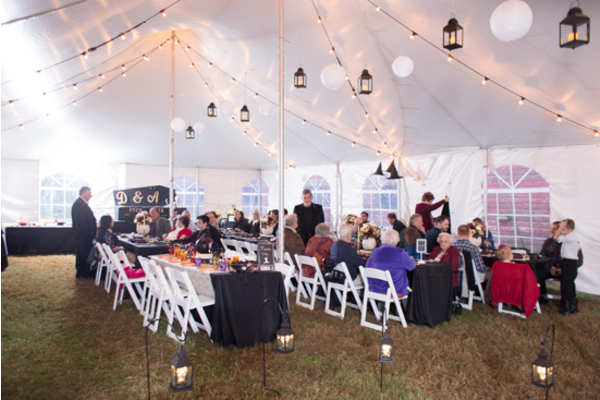 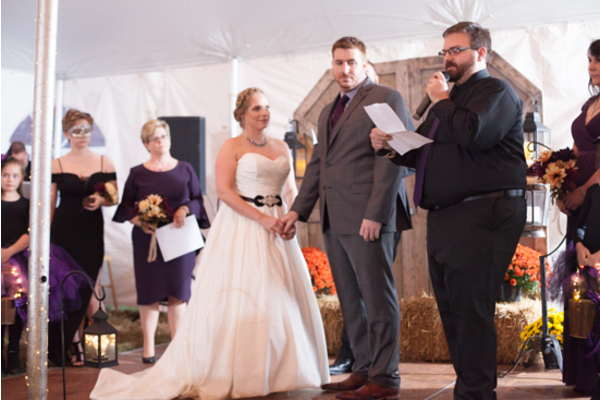 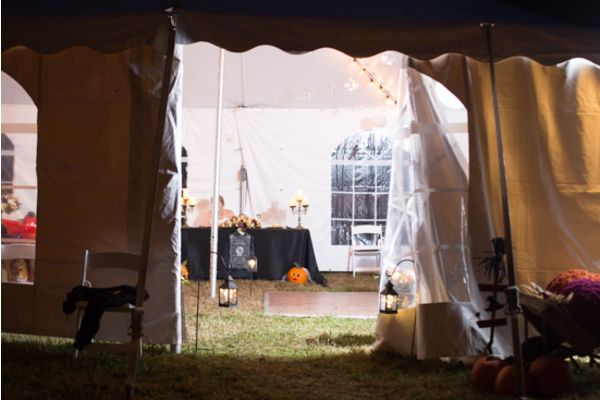 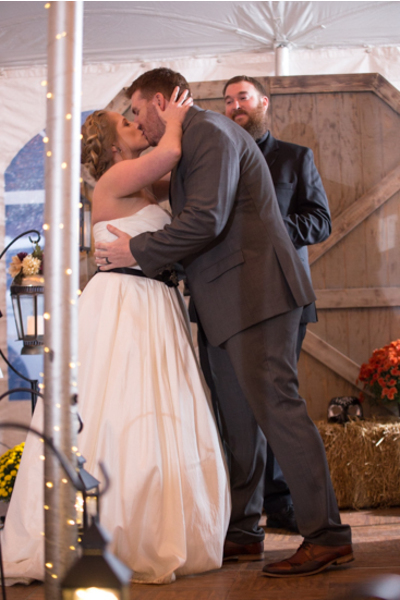 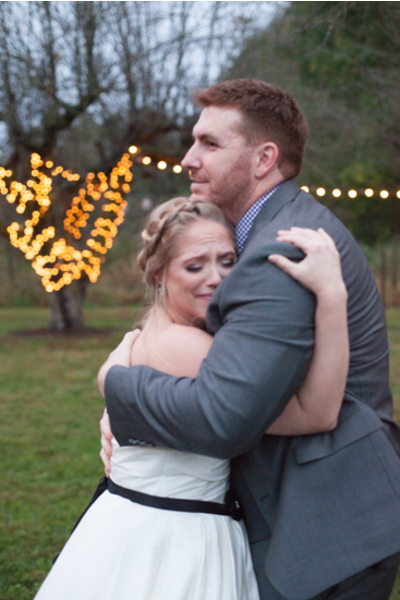 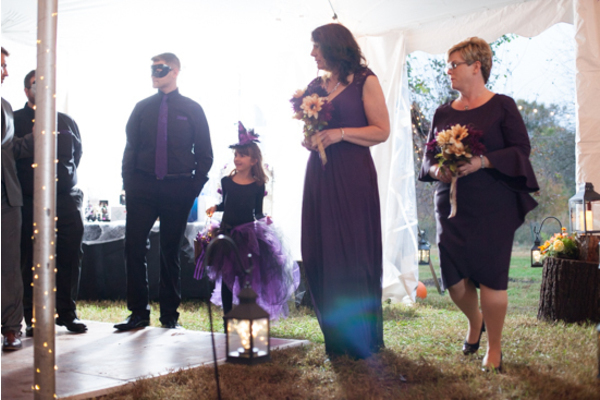 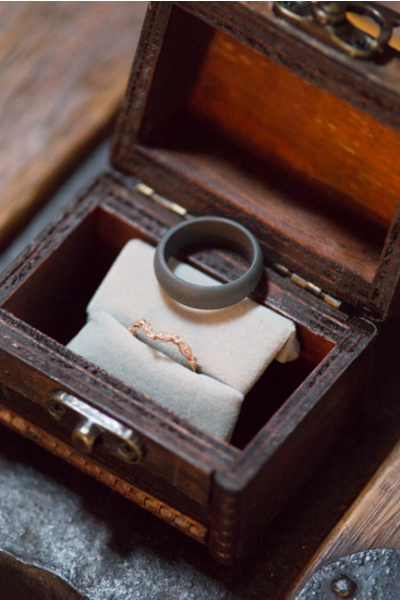 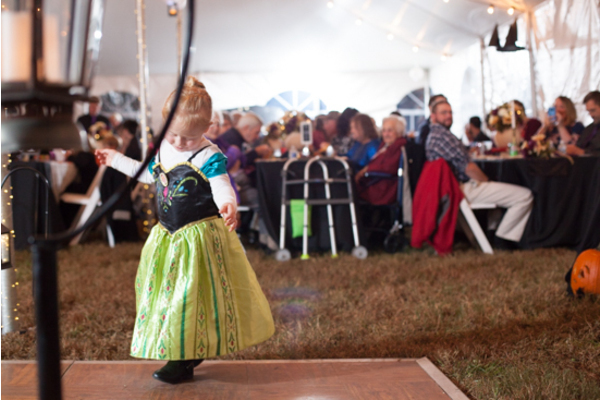 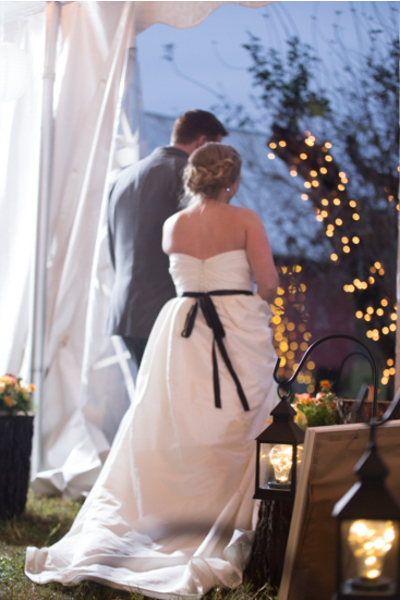 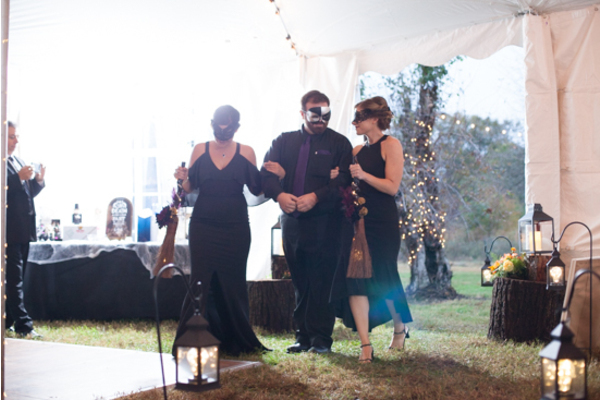 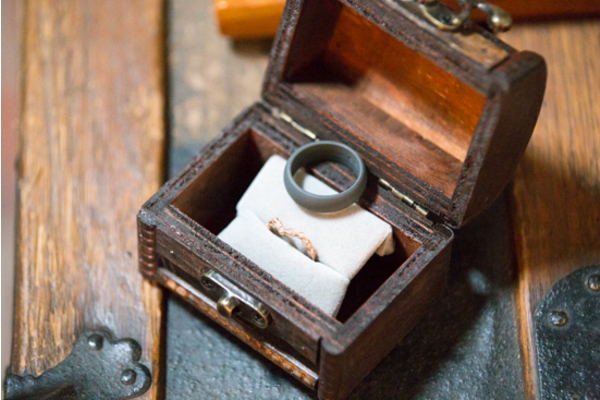 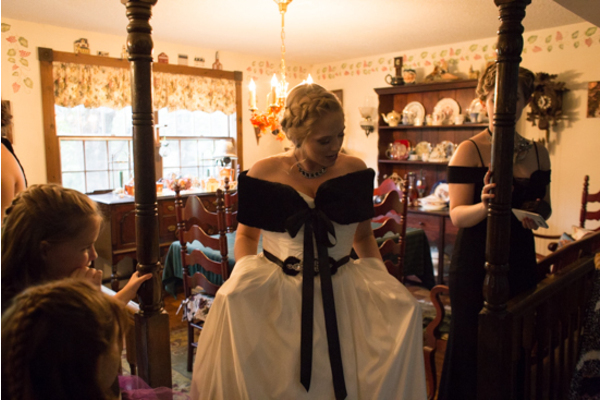 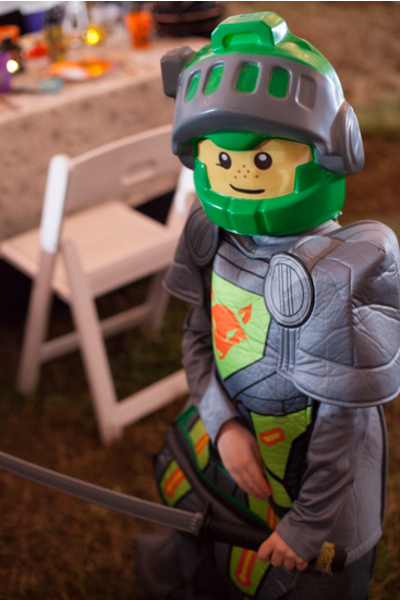 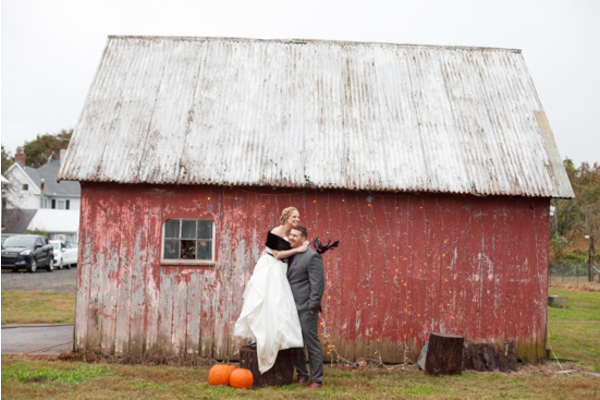 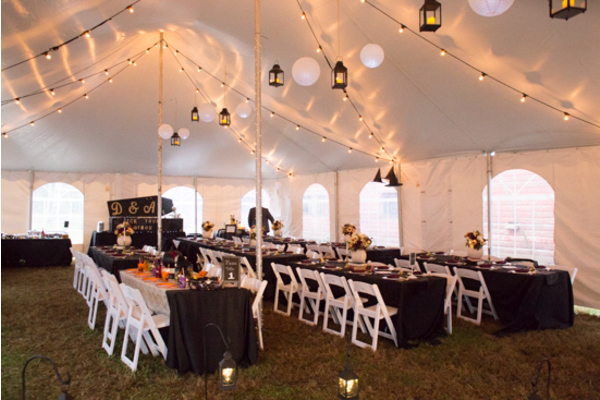 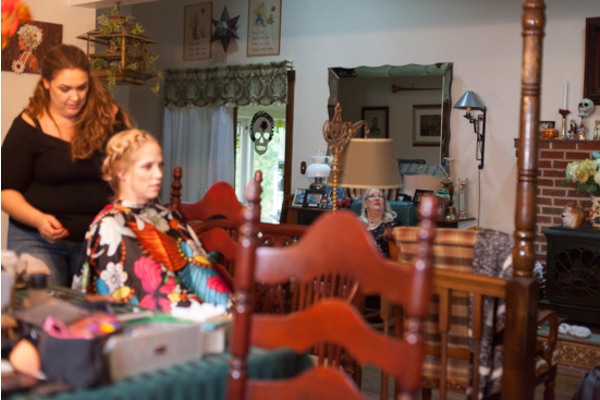 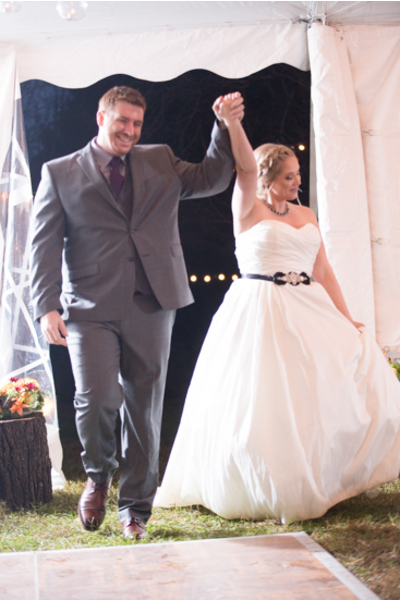 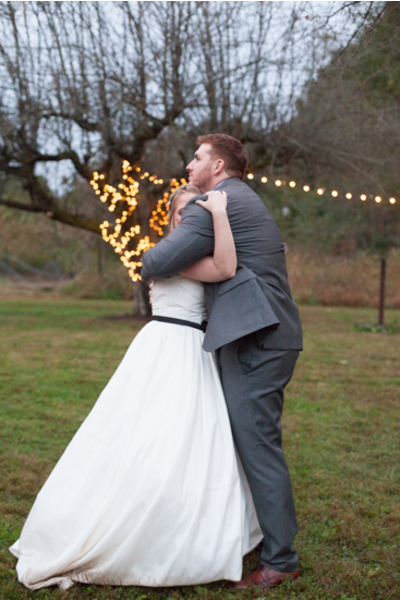 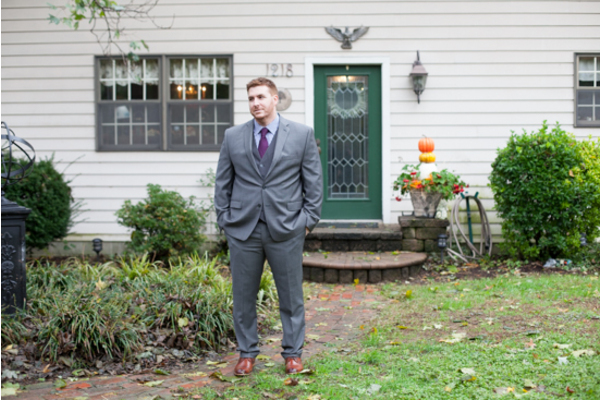 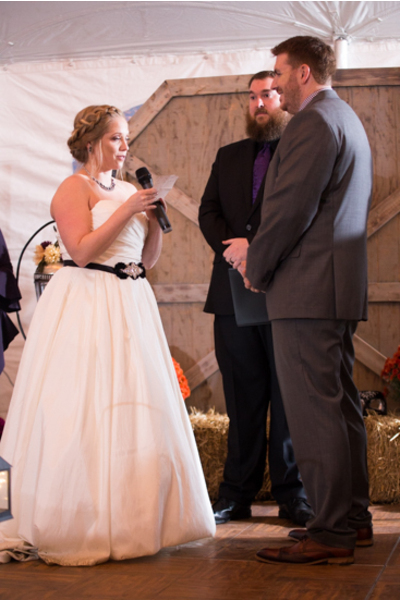 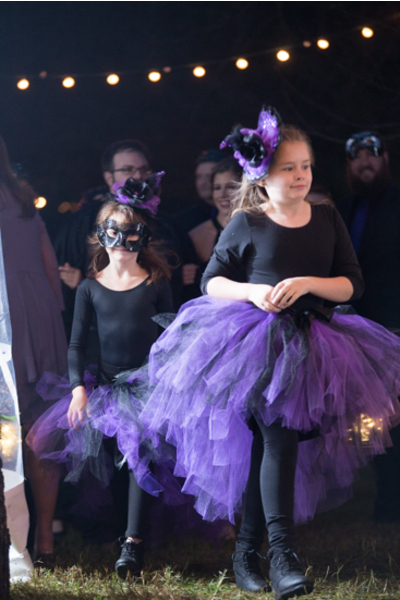 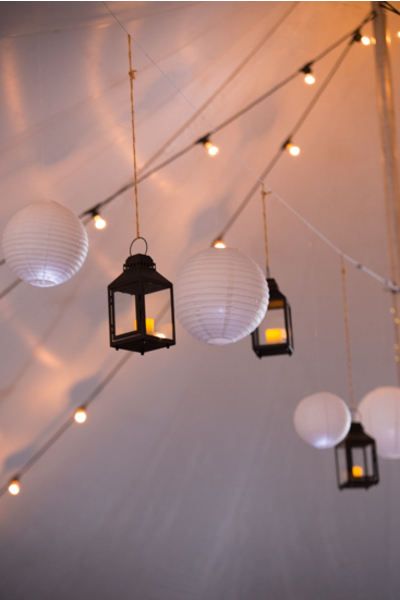 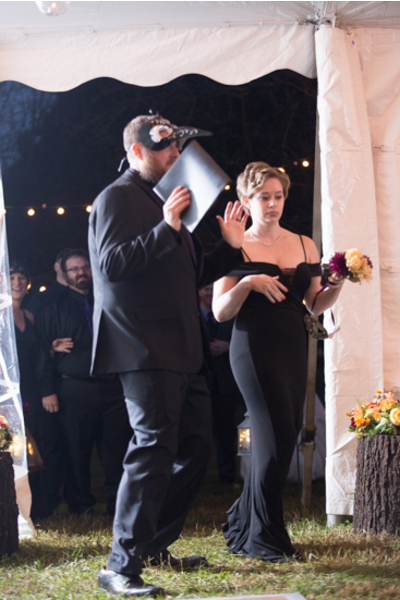 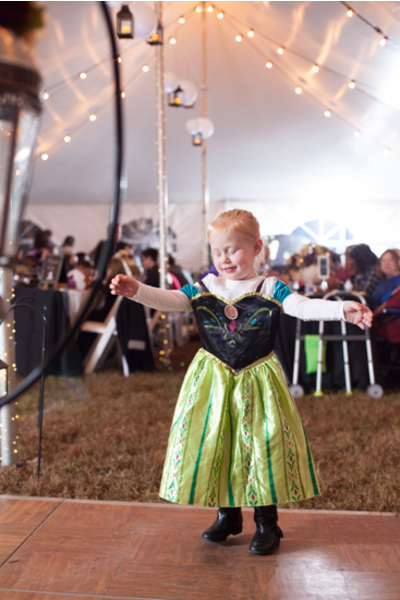 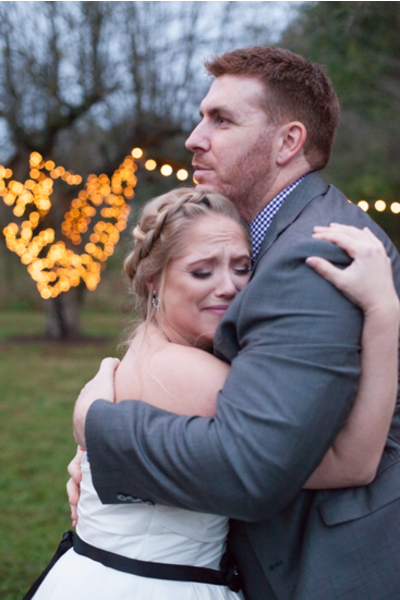 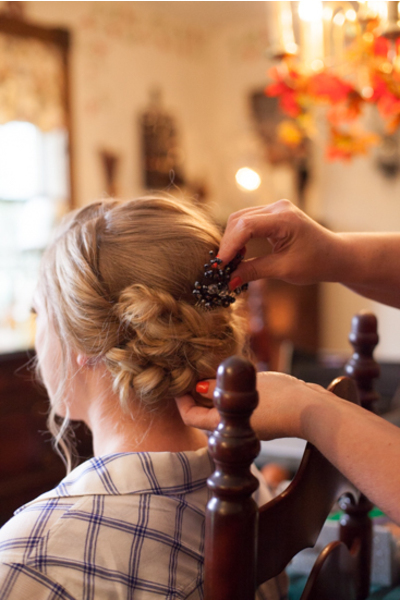 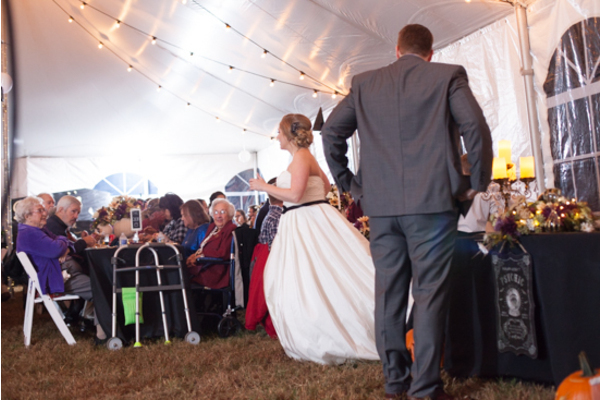 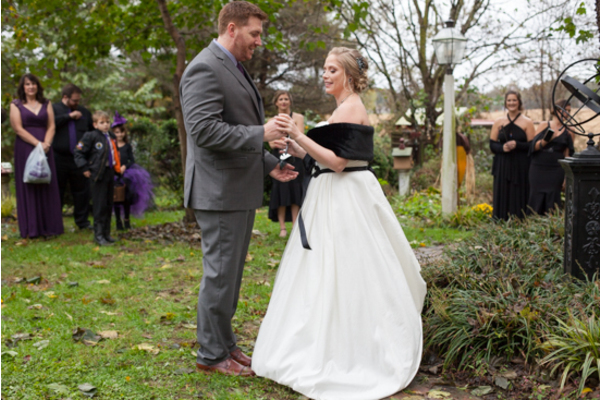 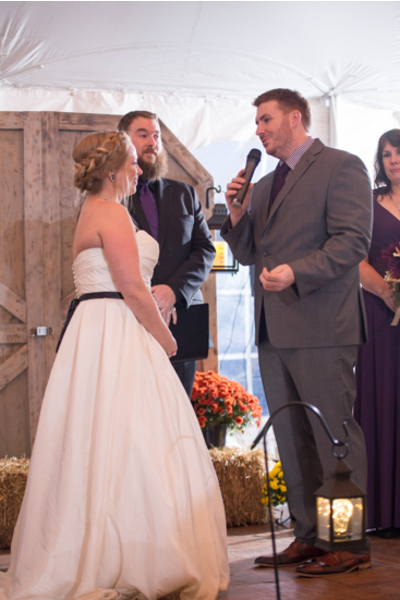 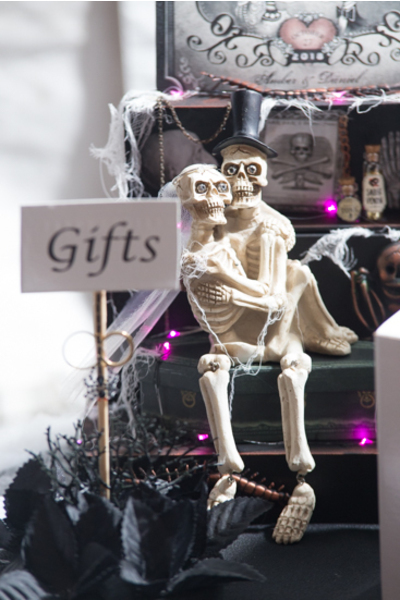 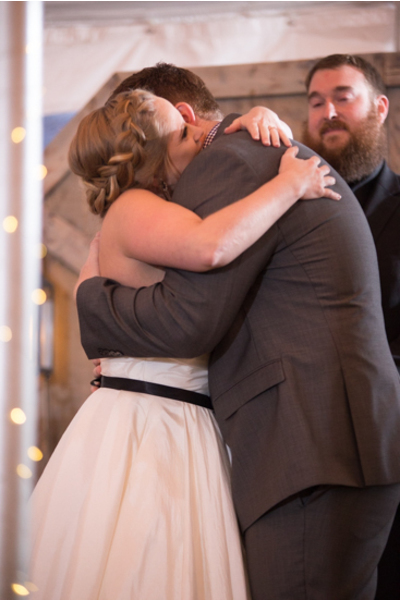 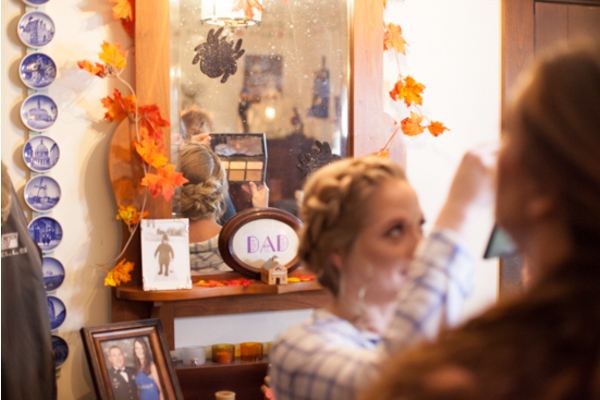 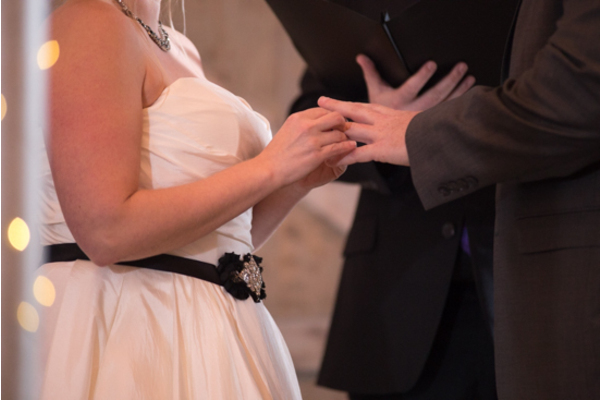 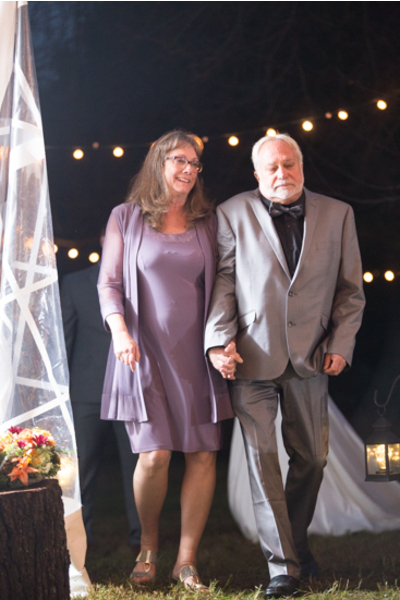 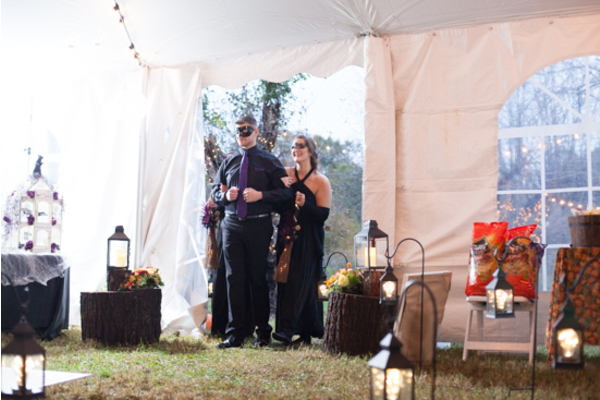 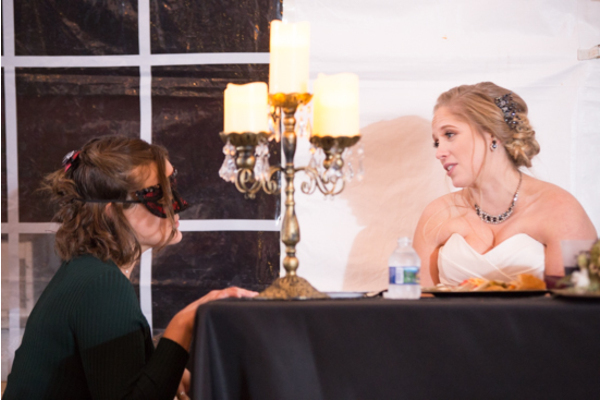 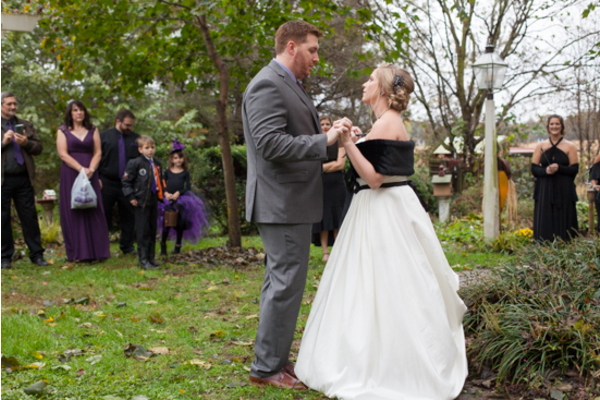 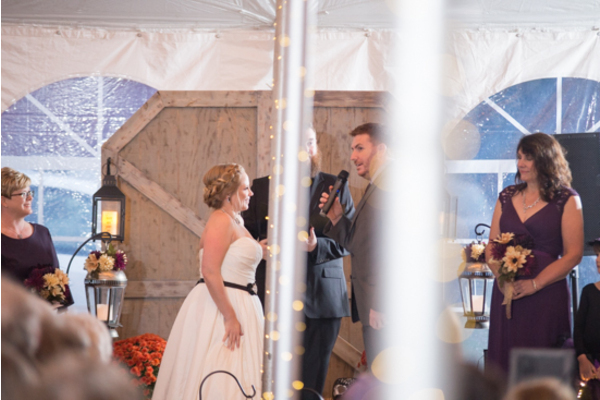 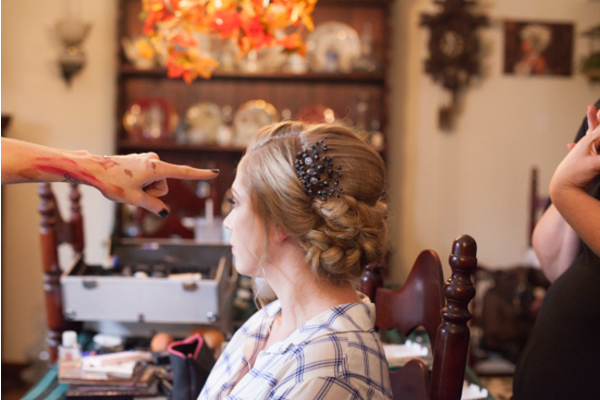 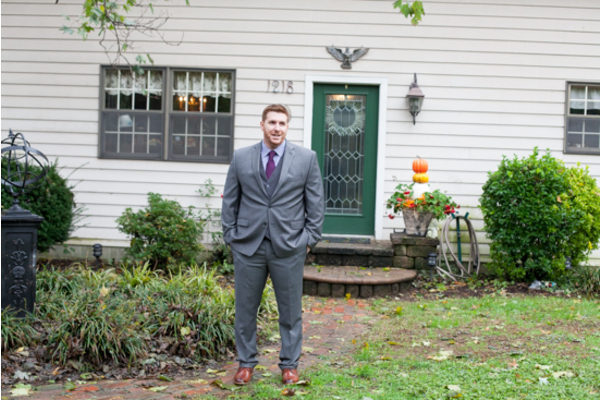 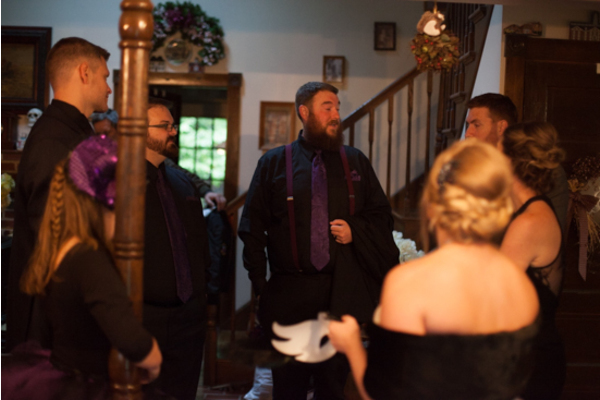 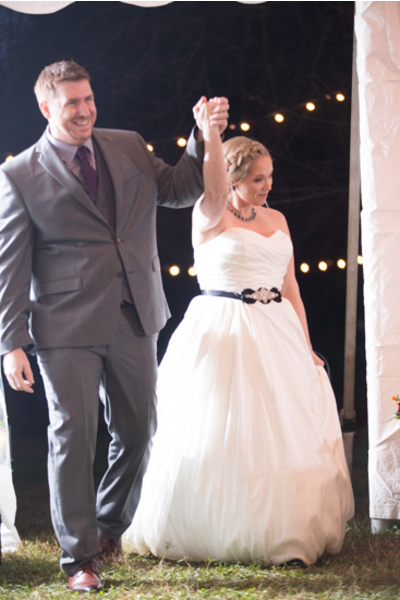 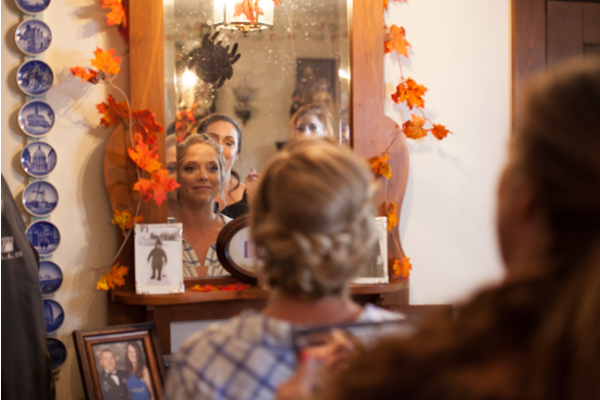 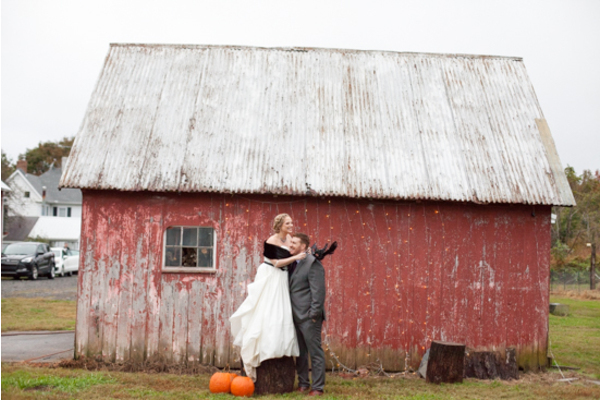 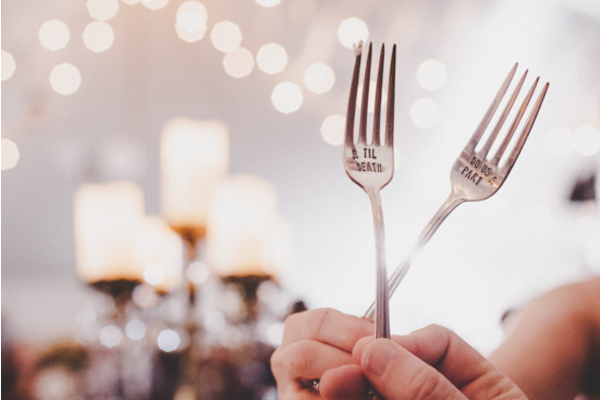 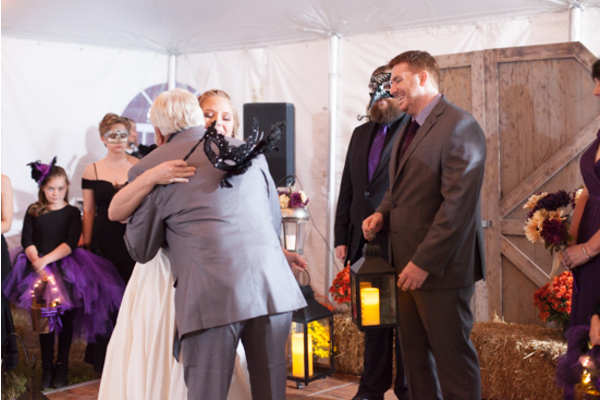 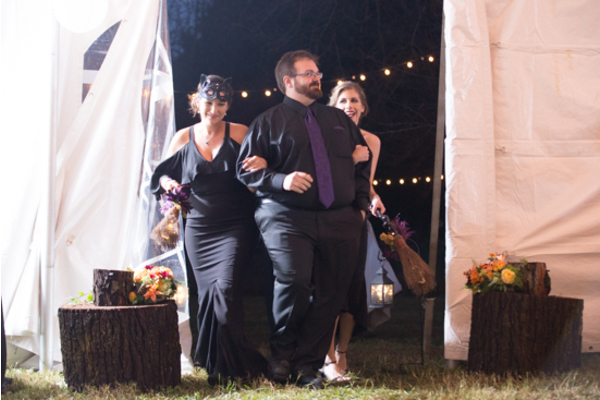 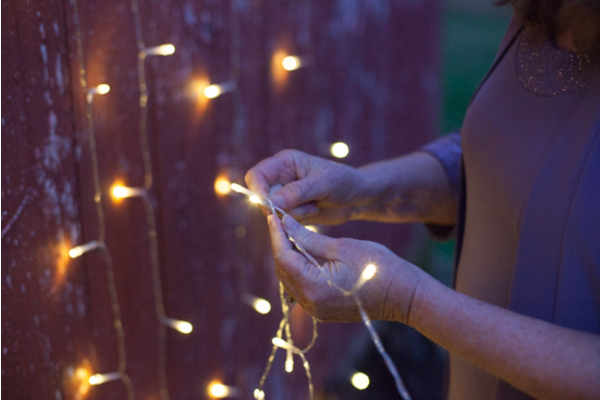 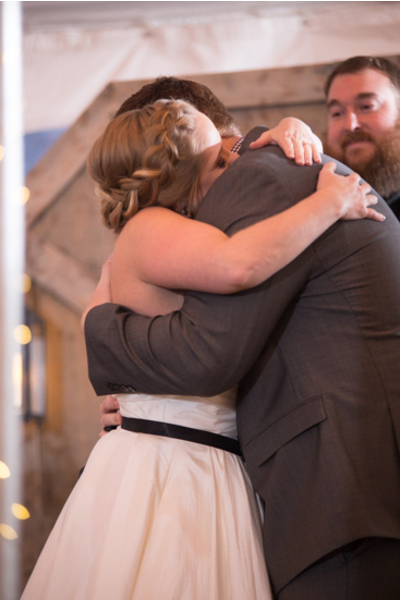 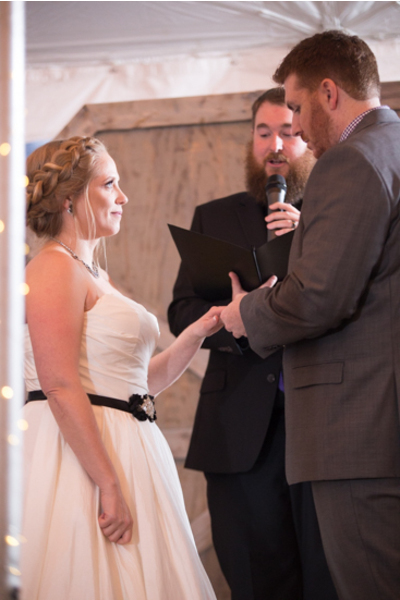 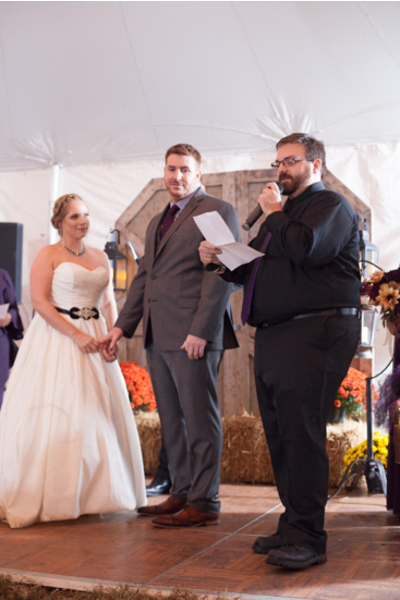 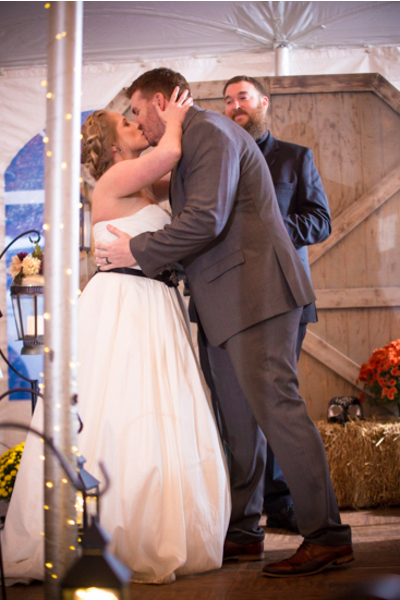 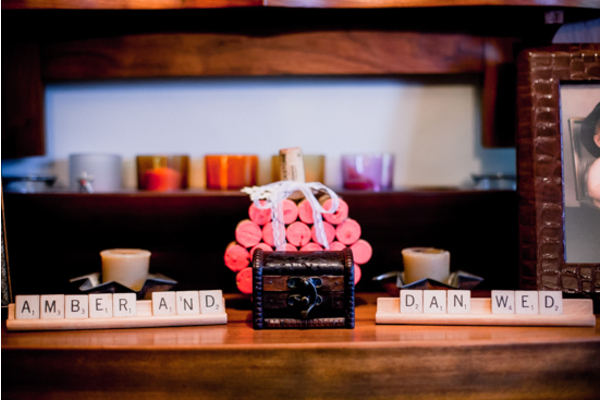 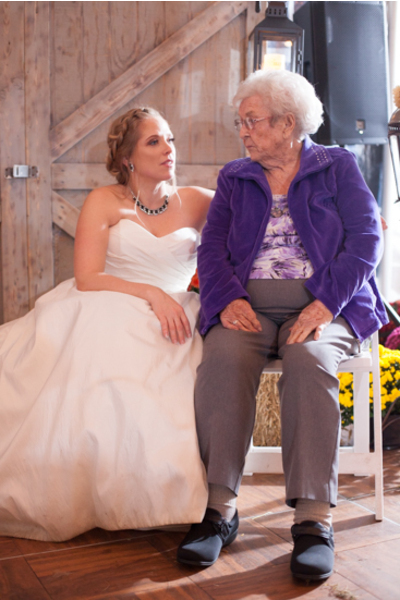 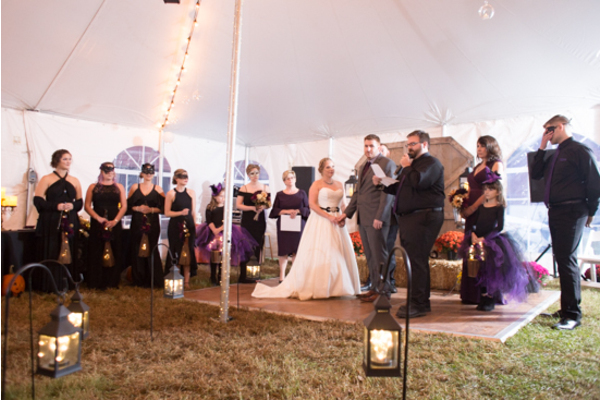 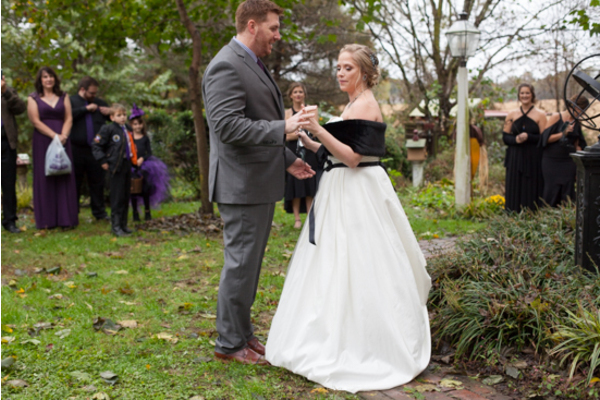 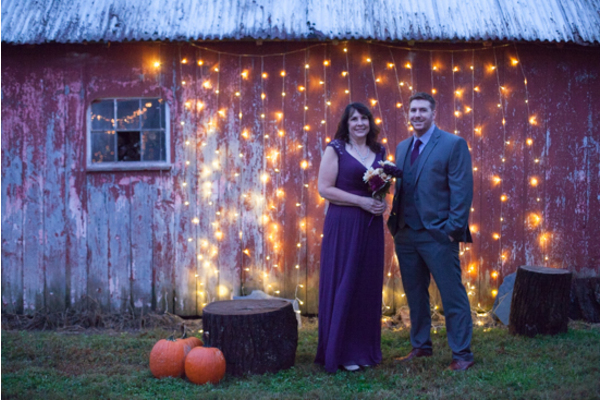 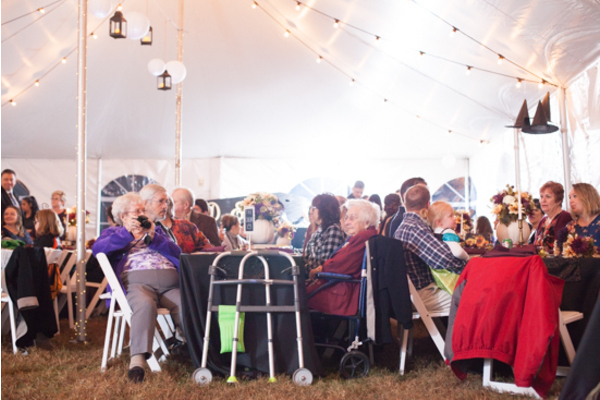 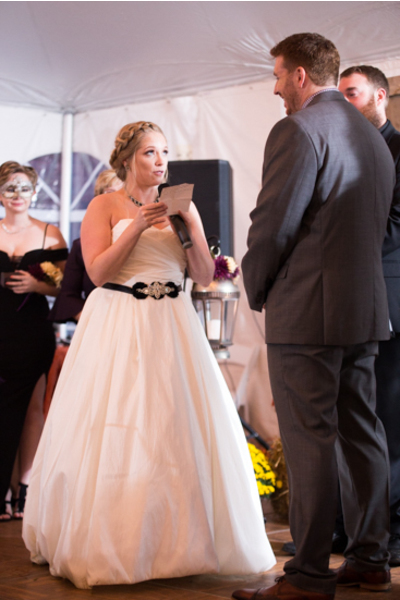 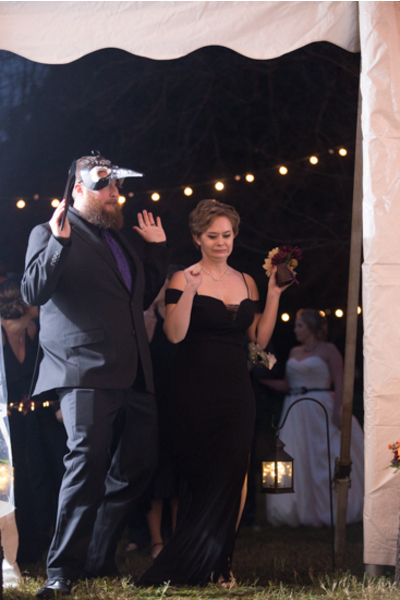 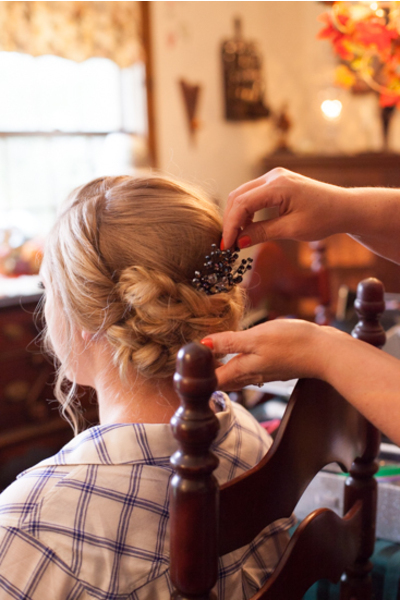 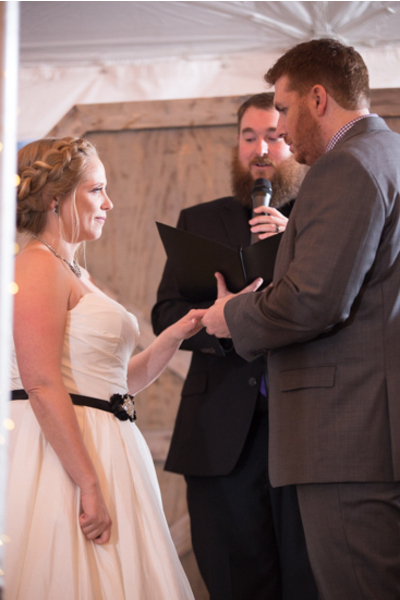 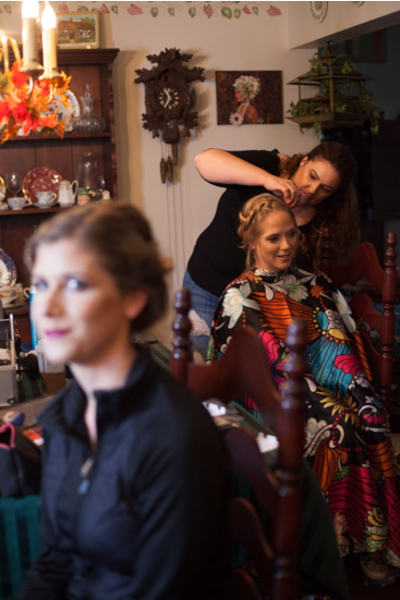 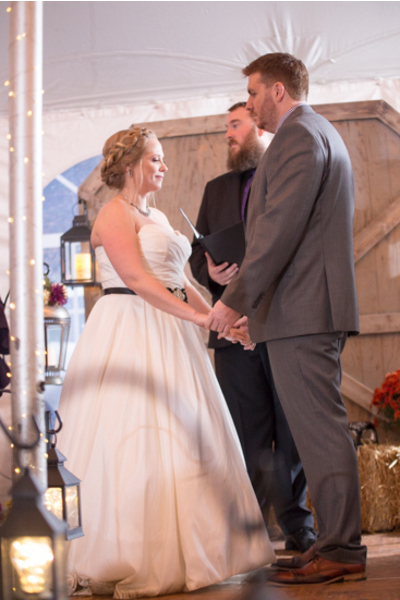 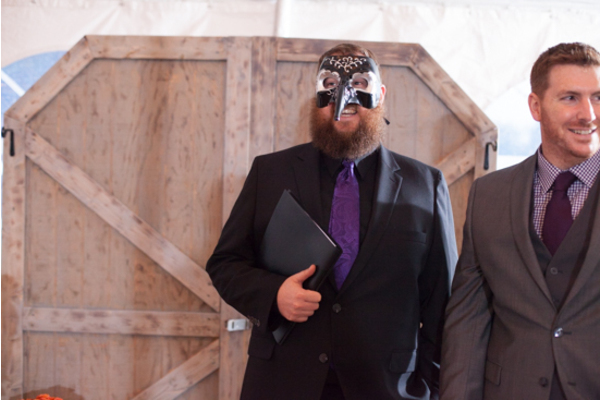 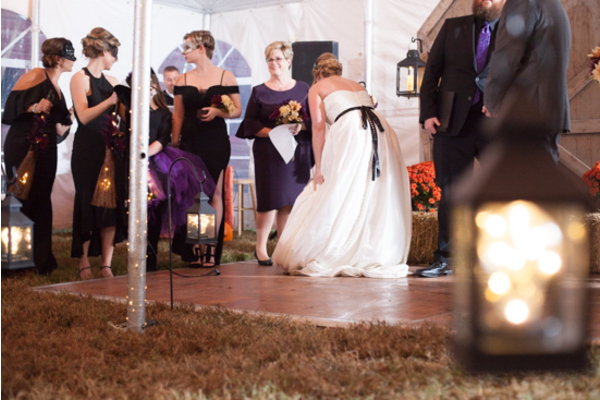 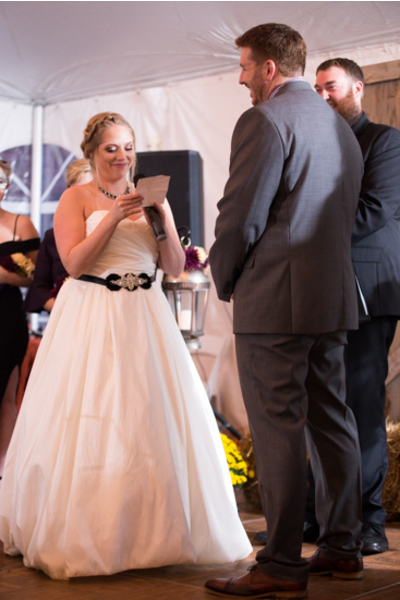 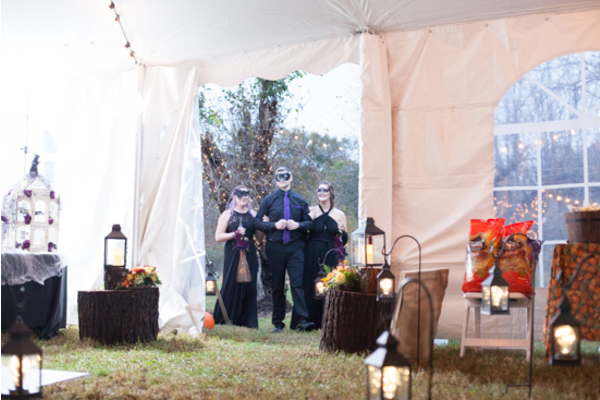 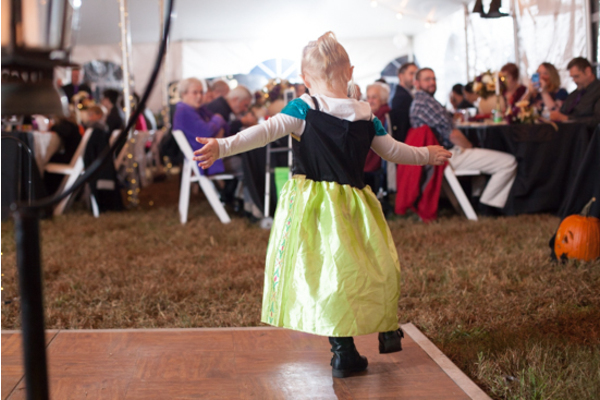 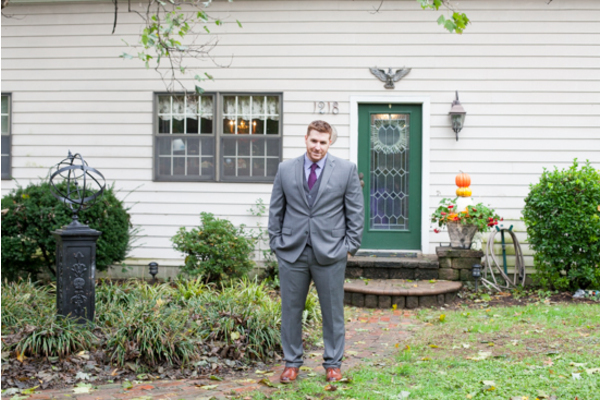 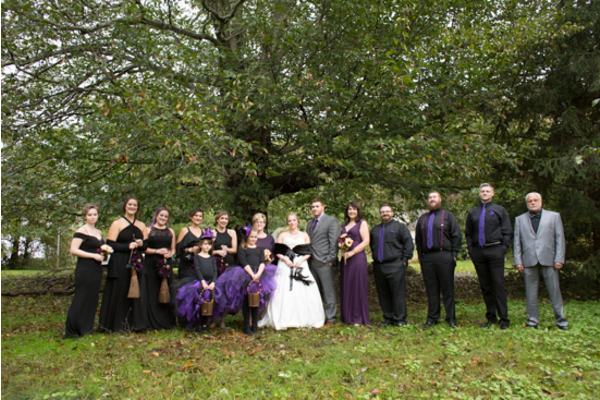 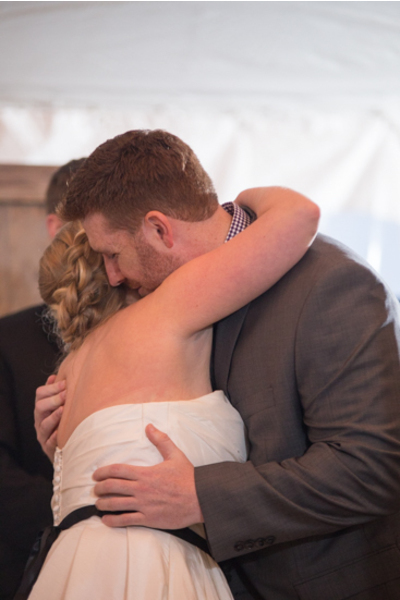 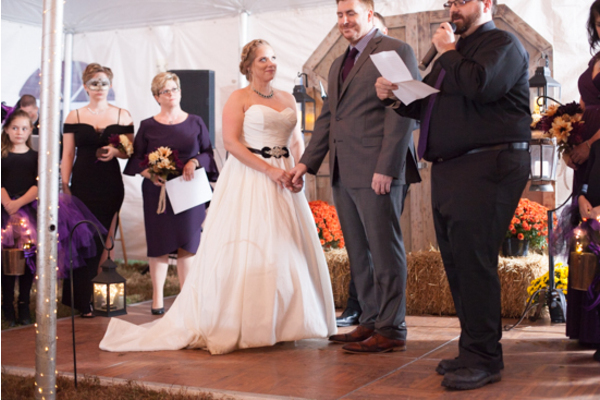 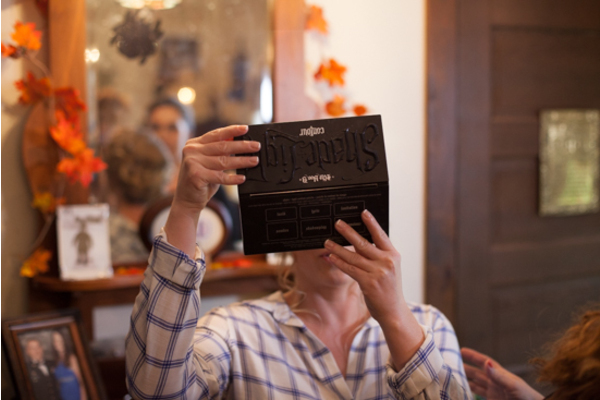 We hope your Halloween wedding was everything you dreamed of and more!